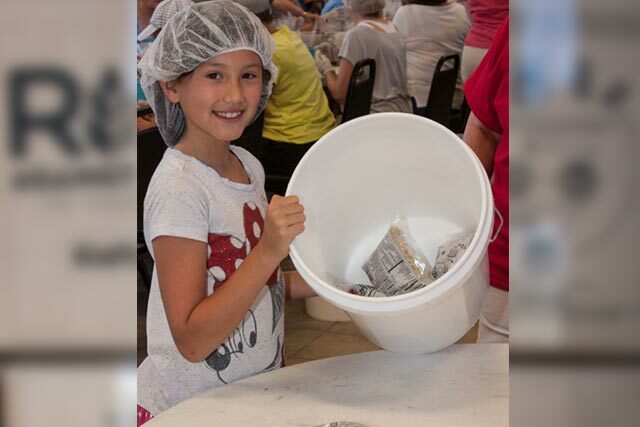 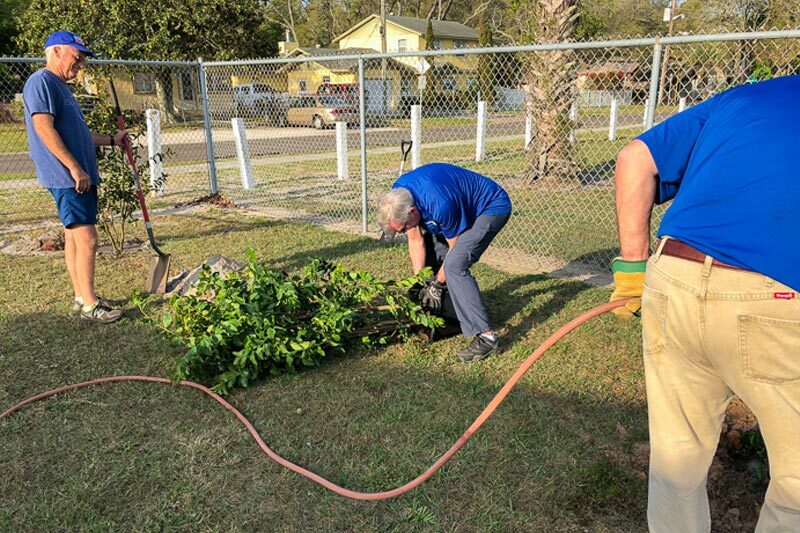 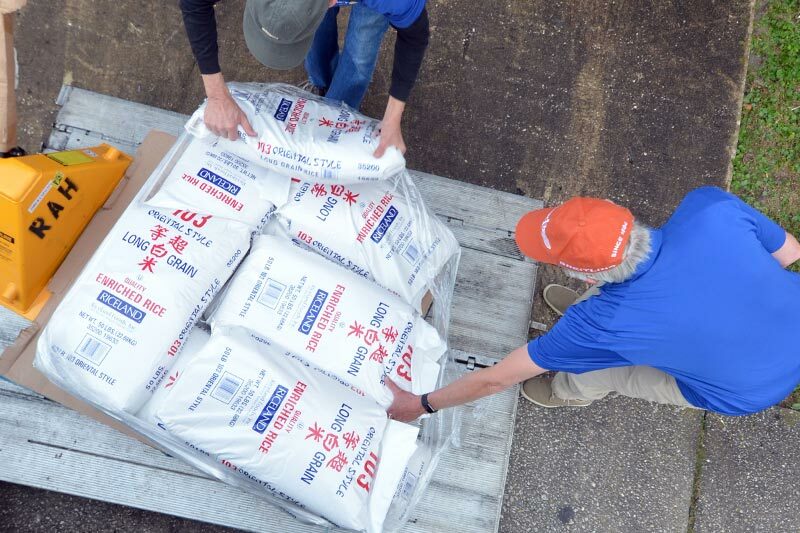 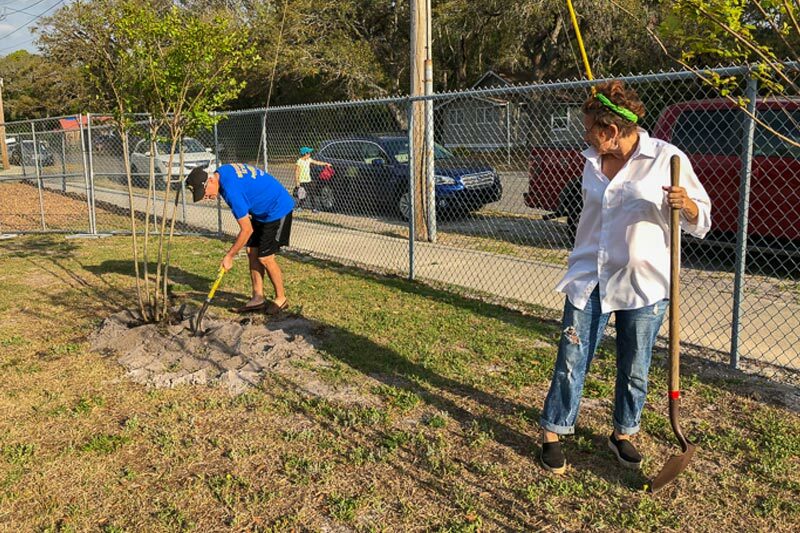 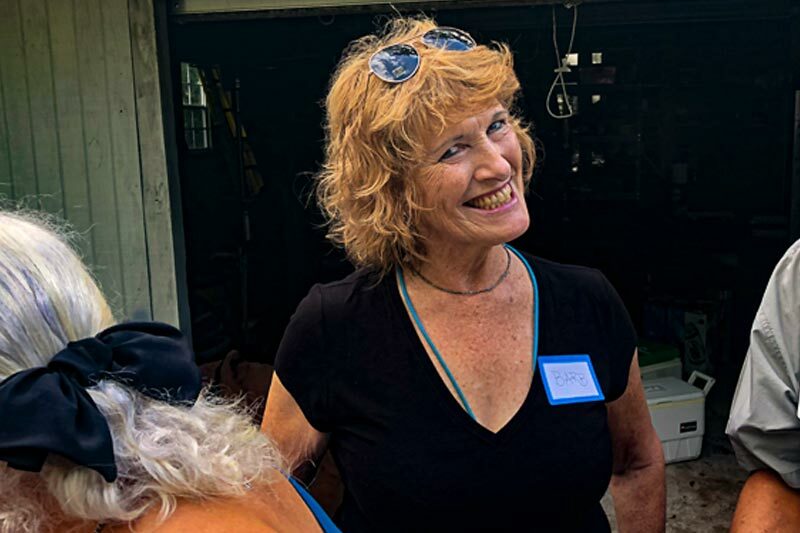 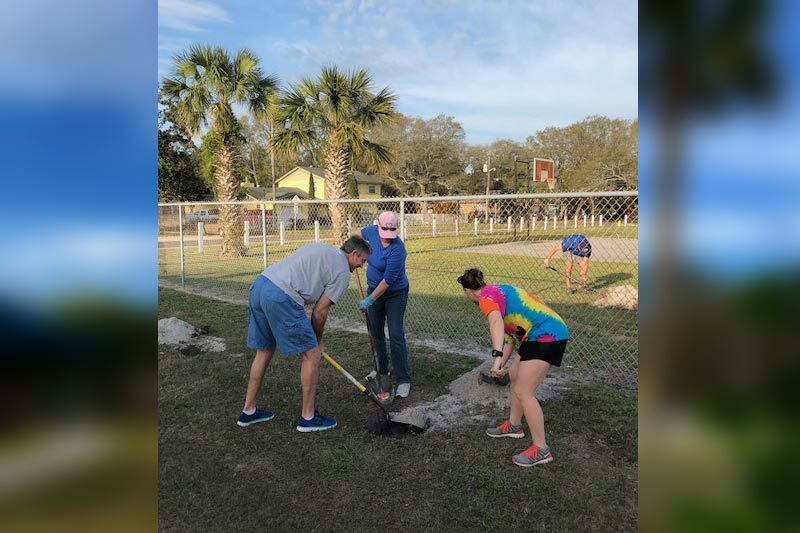 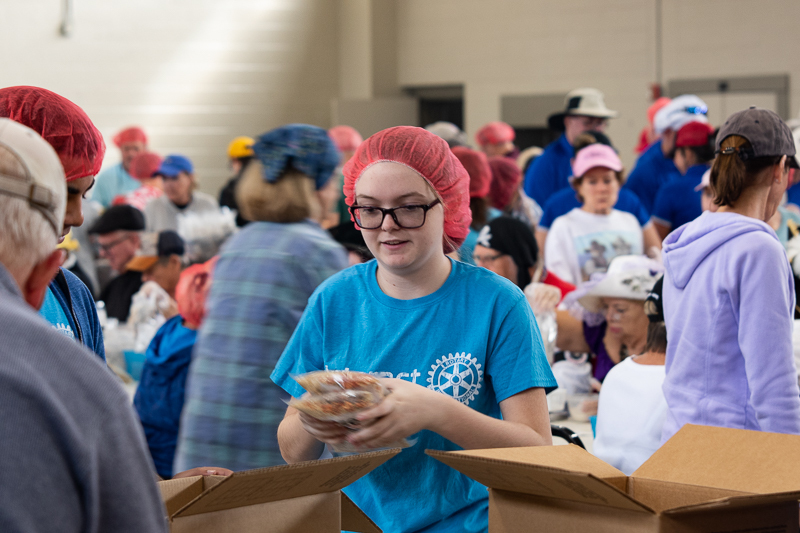 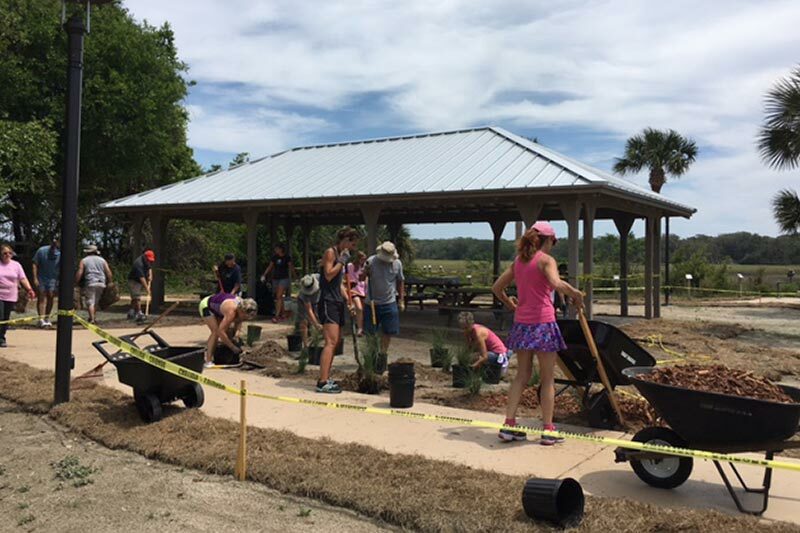 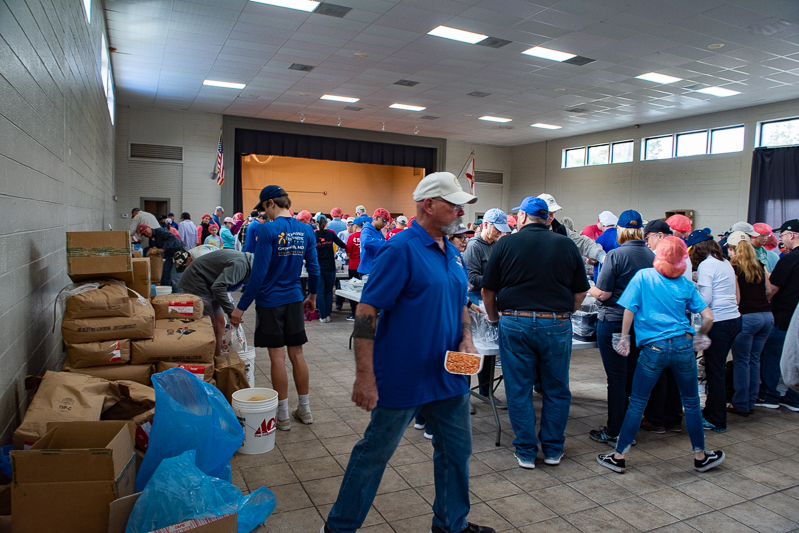 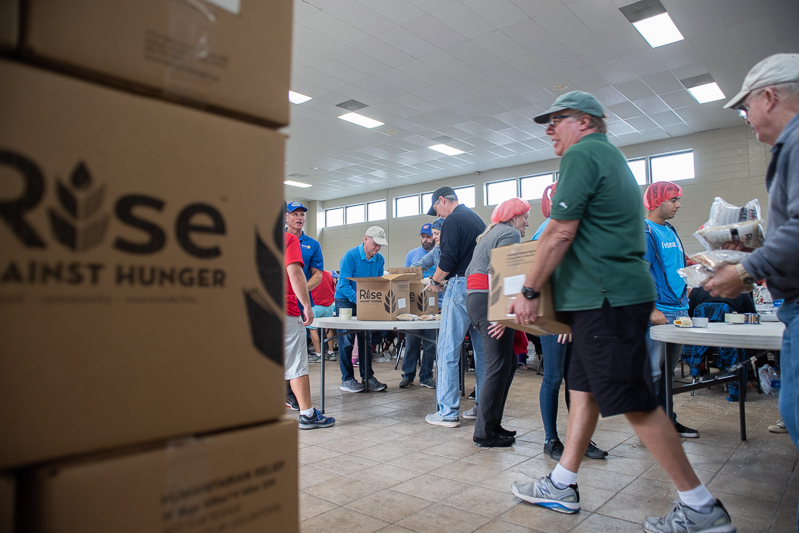 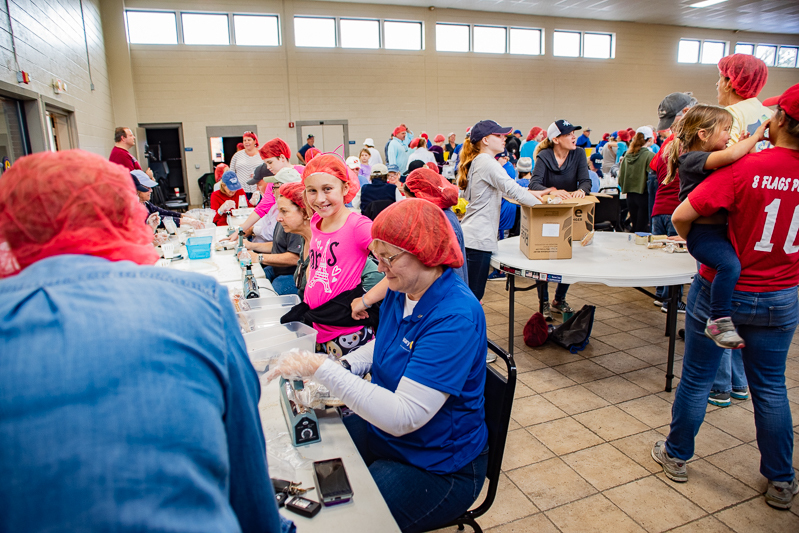 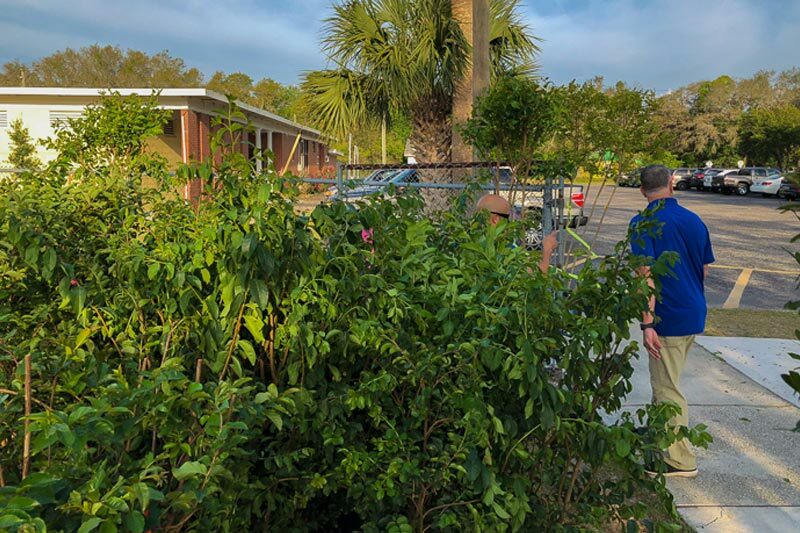 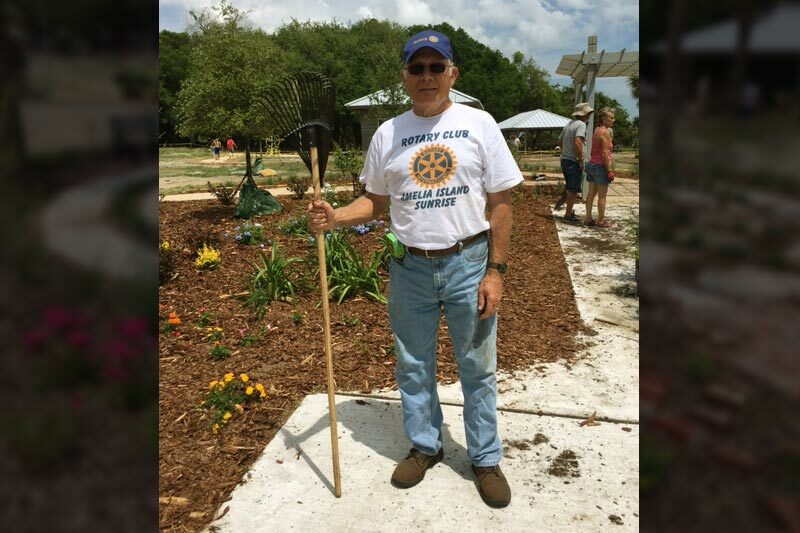 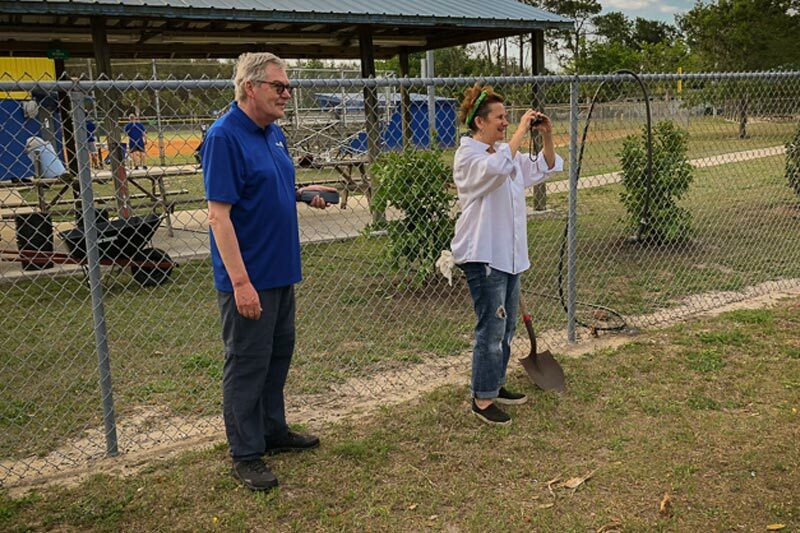 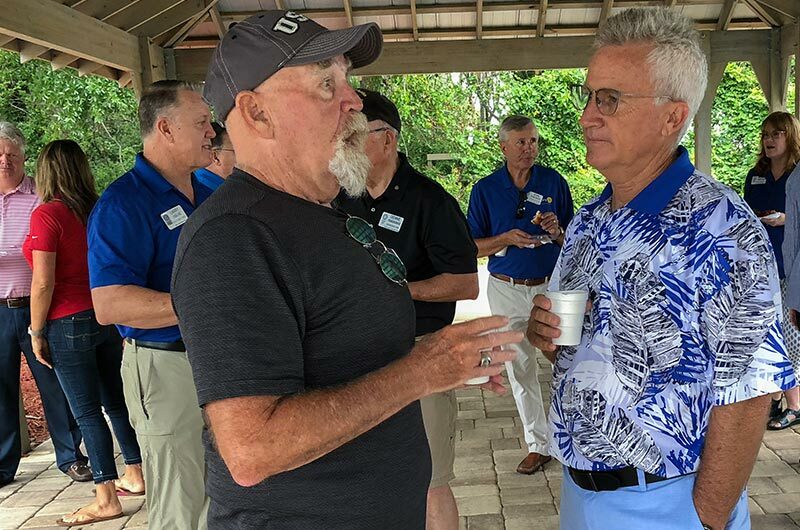 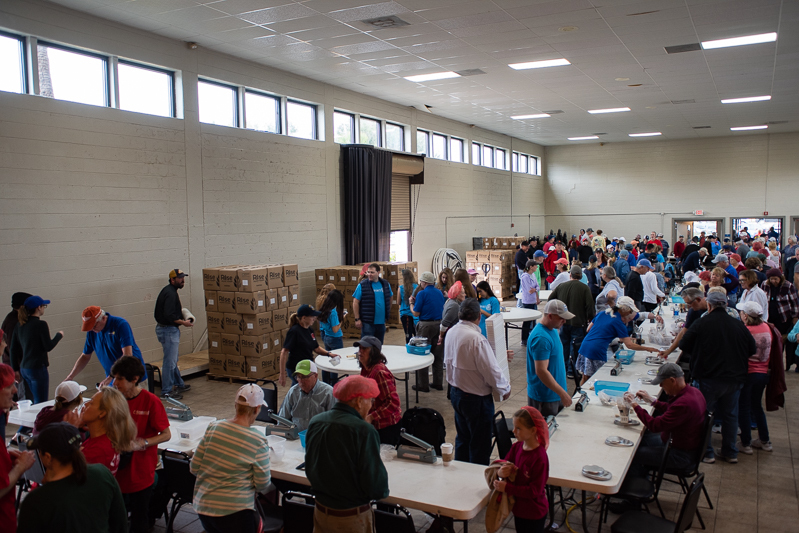 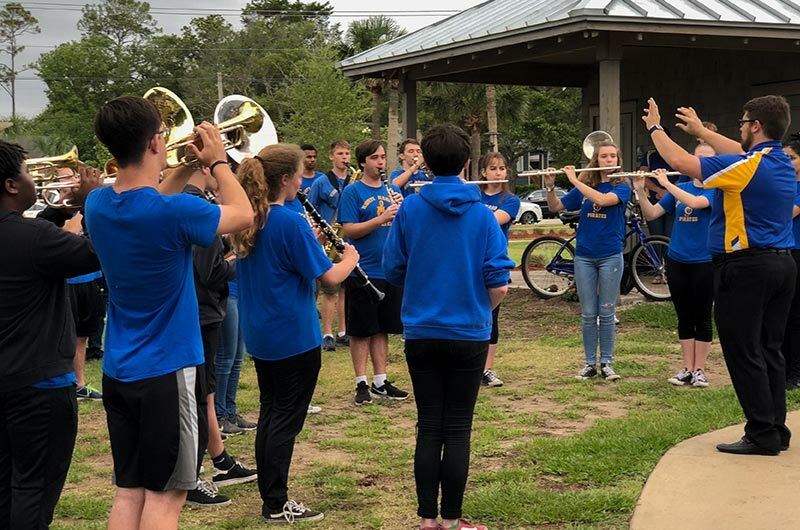 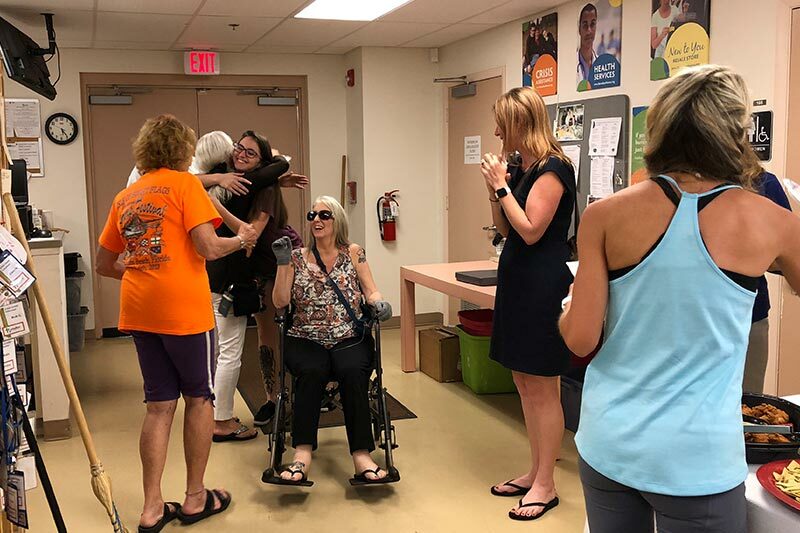 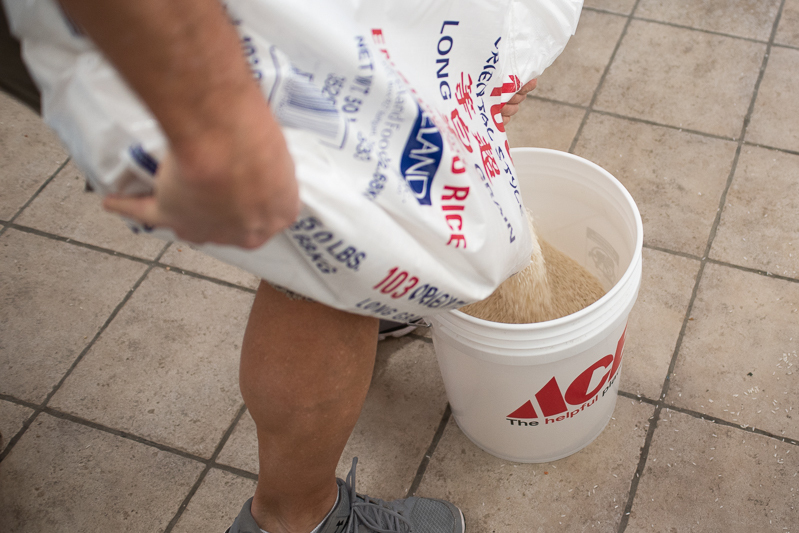 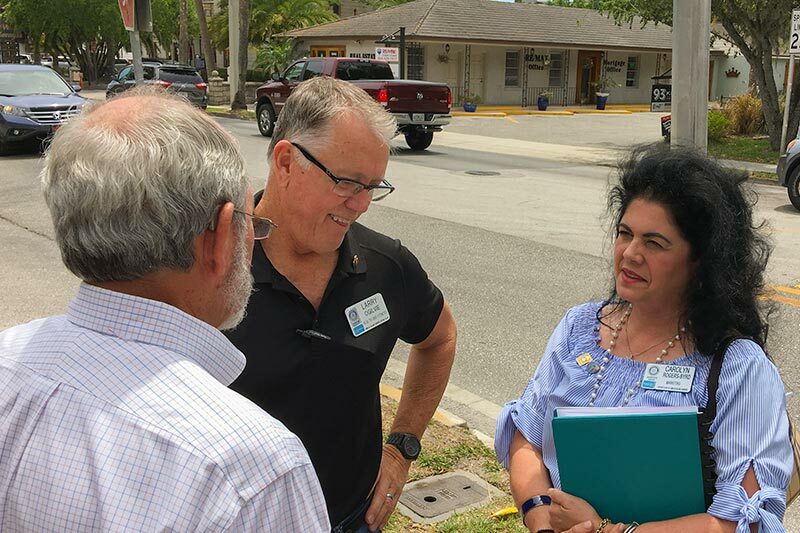 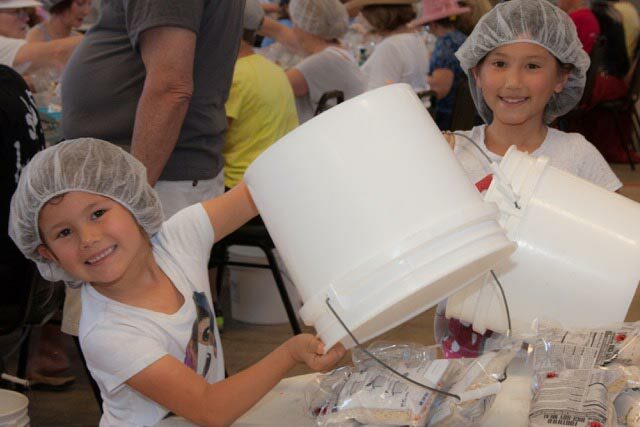 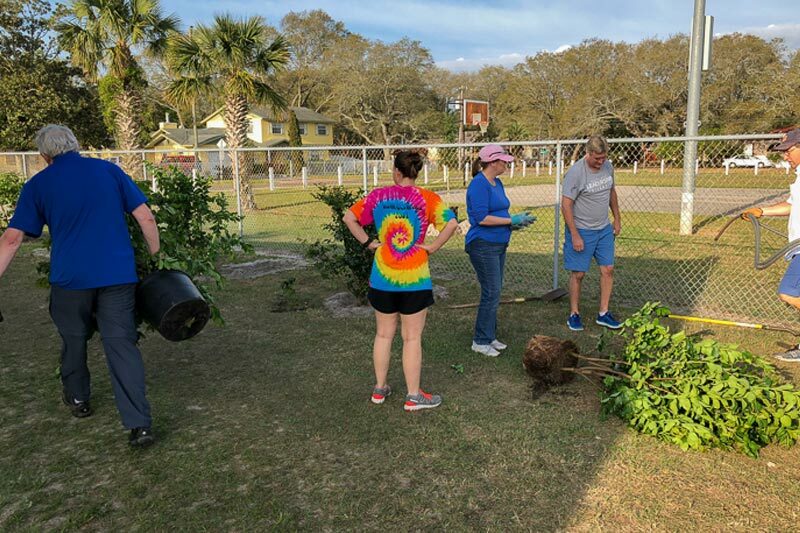 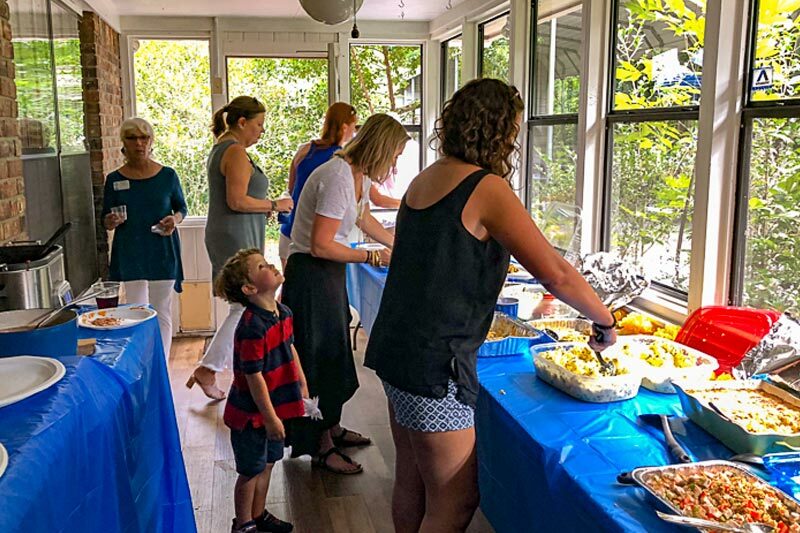 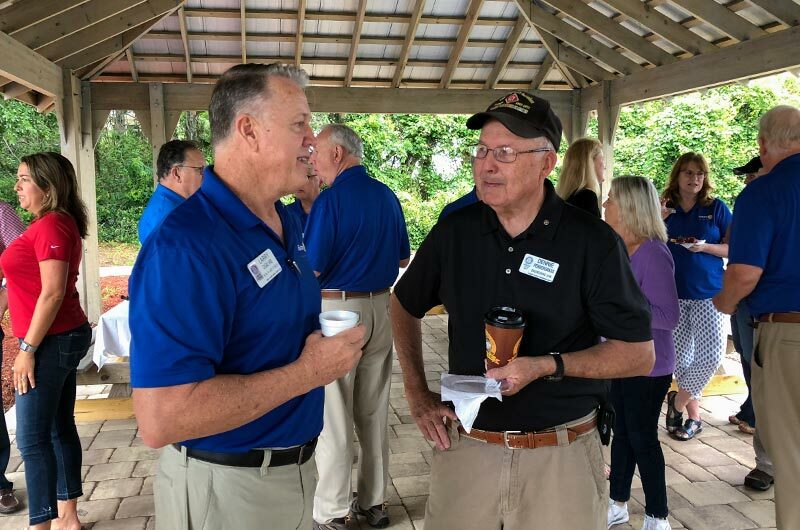 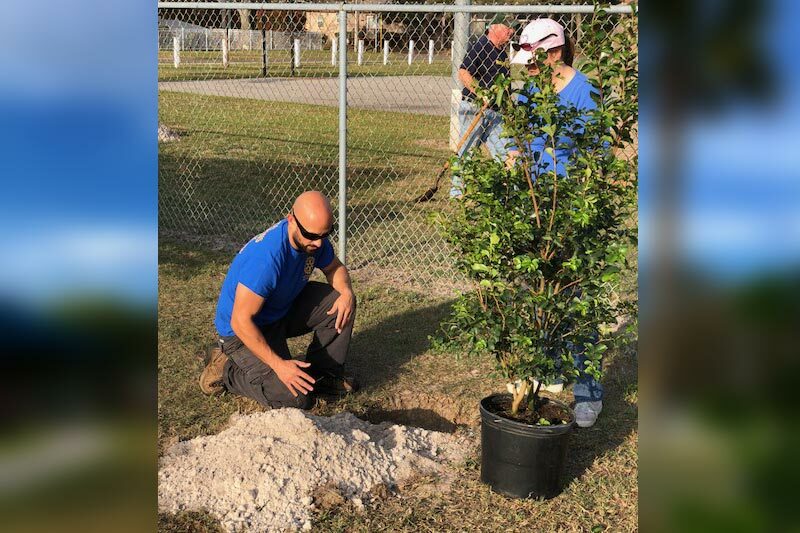 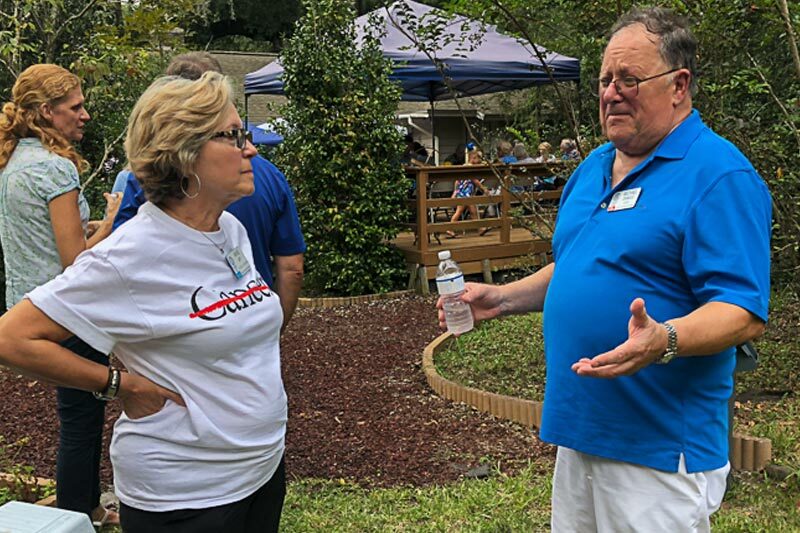 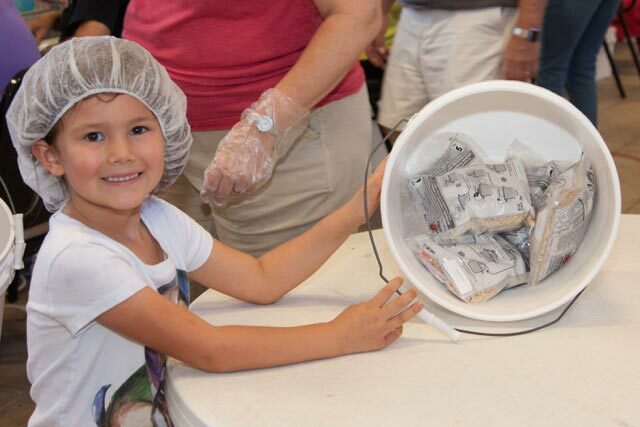 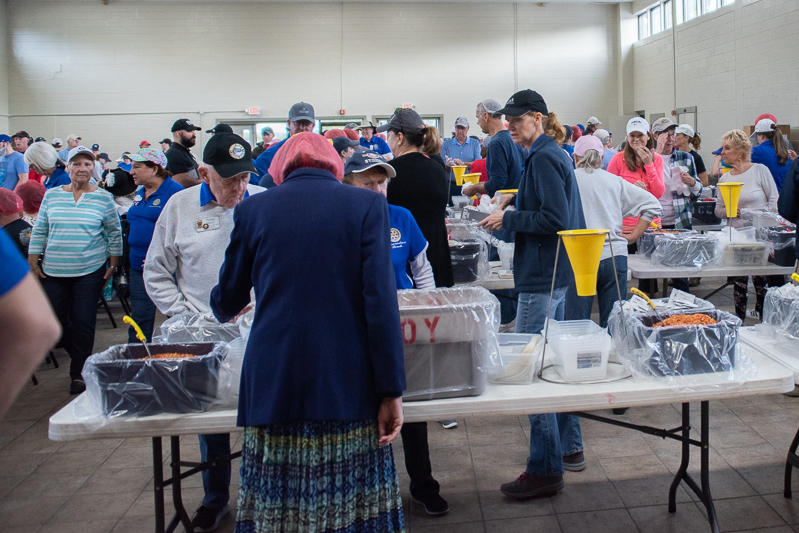 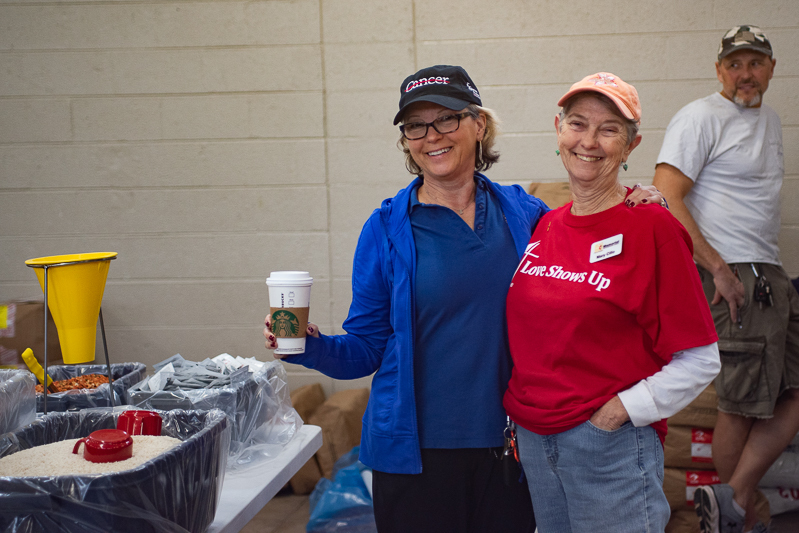 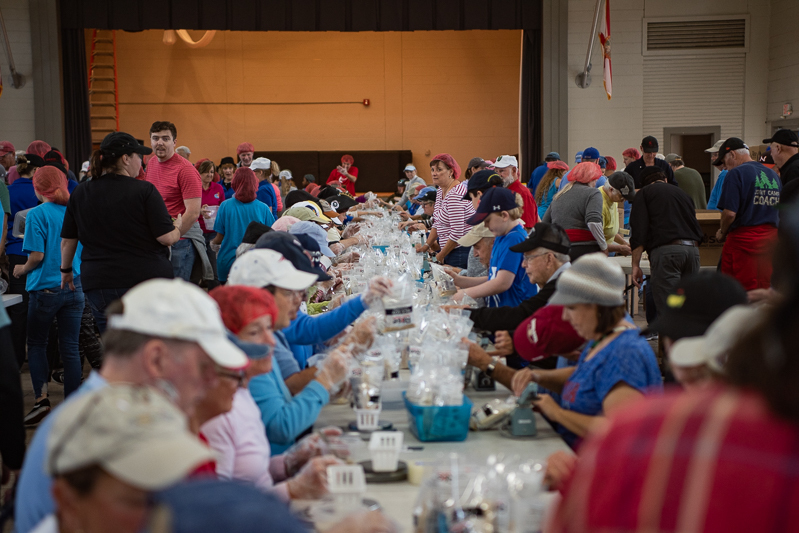 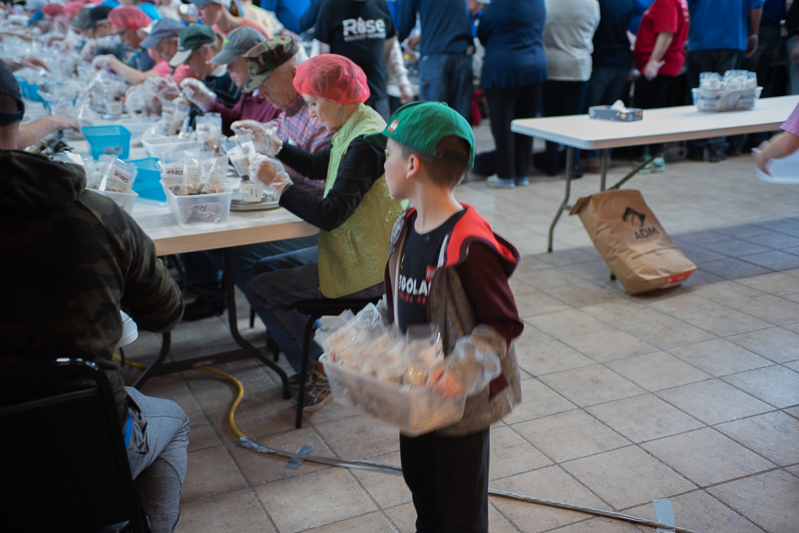 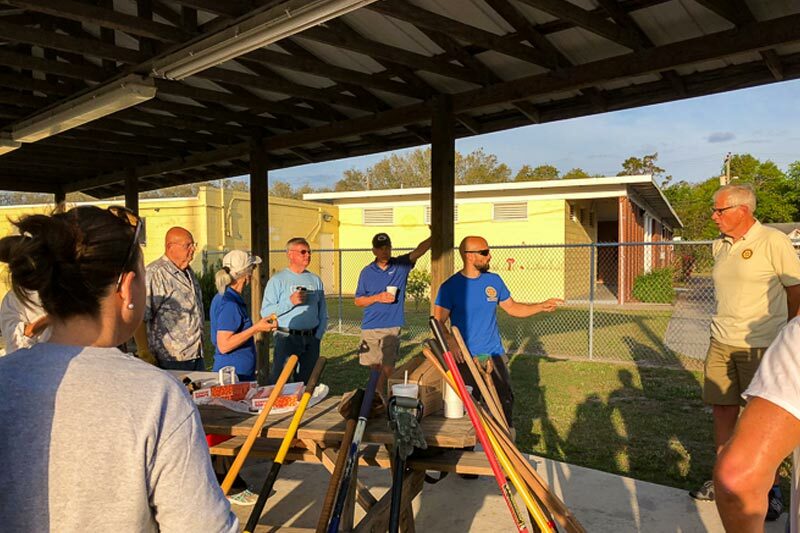 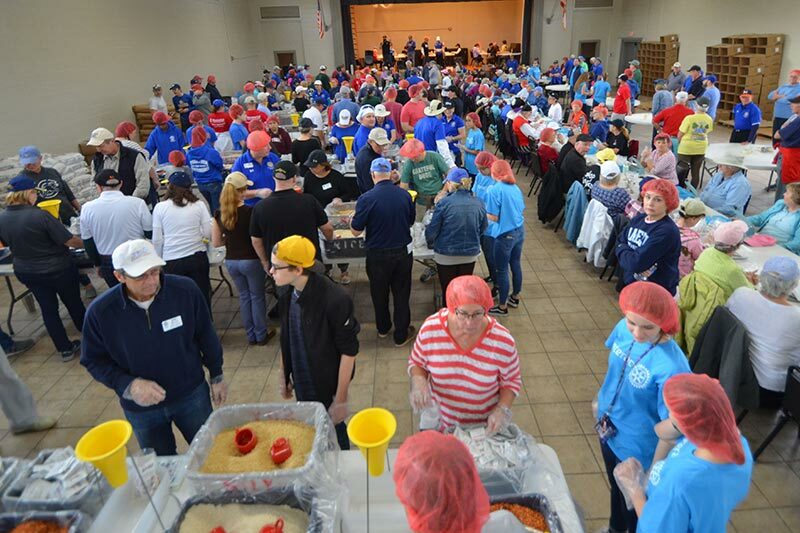 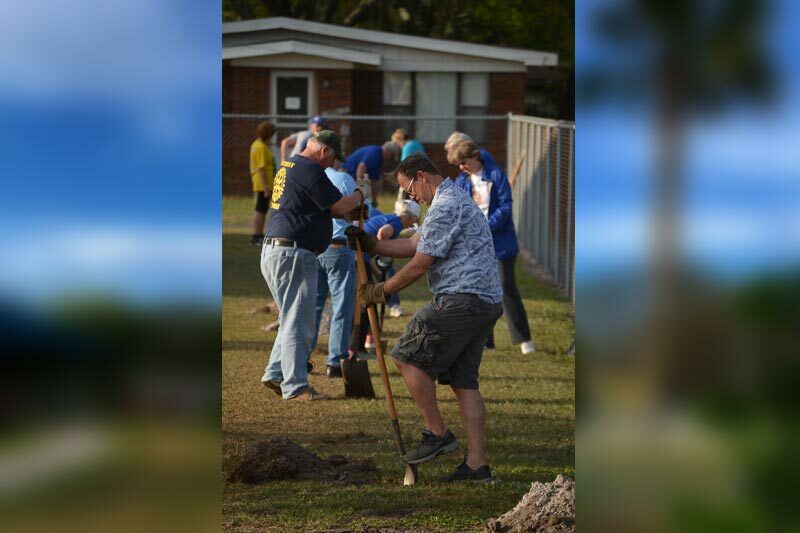 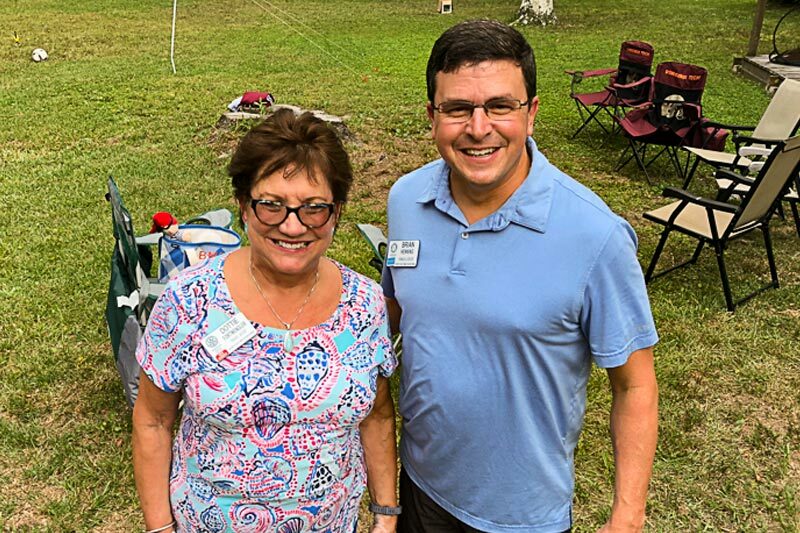 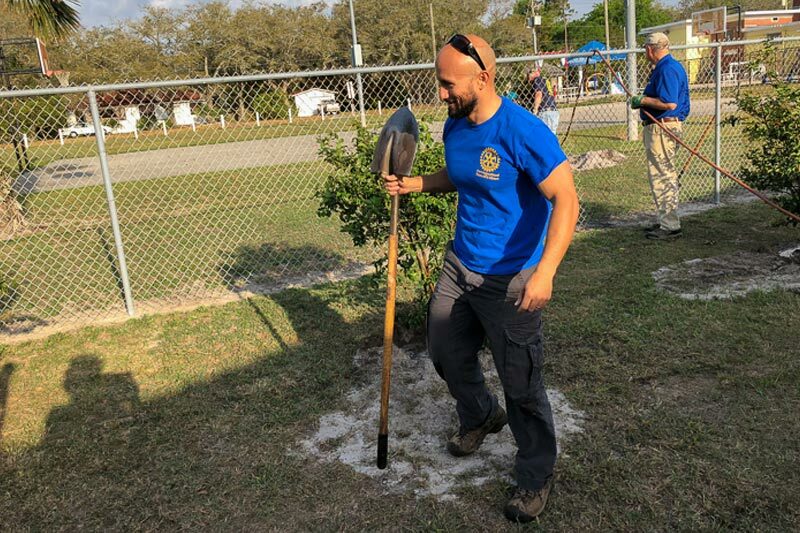 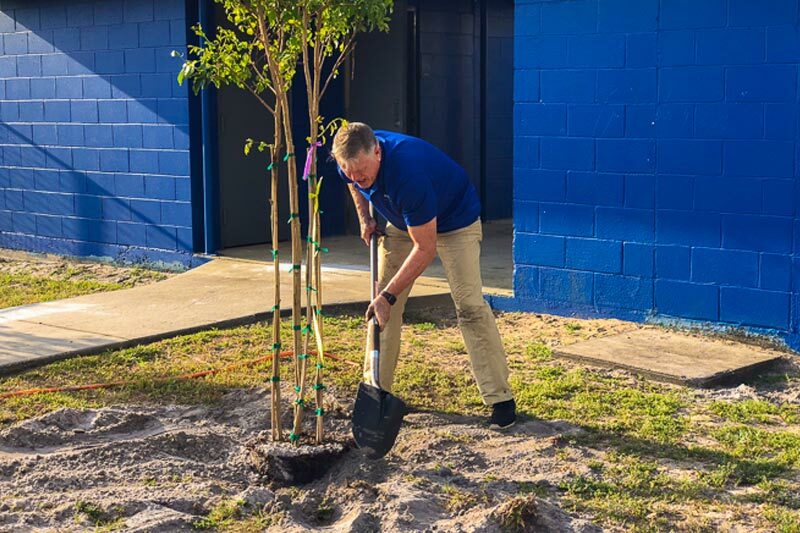 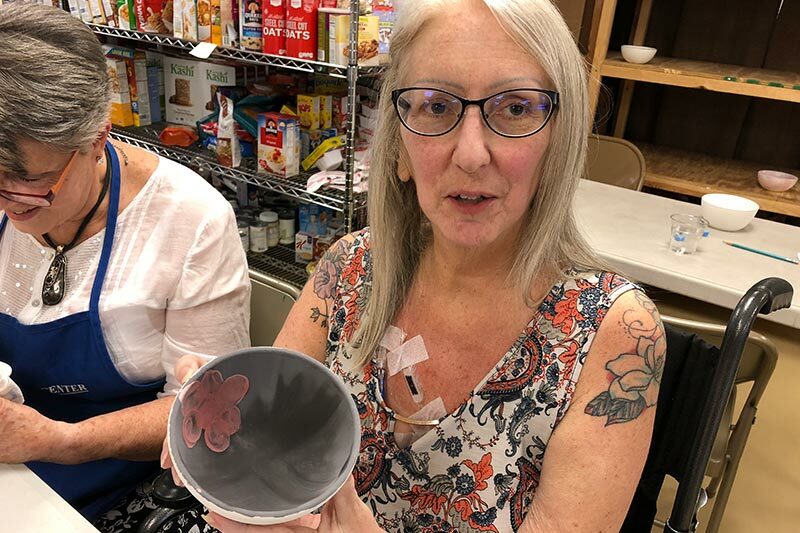 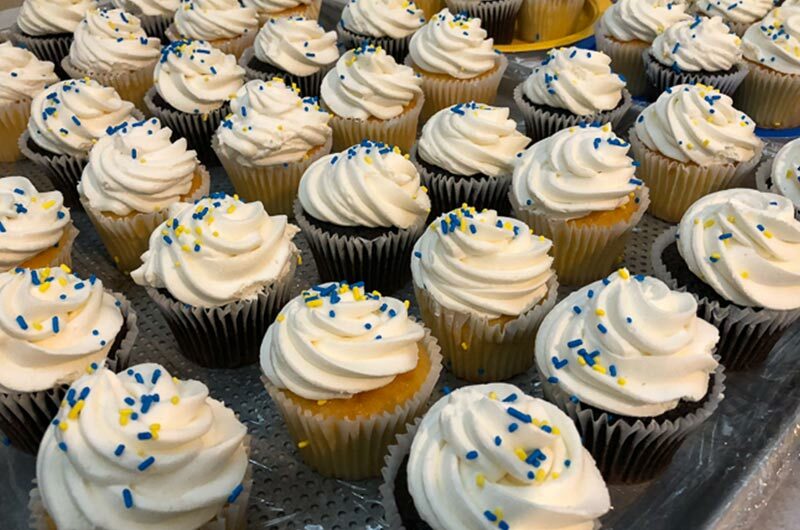 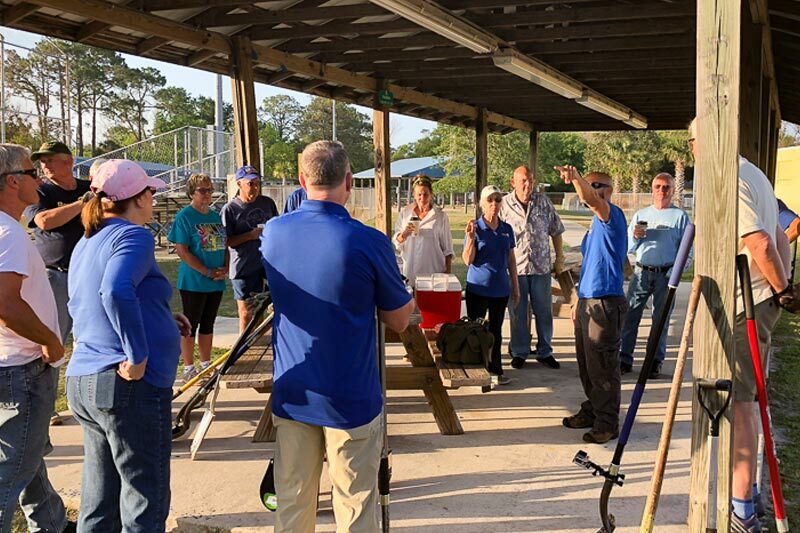 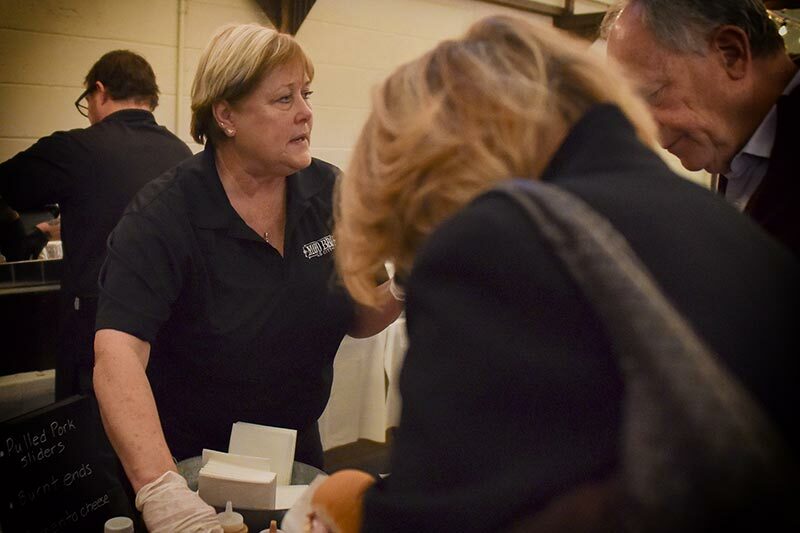 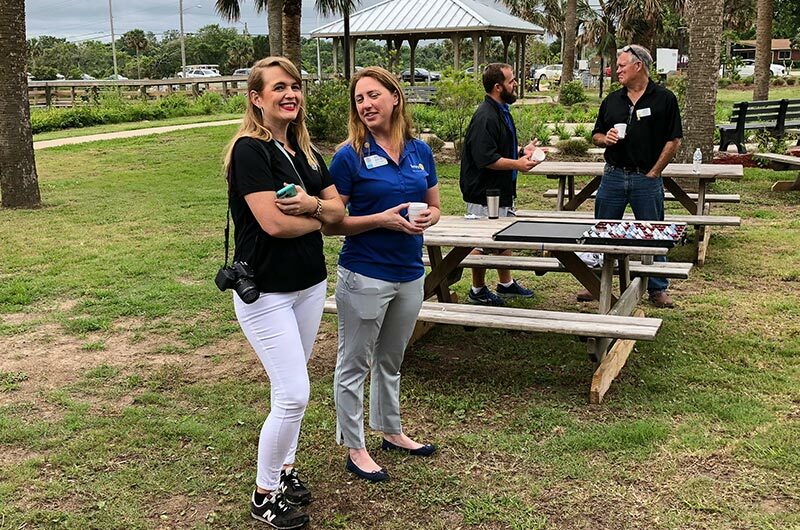 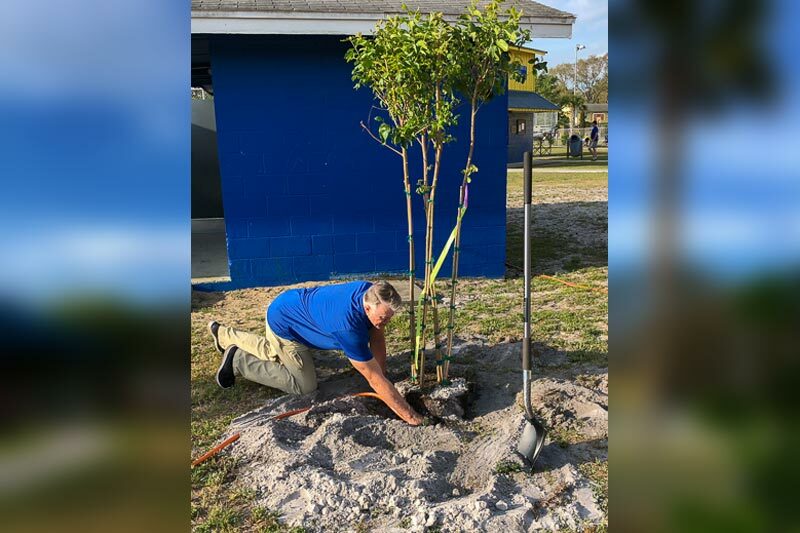 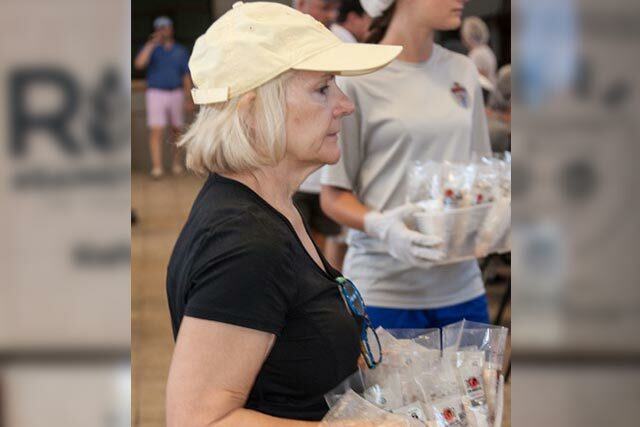 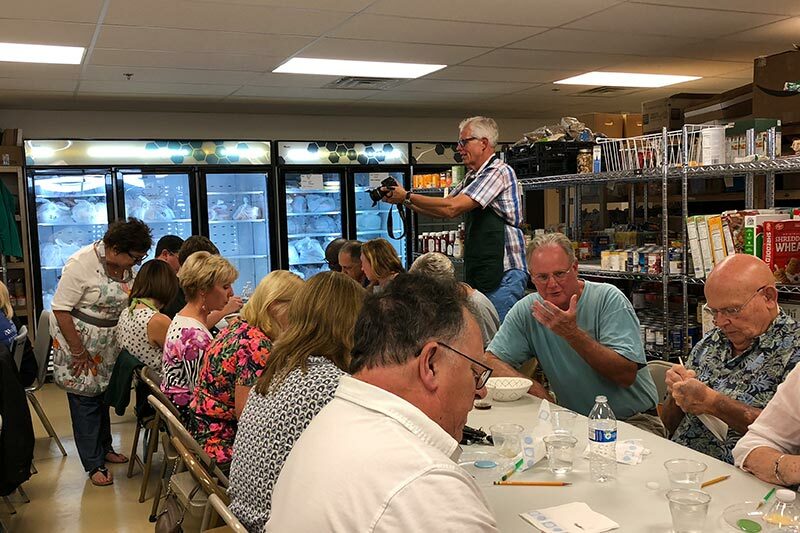 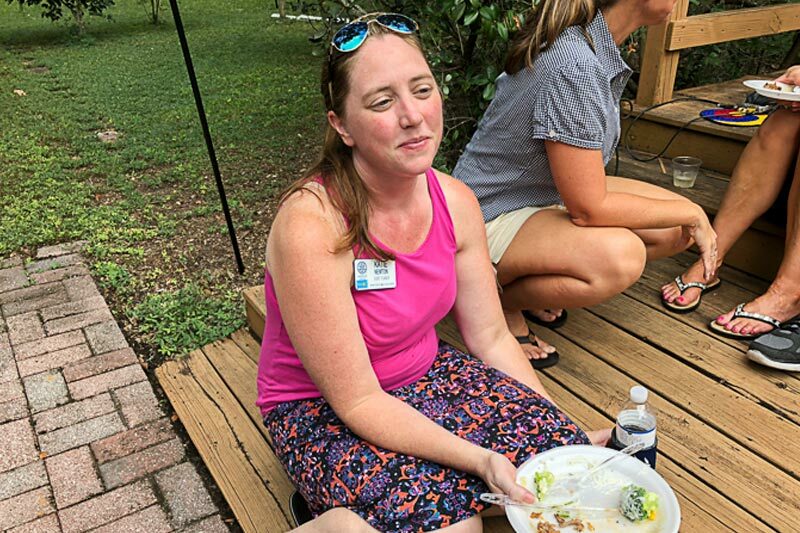 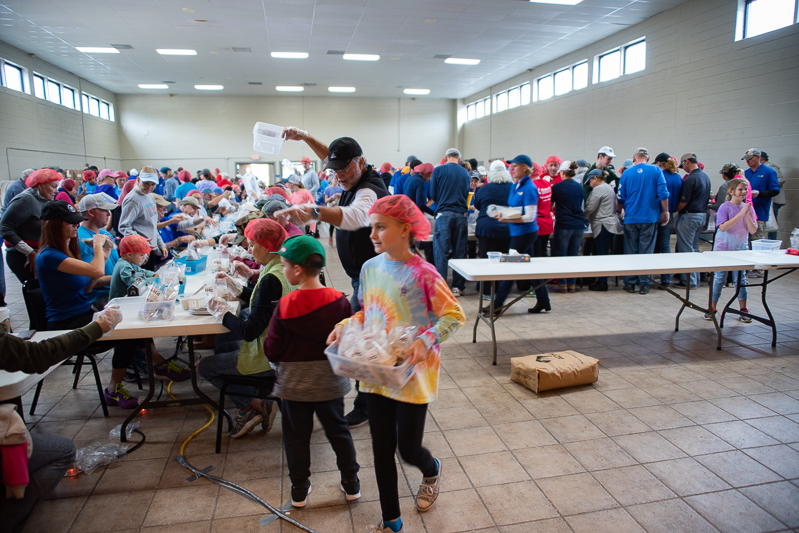 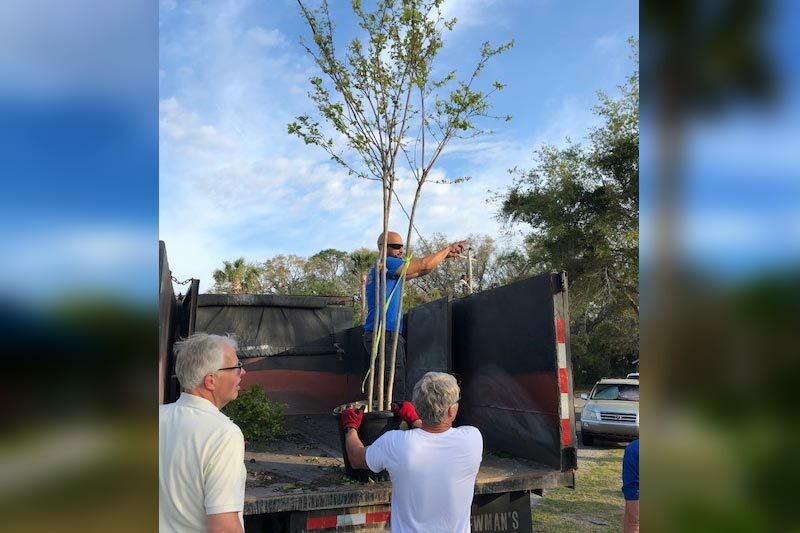 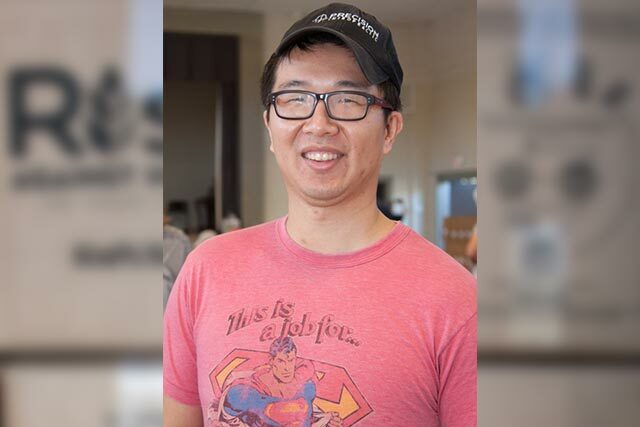 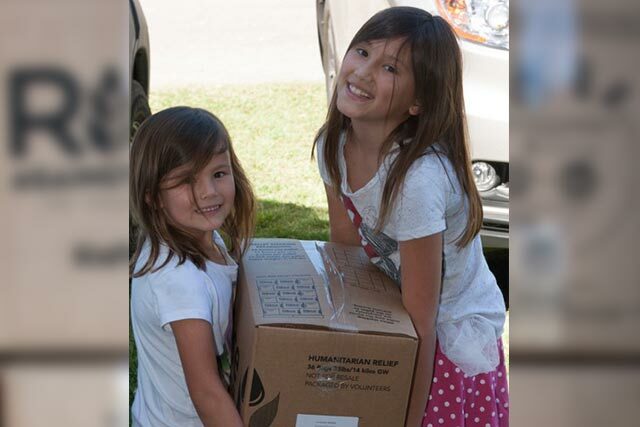 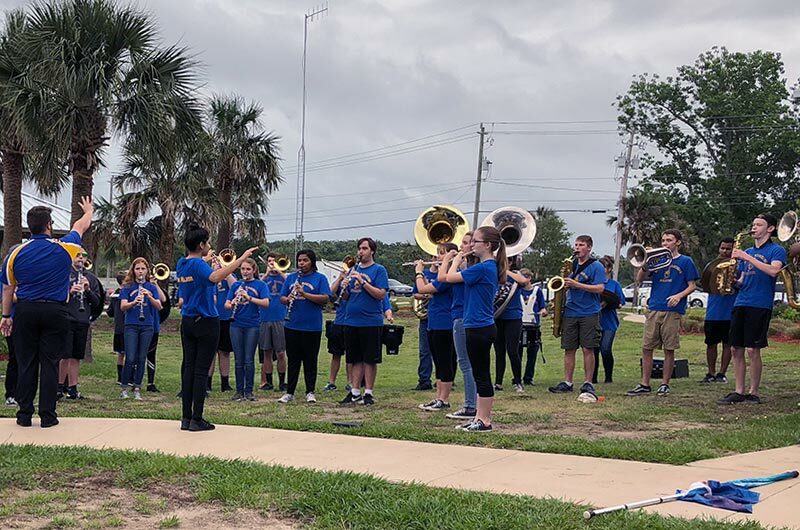 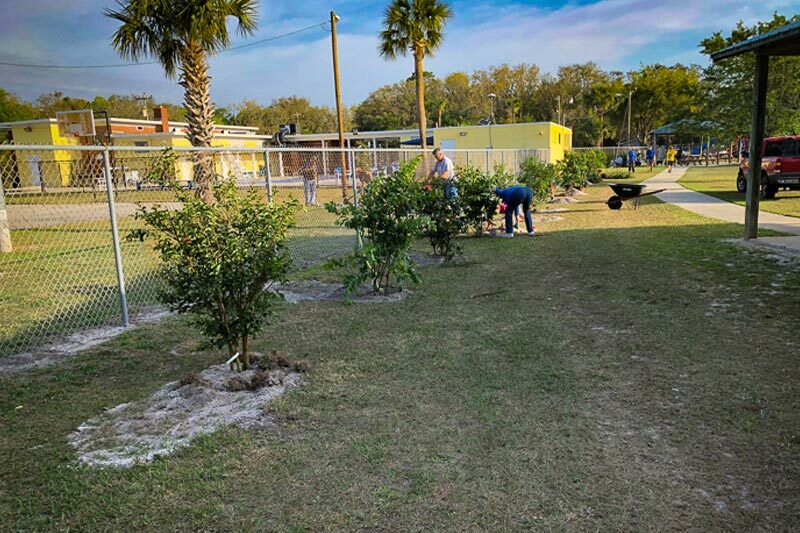 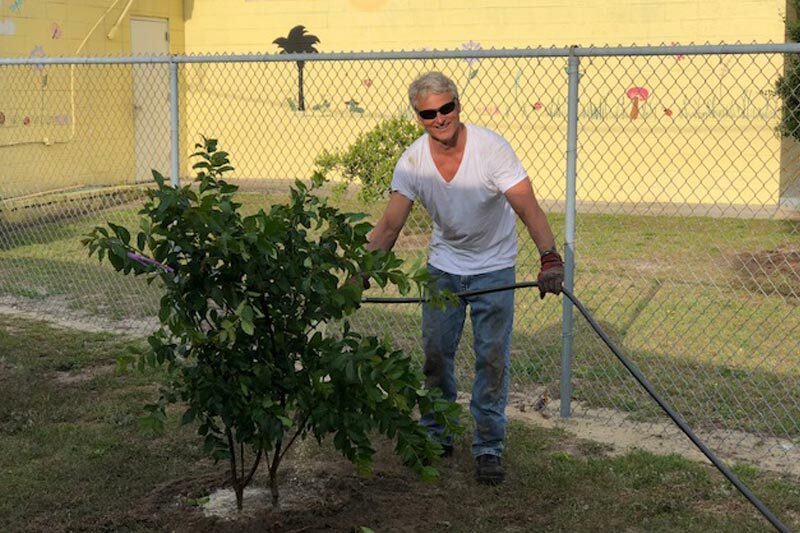 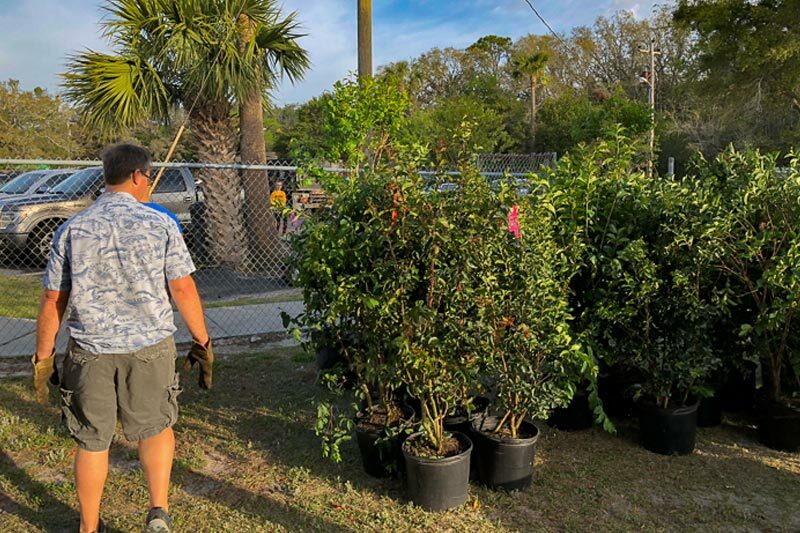 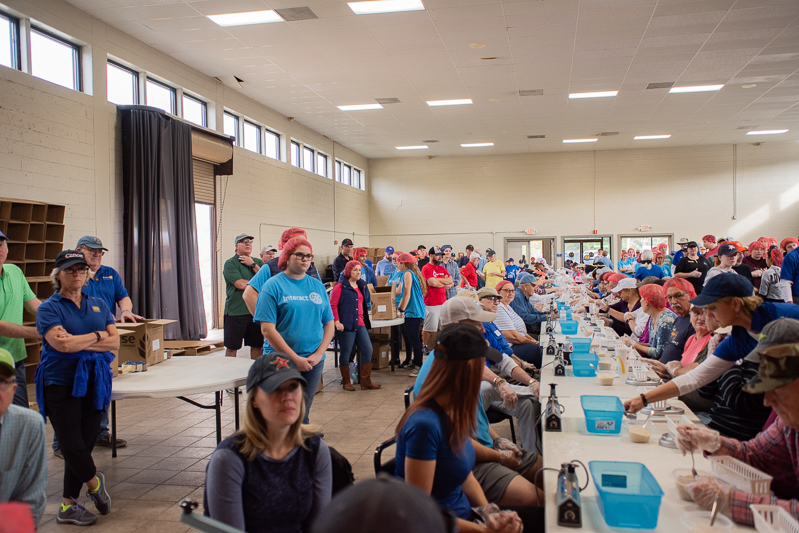 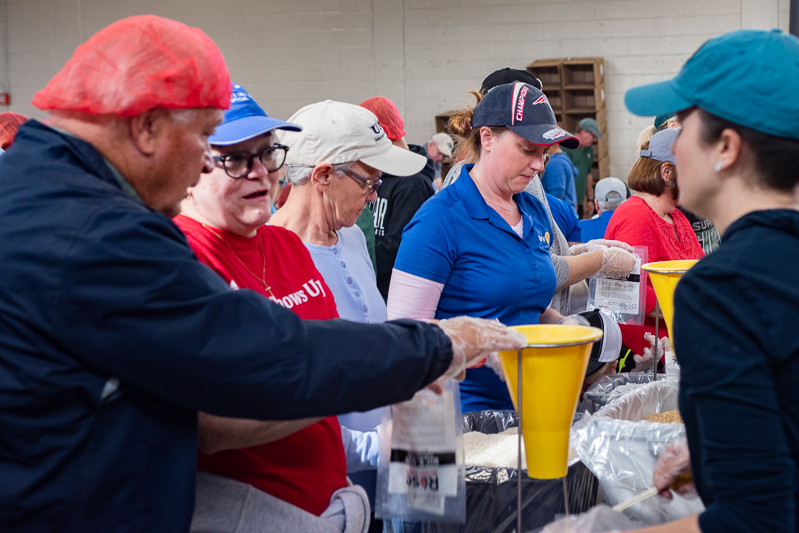 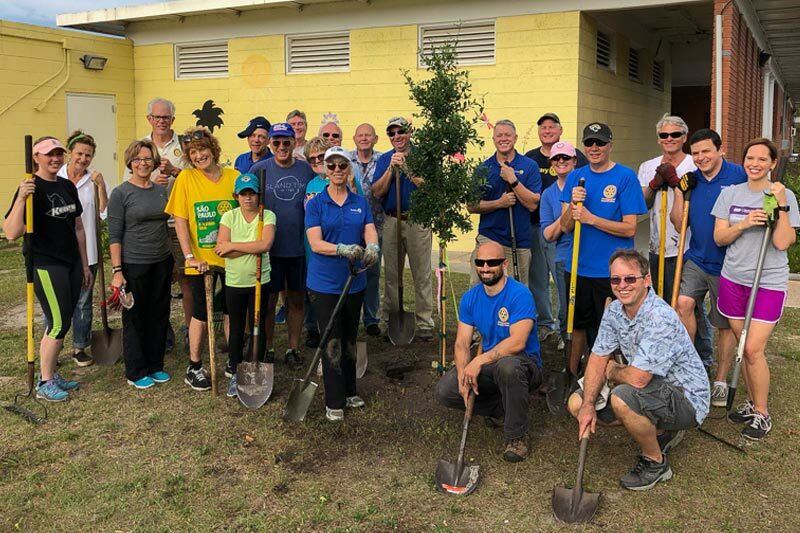 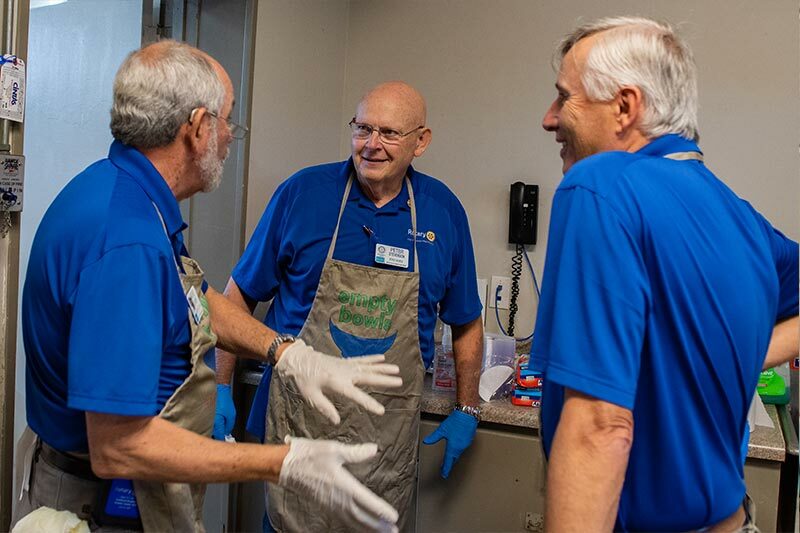 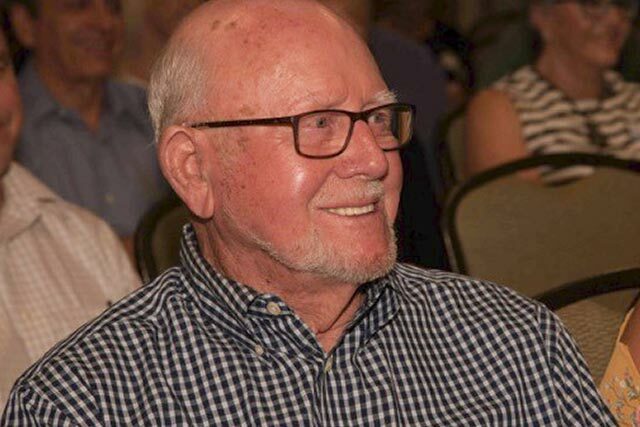 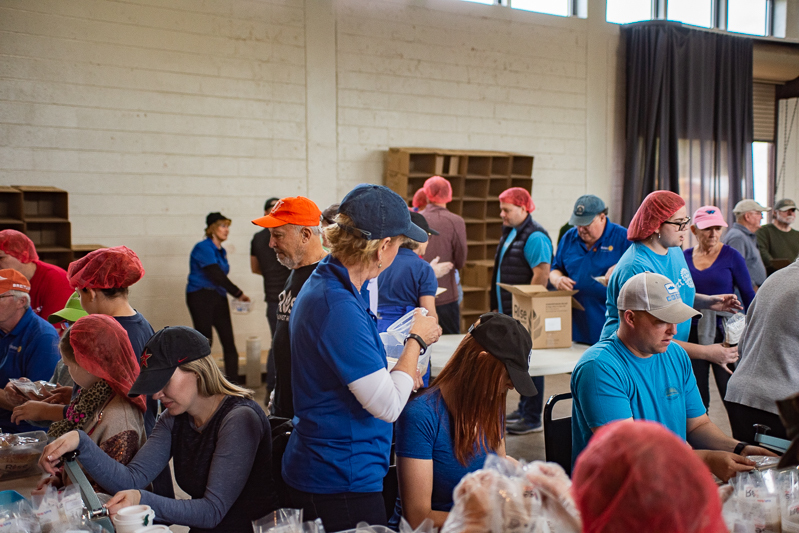 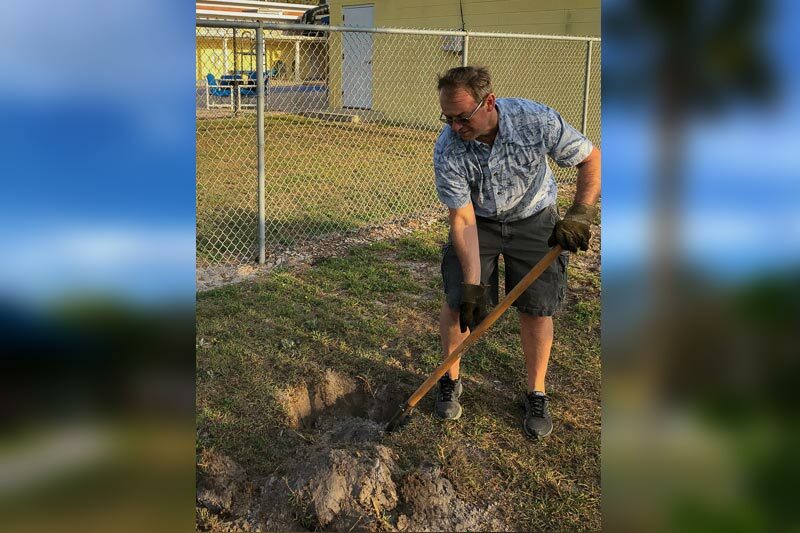 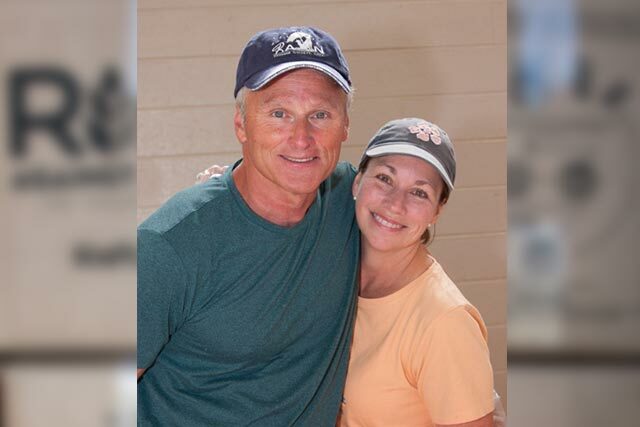 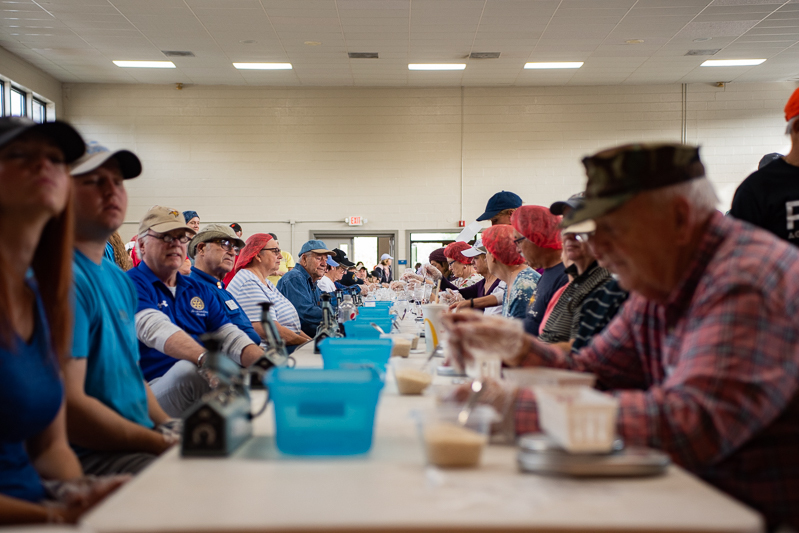 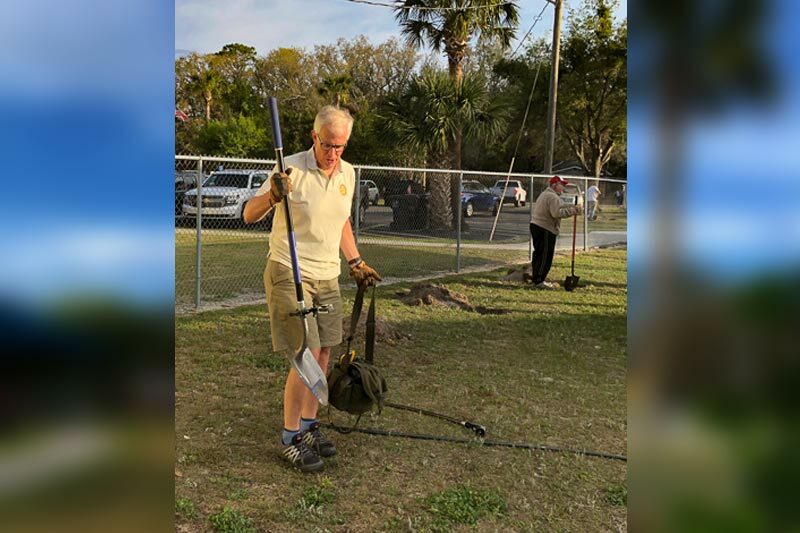 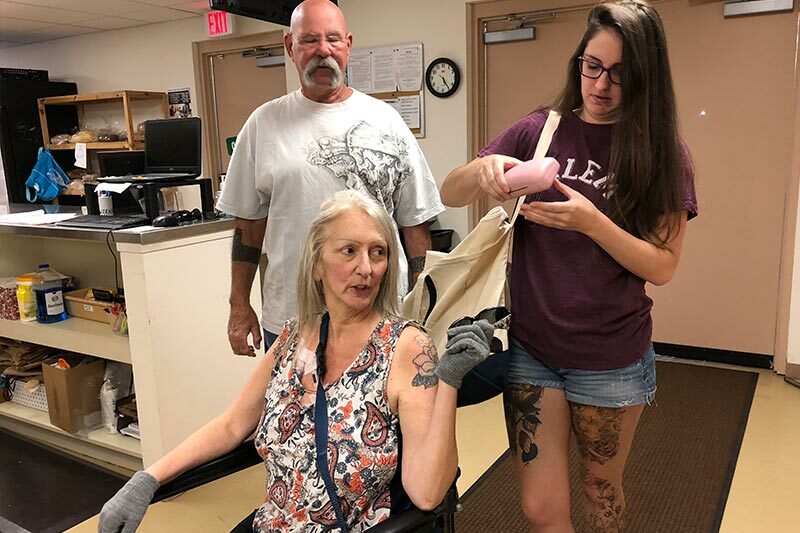 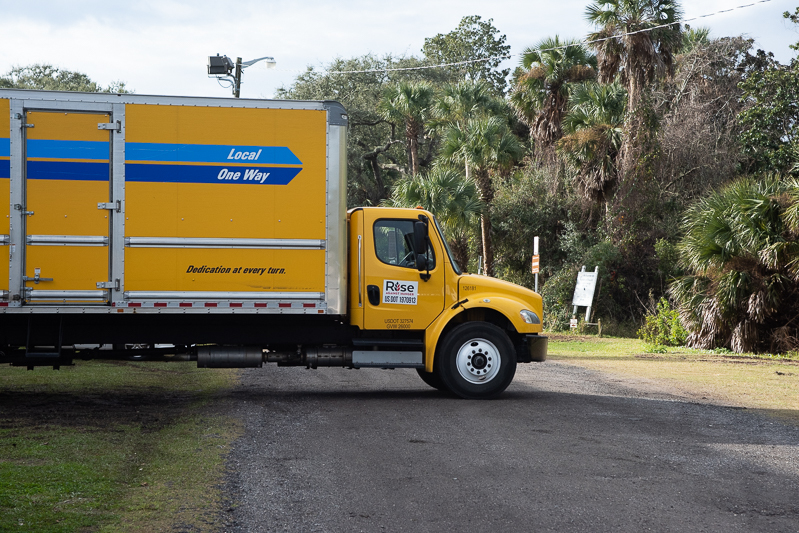 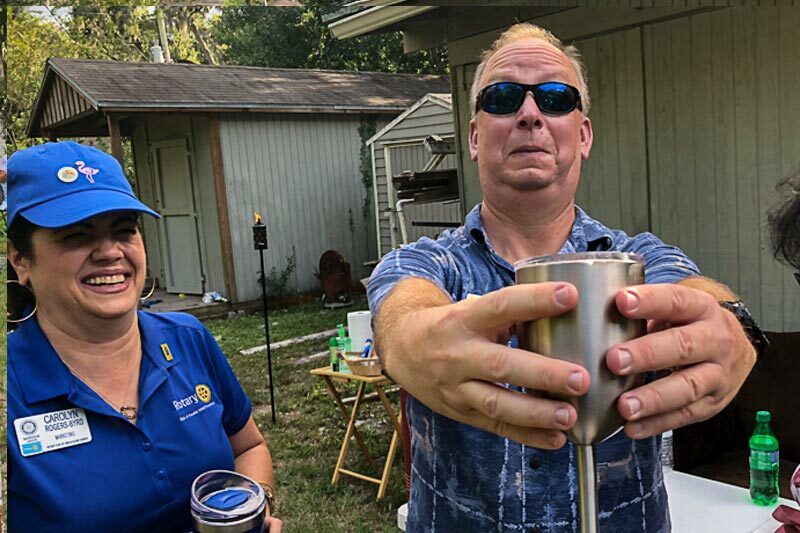 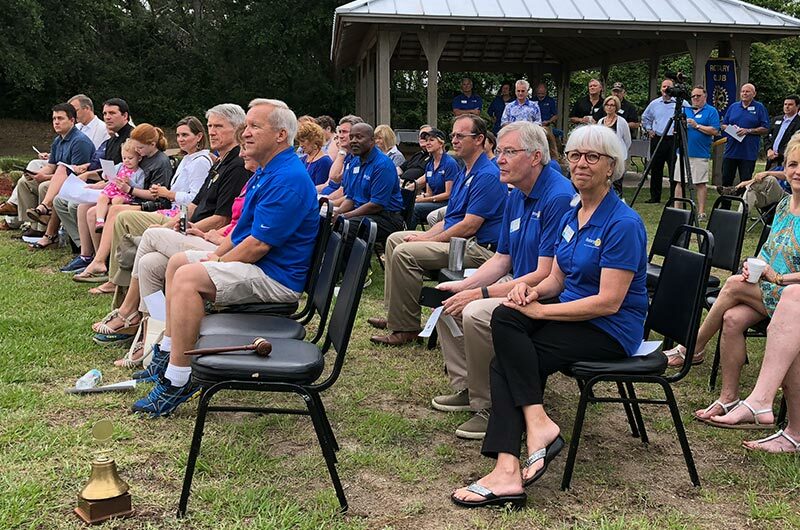 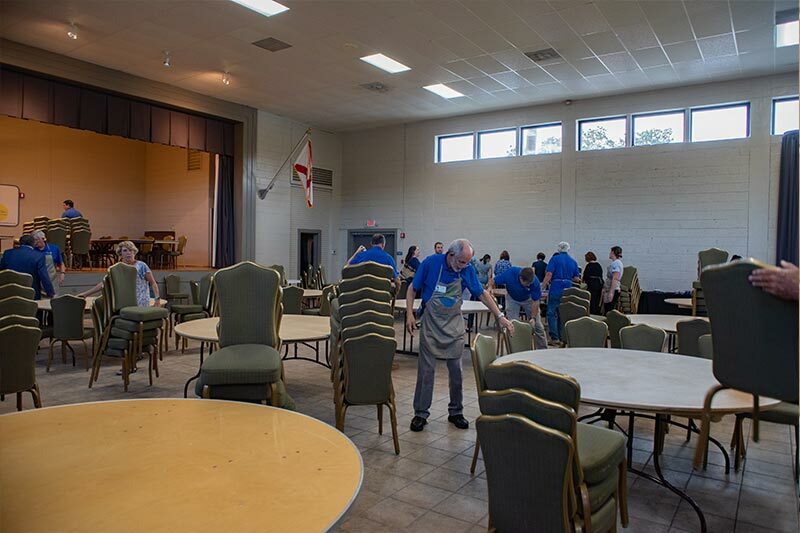 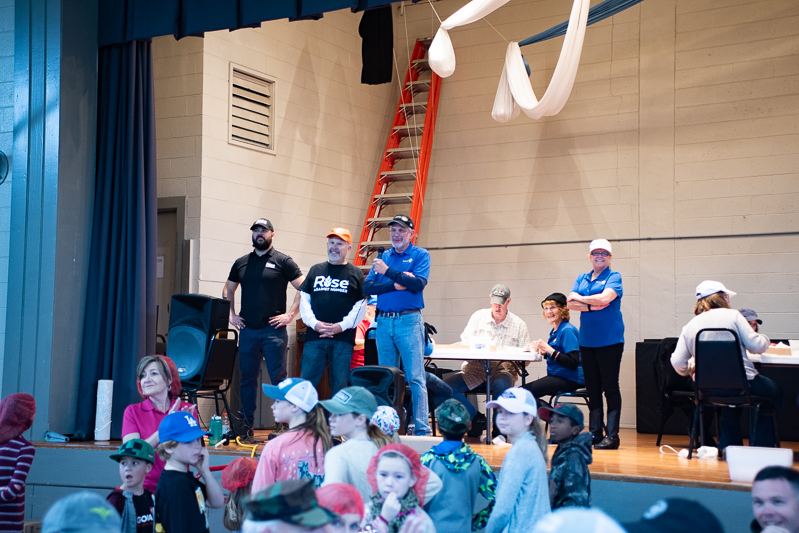 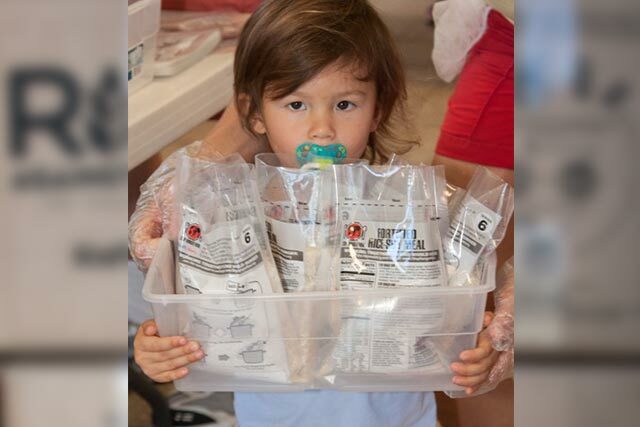 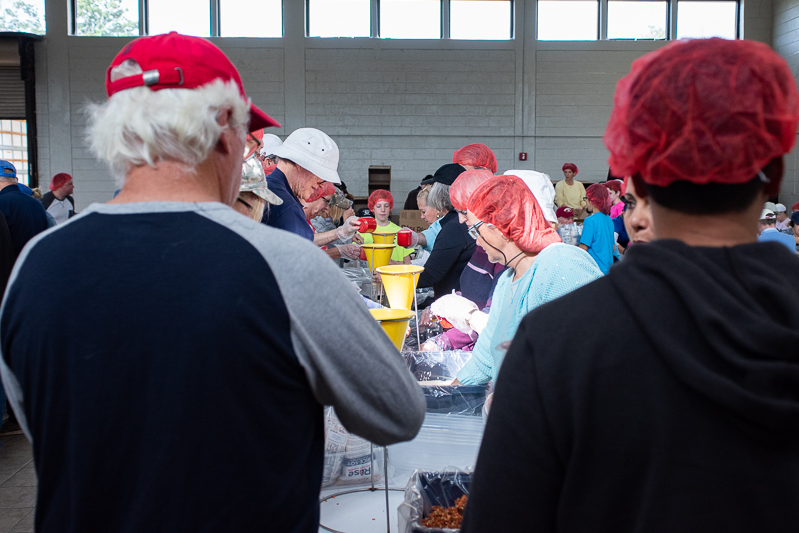 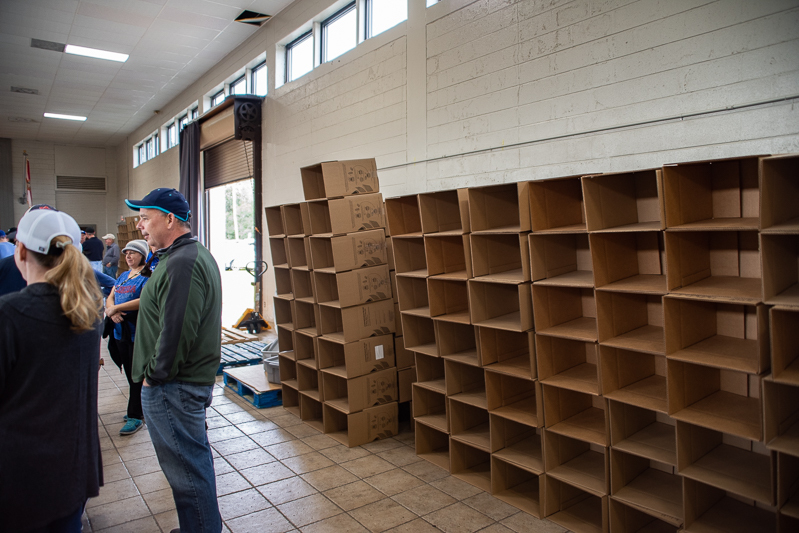 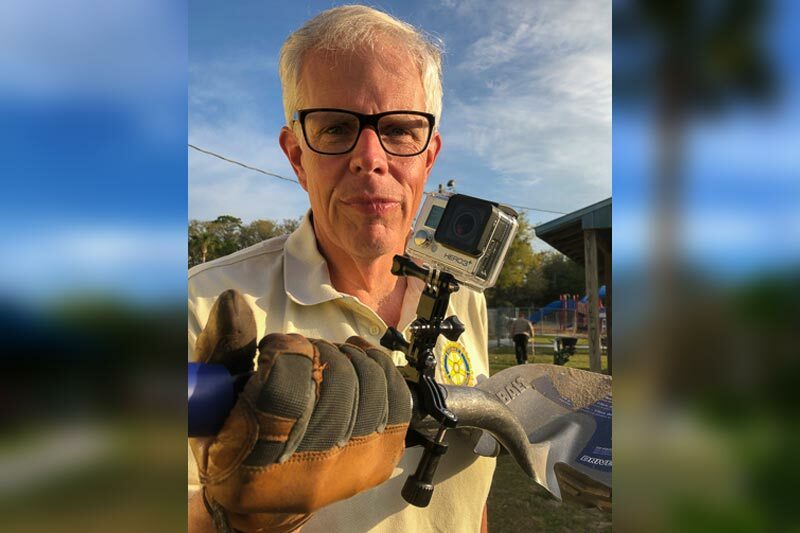 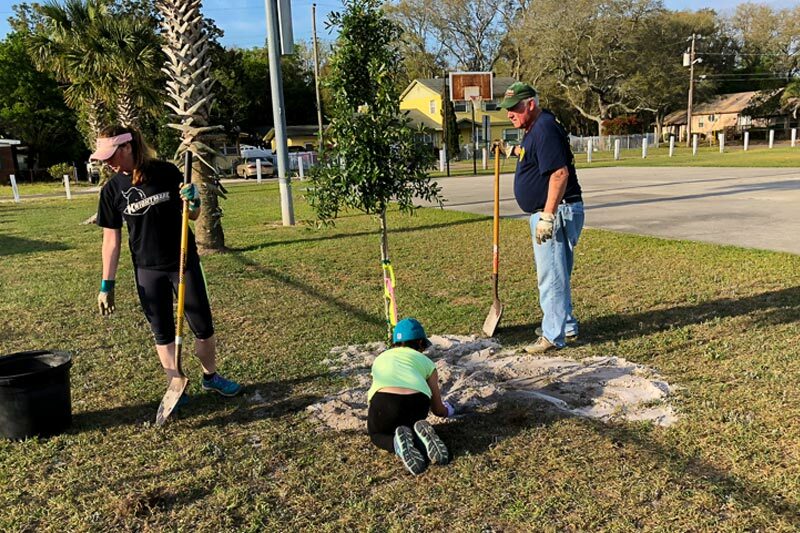 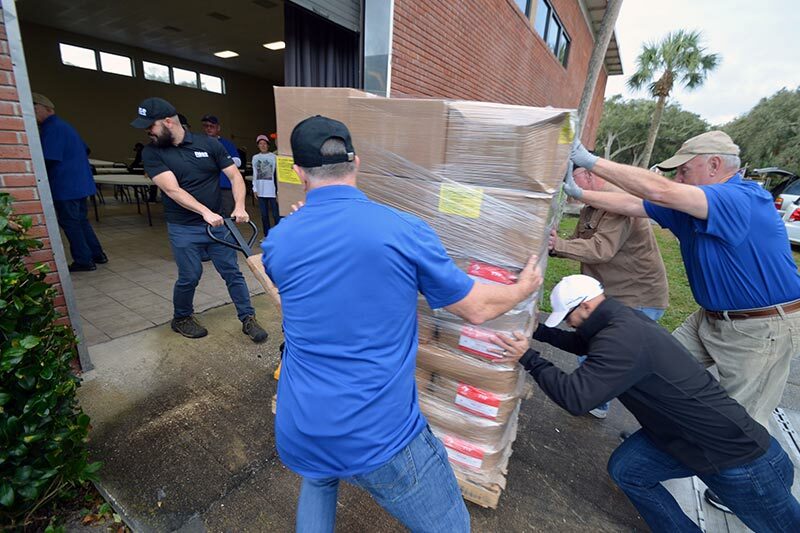 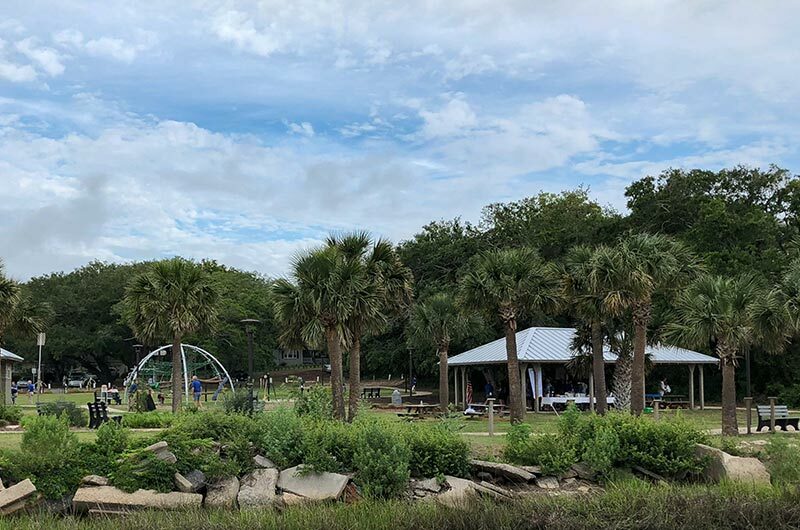 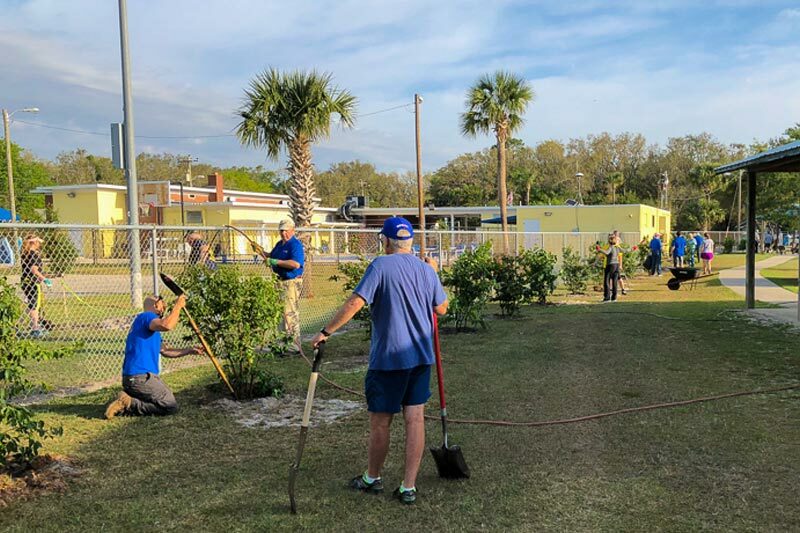 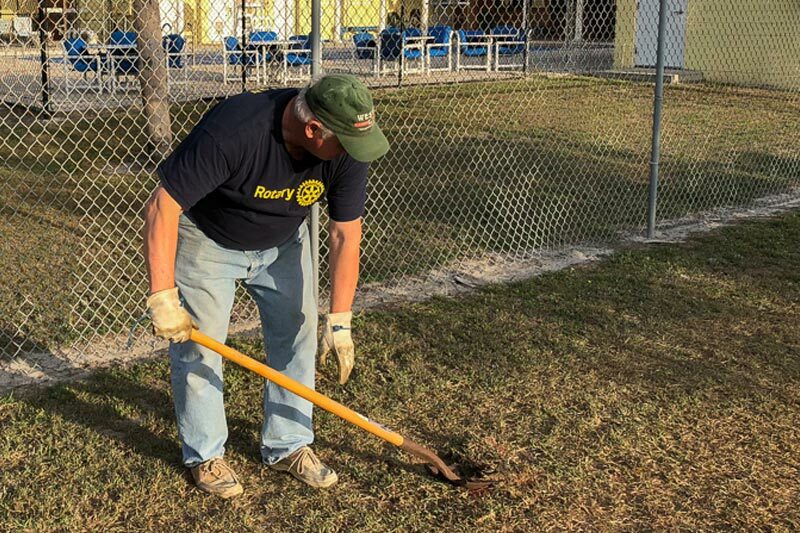 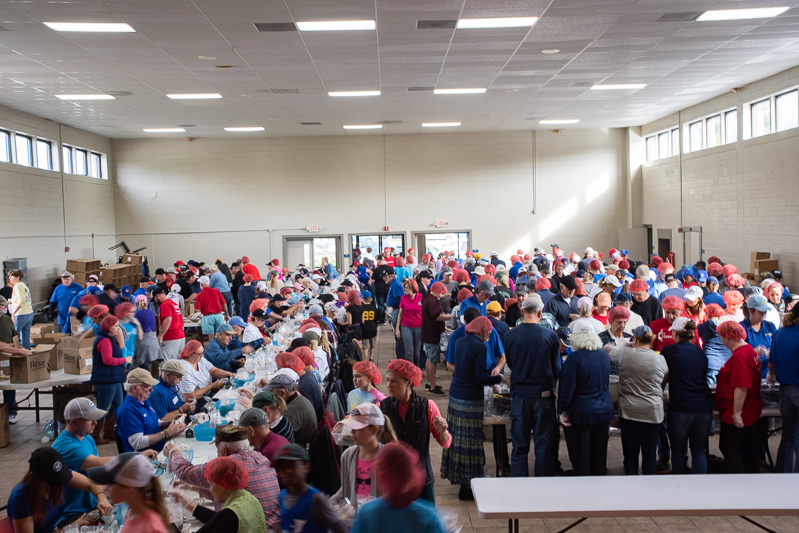 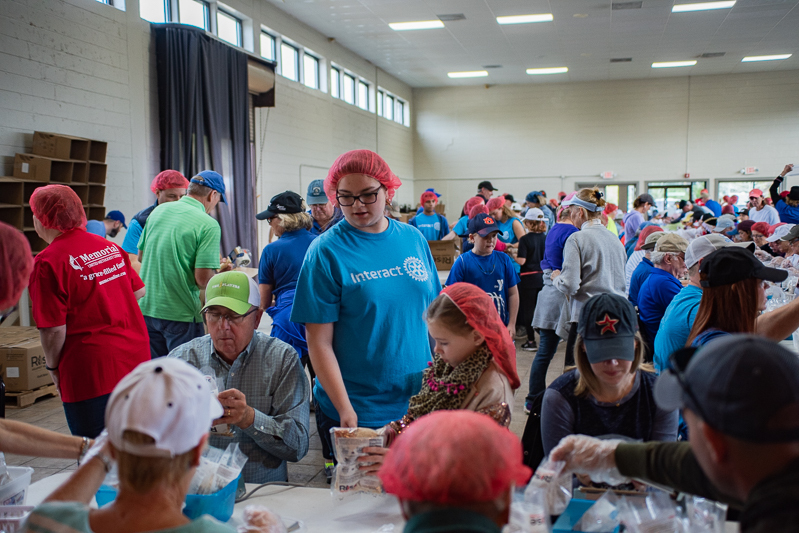 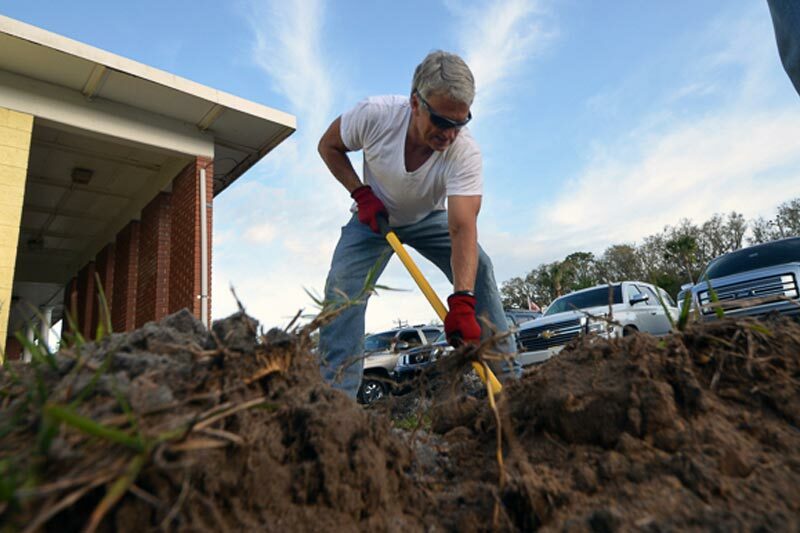 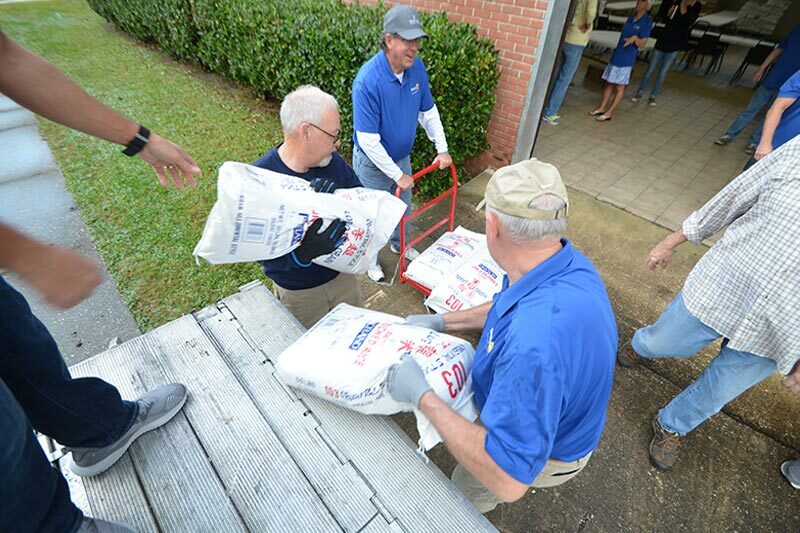 A record number of volunteers from the Rotary Club Amelia Island Sunrise, Rotary Club of Fernandina Beach, the Rotary Satellite Club of Greater Nassau plus other local churches and organizations showed up for this effort. 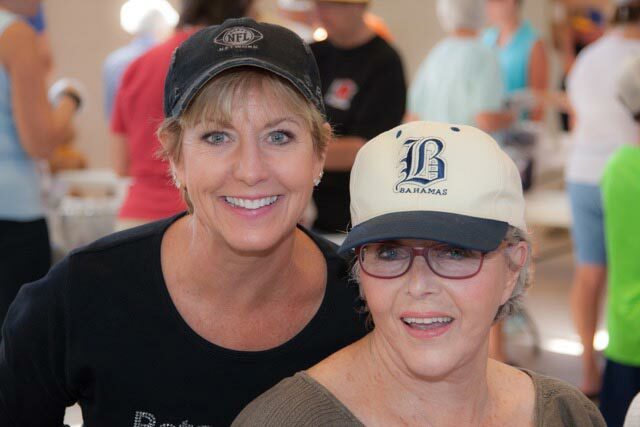 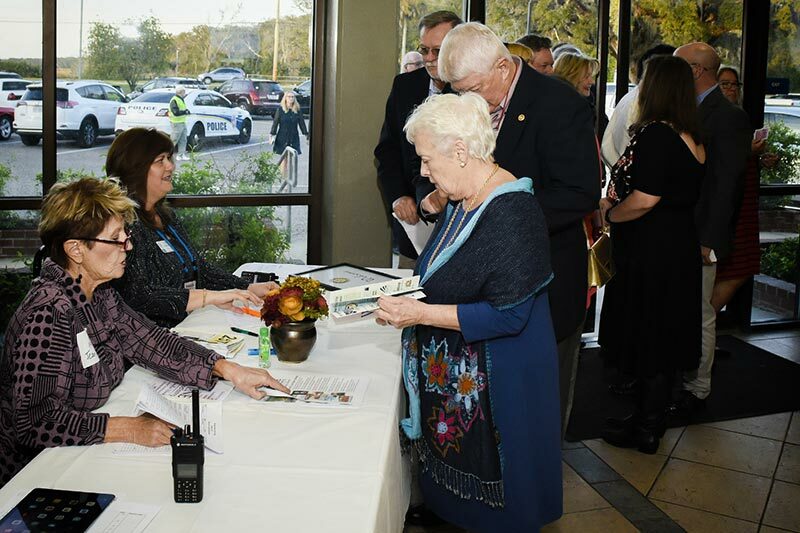 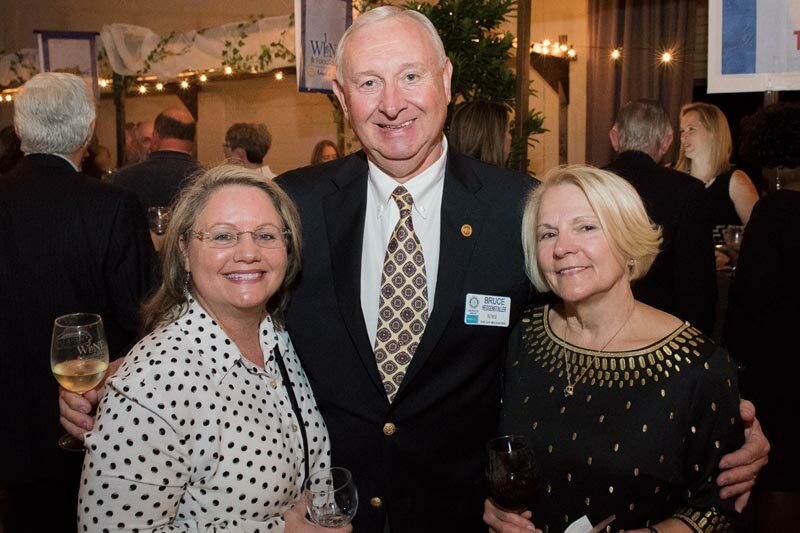 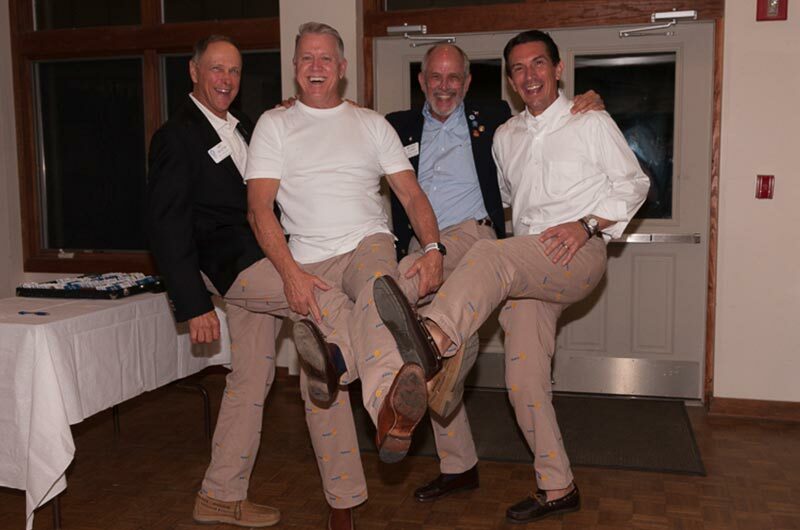 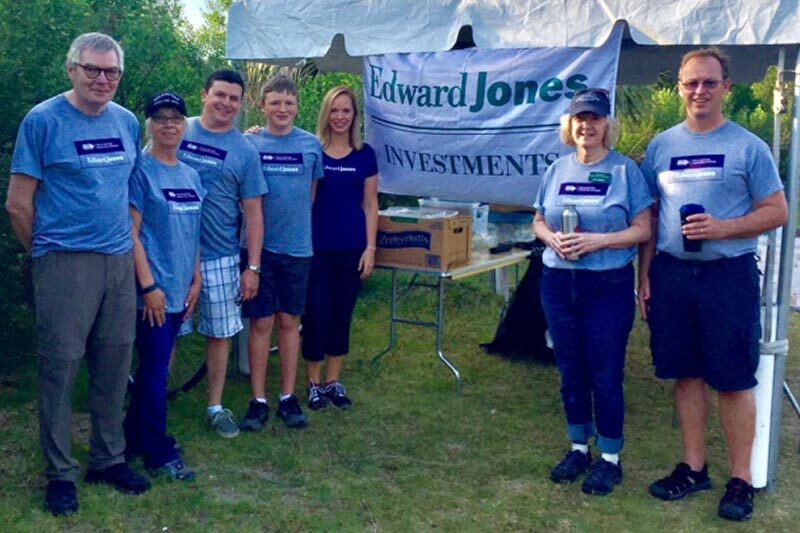 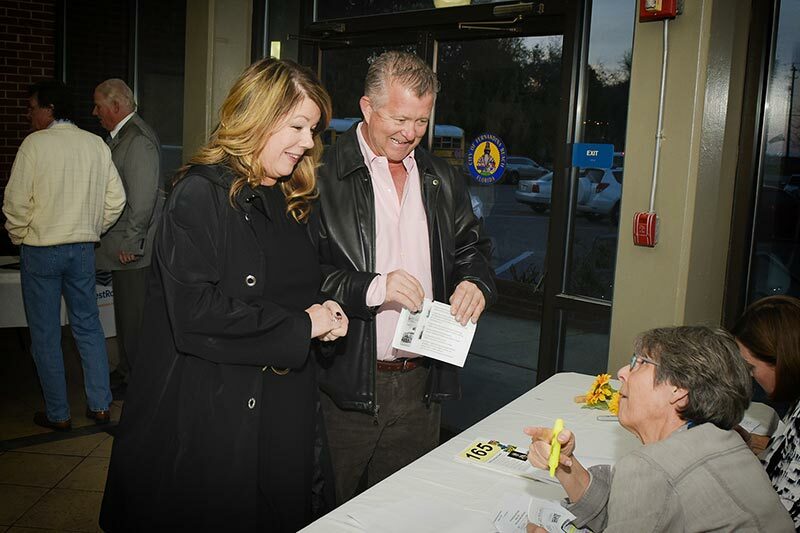 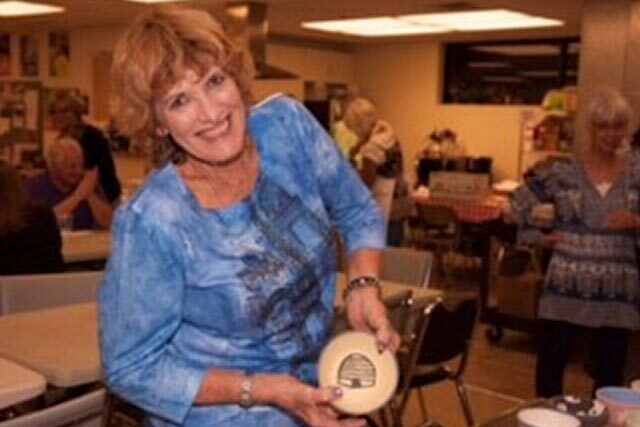 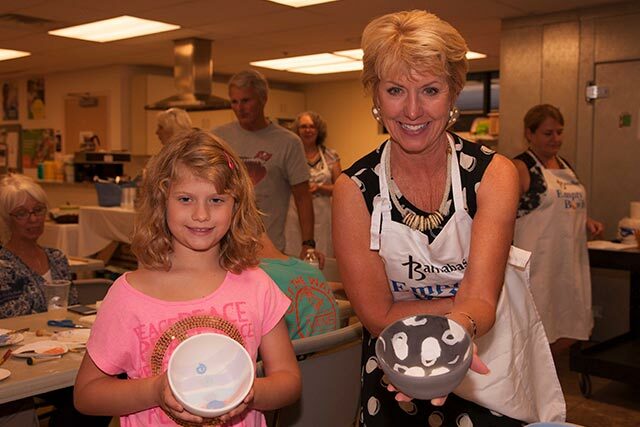 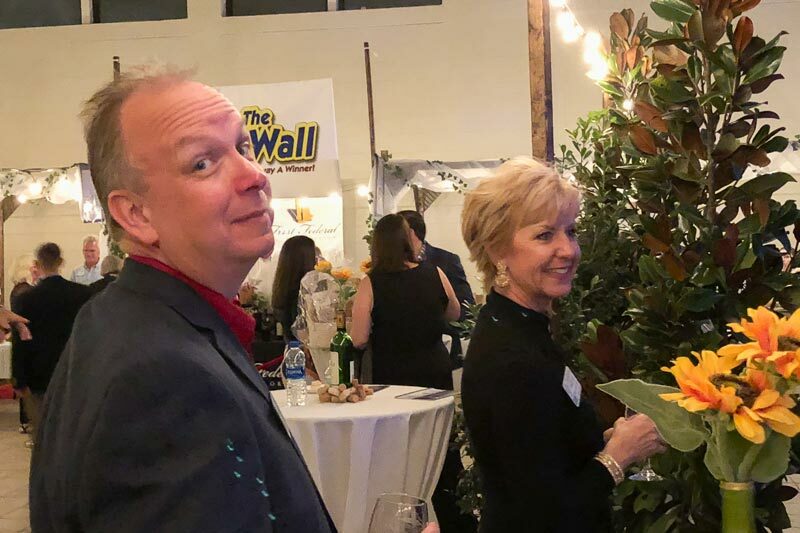 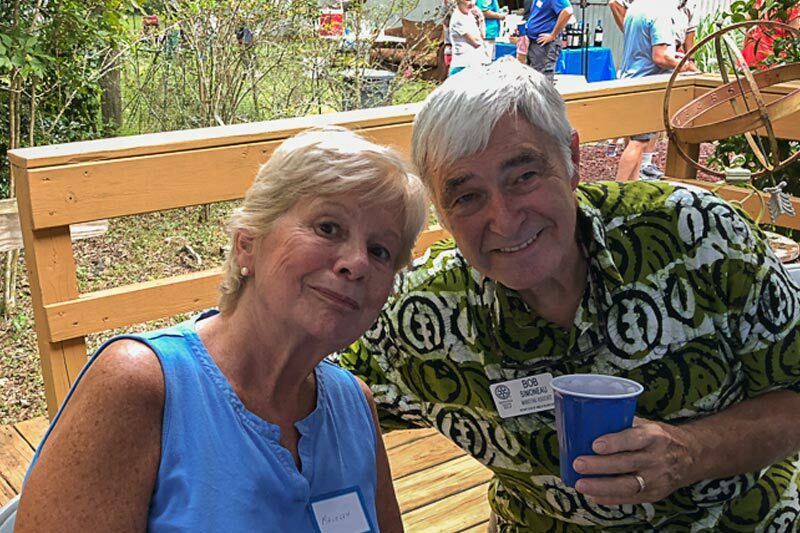 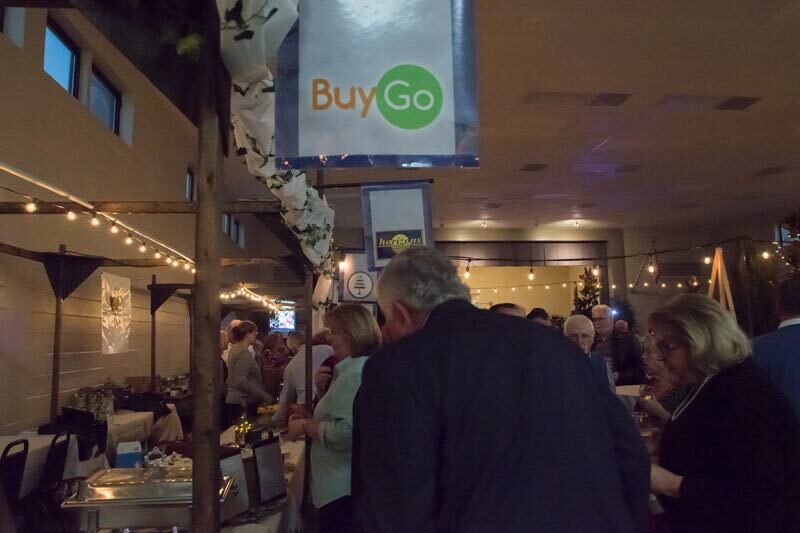 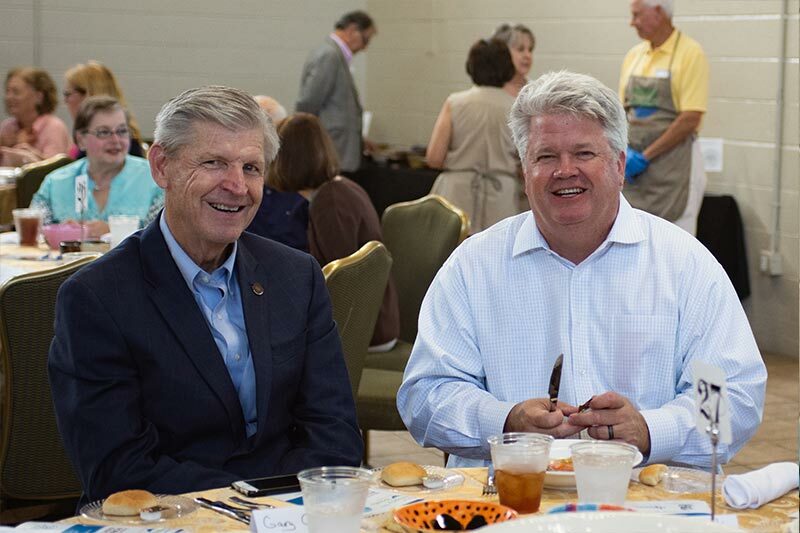 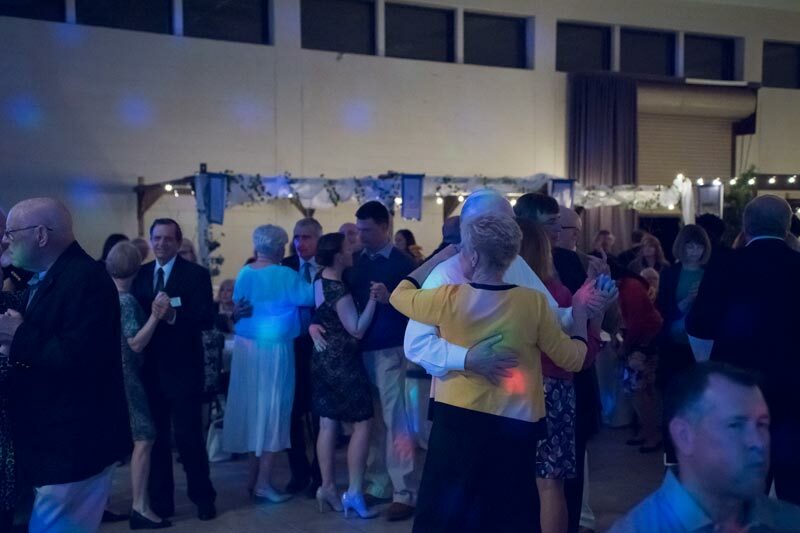 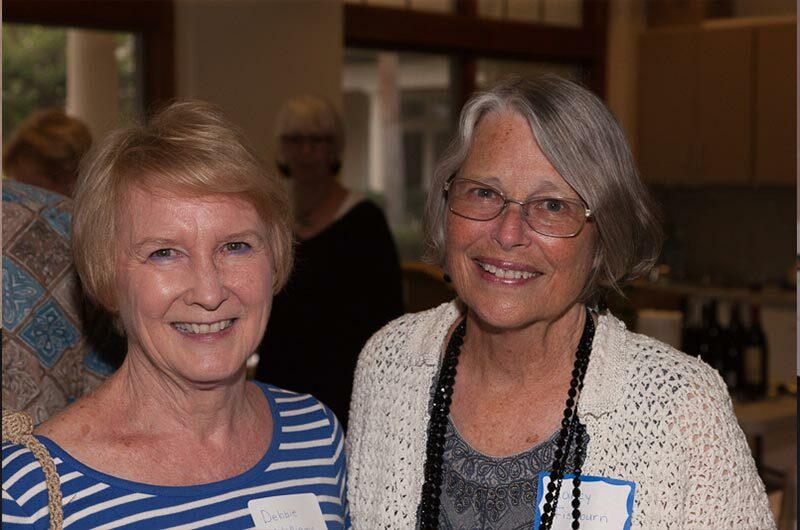 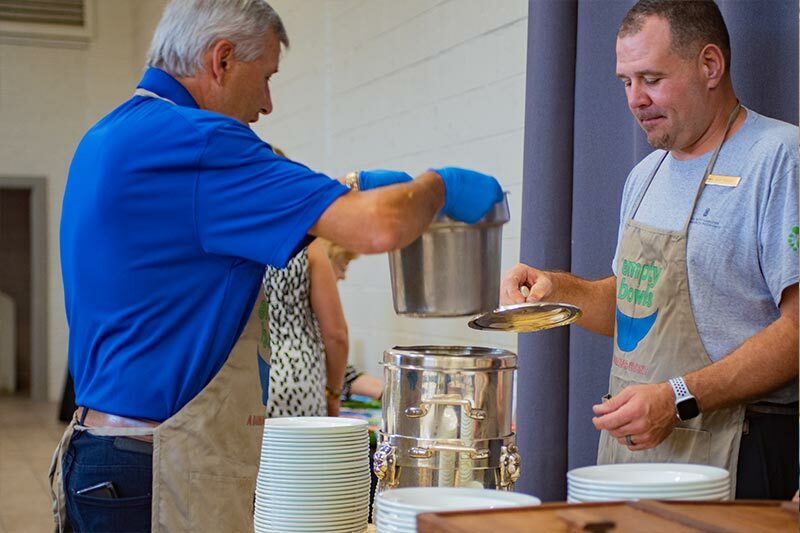 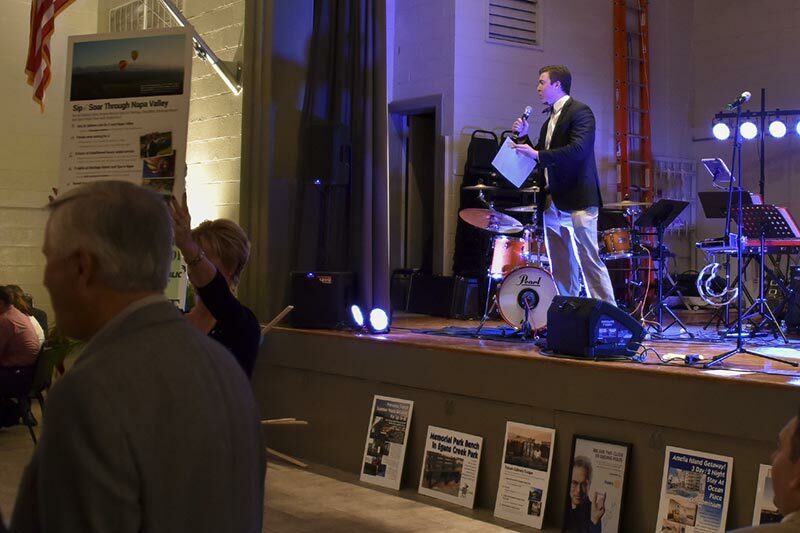 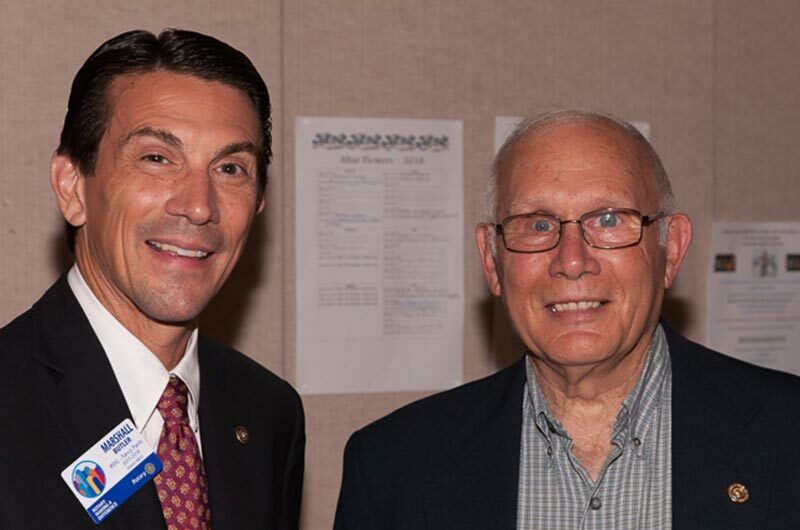 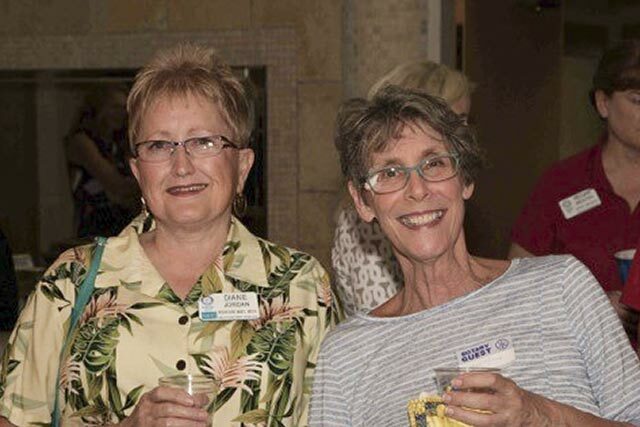 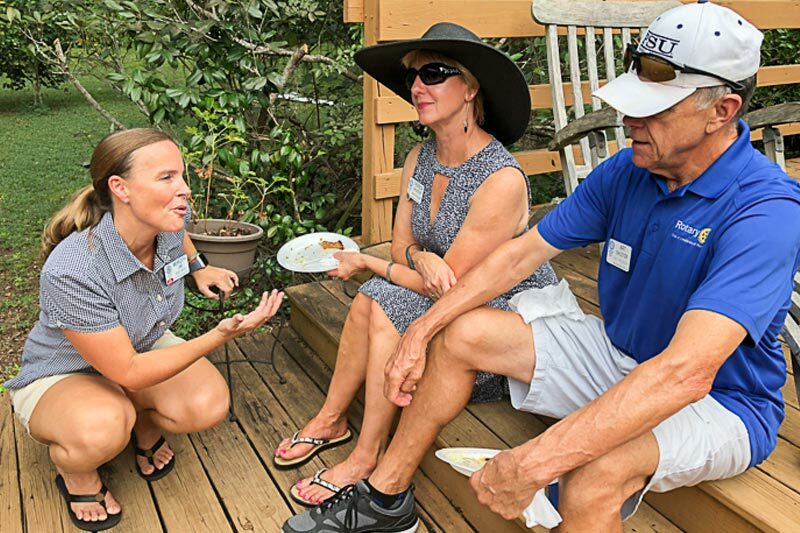 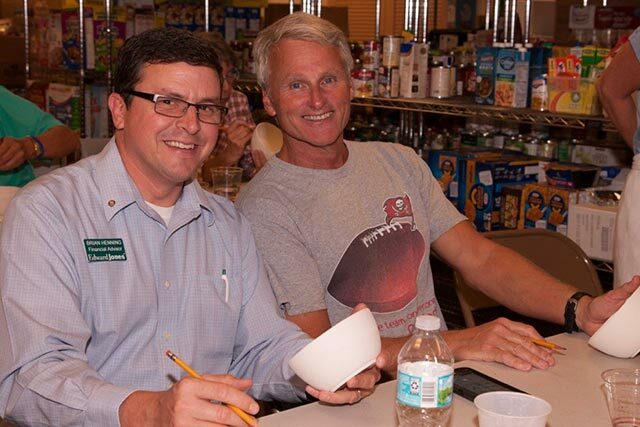 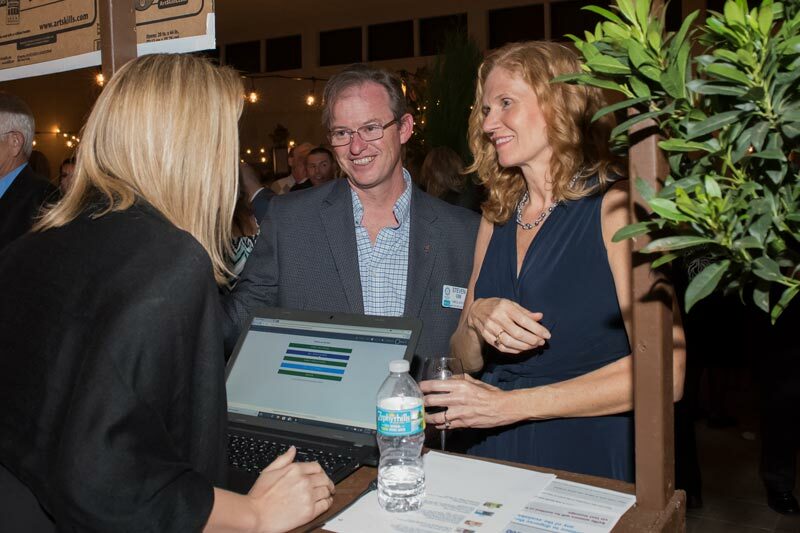 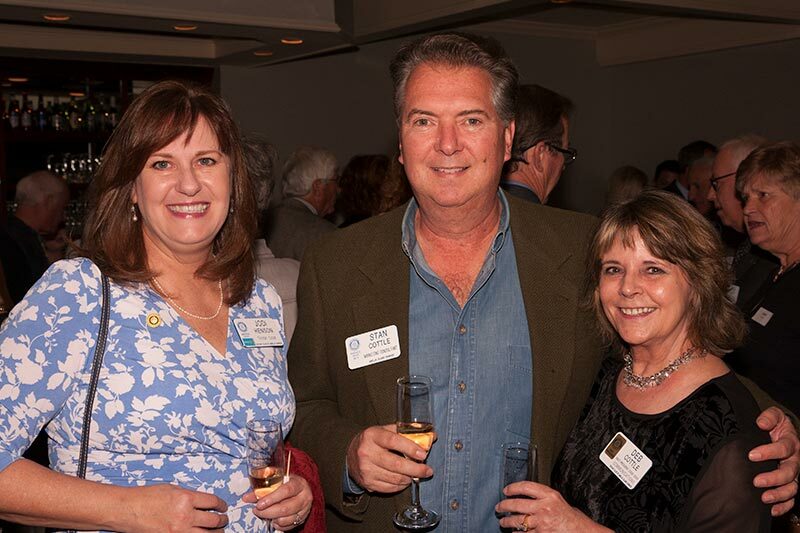 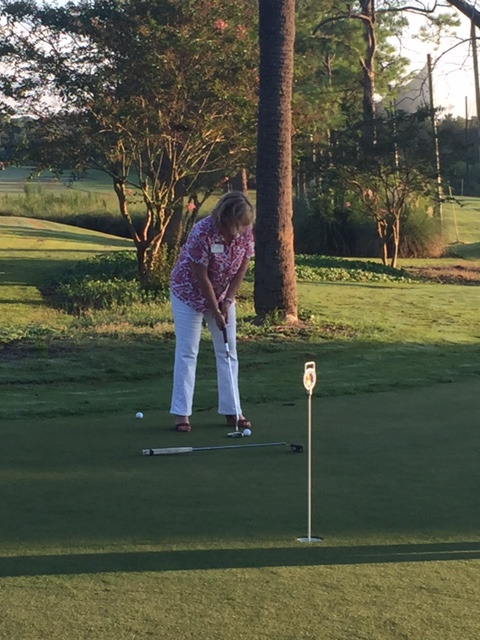 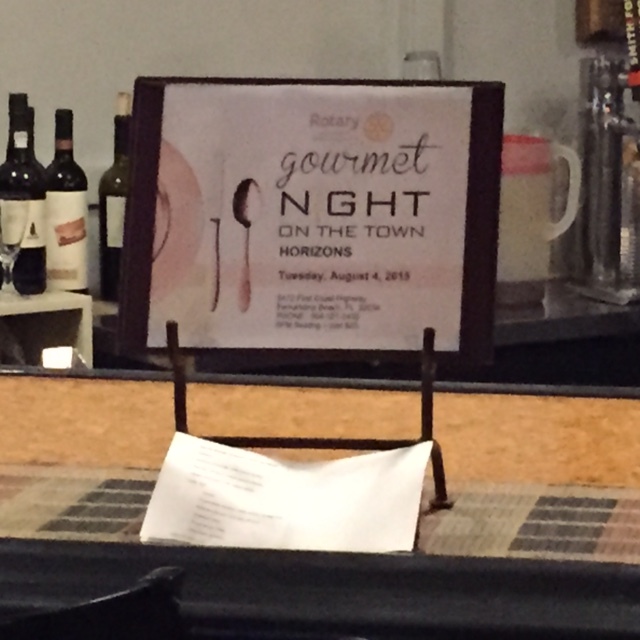 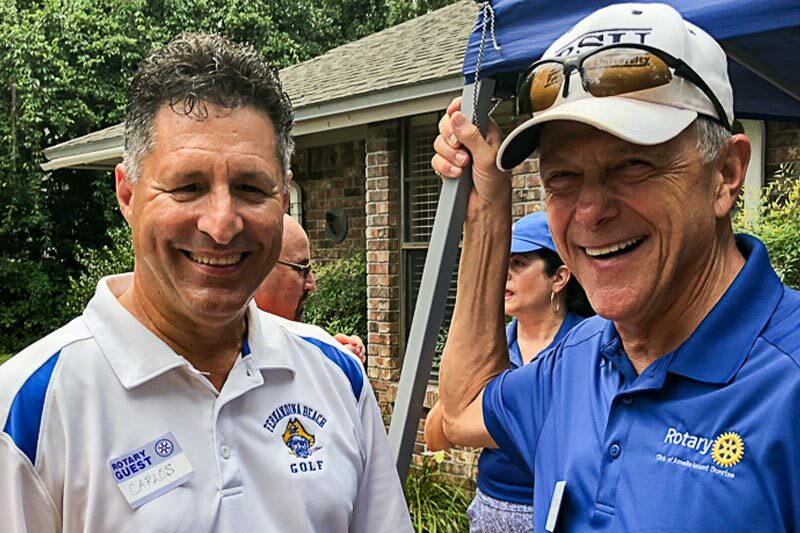 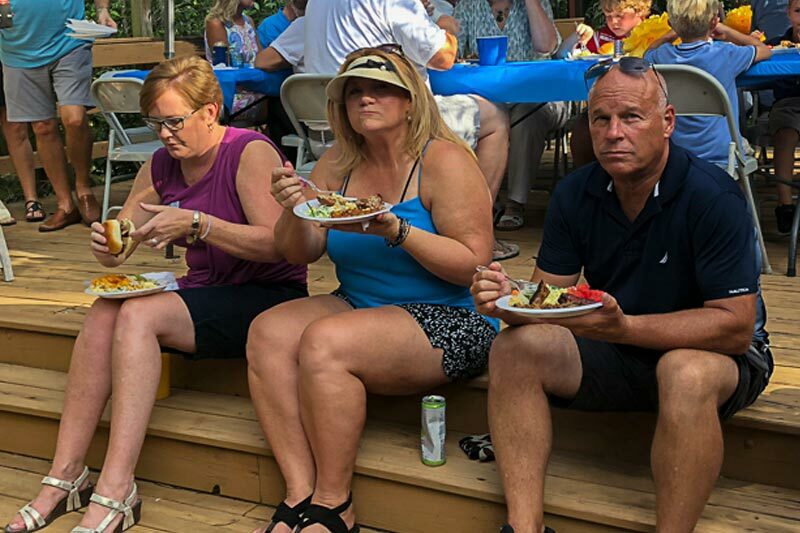 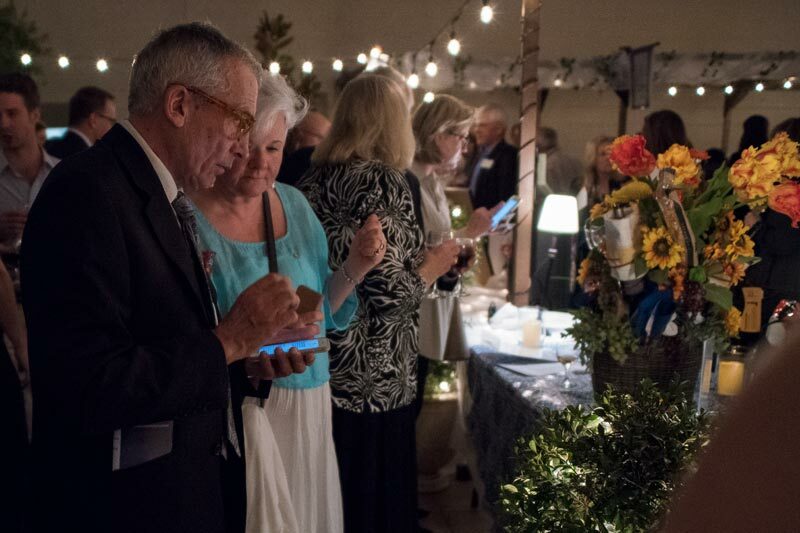 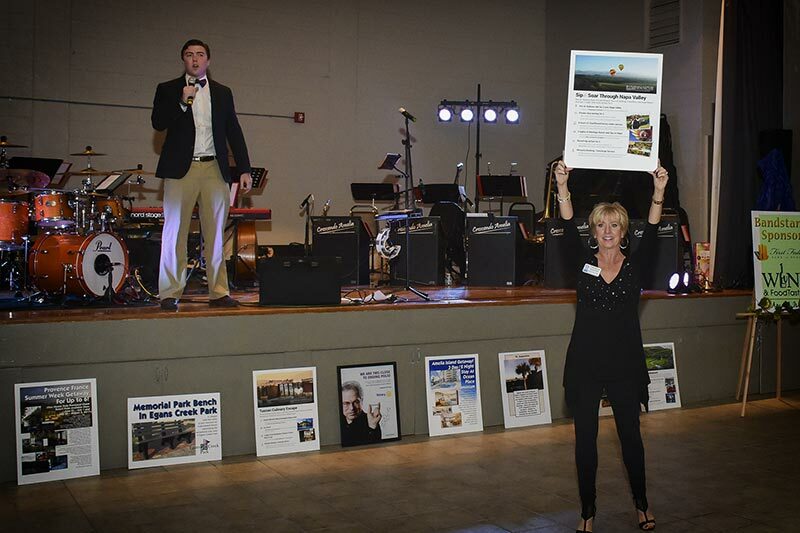 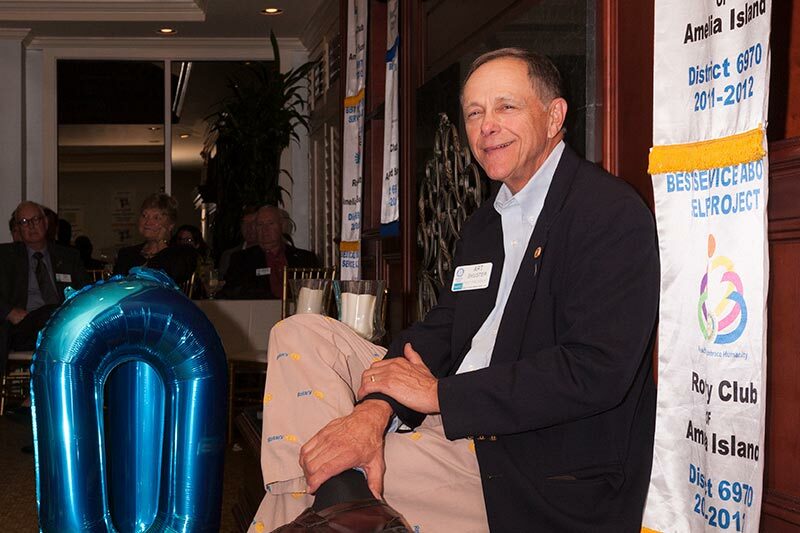 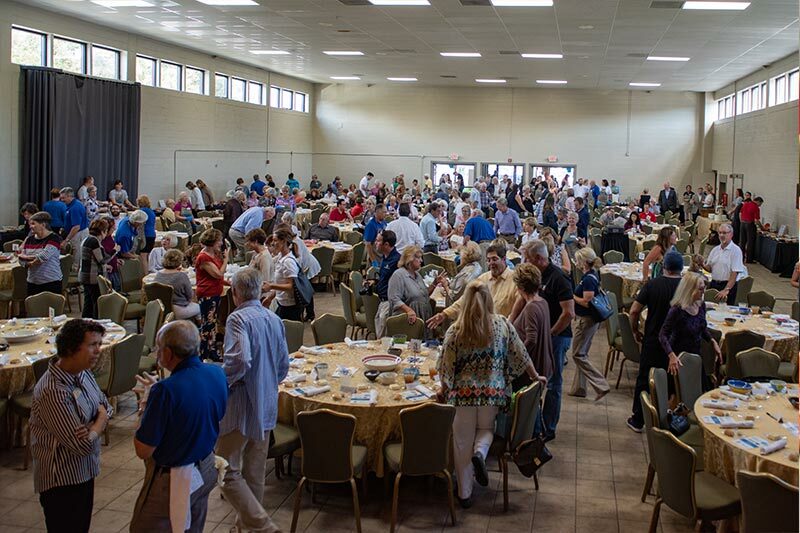 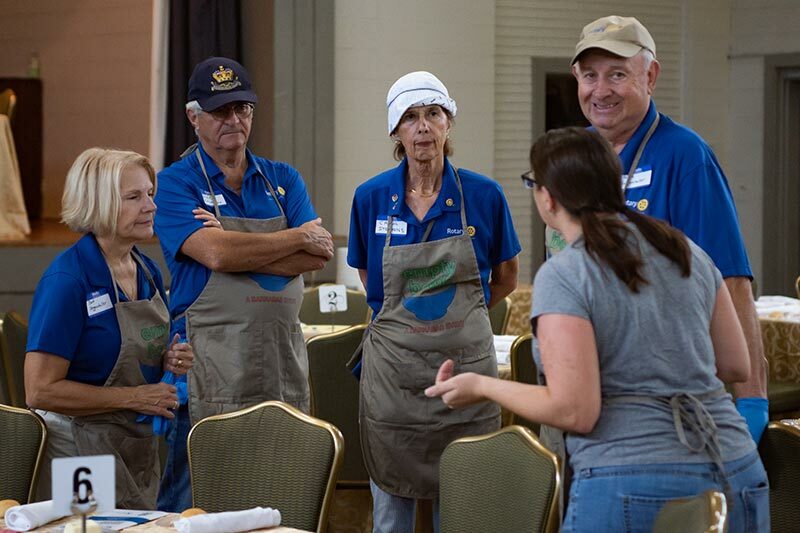 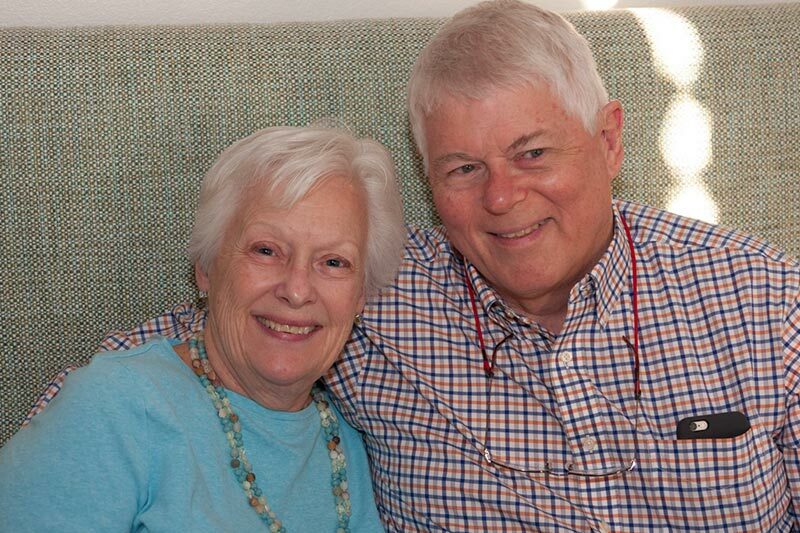 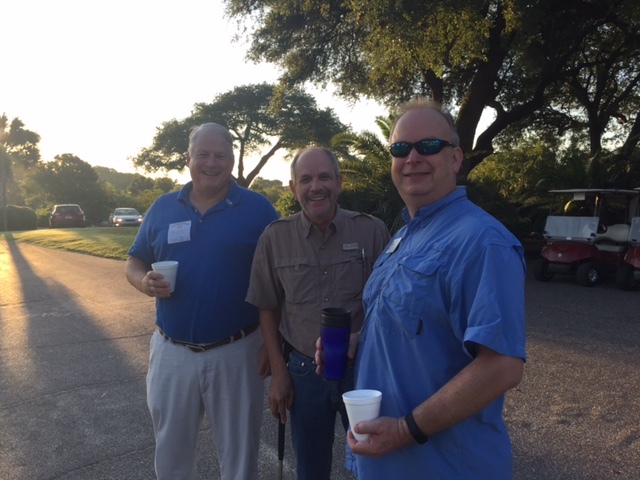 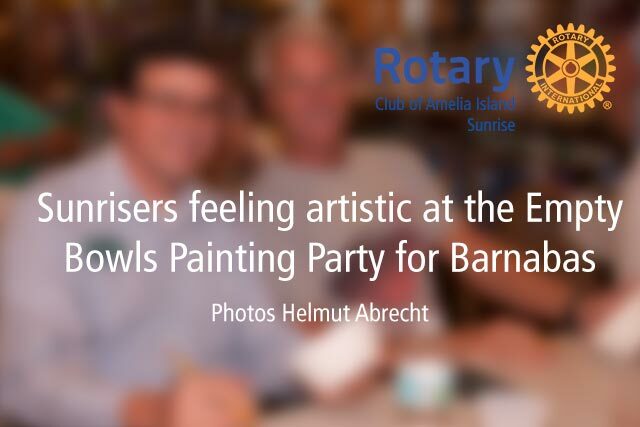 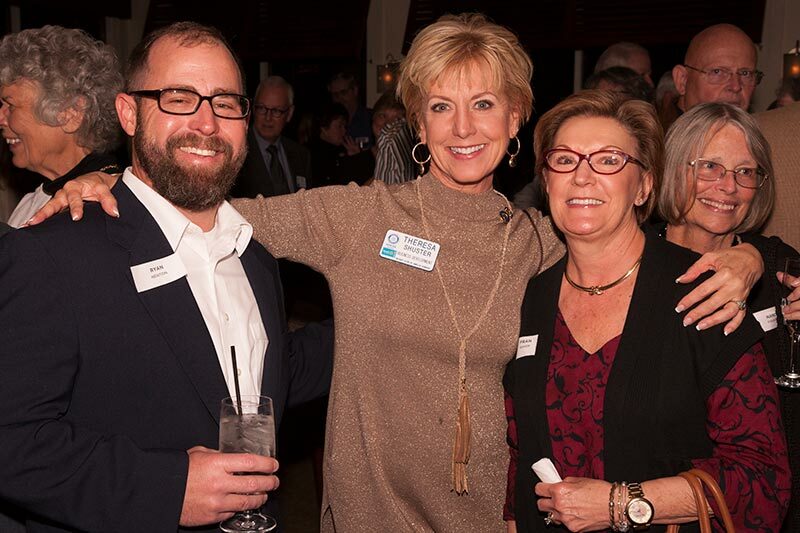 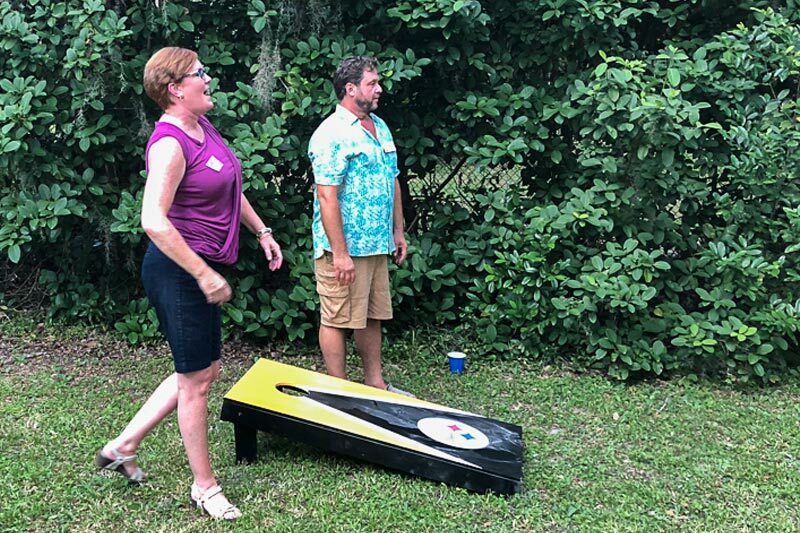 Members of the Rotary Club of Amelia Island were very active at this signature Barnabas event. 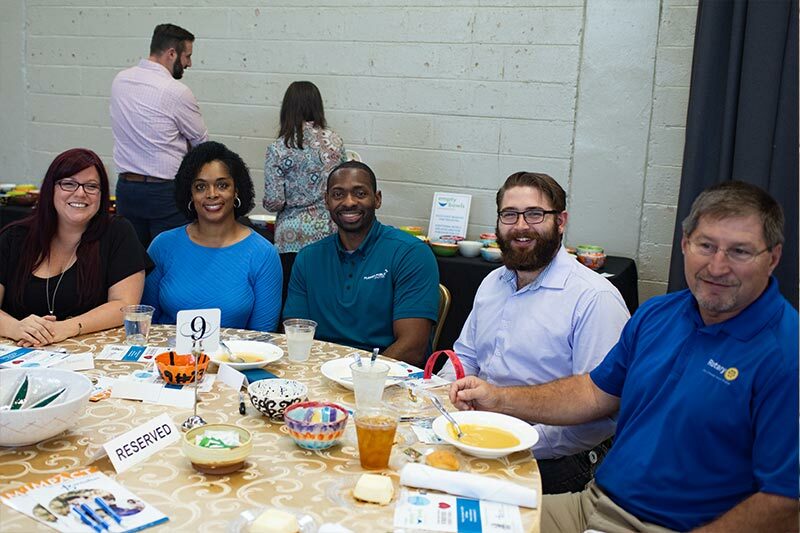 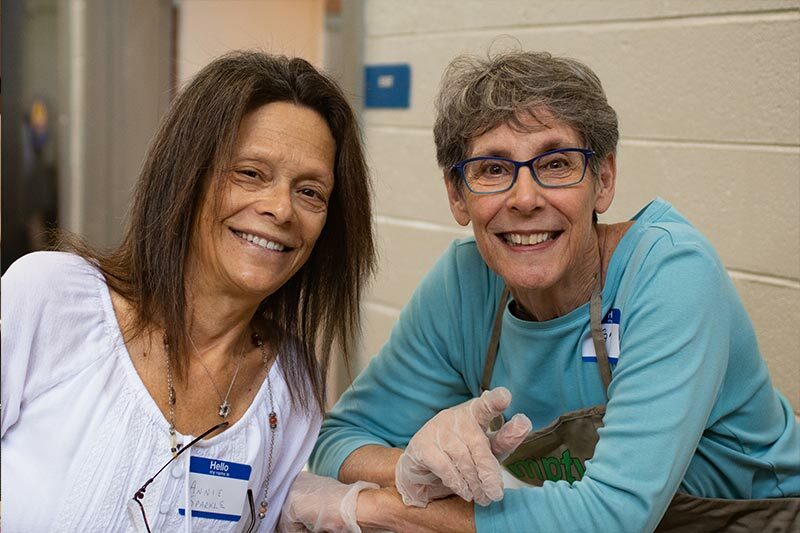 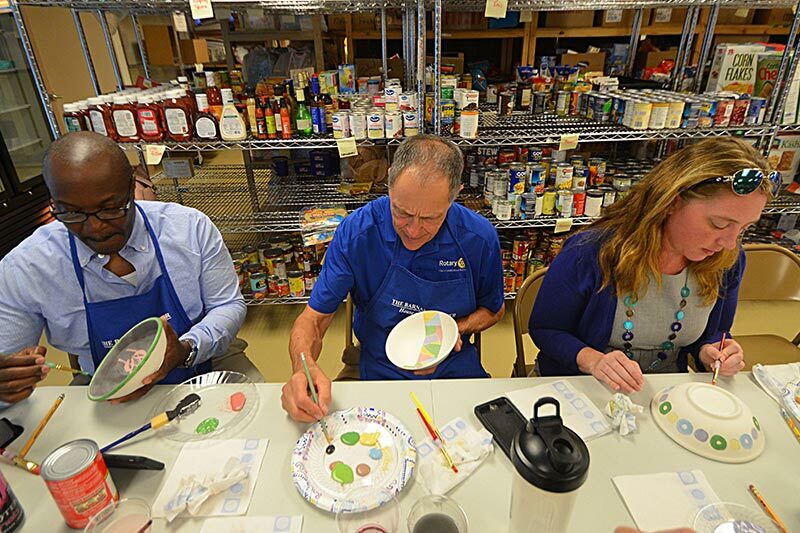 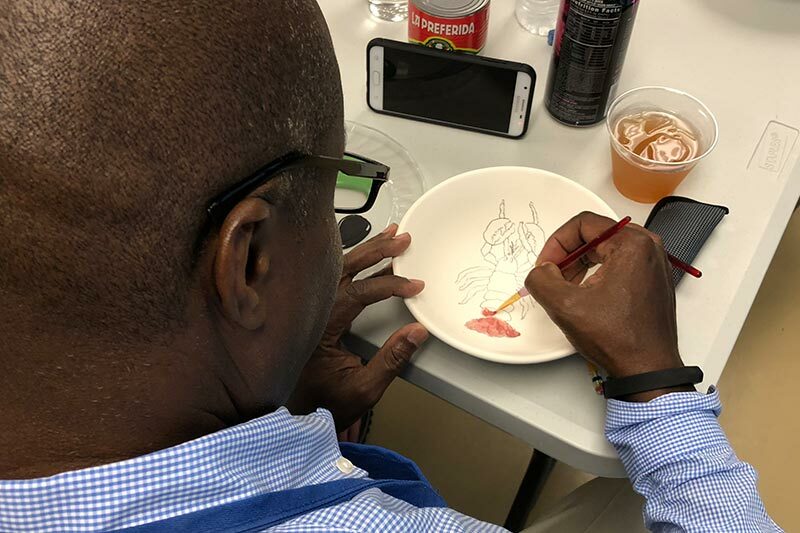 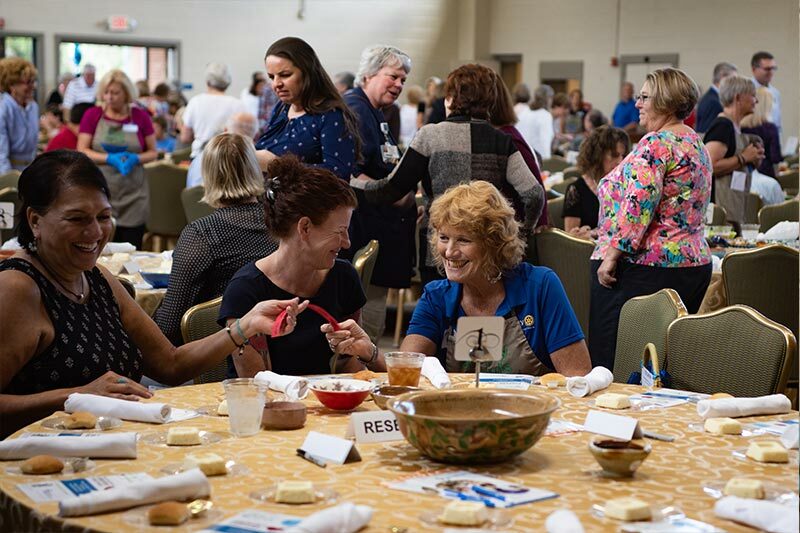 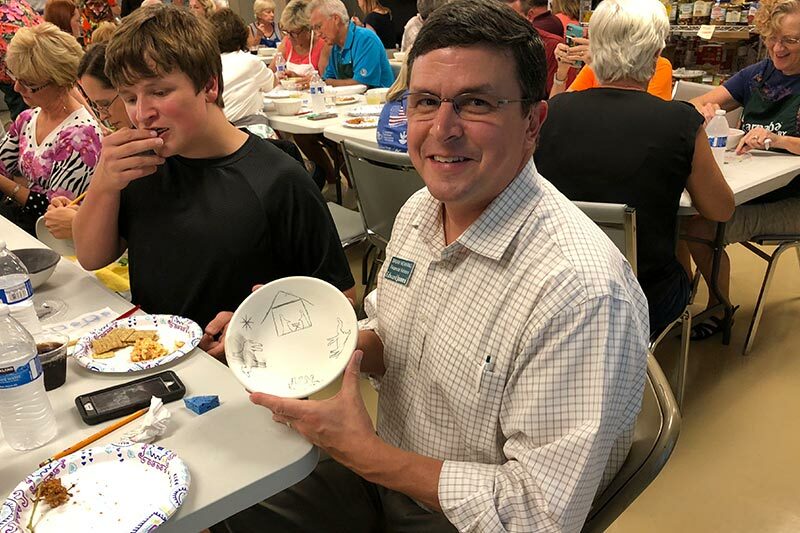 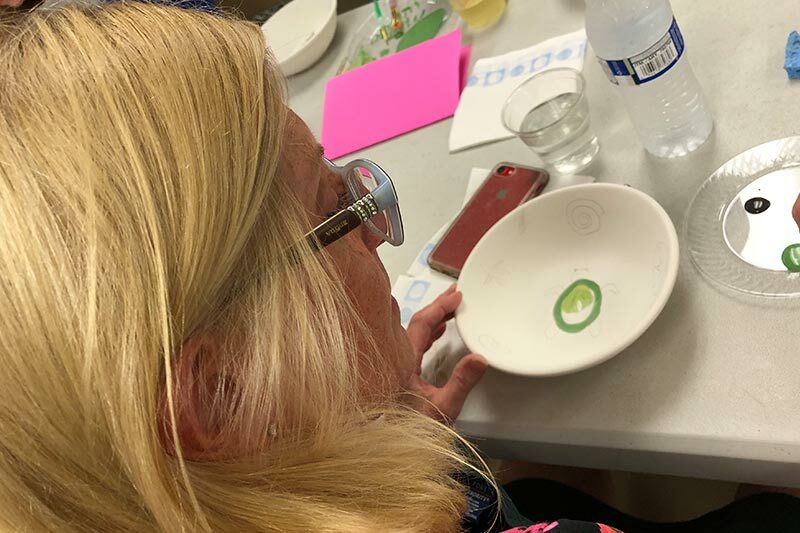 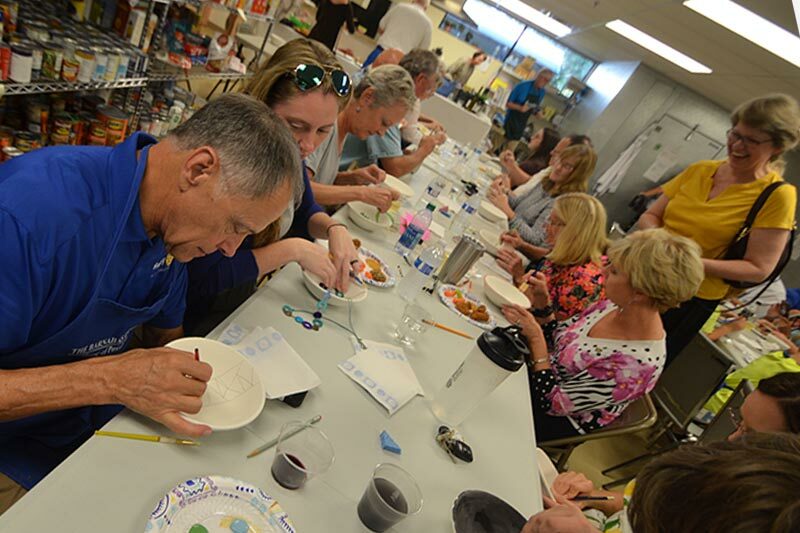 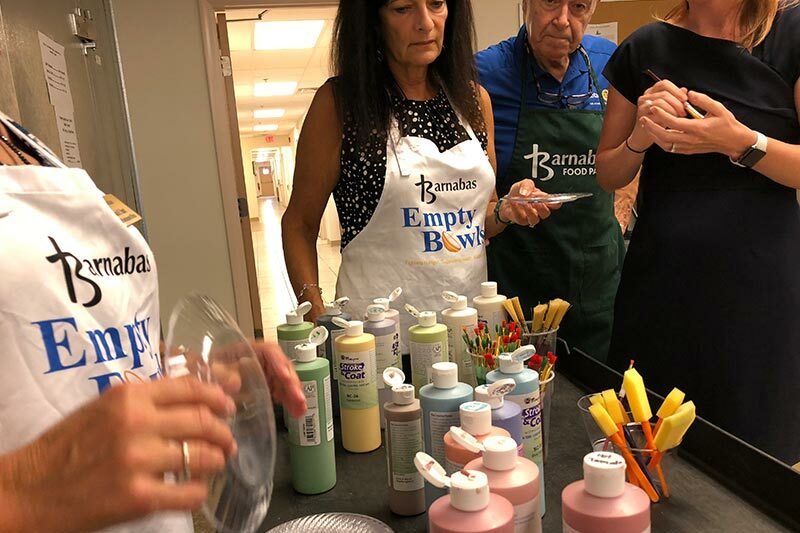 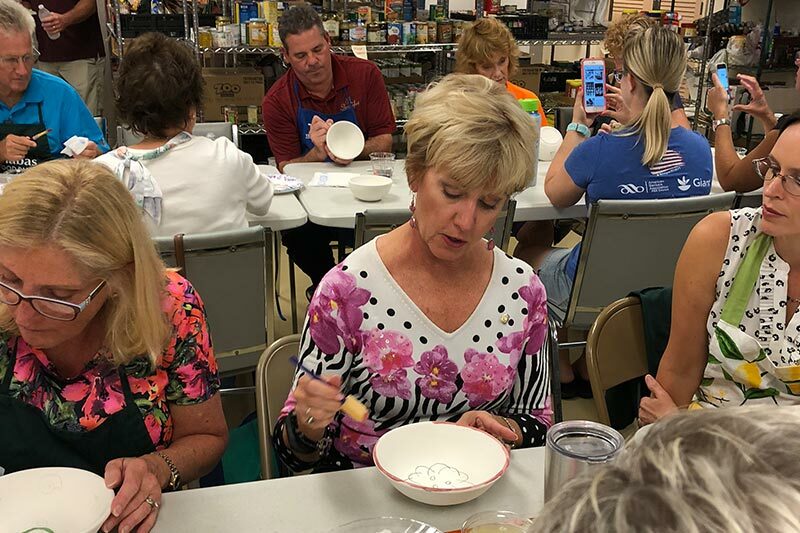 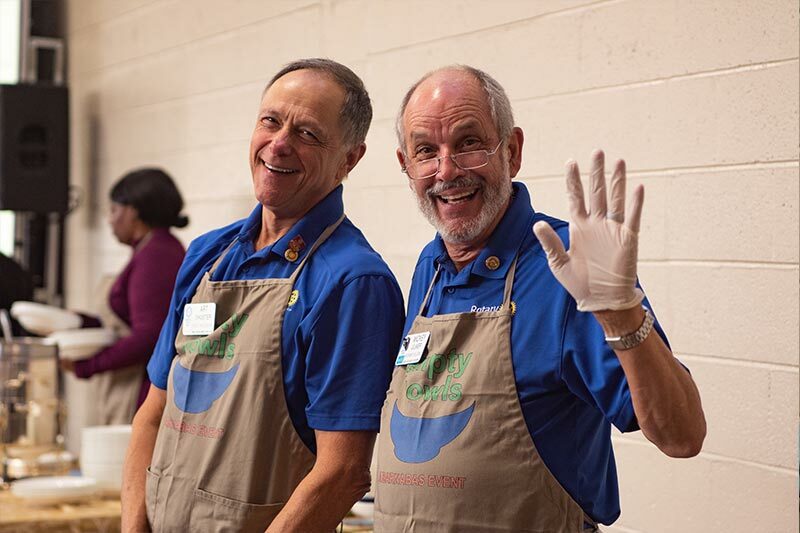 They painted bowl prior to the main event and actively participated at the luncheon November 9, 2018. 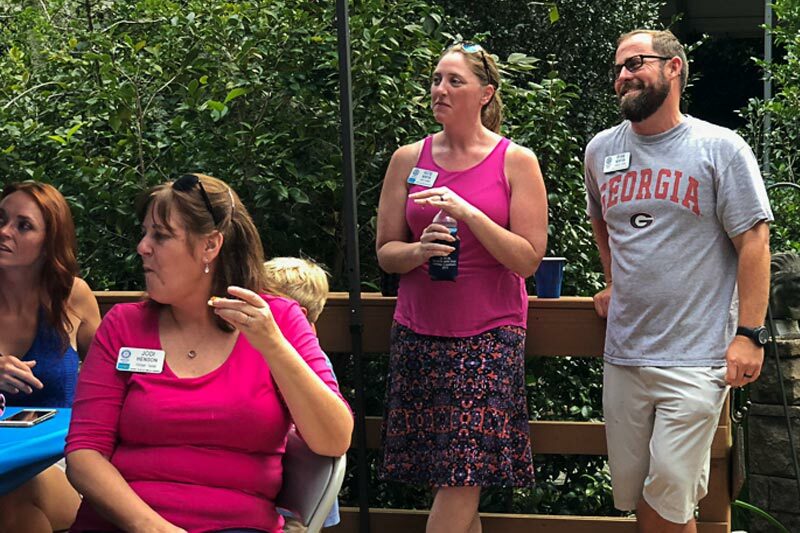 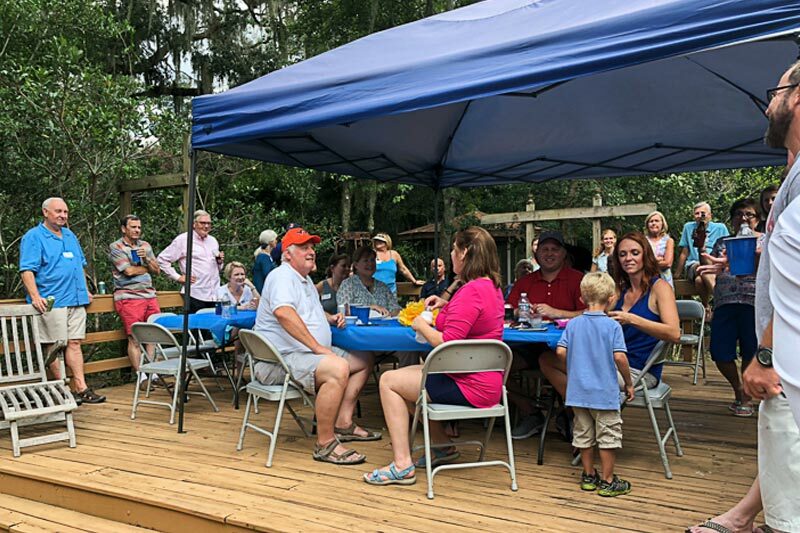 Everyone was invited at Katie's house for this BBQ Social and lots of fellowship. 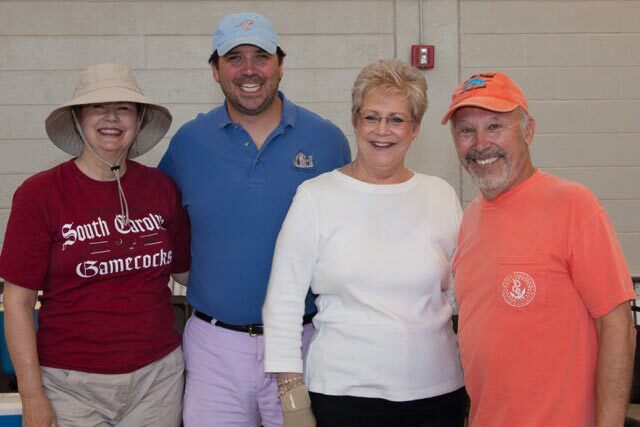 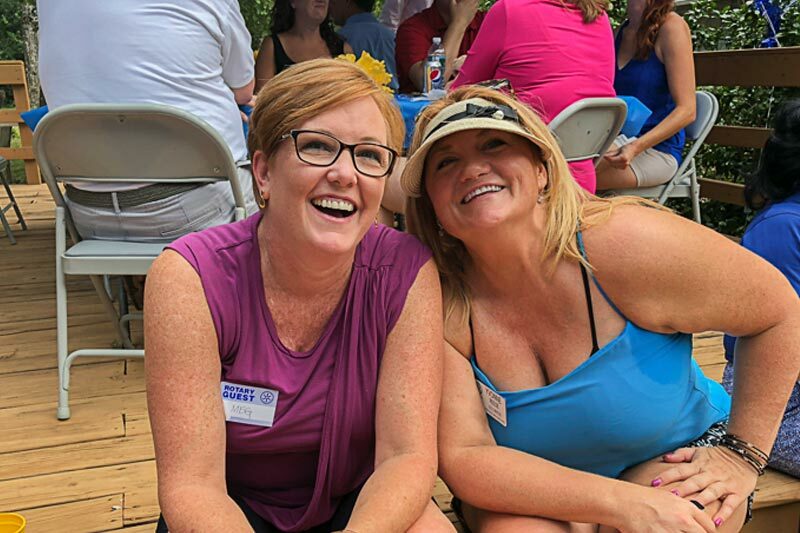 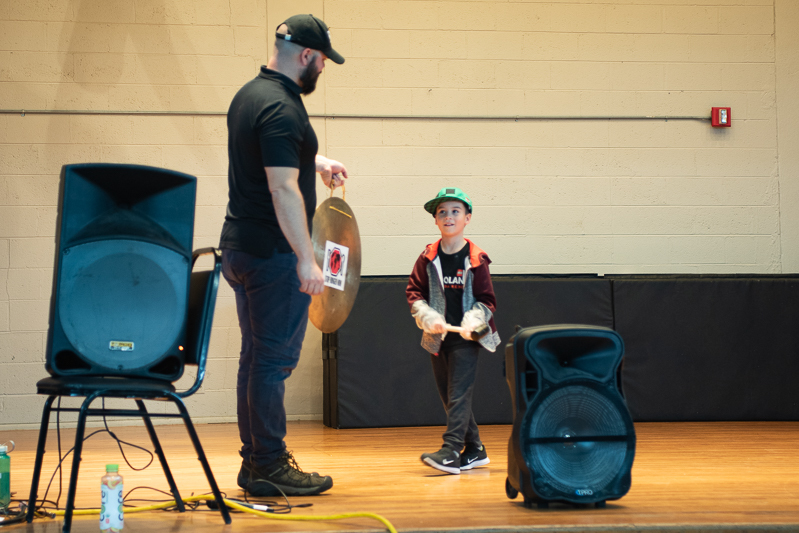 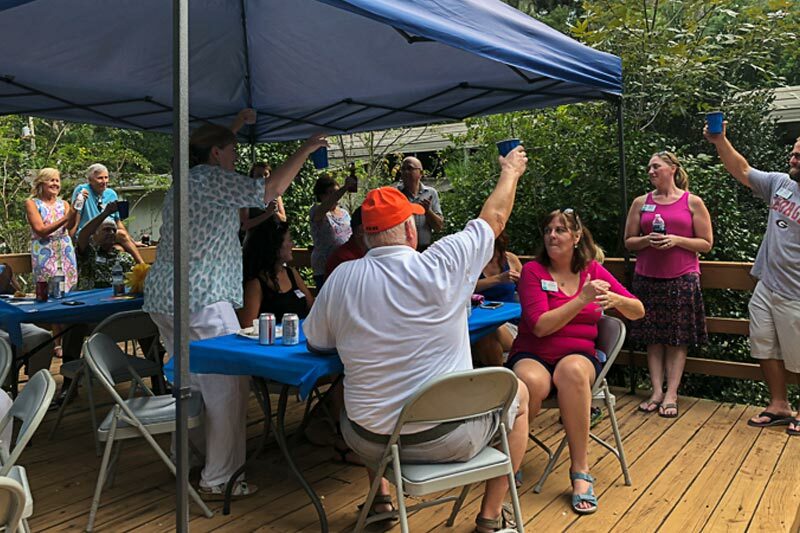 Families and prospective members were also invited to this fun event. 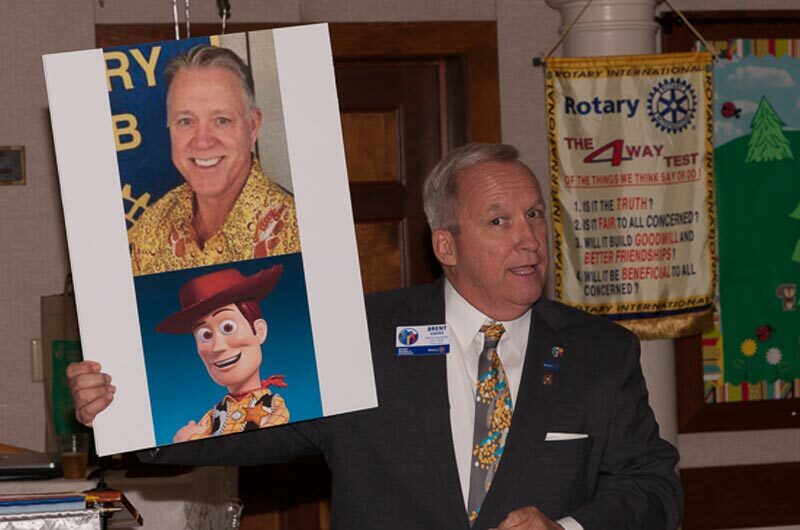 Thank you Katie for doing this. 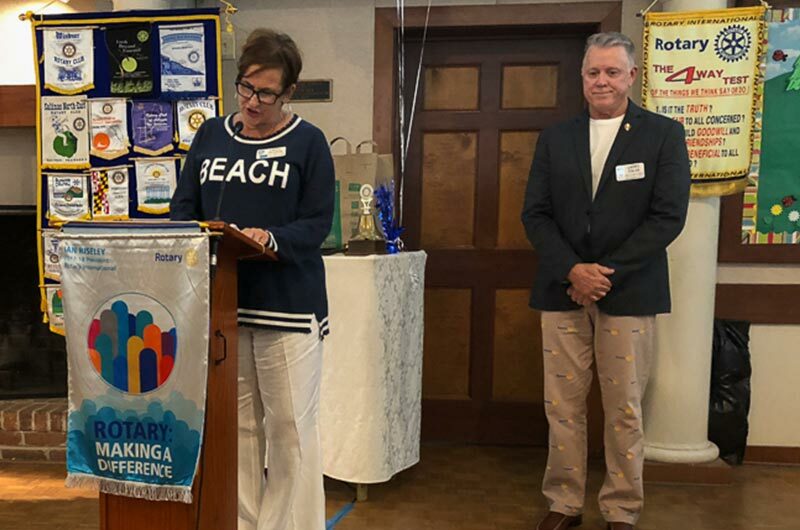 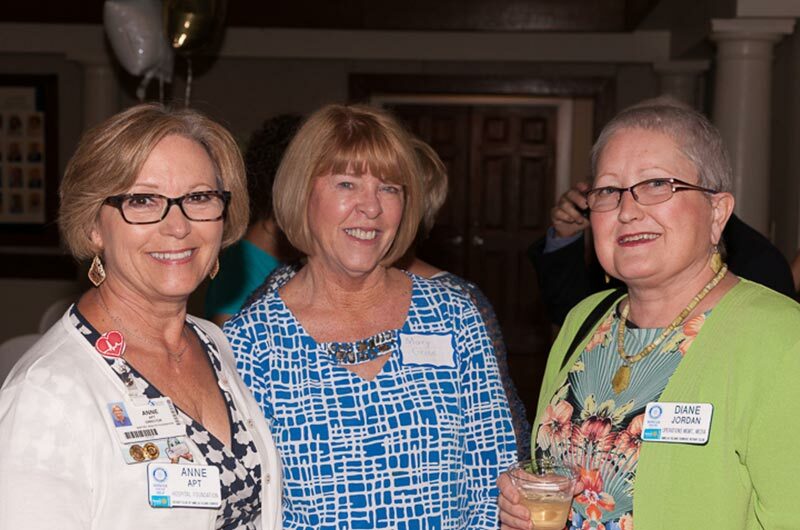 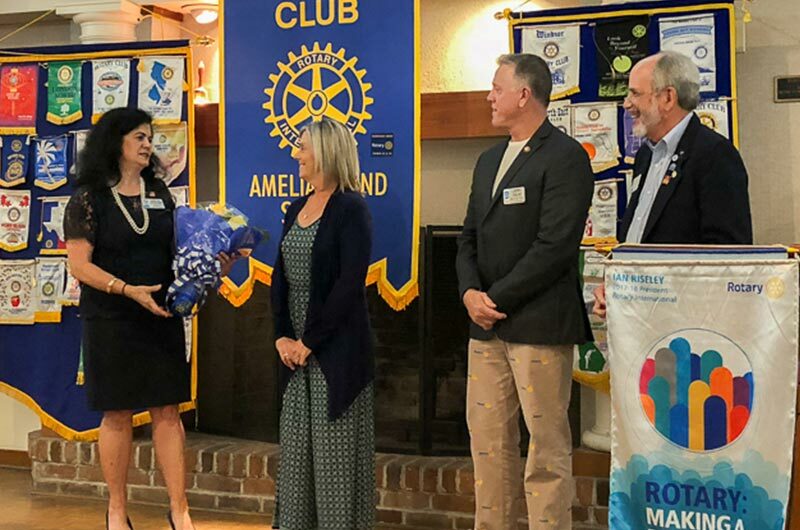 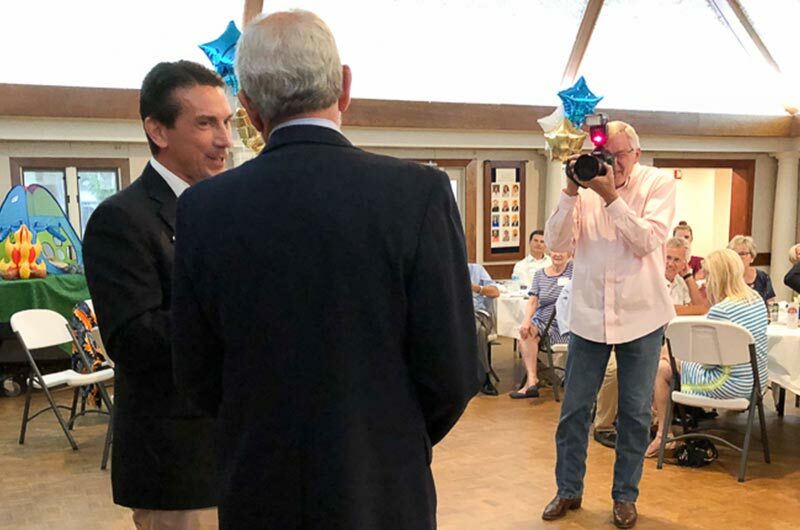 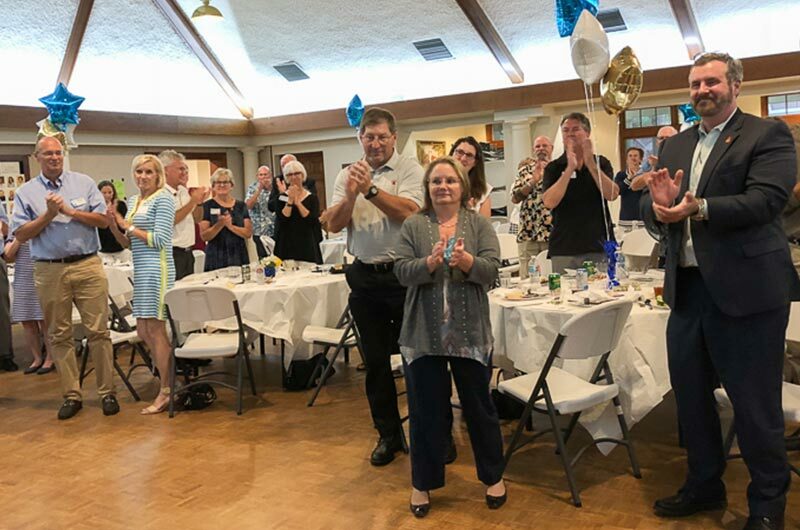 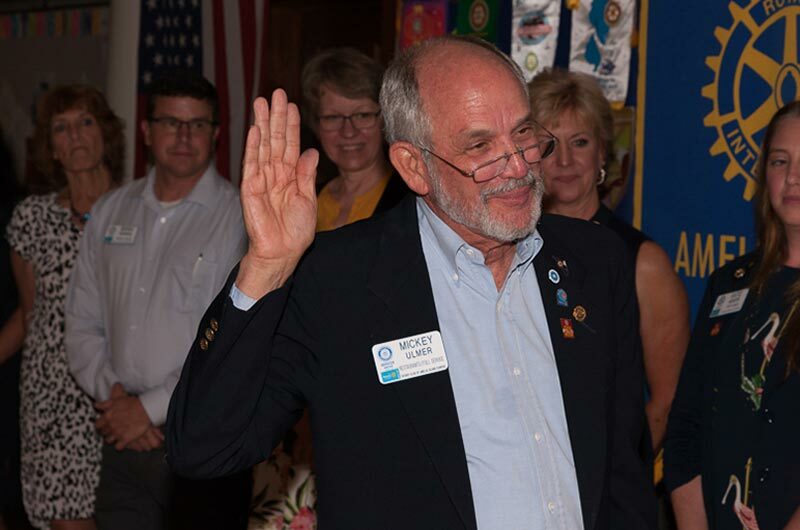 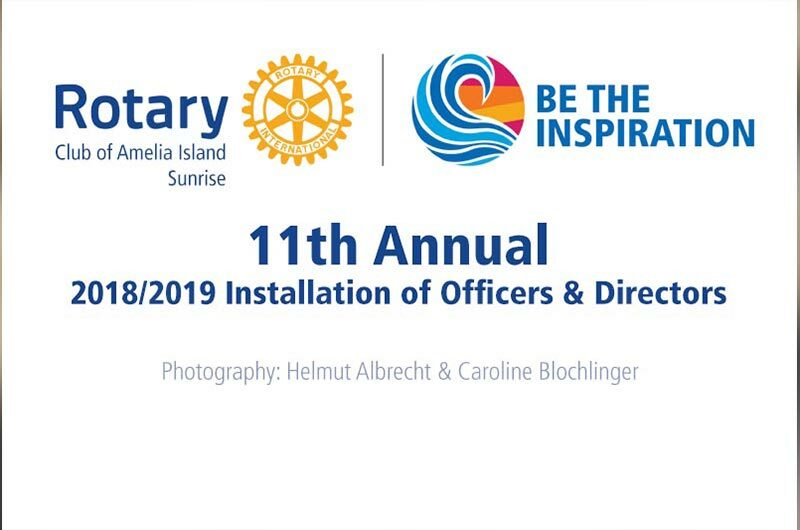 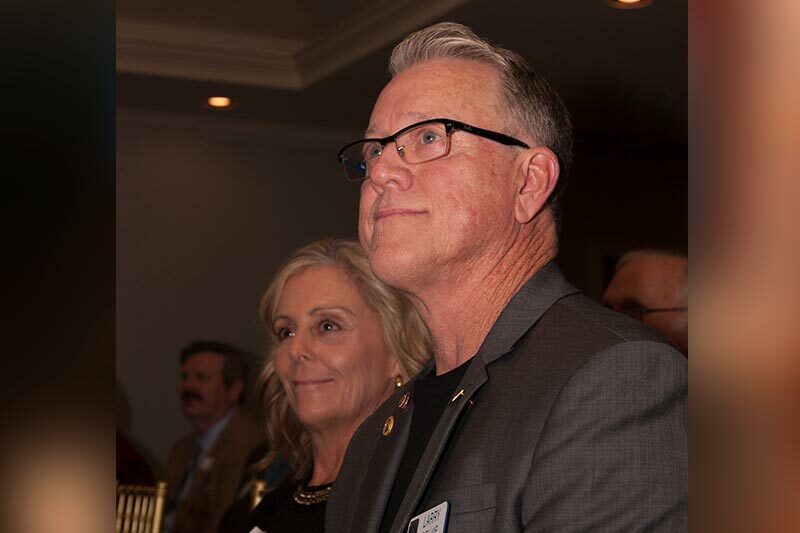 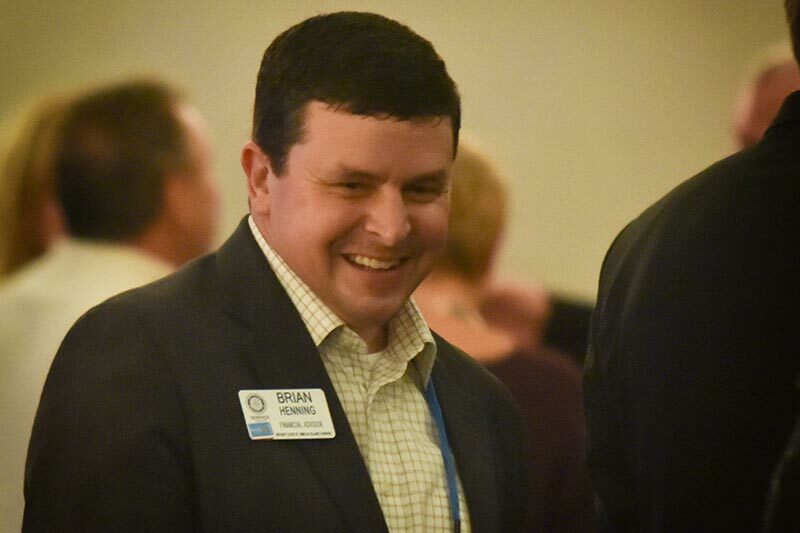 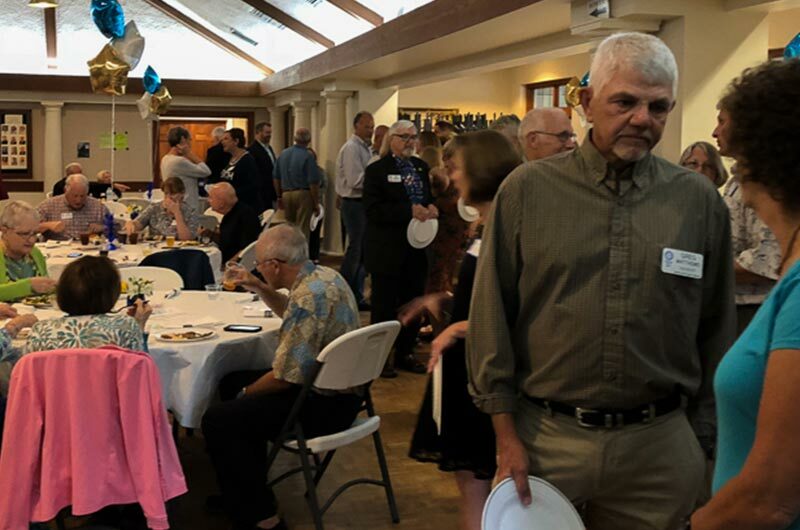 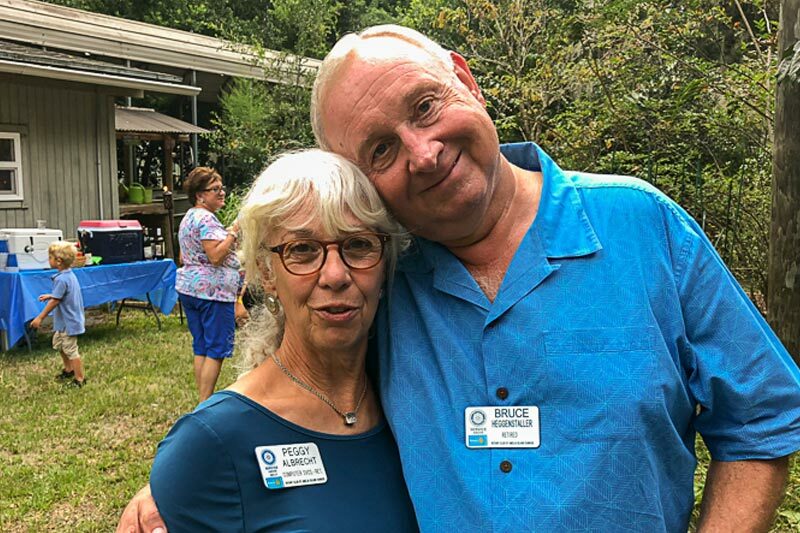 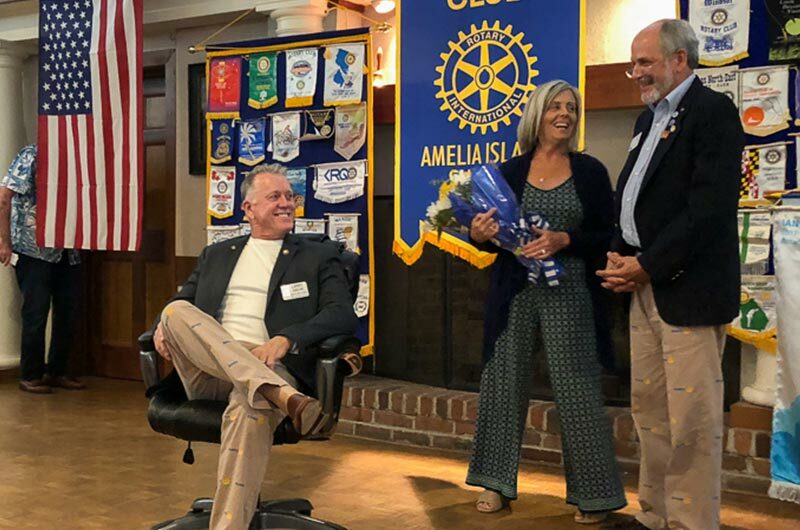 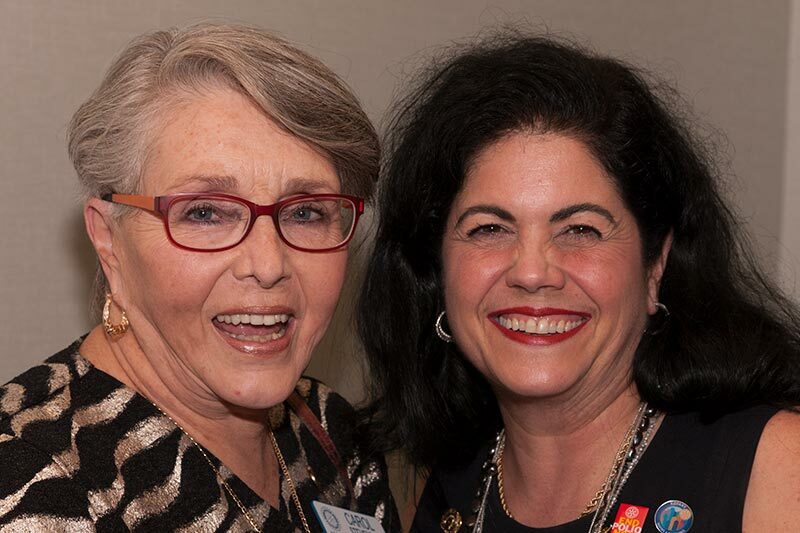 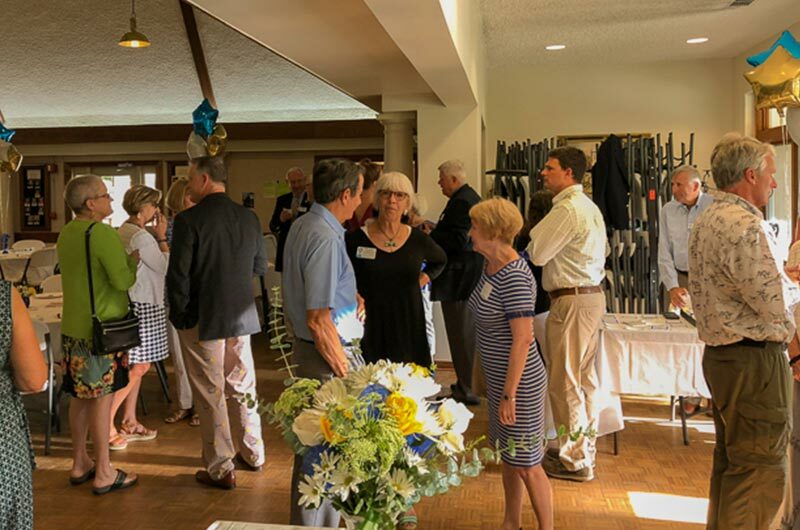 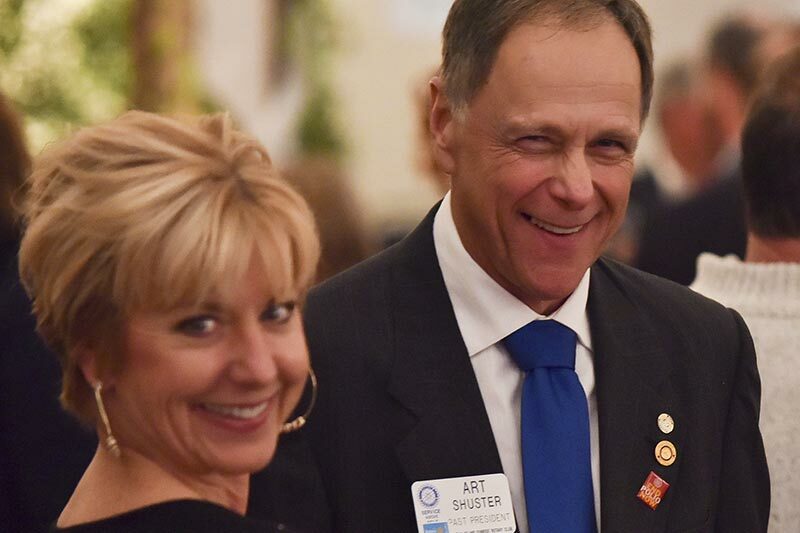 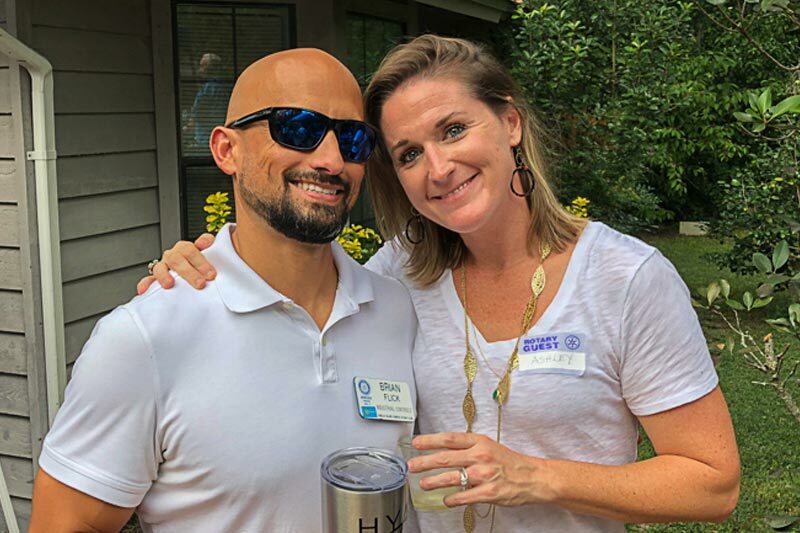 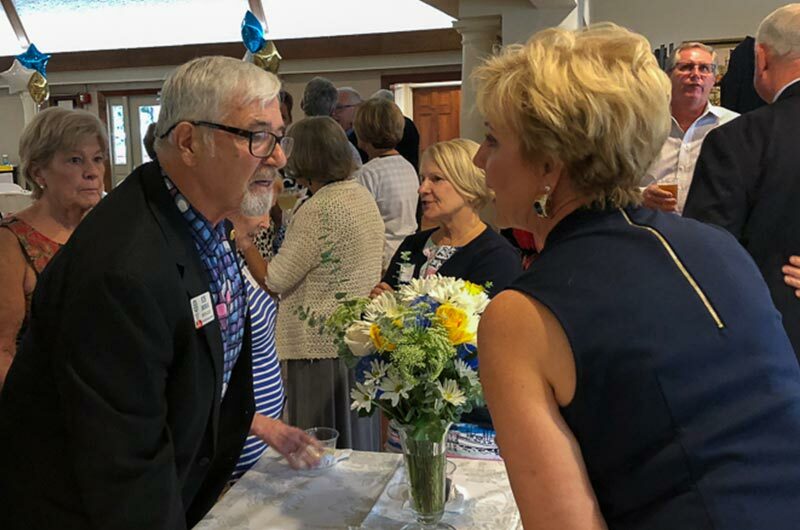 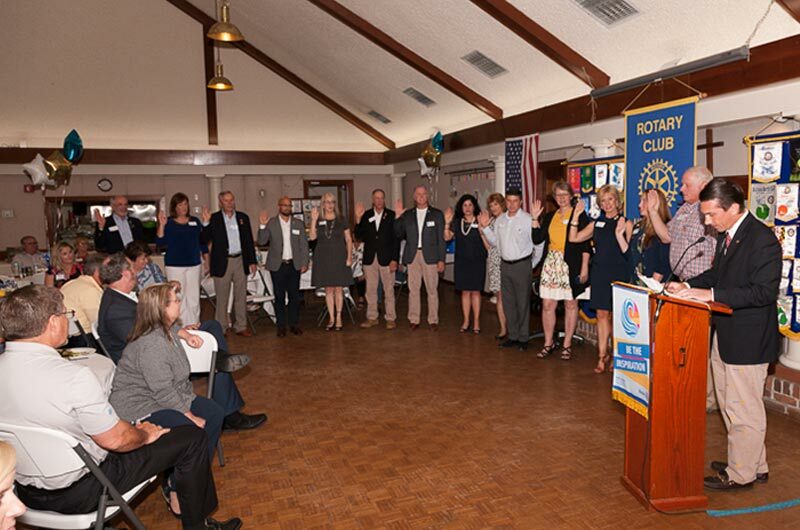 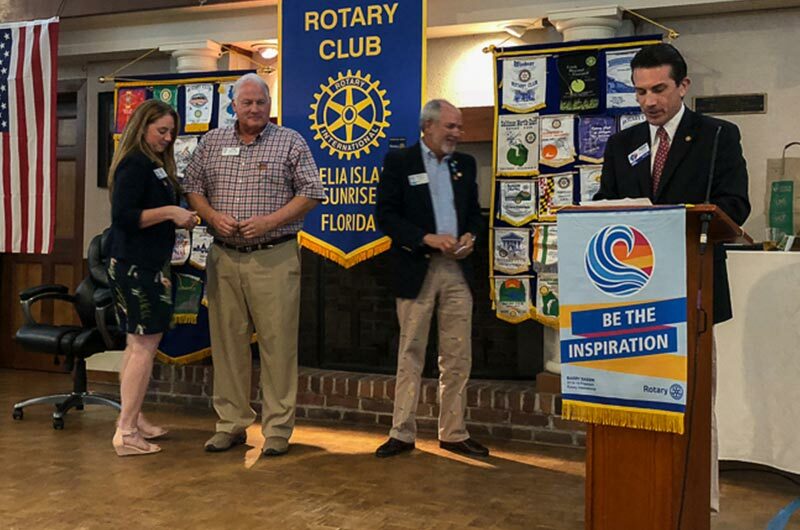 June 15, 2018 the Rotary Club of Amelia Island held its 11th annual installation of officers and directors. 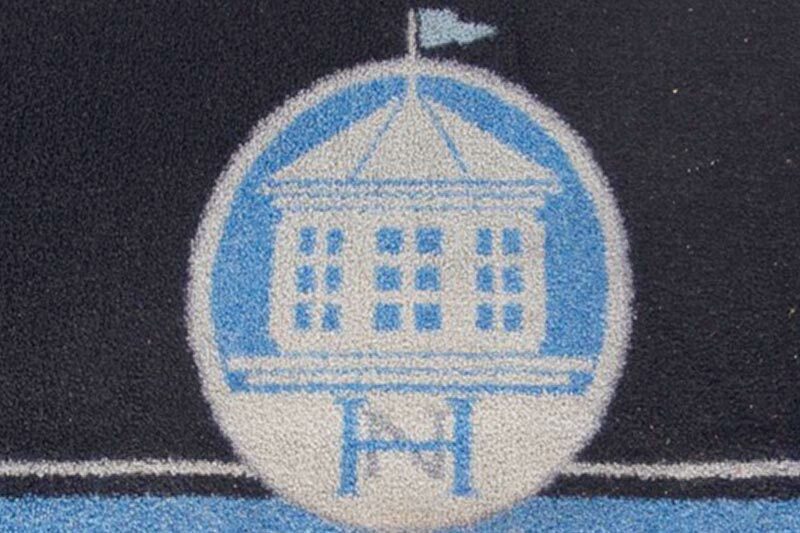 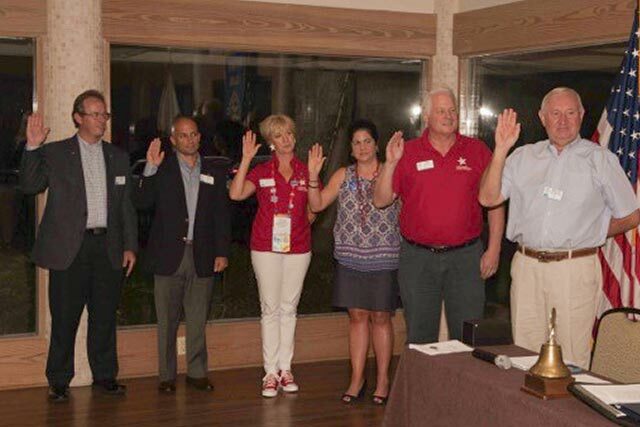 We are looking forward to yet another exciting year under President Mickey Ulmer and his leadership team. 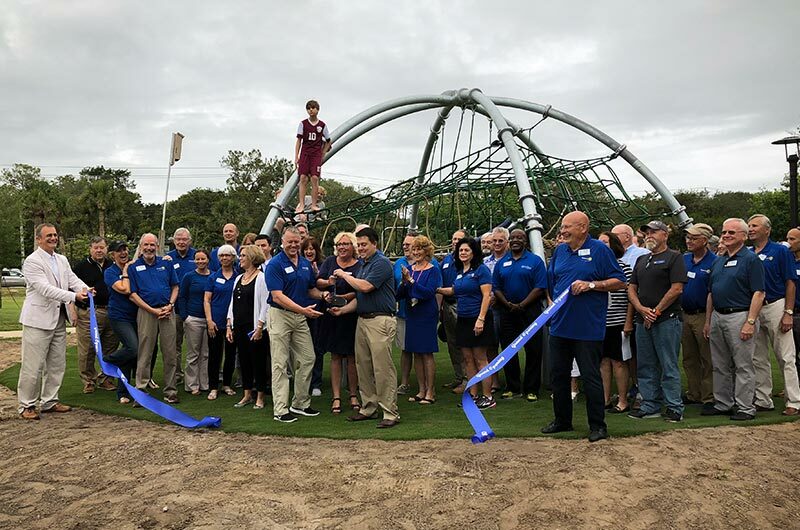 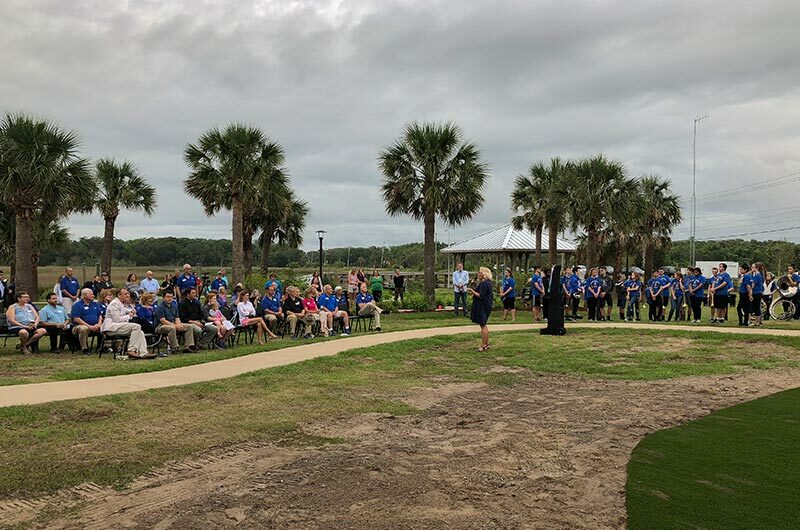 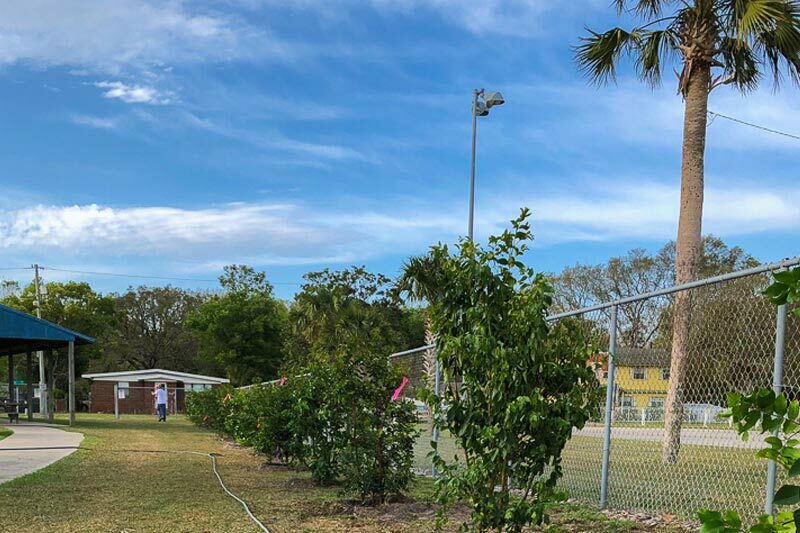 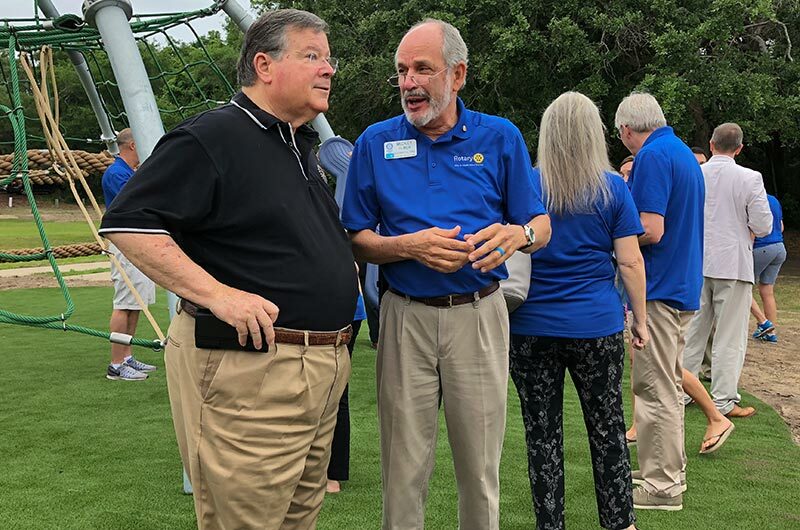 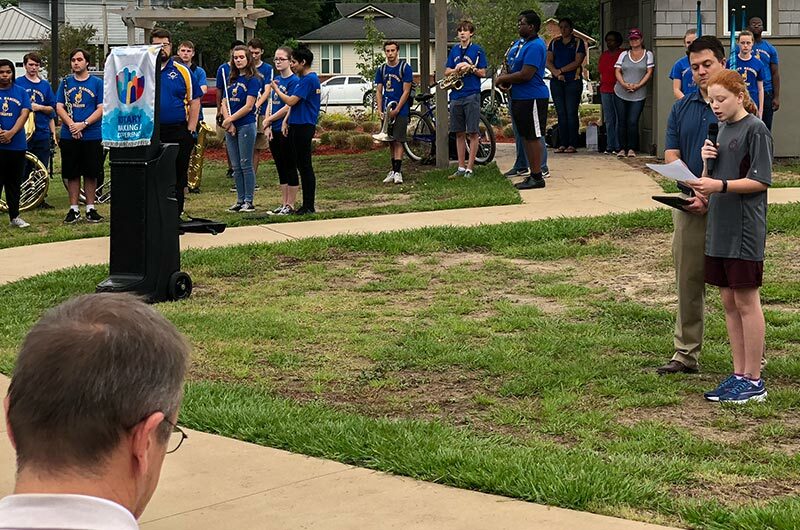 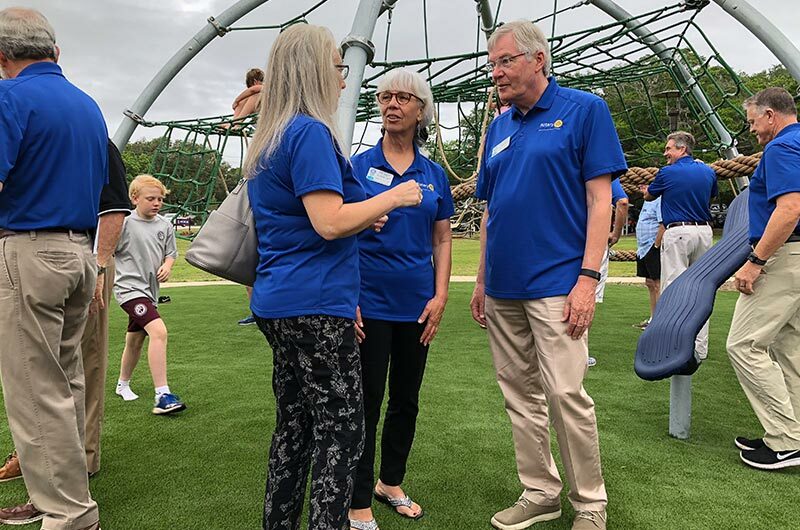 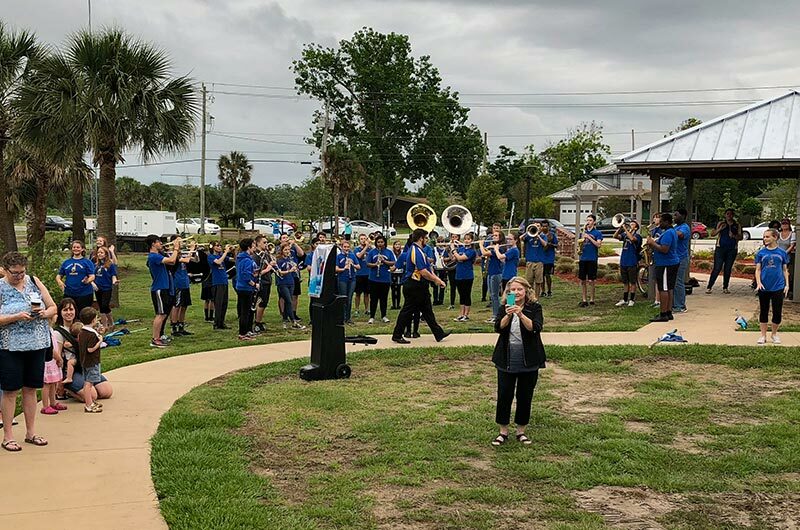 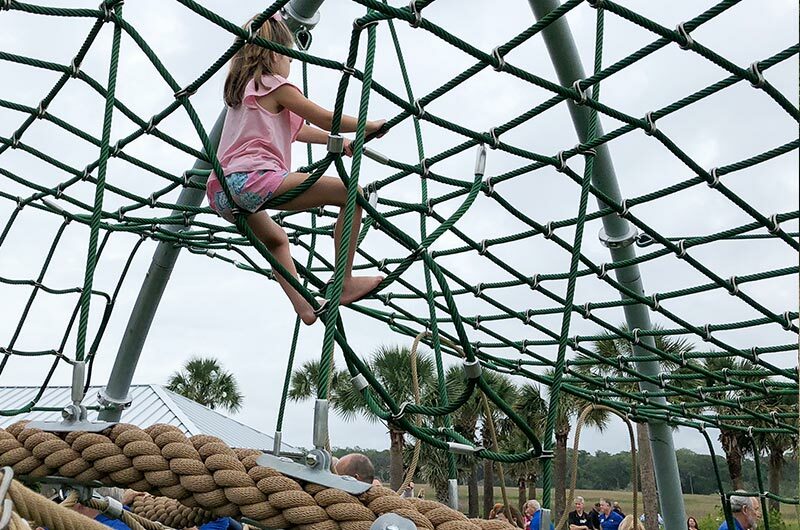 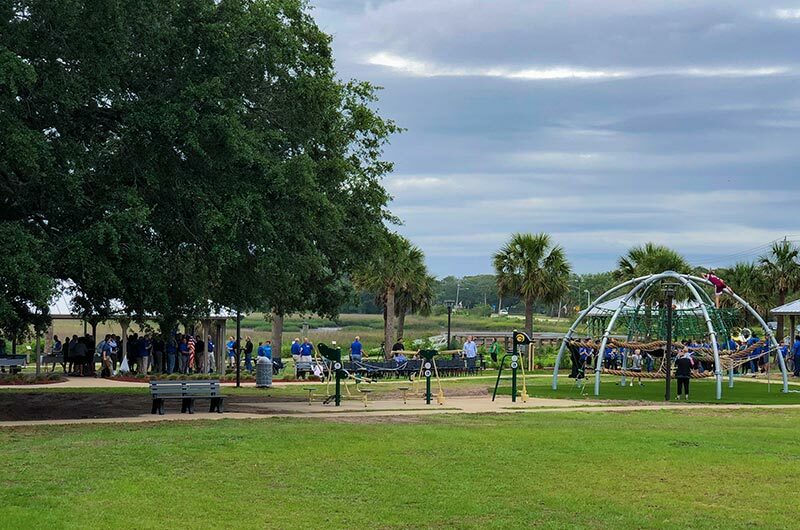 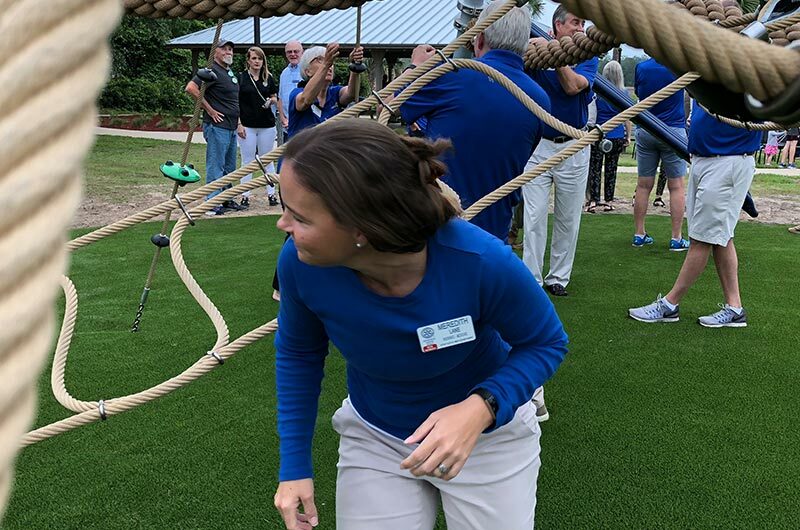 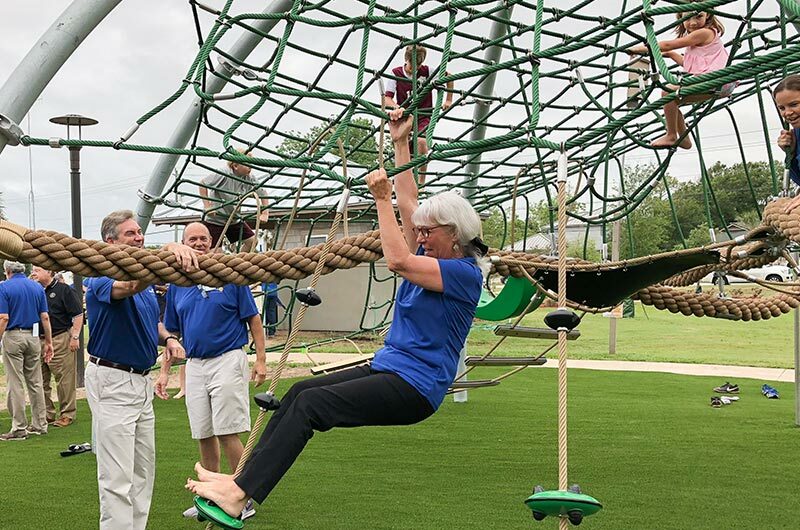 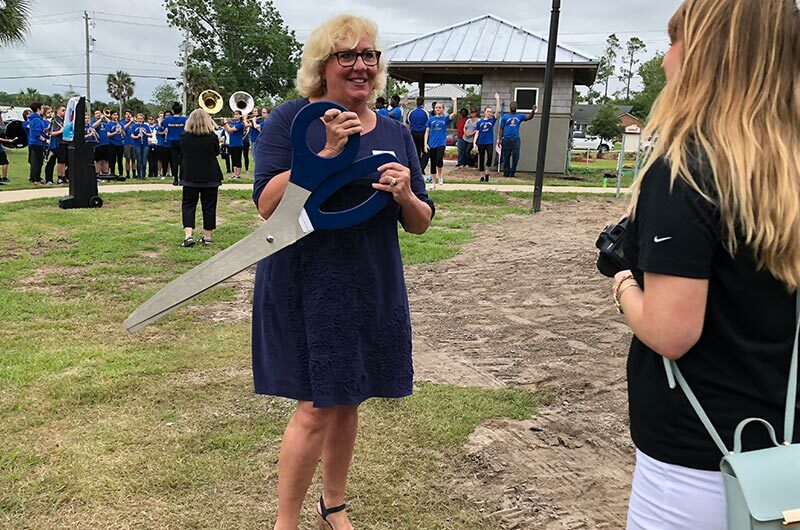 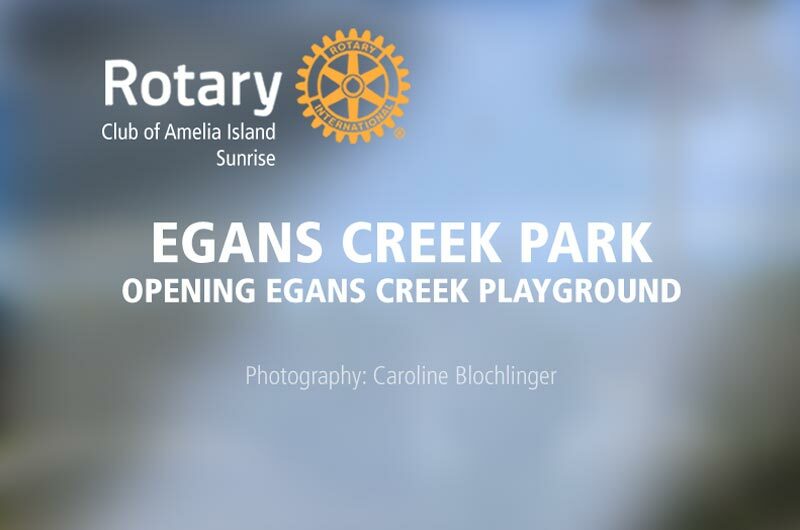 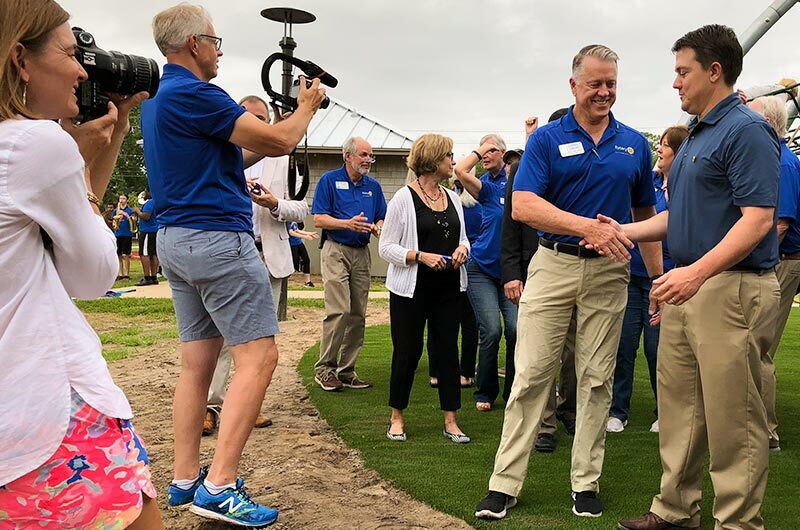 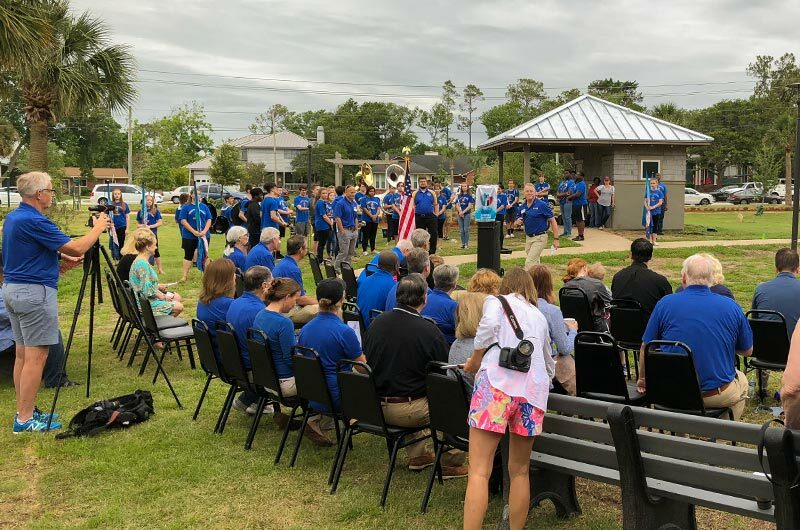 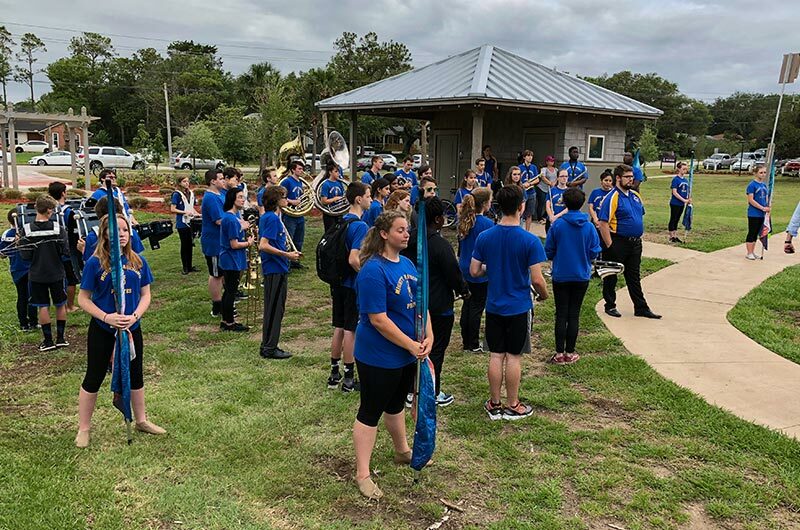 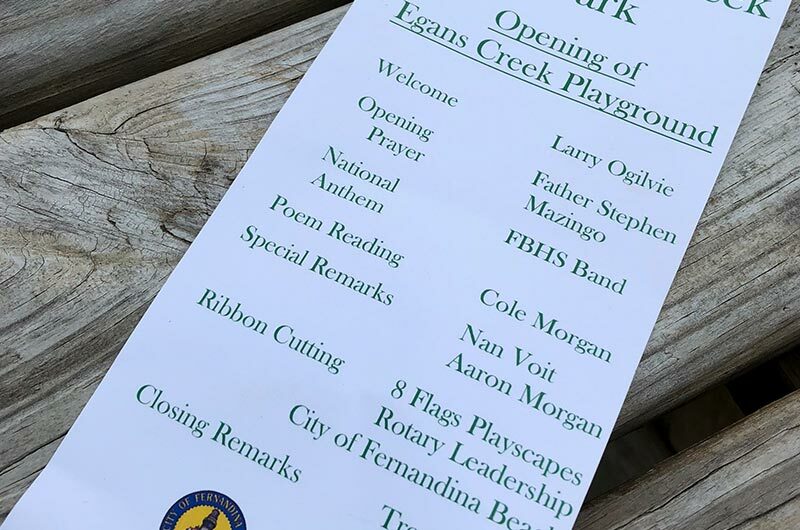 May 18, 2018 was the opening and dedication of the playground structure at Egan’s Creek Park. 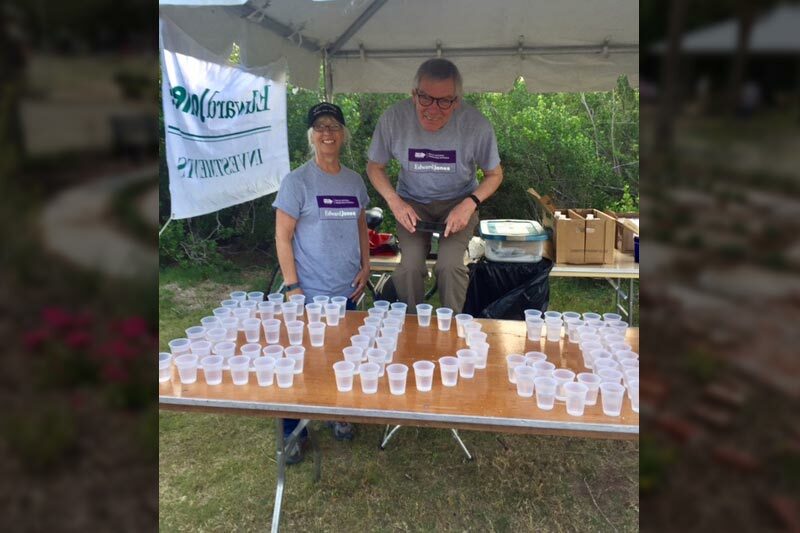 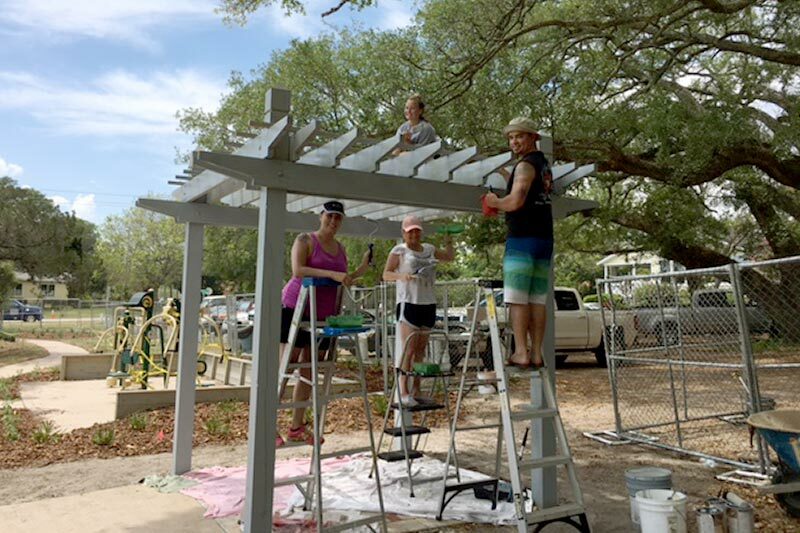 This project was funded in 2017 by our club with proceeds of the Wine & Food Tasting. 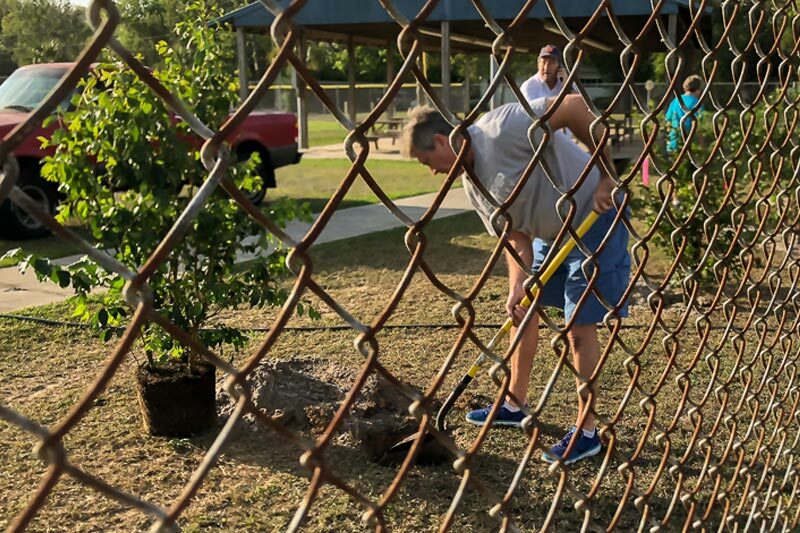 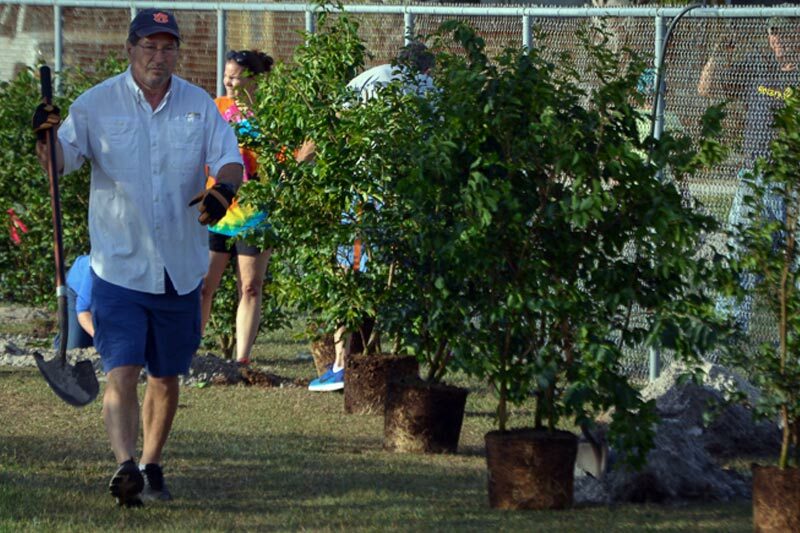 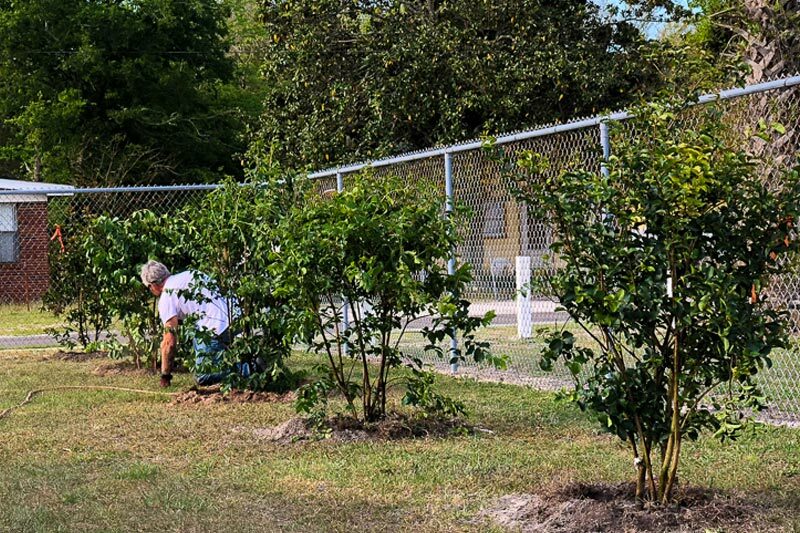 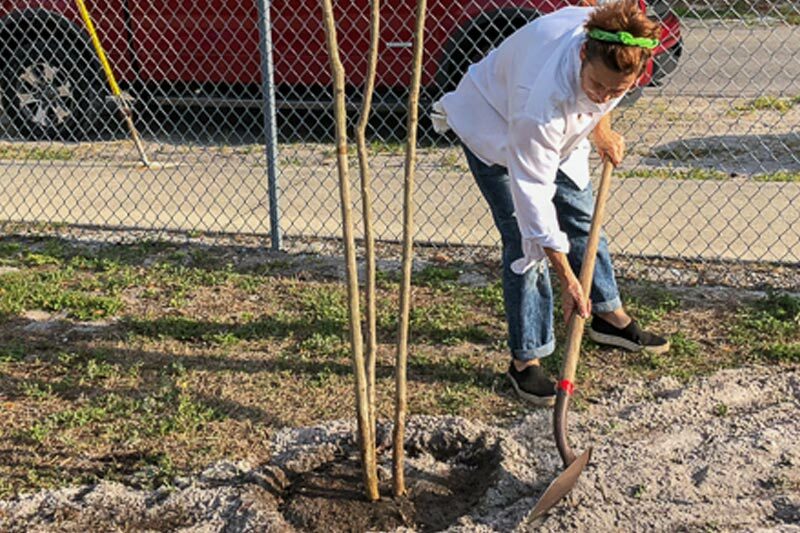 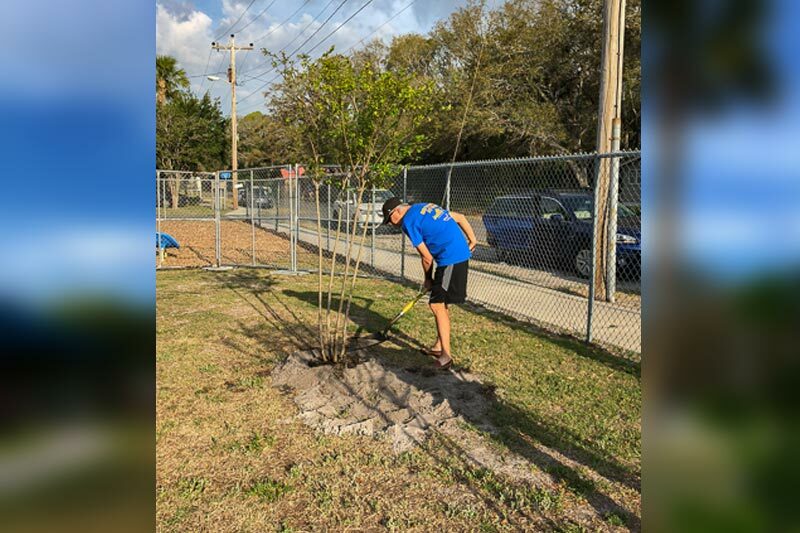 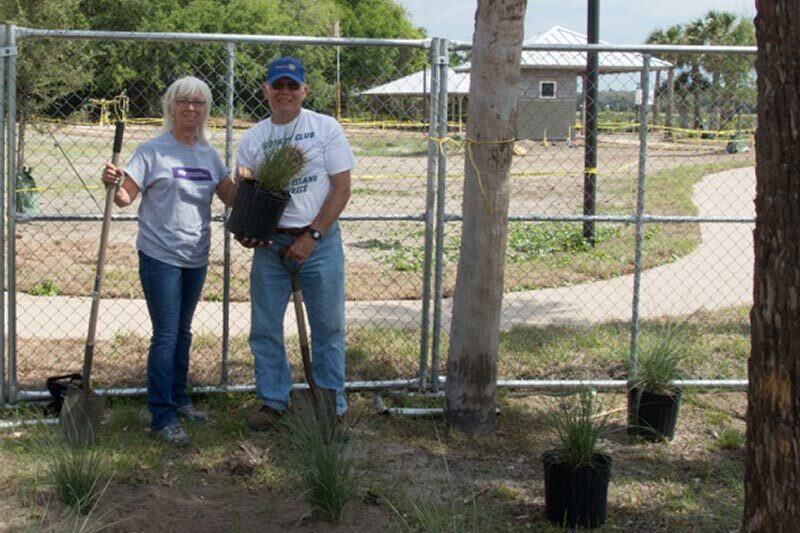 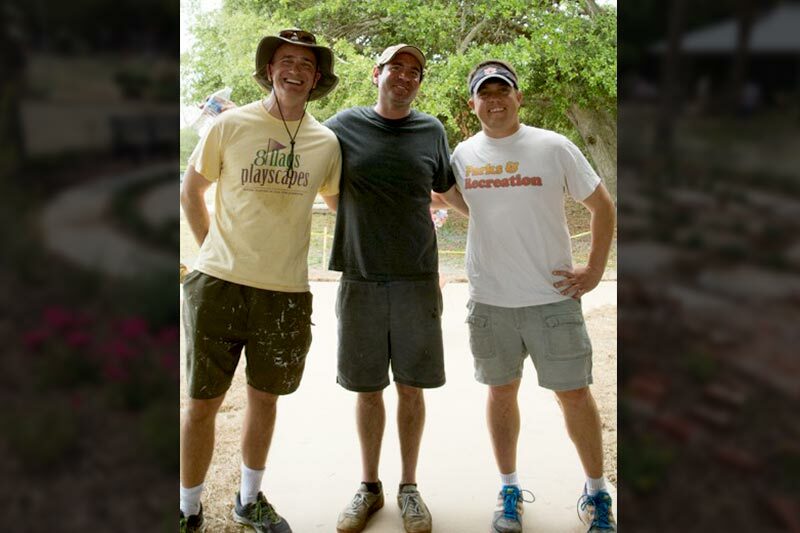 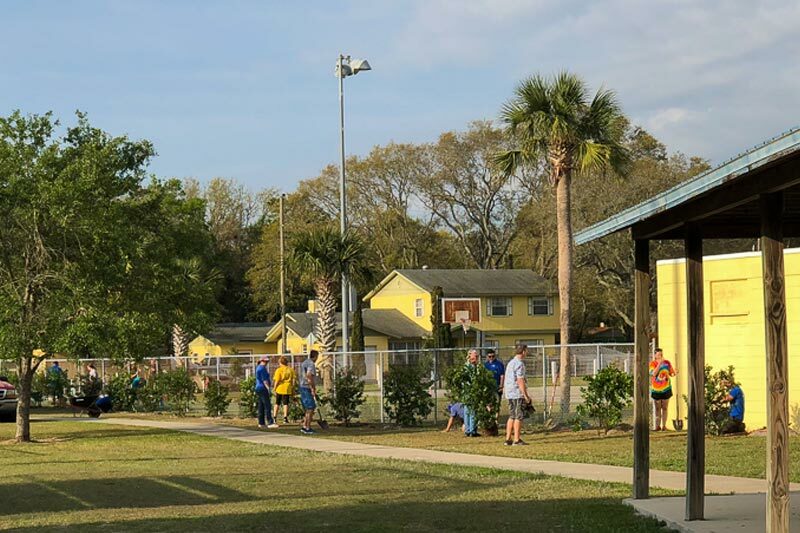 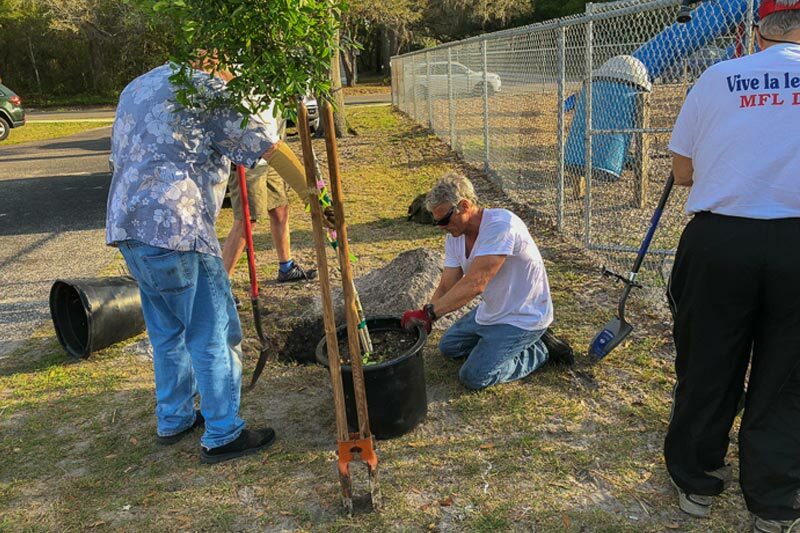 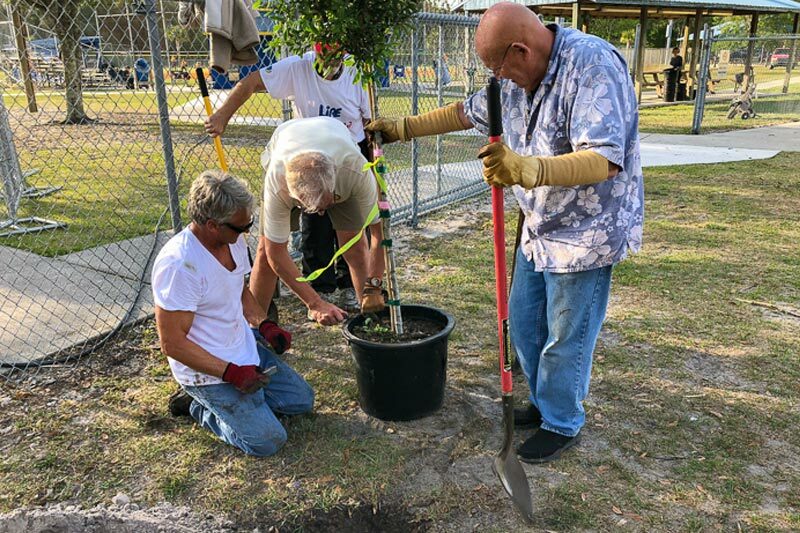 Our club made a difference by planting 4 live oaks and 26 crape myrtles at the Elm Street park. 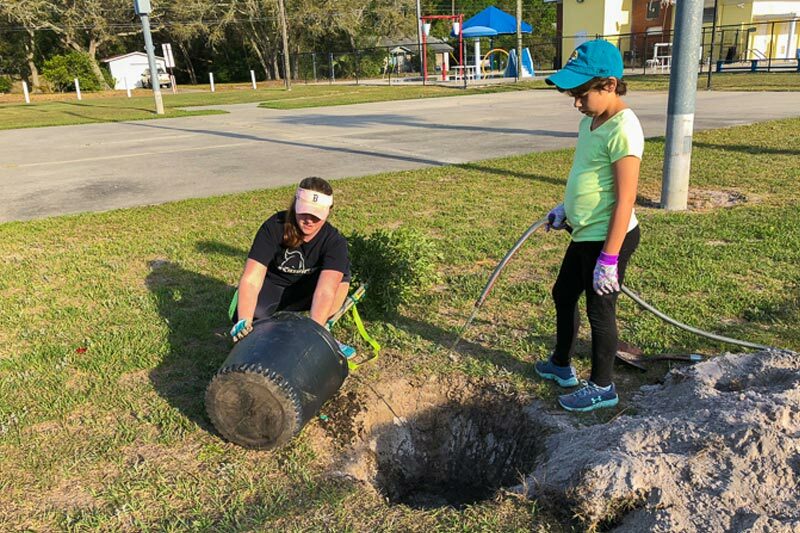 Just in time for Earth Day which is April 22, 2018. 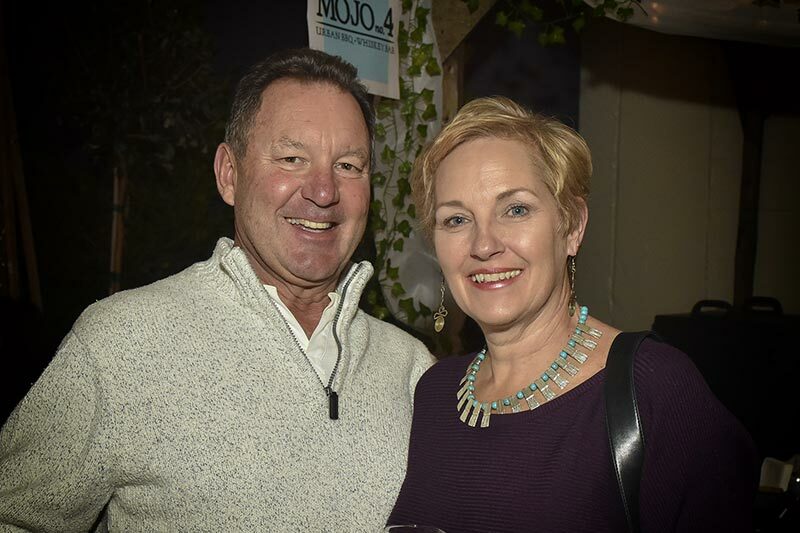 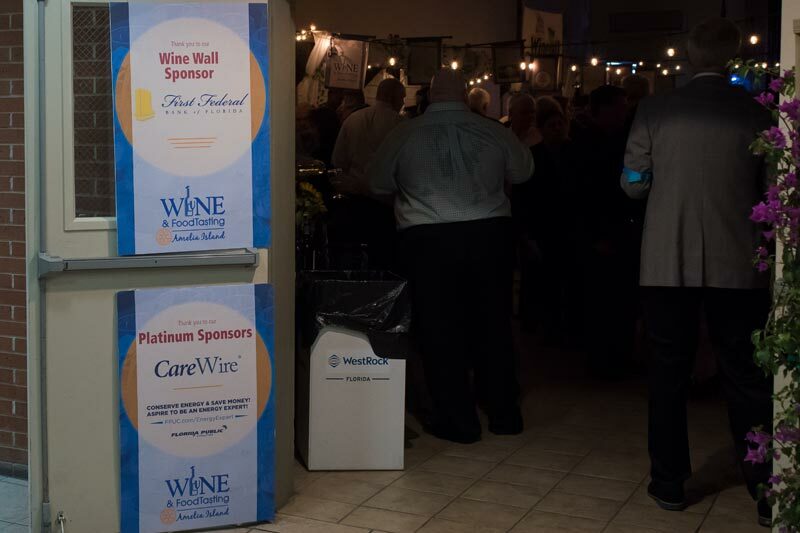 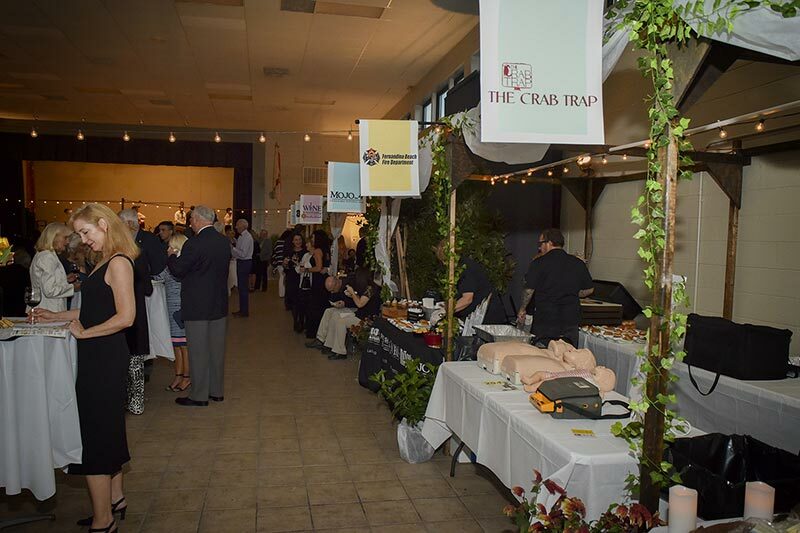 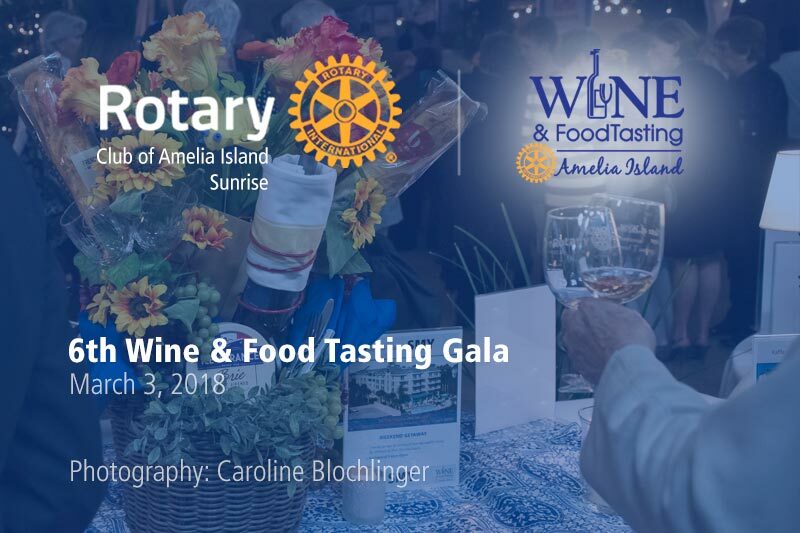 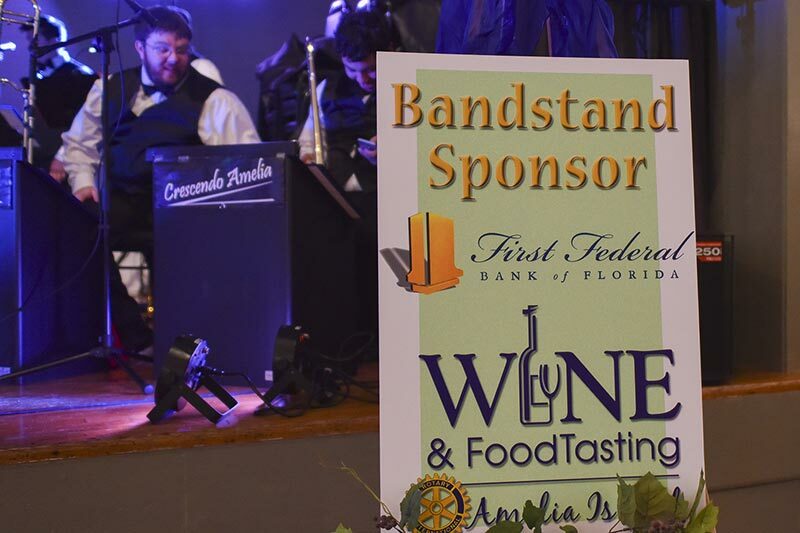 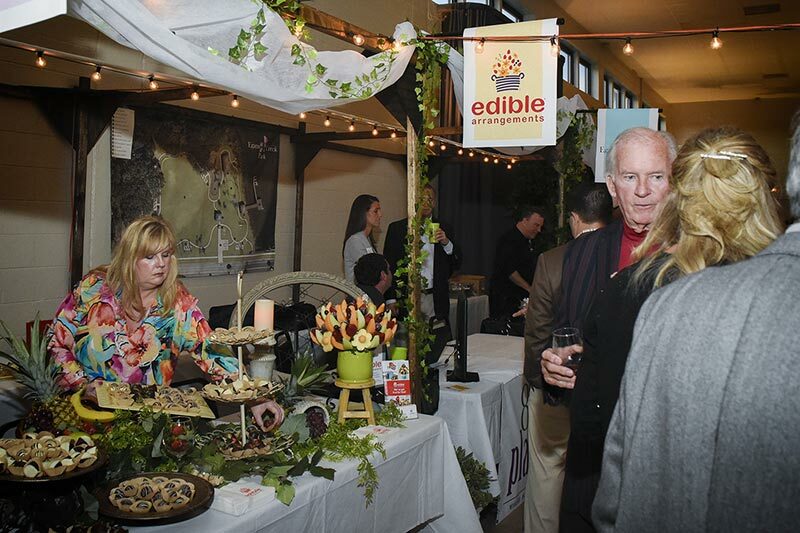 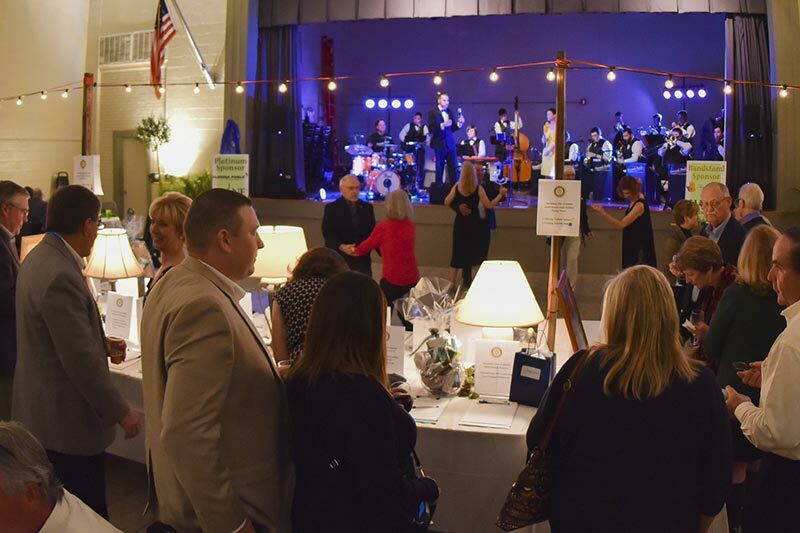 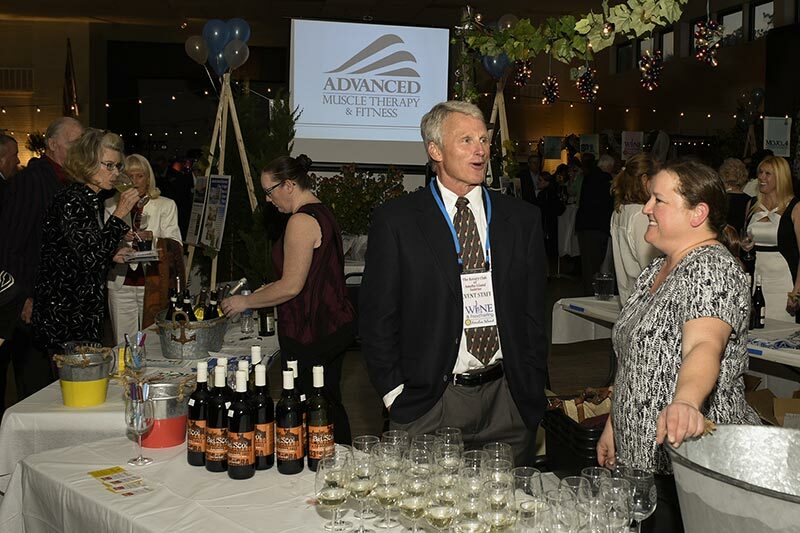 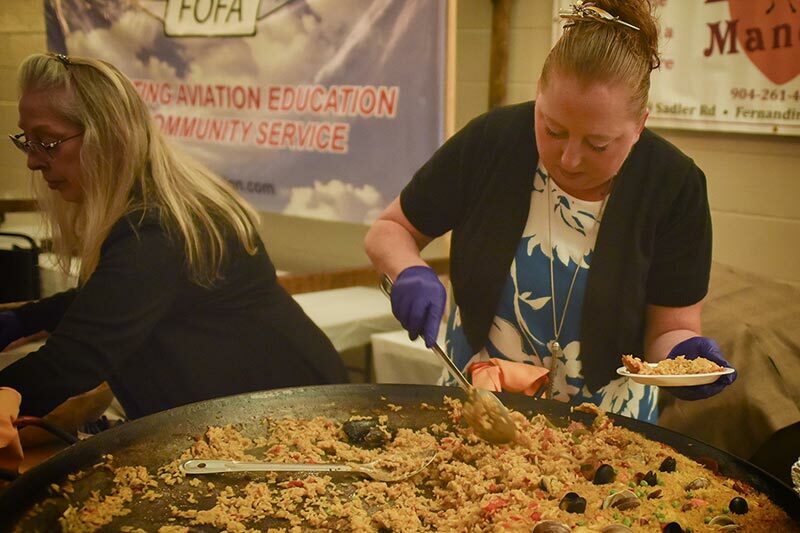 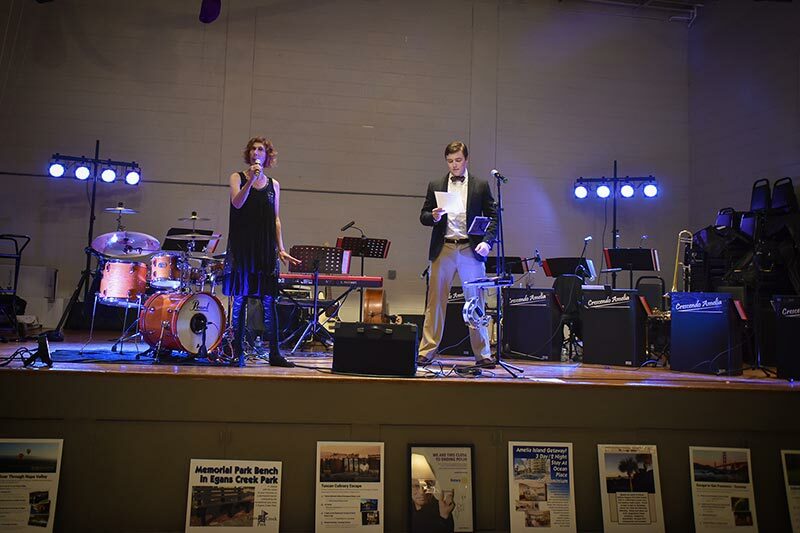 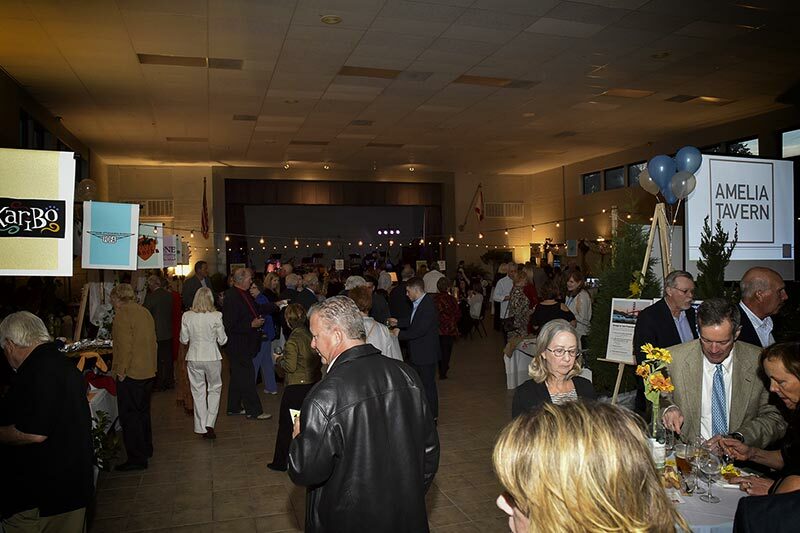 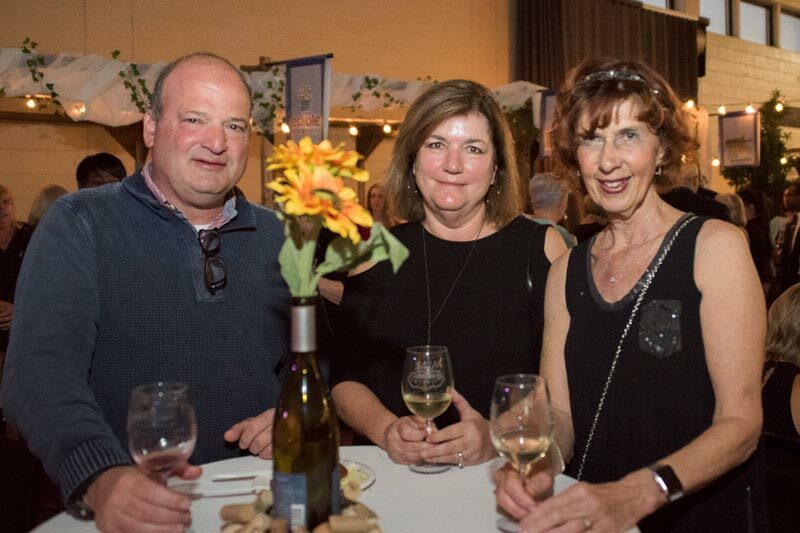 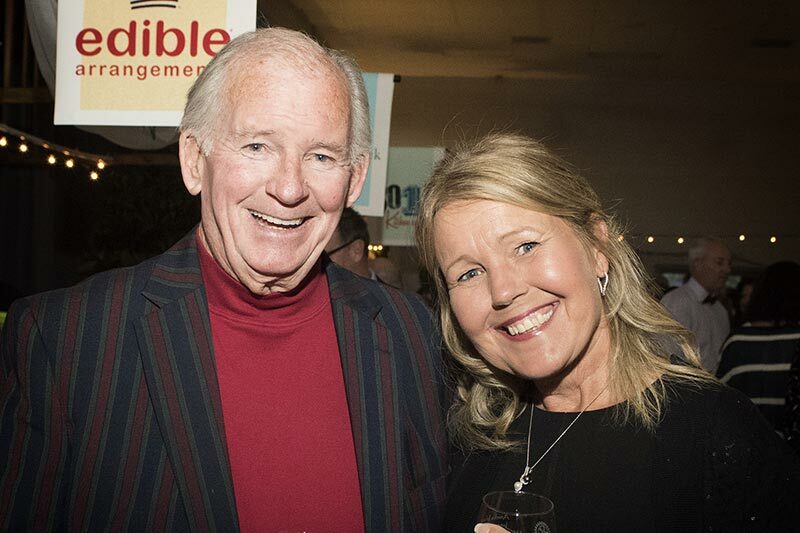 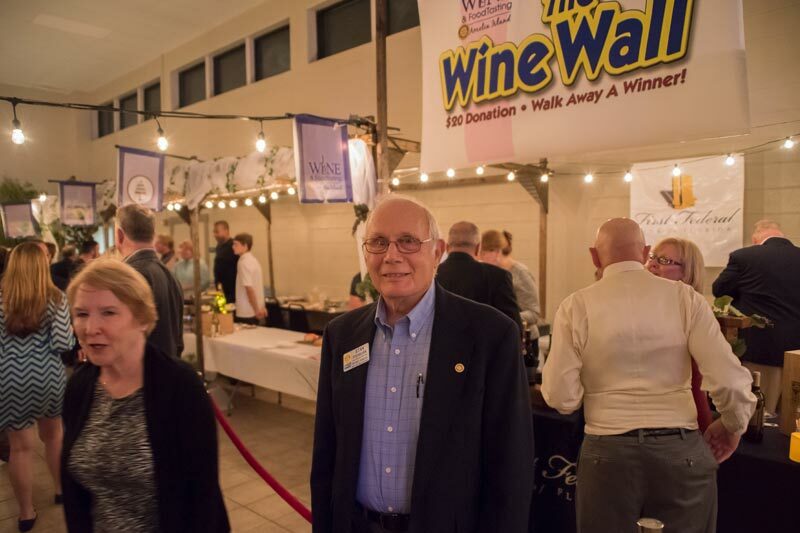 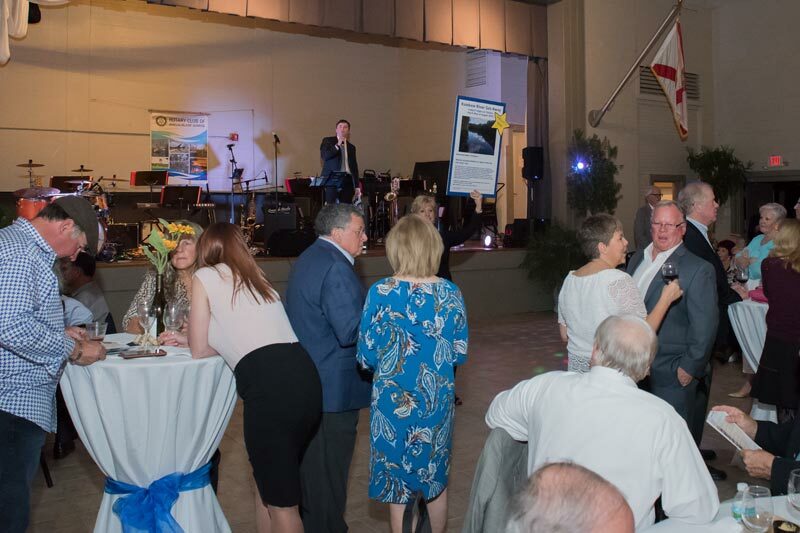 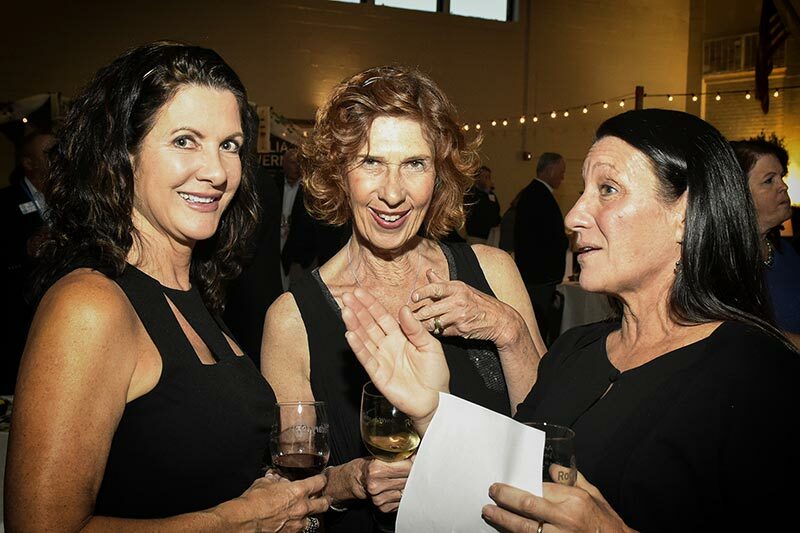 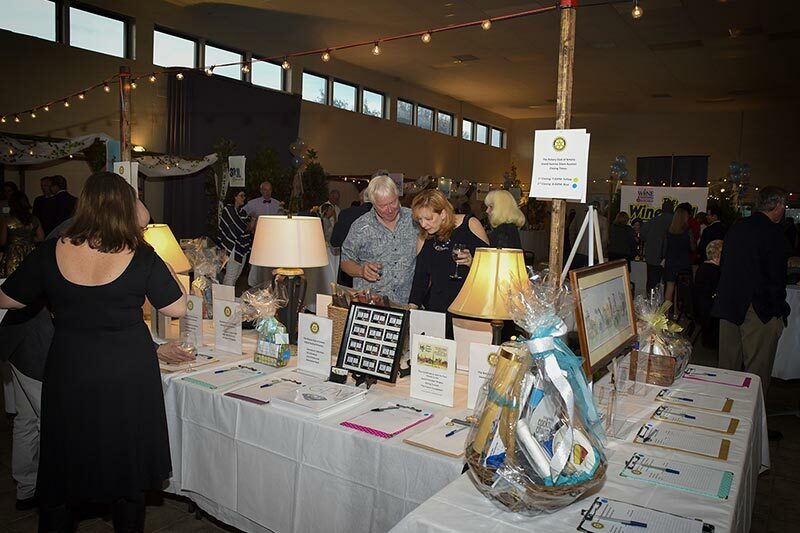 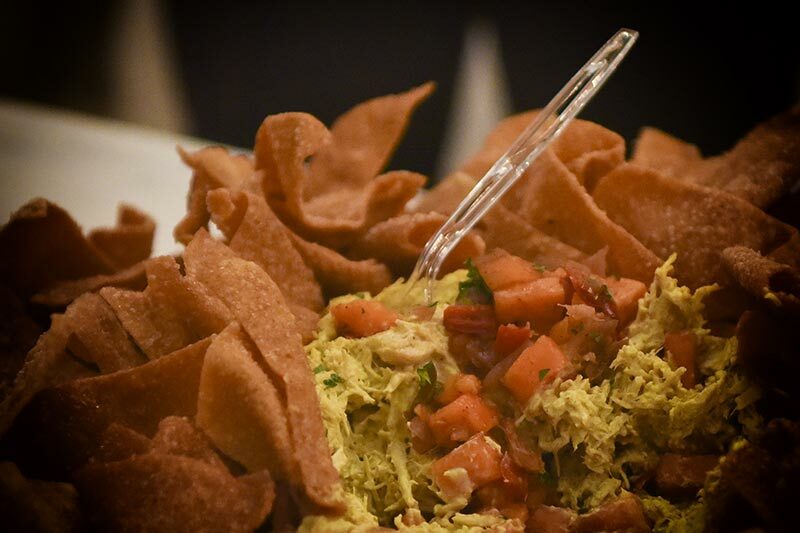 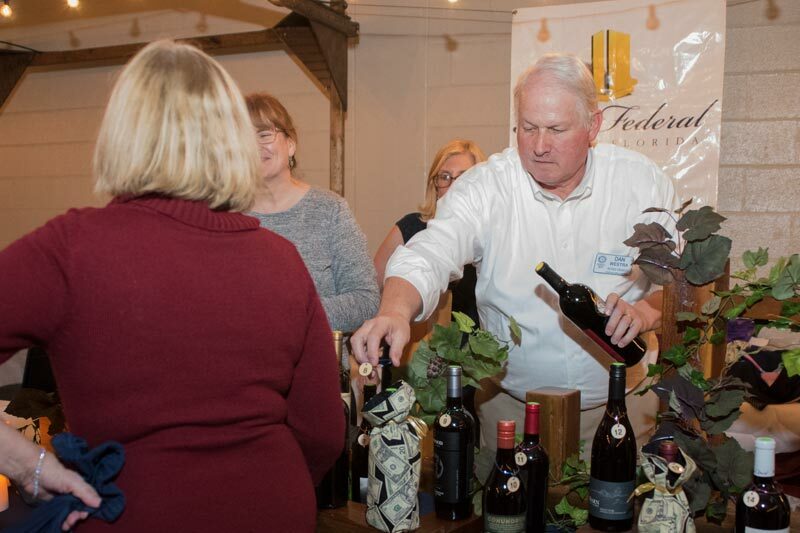 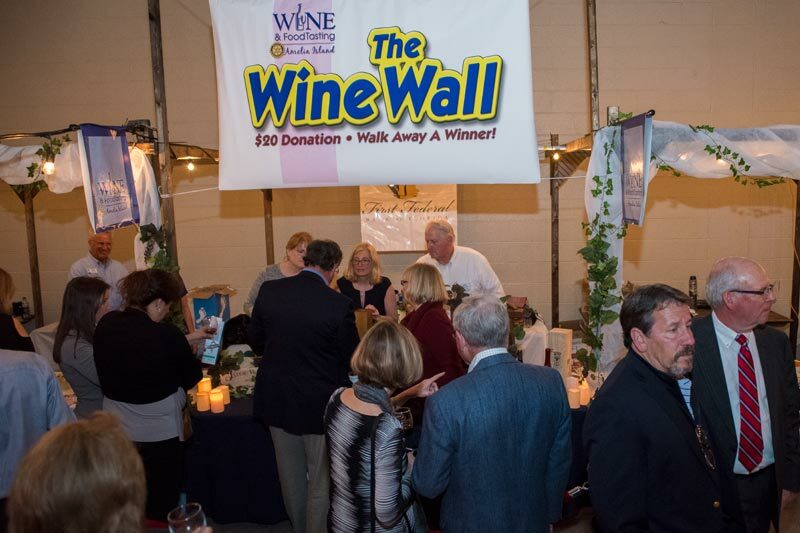 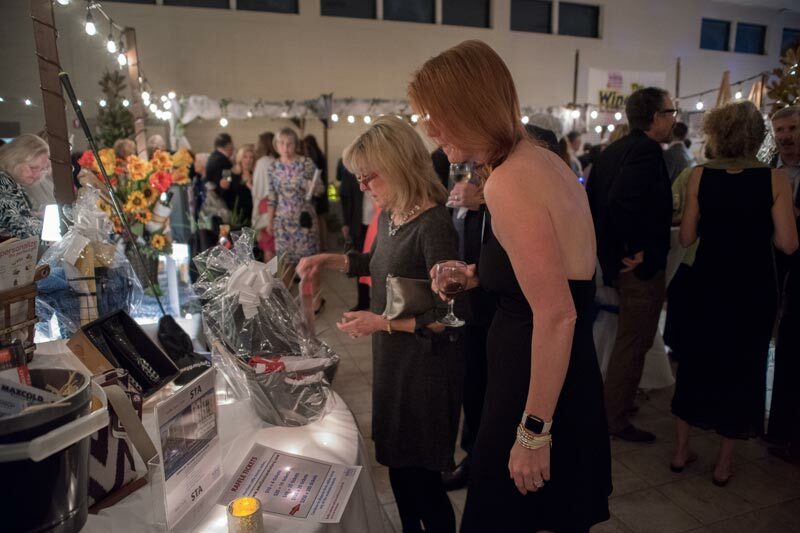 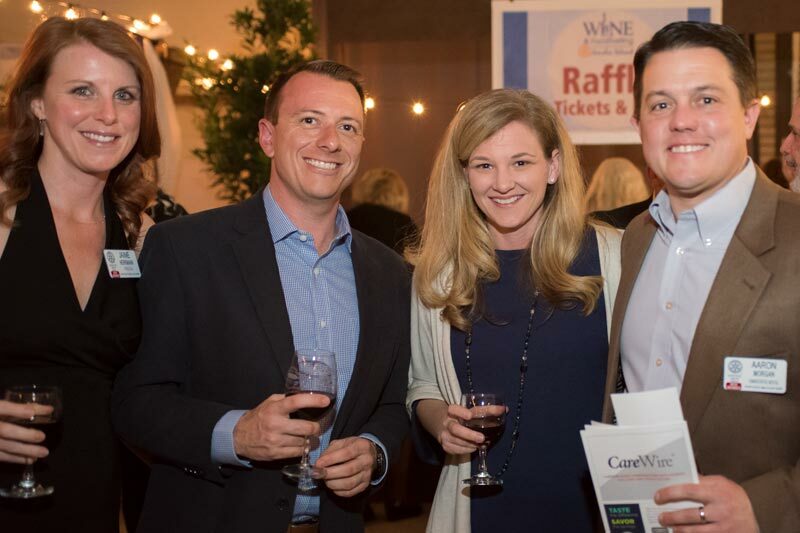 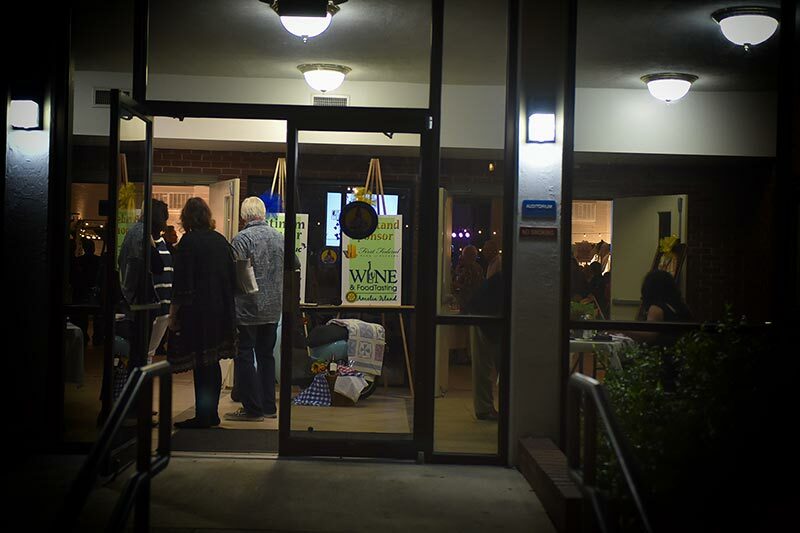 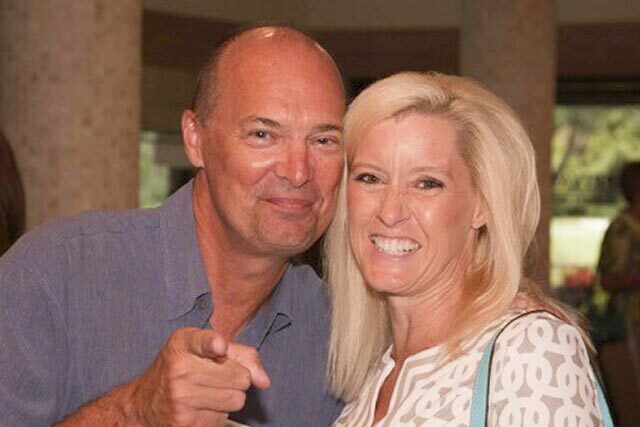 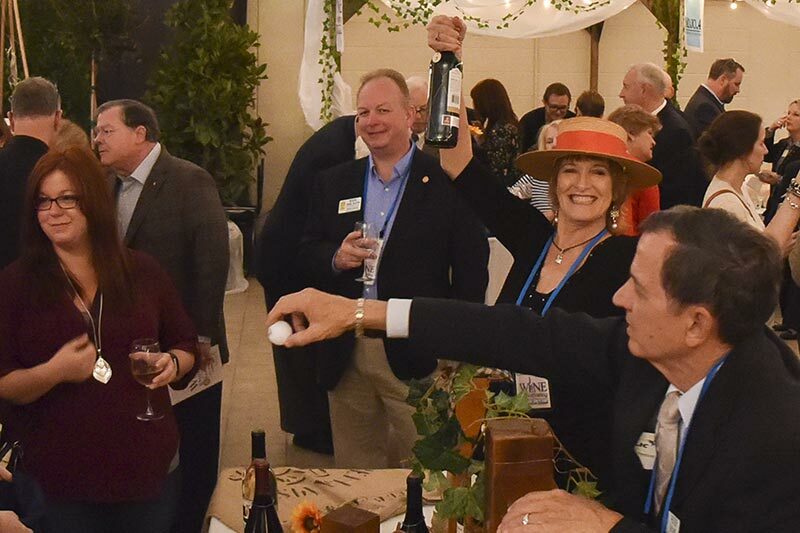 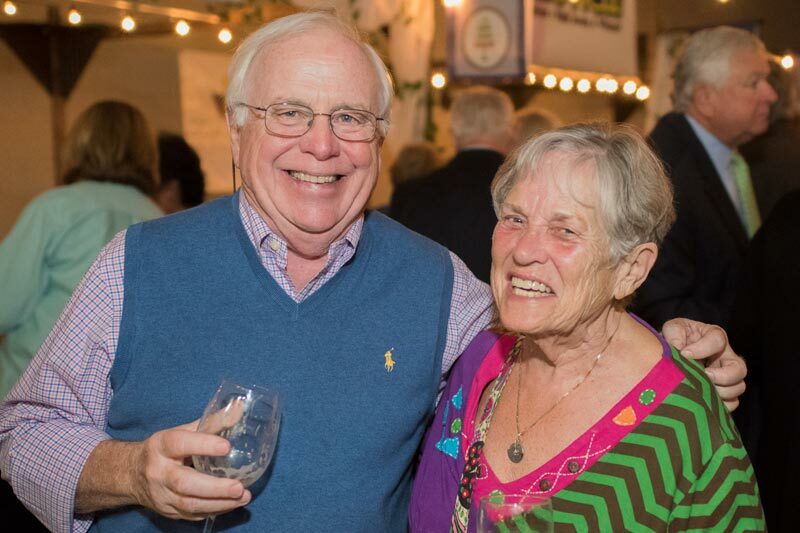 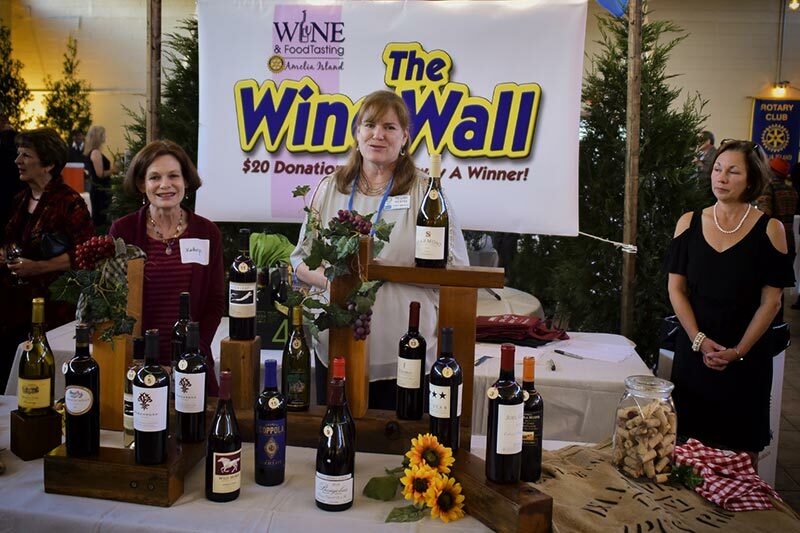 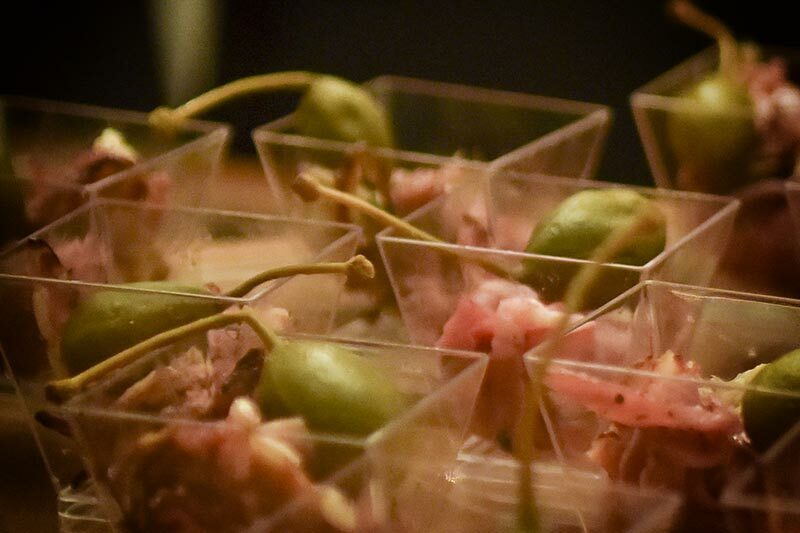 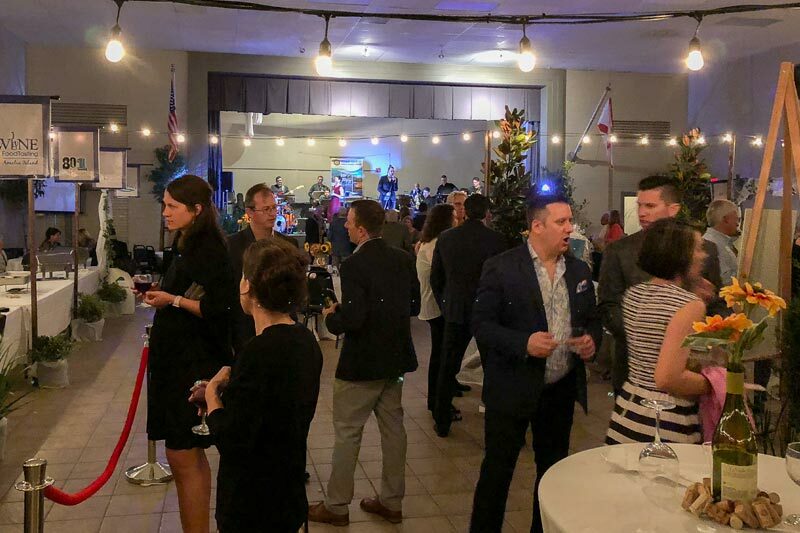 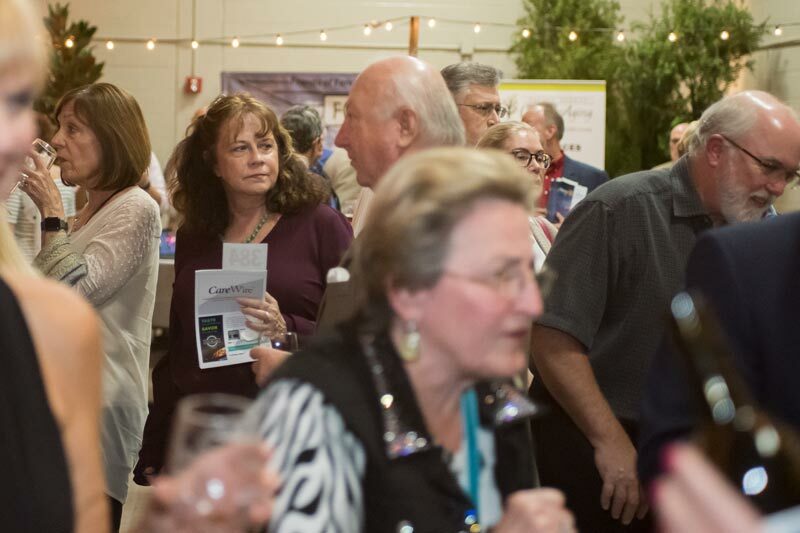 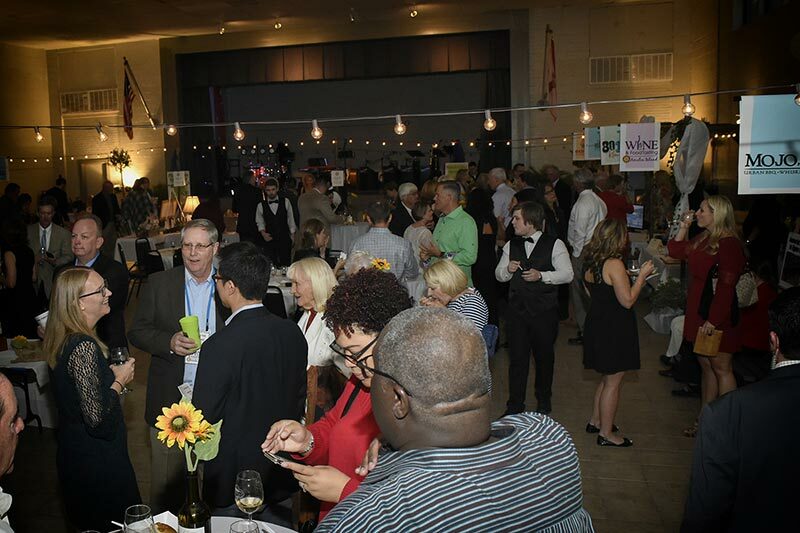 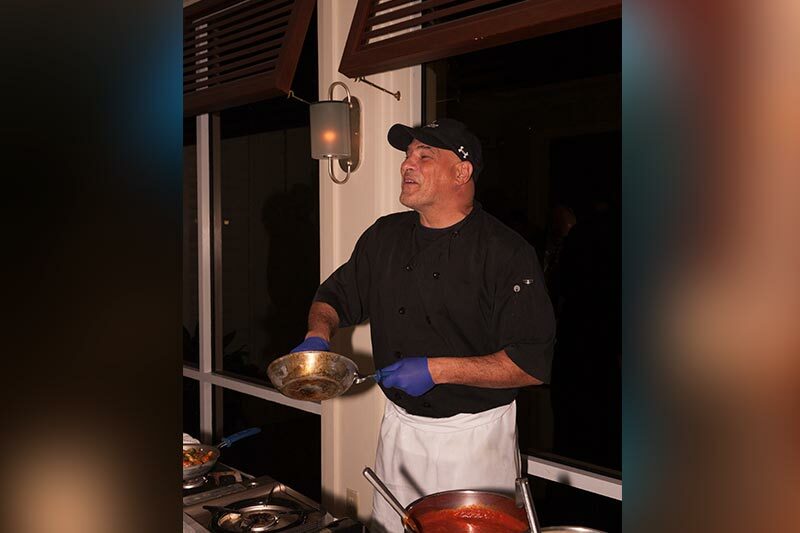 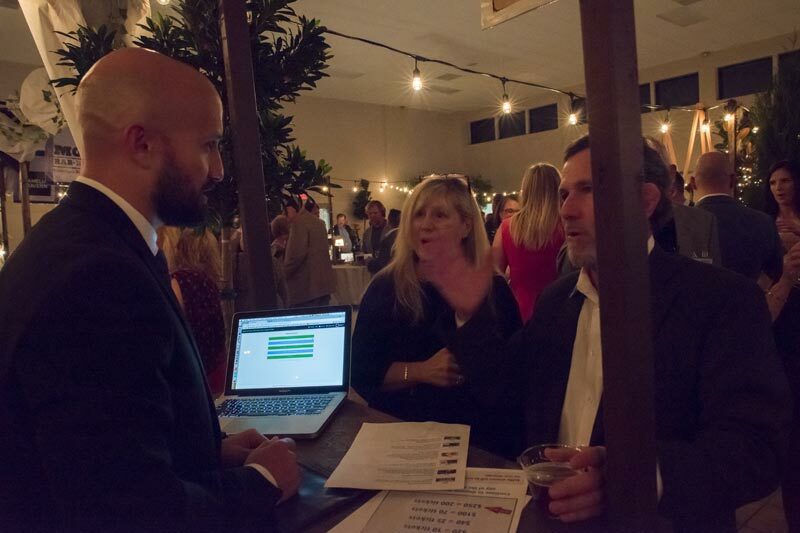 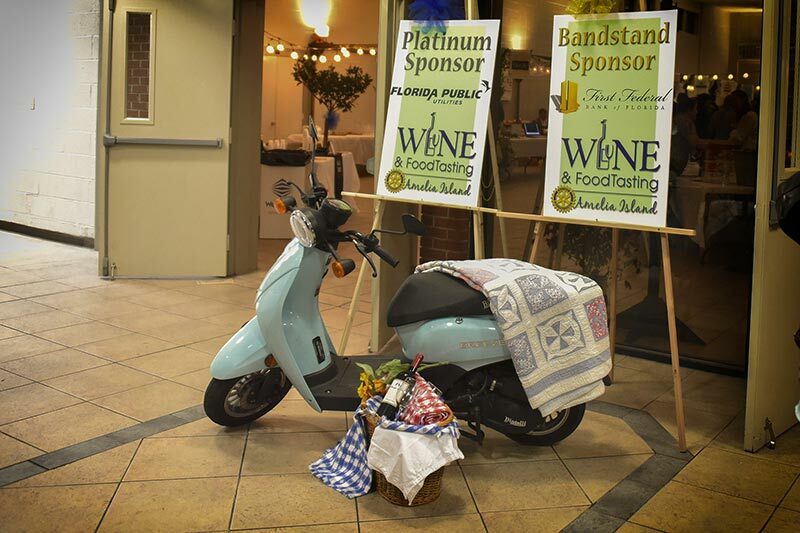 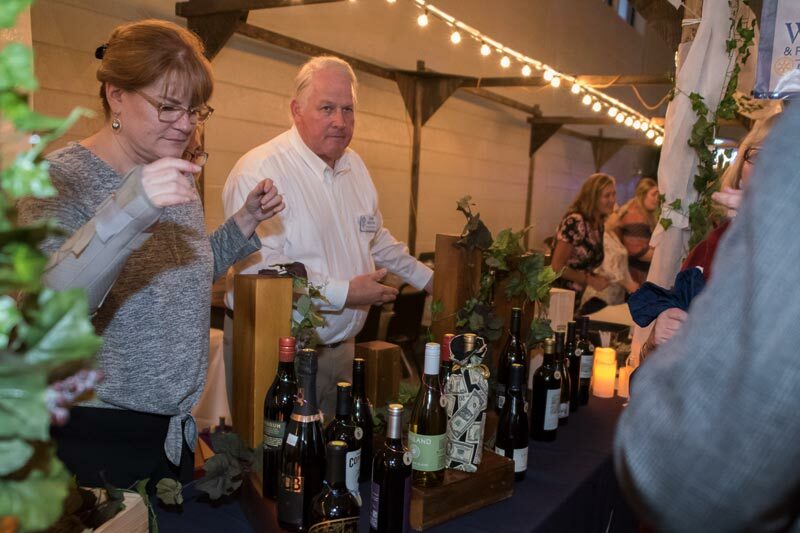 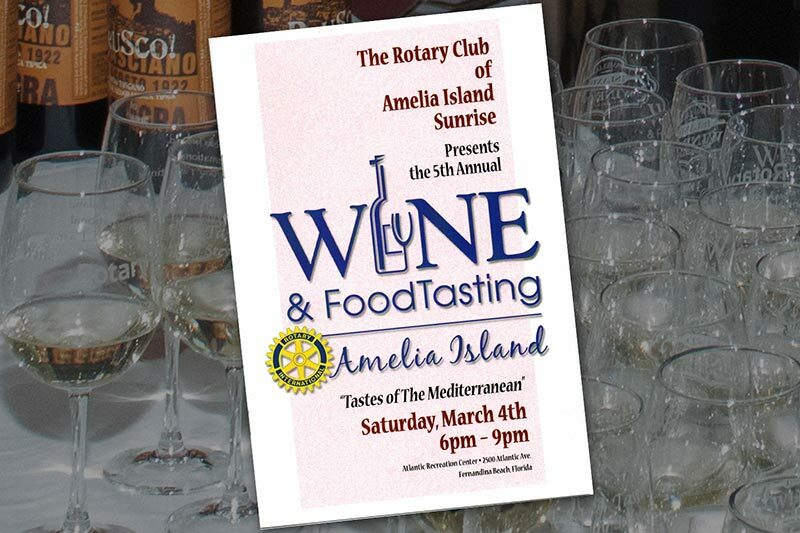 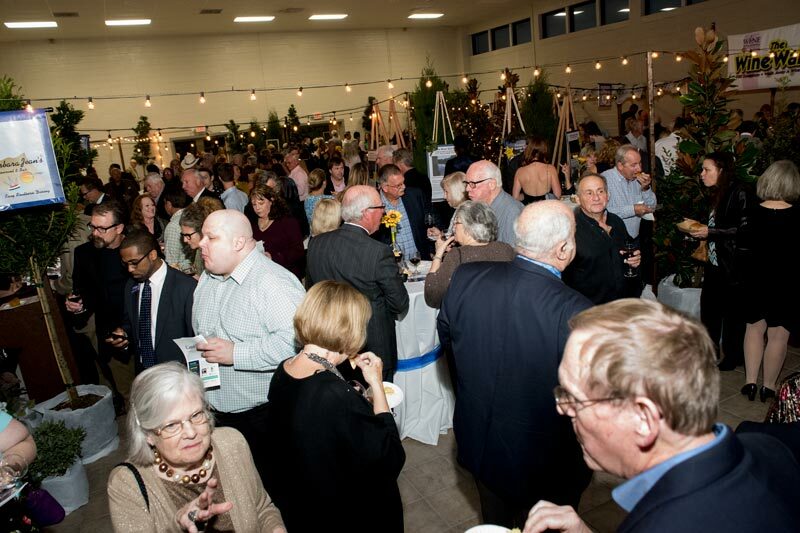 The annual Wine & Food Tasting Gala is the signature fundraising event for the Rotary Club of Amelia Island Sunrise. 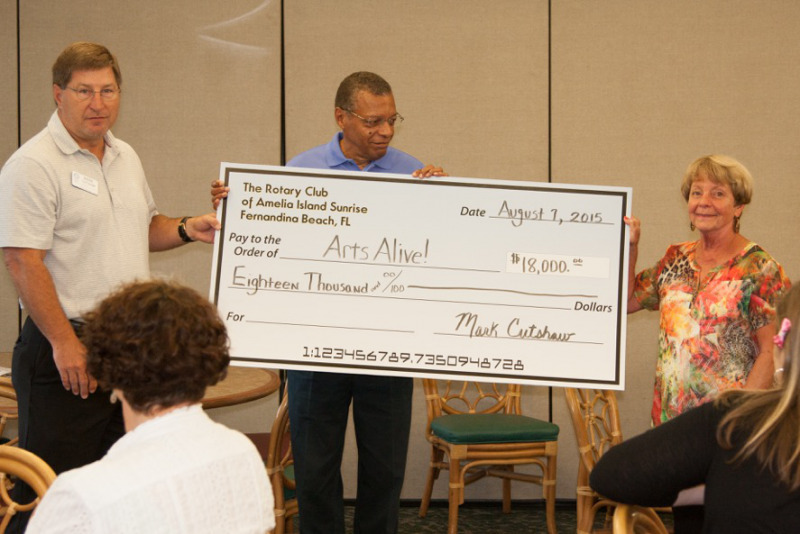 This year we have chosen 3 organizations to be the recipients of the proceeds. 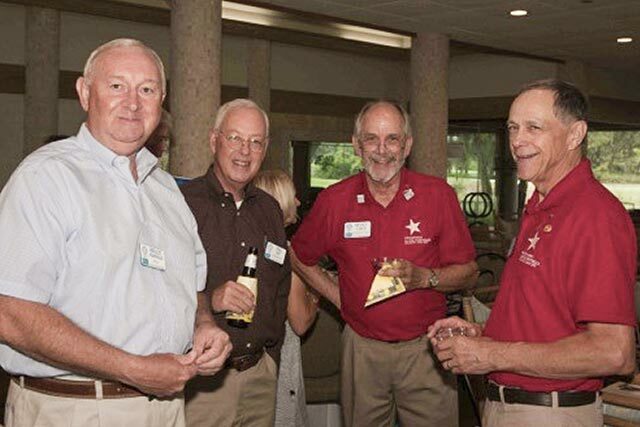 The Boys & Girls Clubs, FOFA - Friends of Fernandina Aviation and the Nassau County Council on Aging. 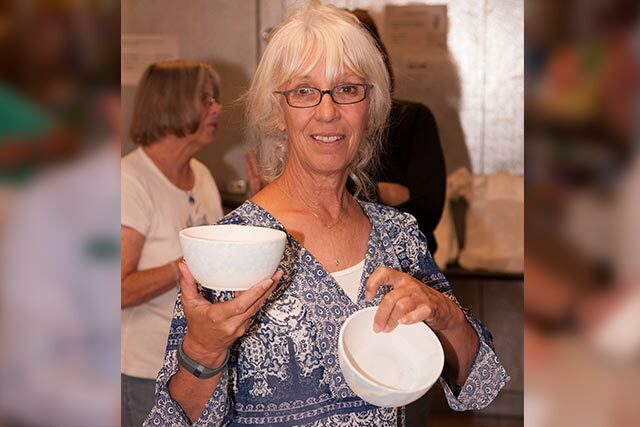 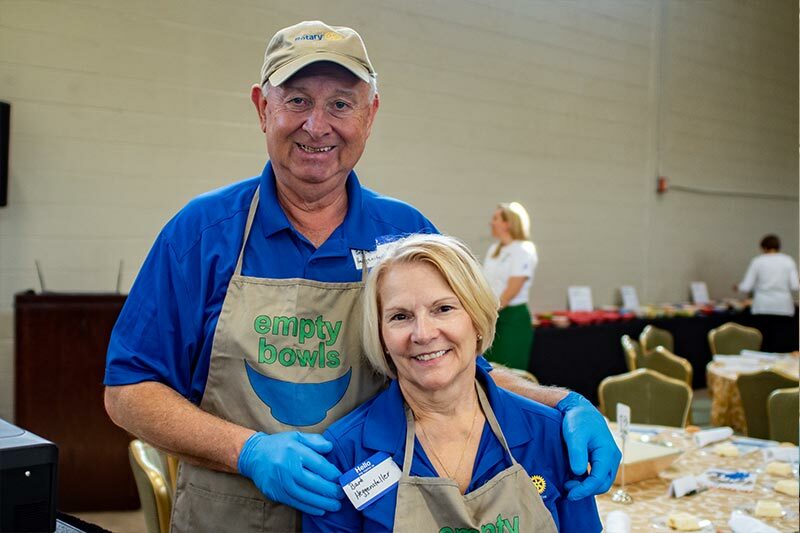 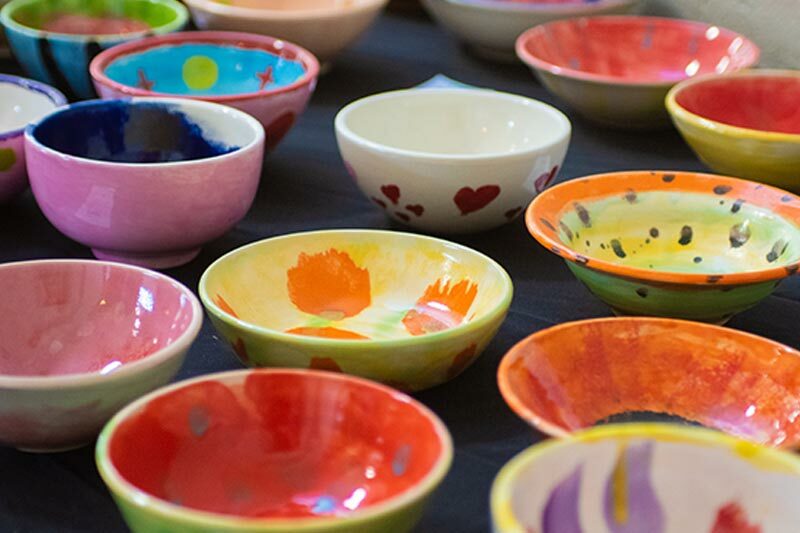 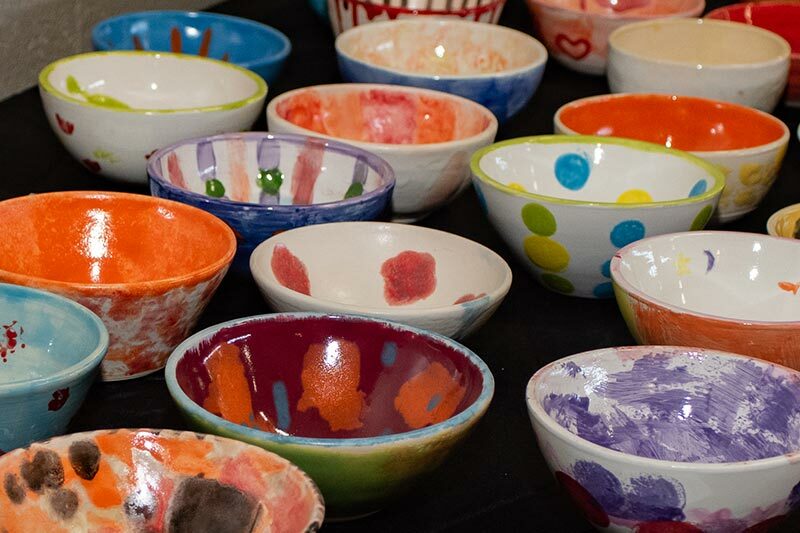 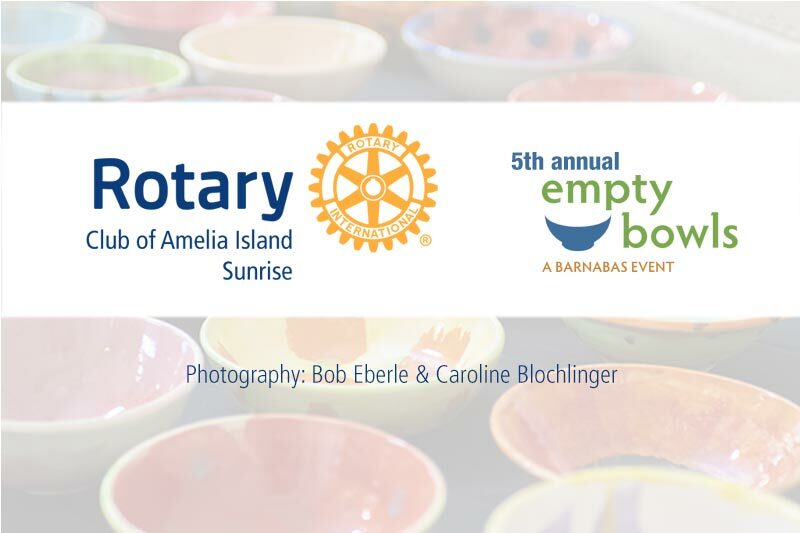 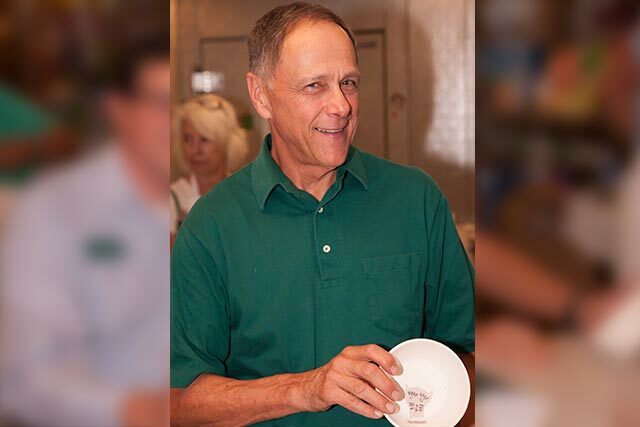 Barnabas is hosting the 4th Empty Bowls Luncheon on November 17th at the Atlantic Rec Center to raise funds to combat hunger and crisis in Nassau County, and they need bowls for the luncheon! 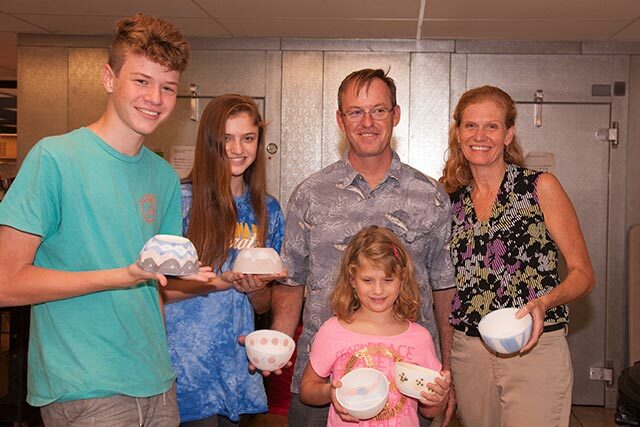 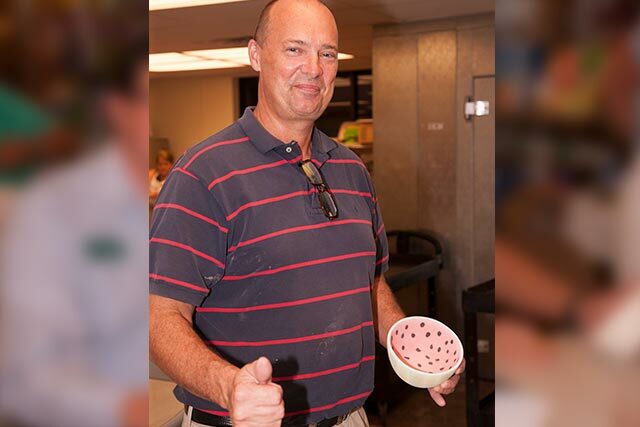 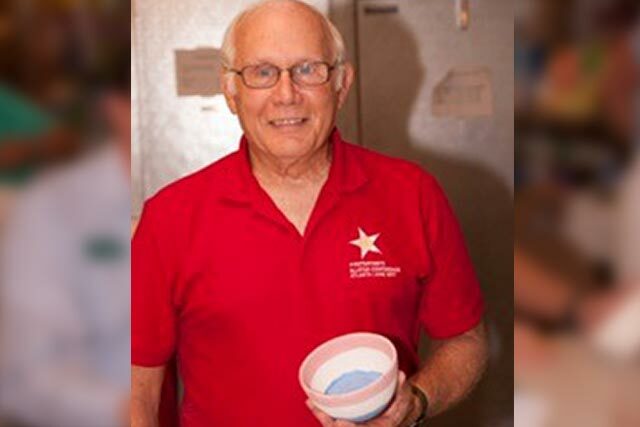 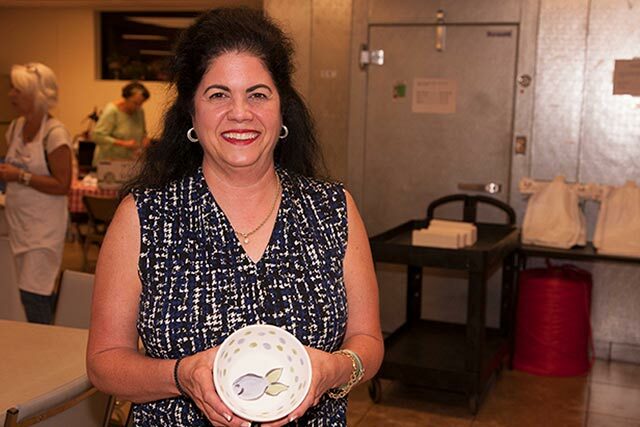 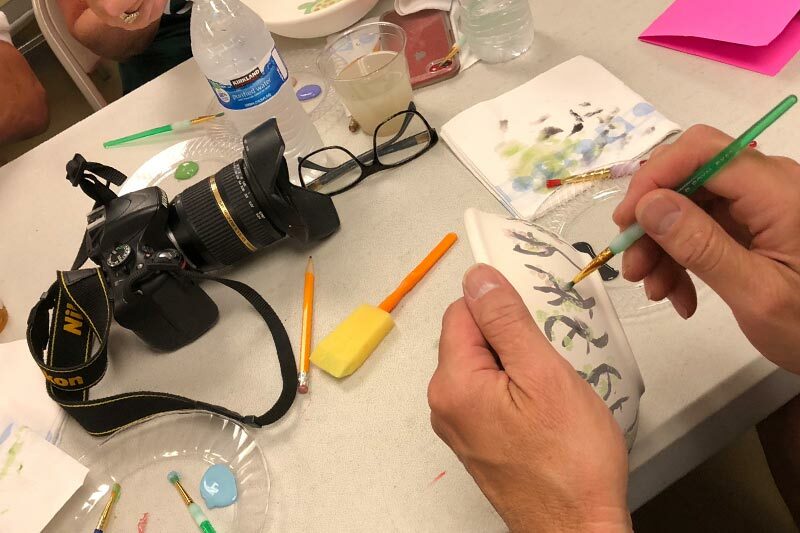 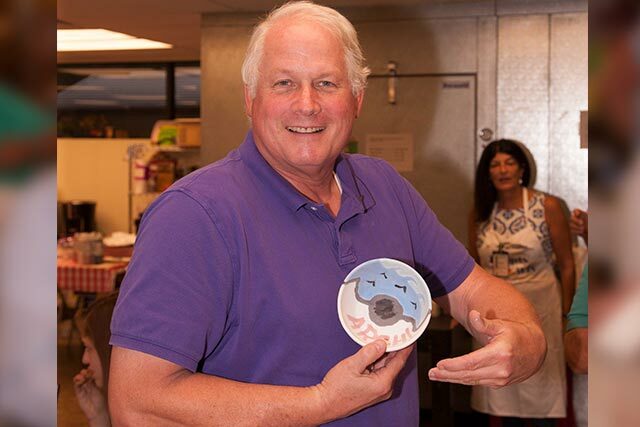 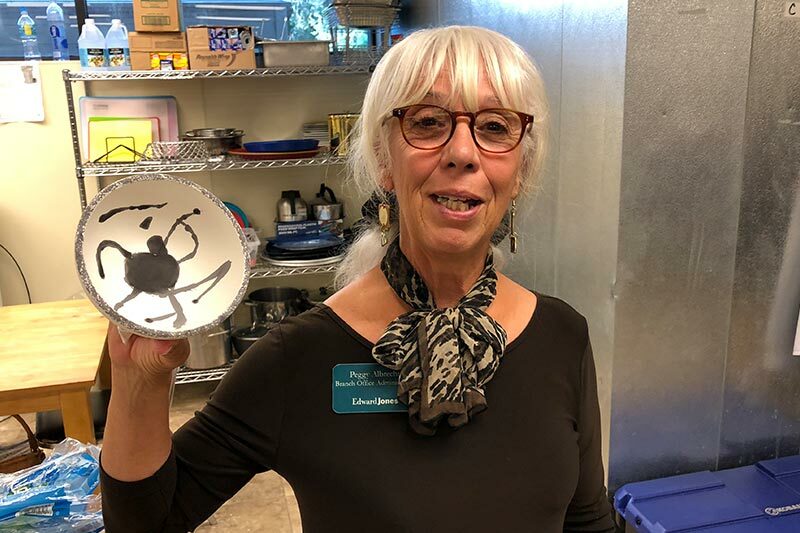 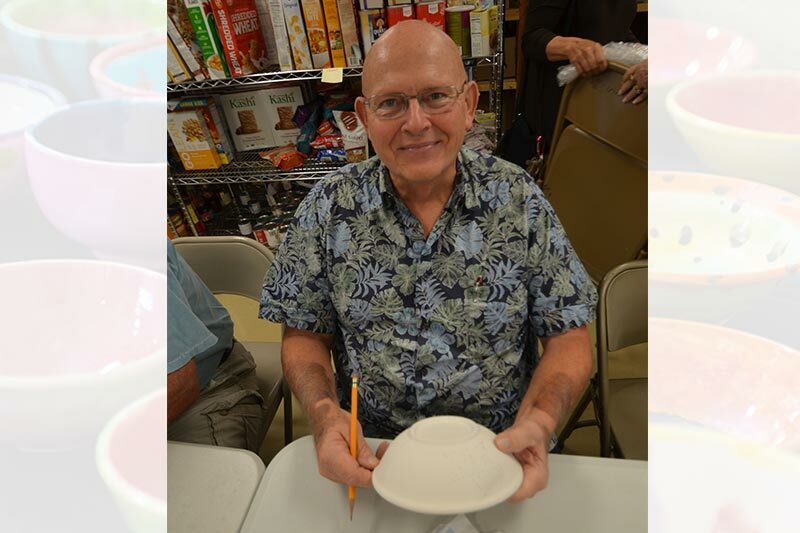 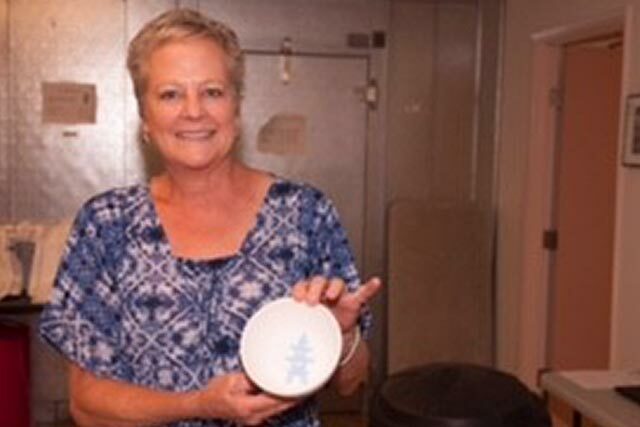 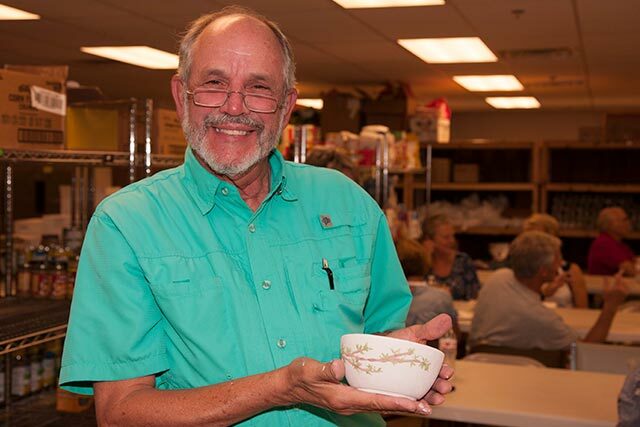 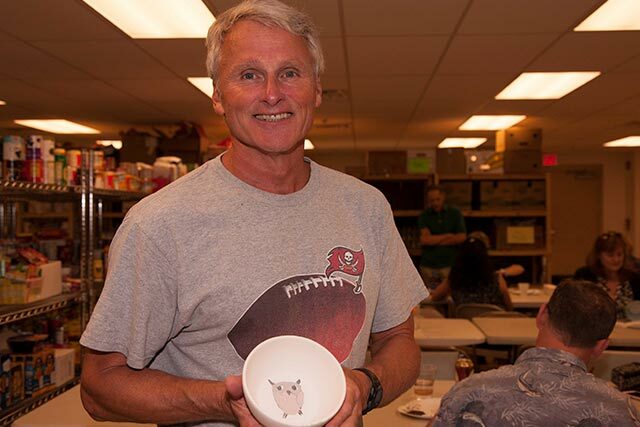 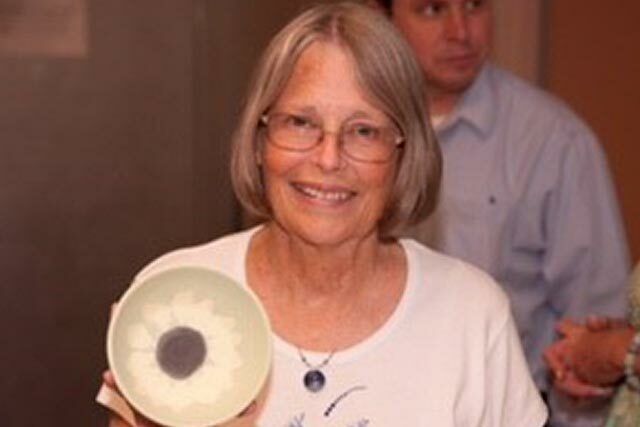 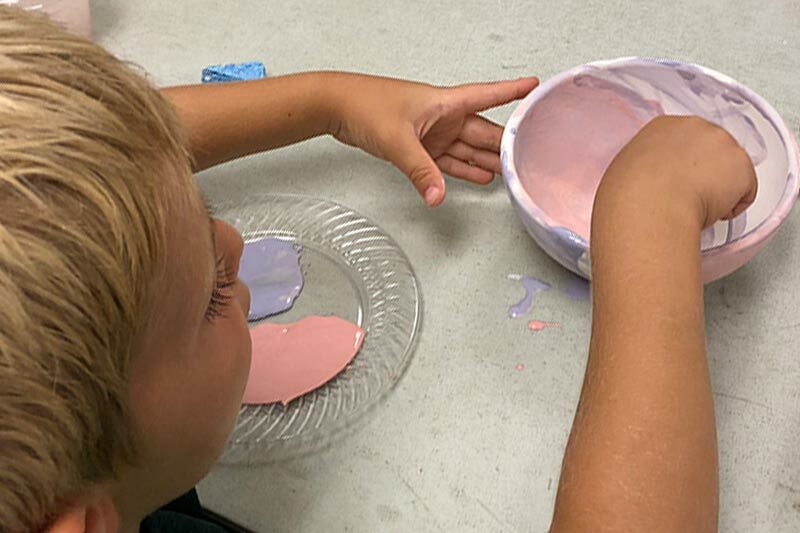 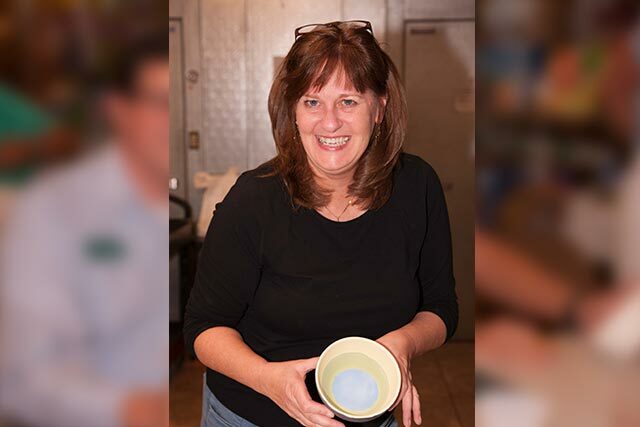 The handcrafted bowls that are being painted will be offered to those who attend the luncheon. 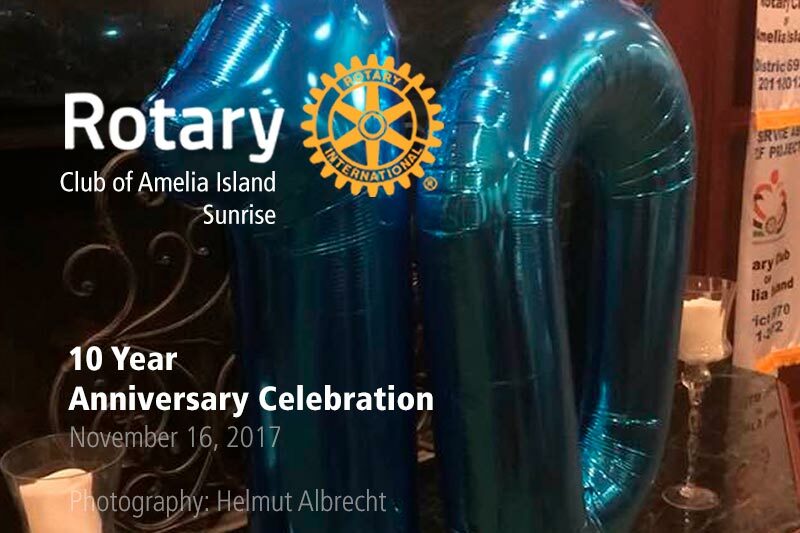 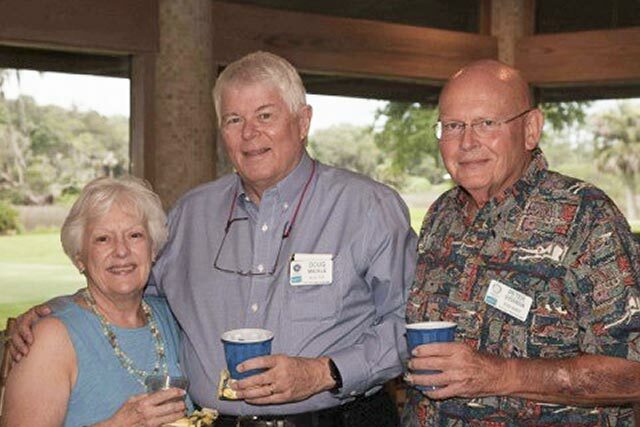 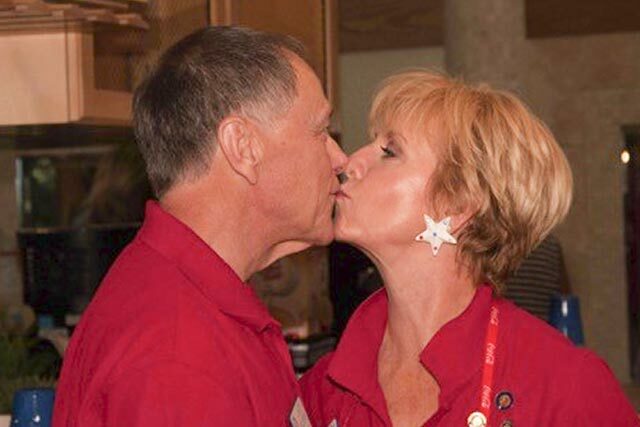 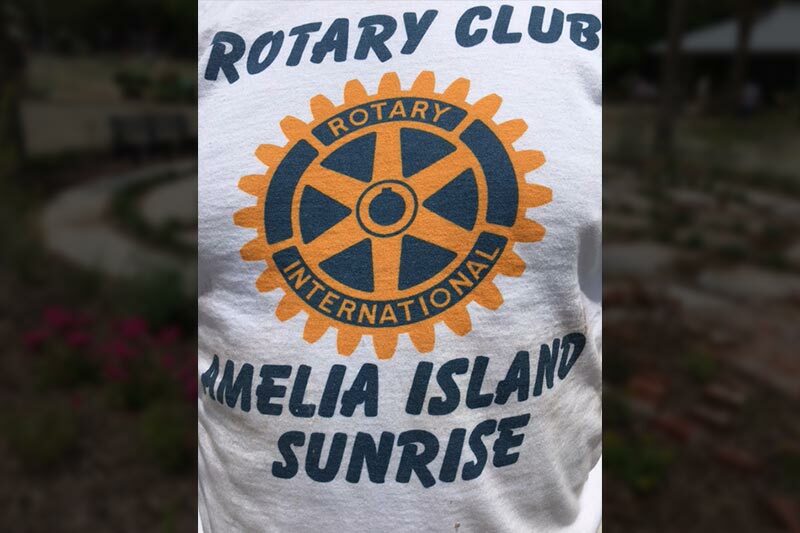 The Rotary Club of Amelia Island Sunrise was chartered November 6, 2007. 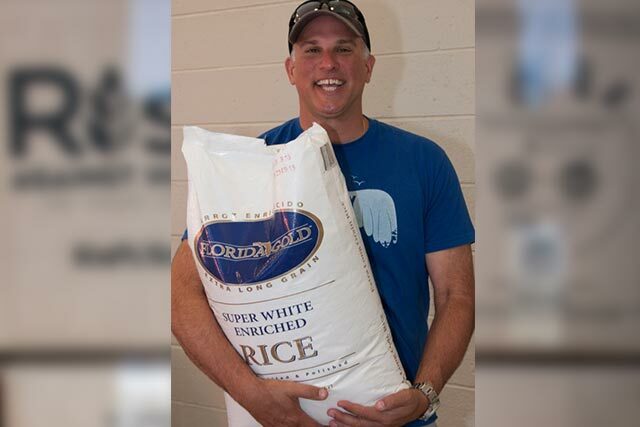 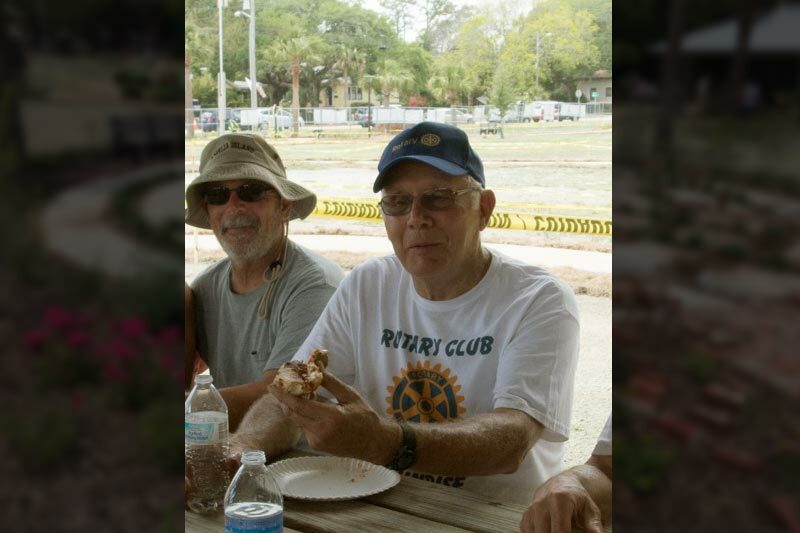 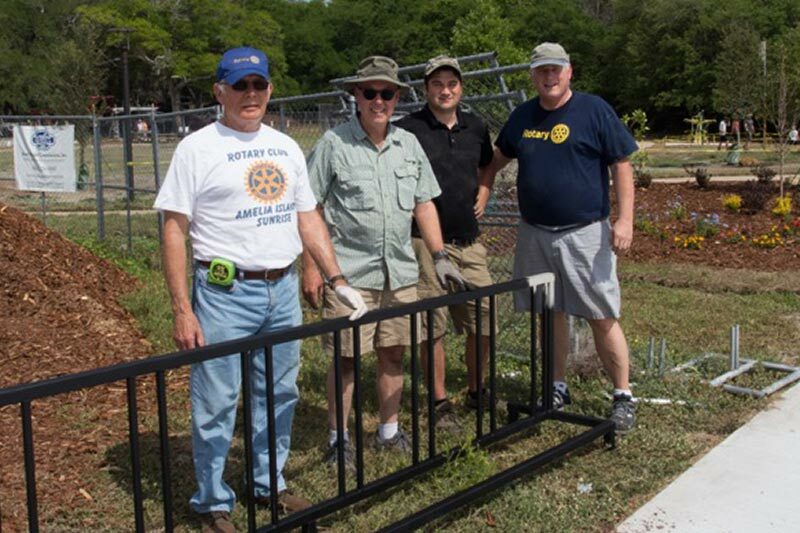 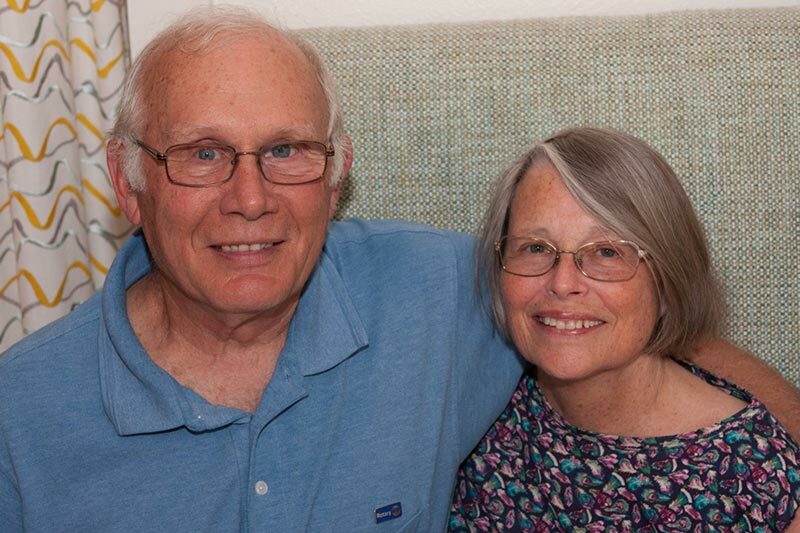 It was sponsored by the Rotary Club of Fernandina Beach. 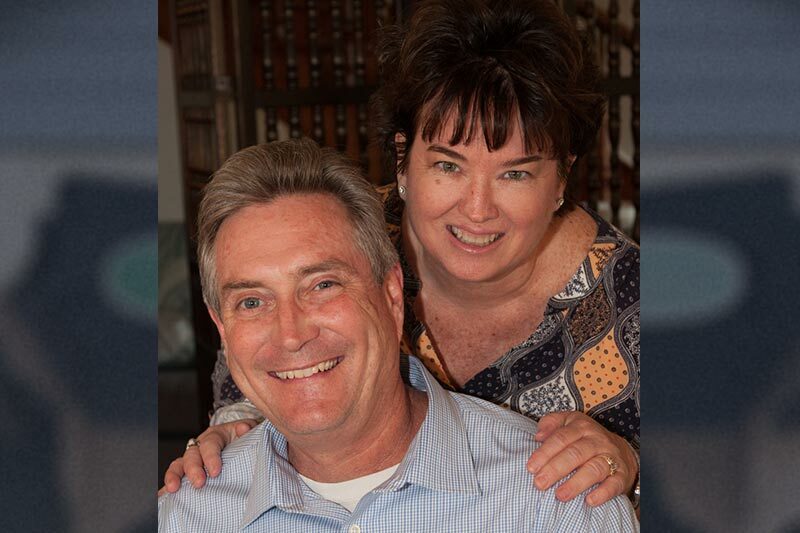 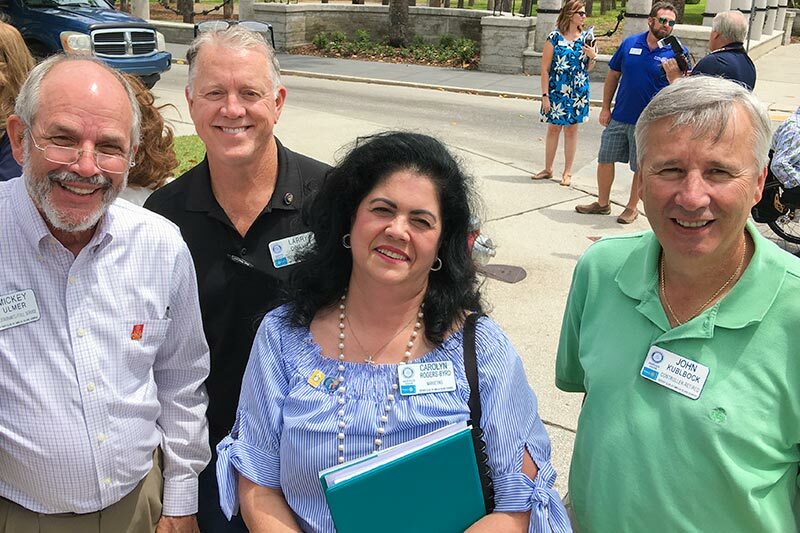 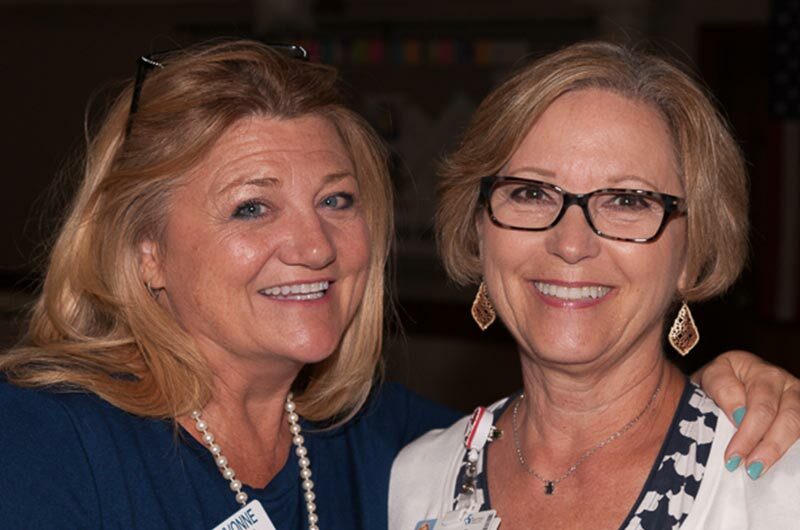 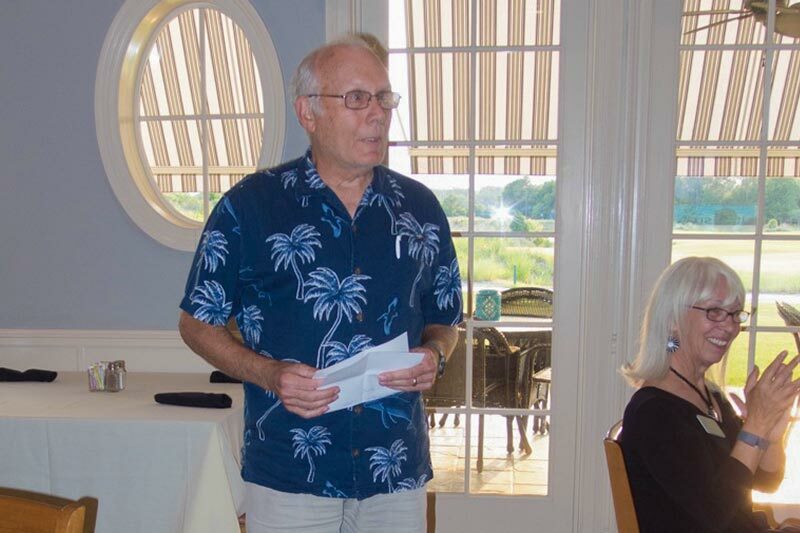 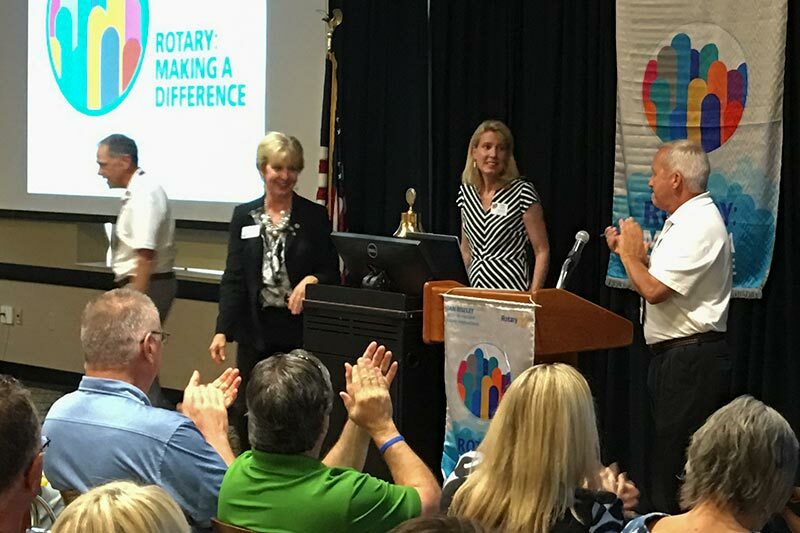 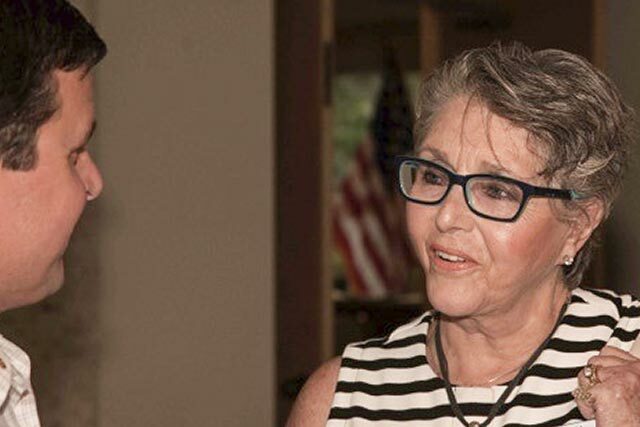 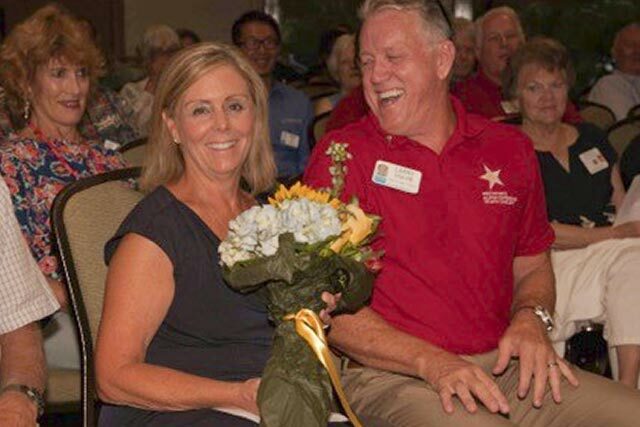 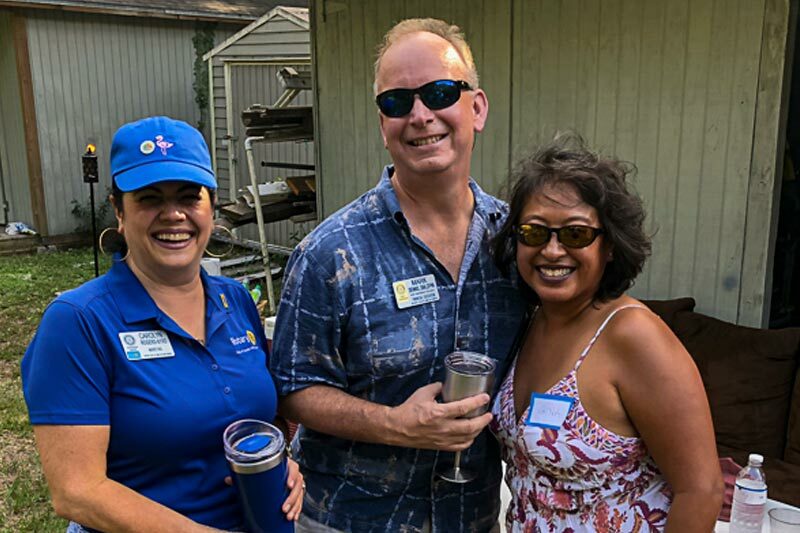 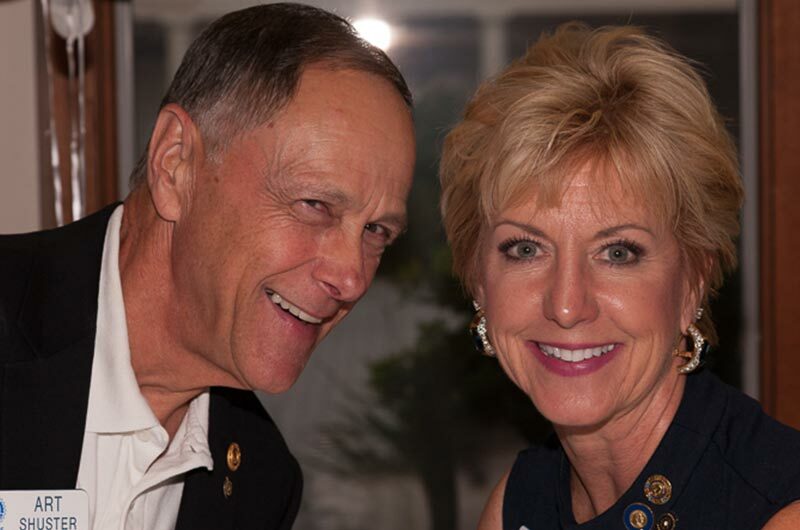 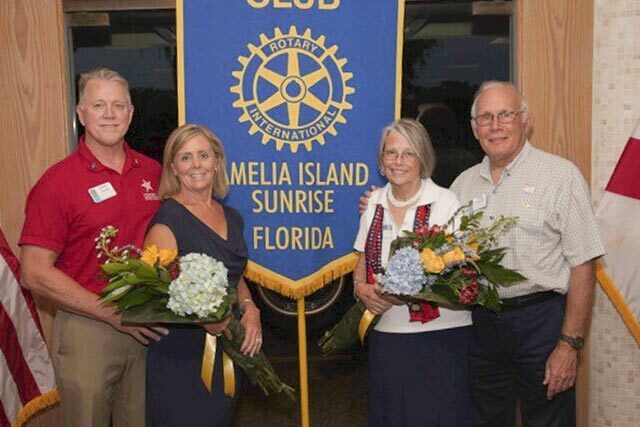 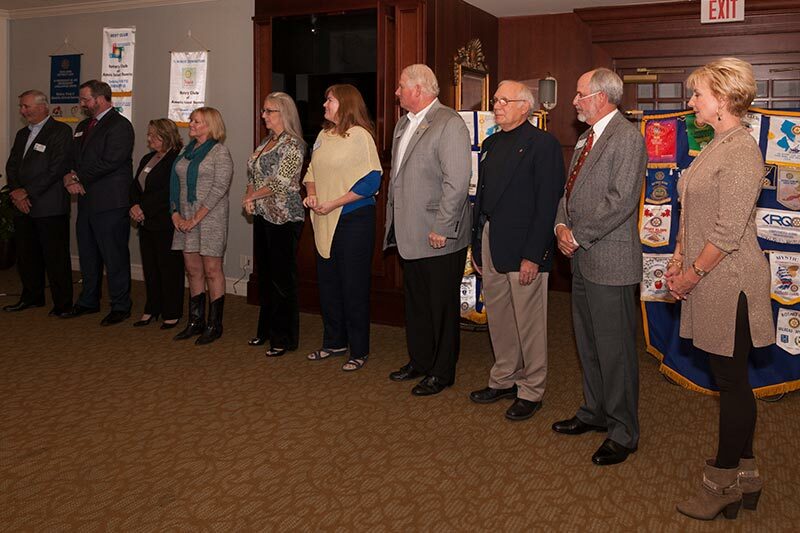 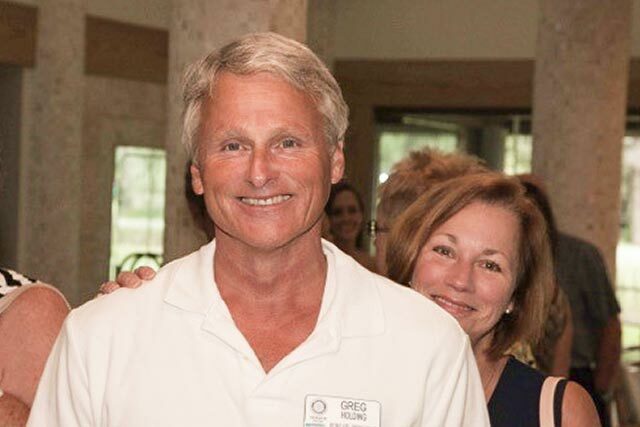 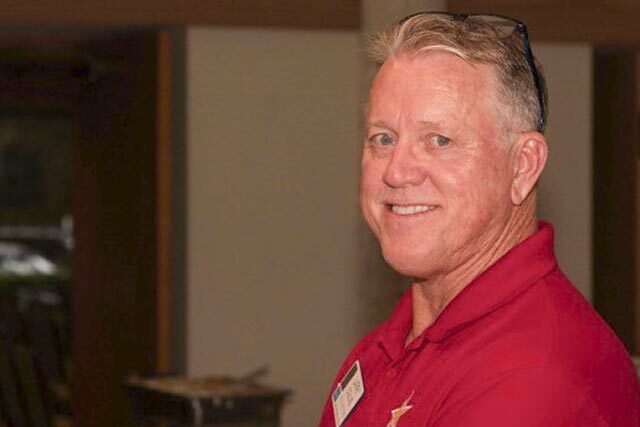 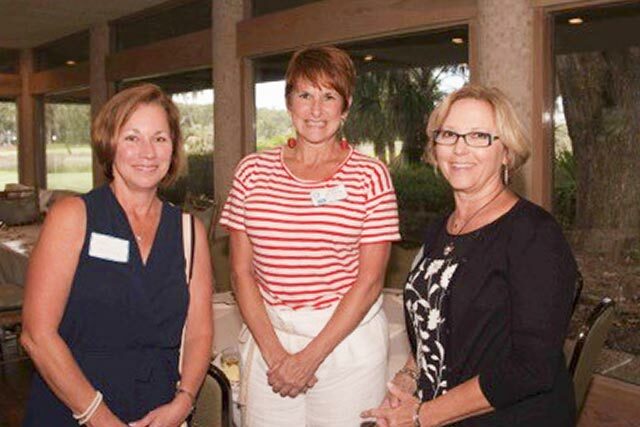 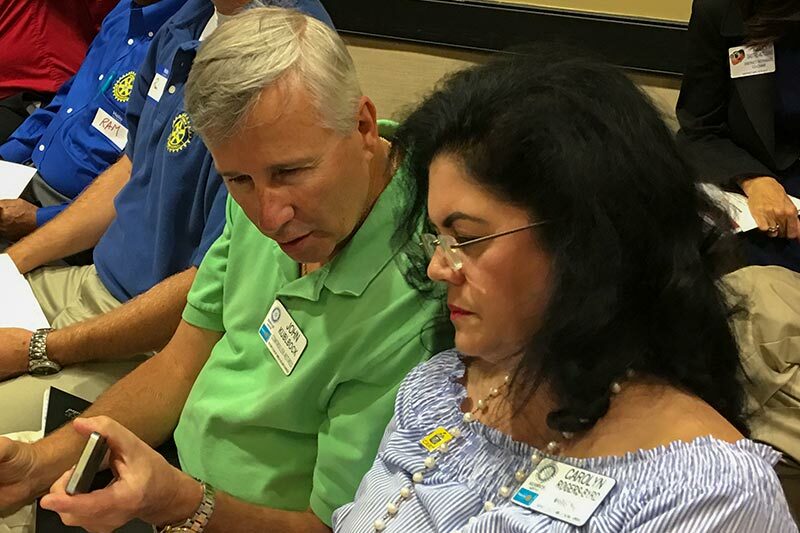 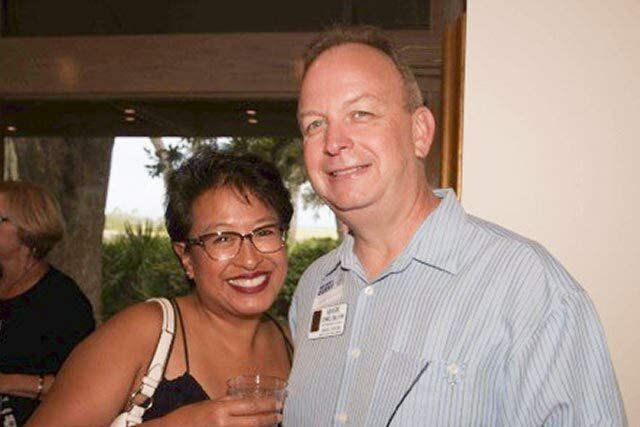 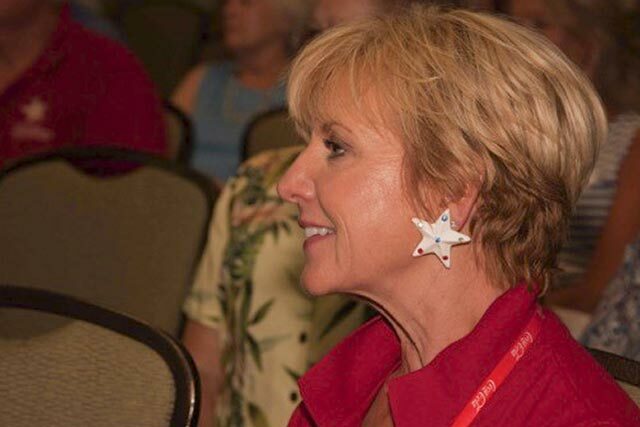 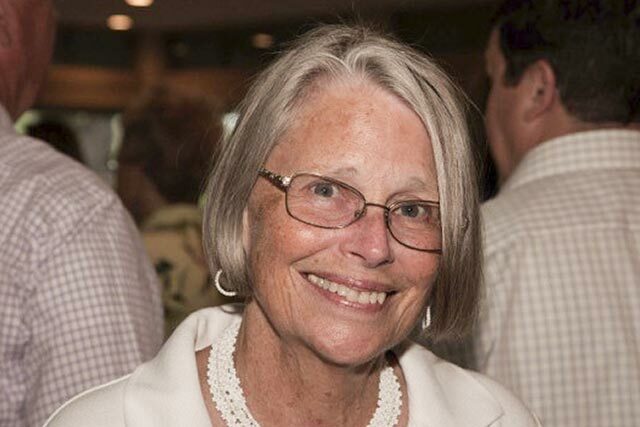 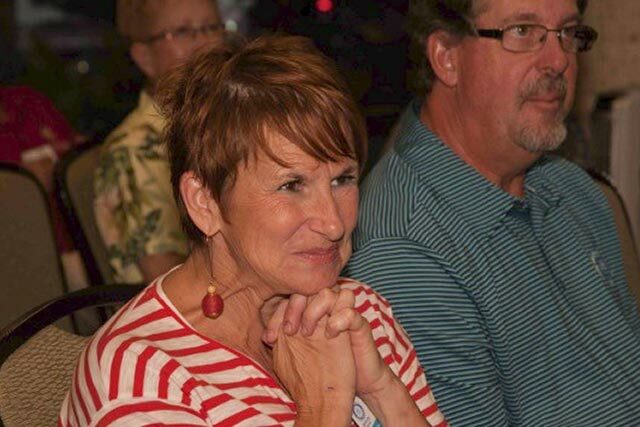 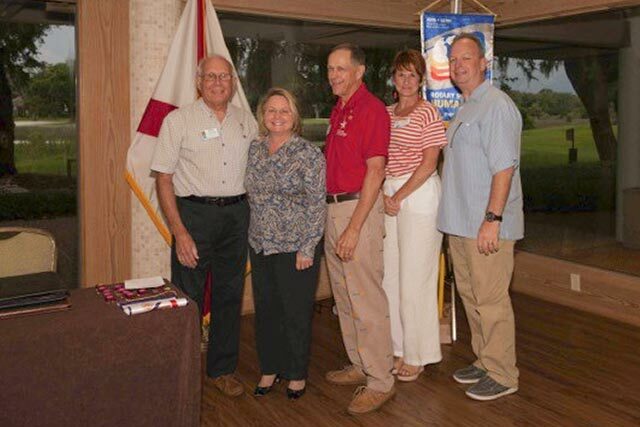 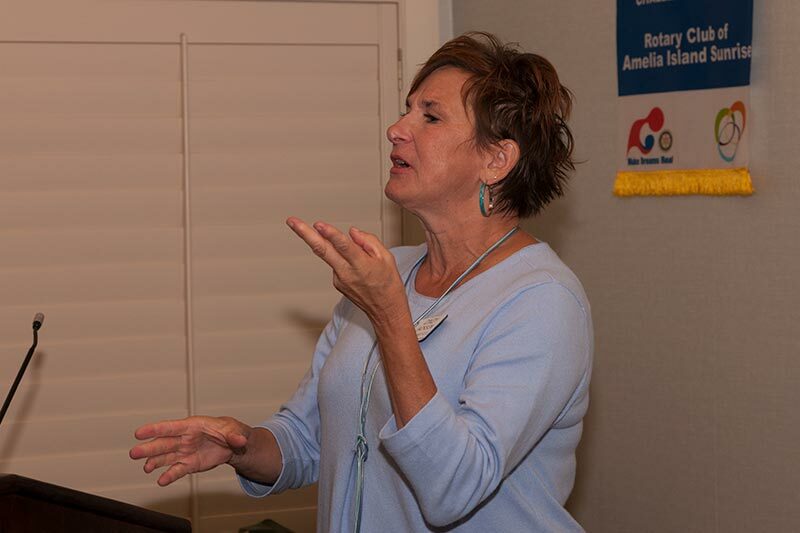 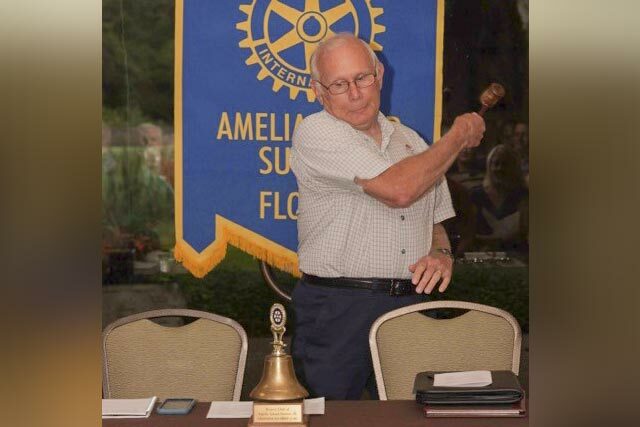 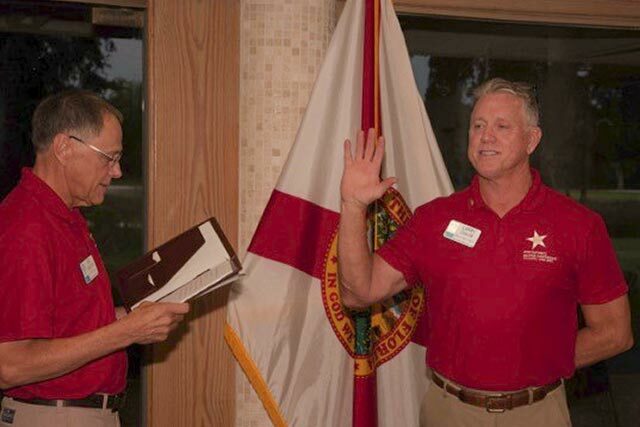 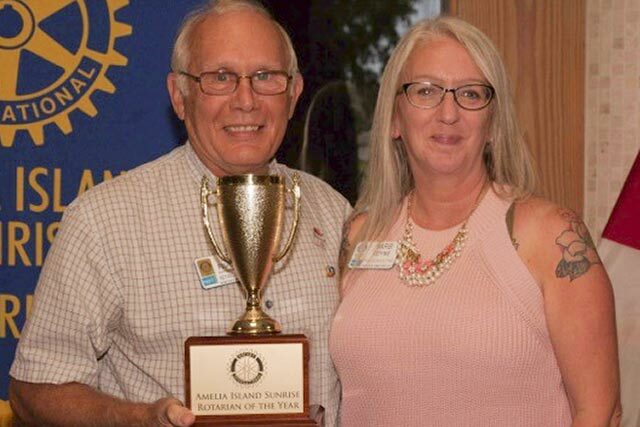 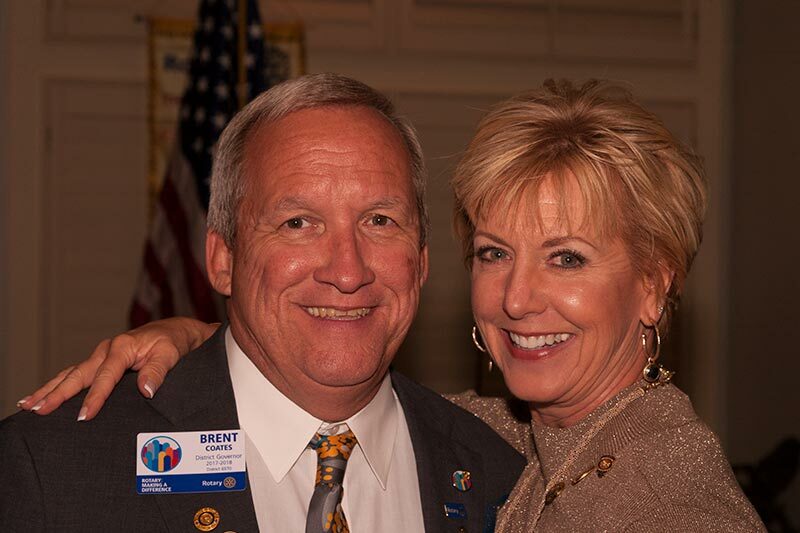 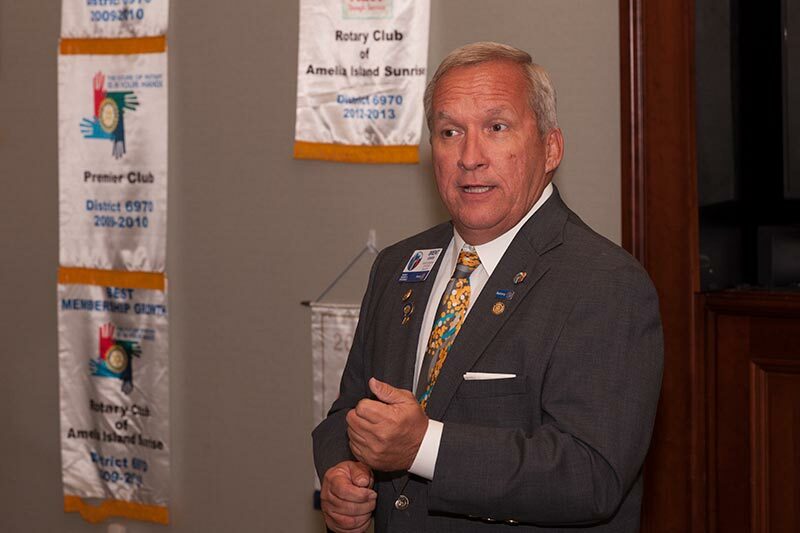 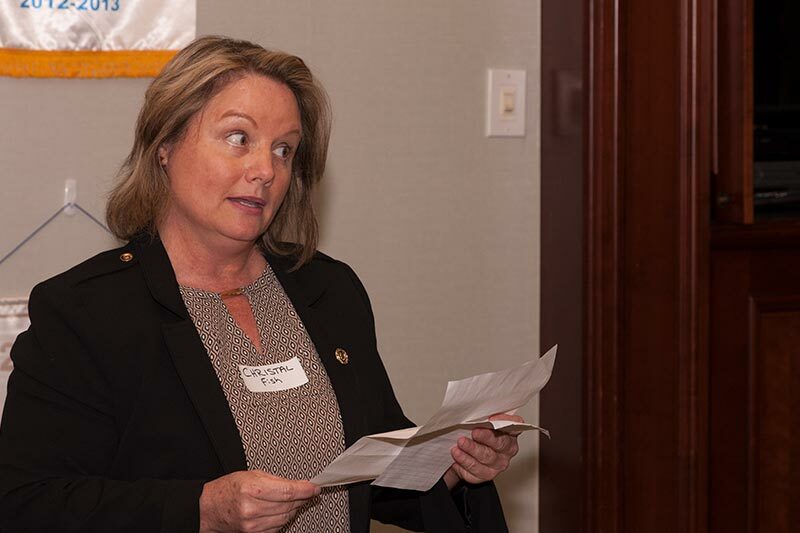 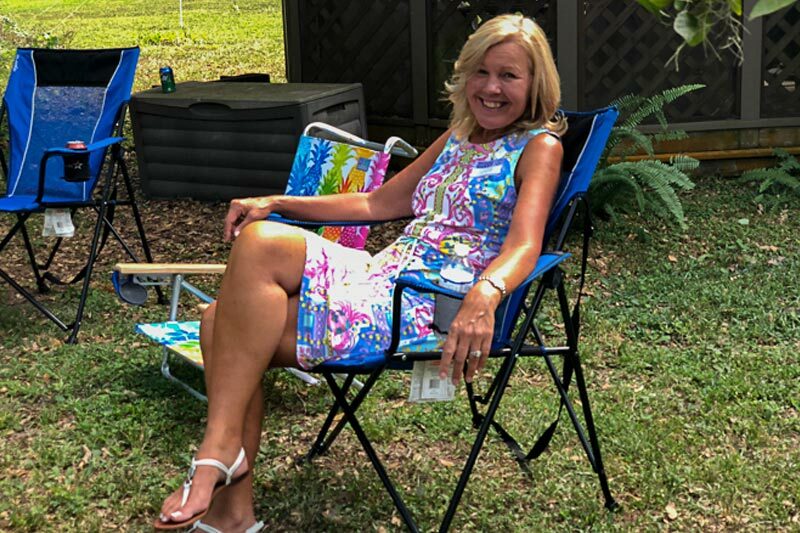 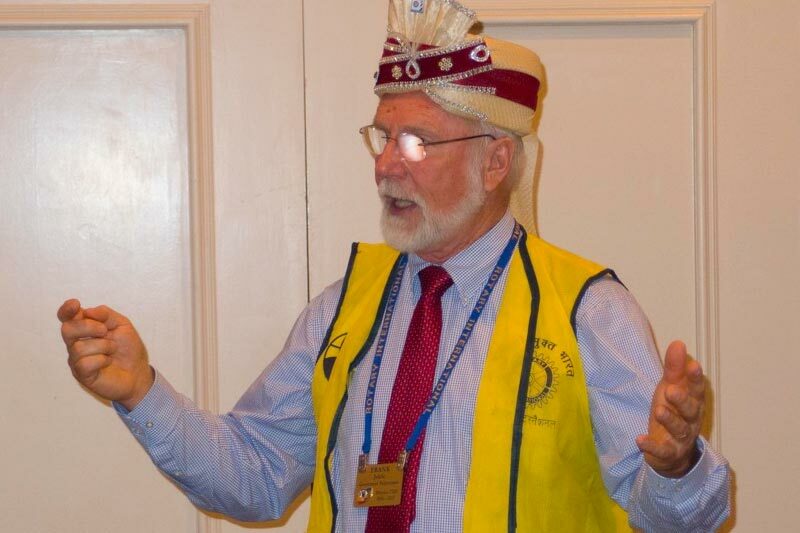 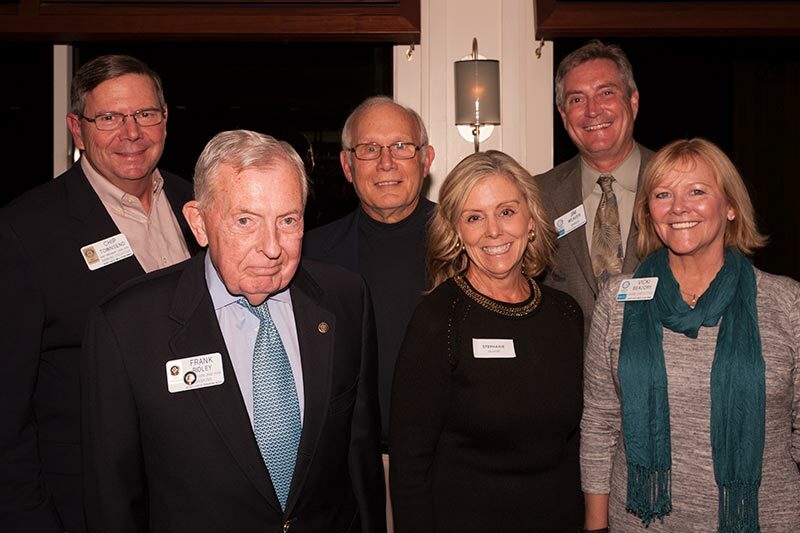 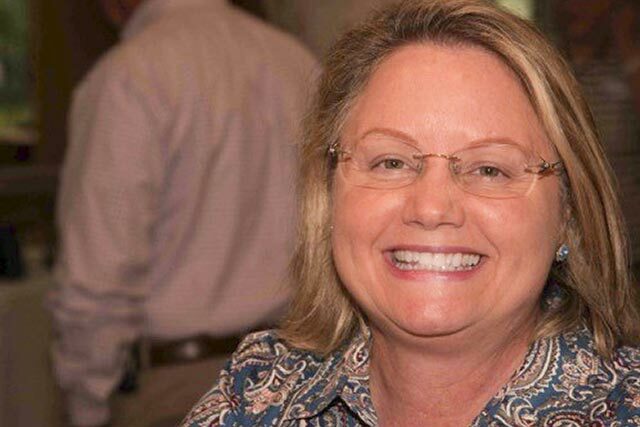 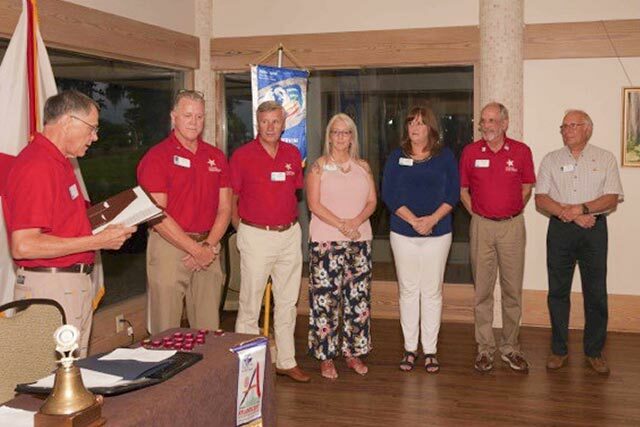 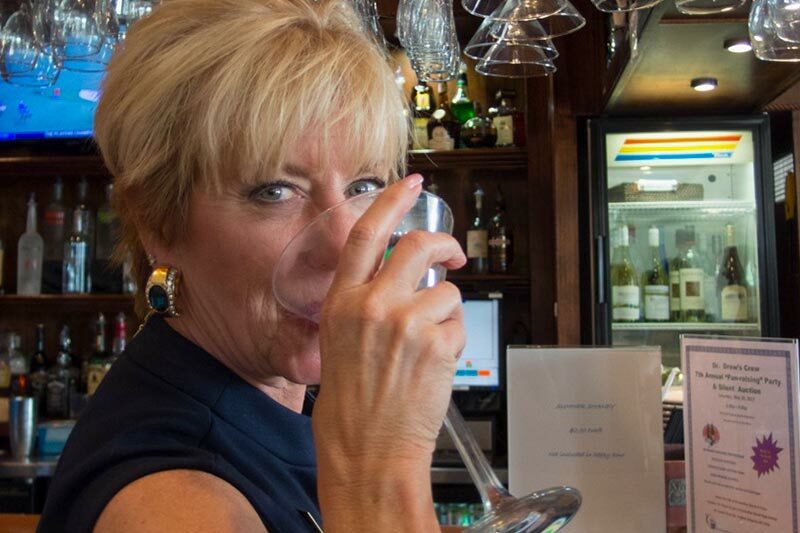 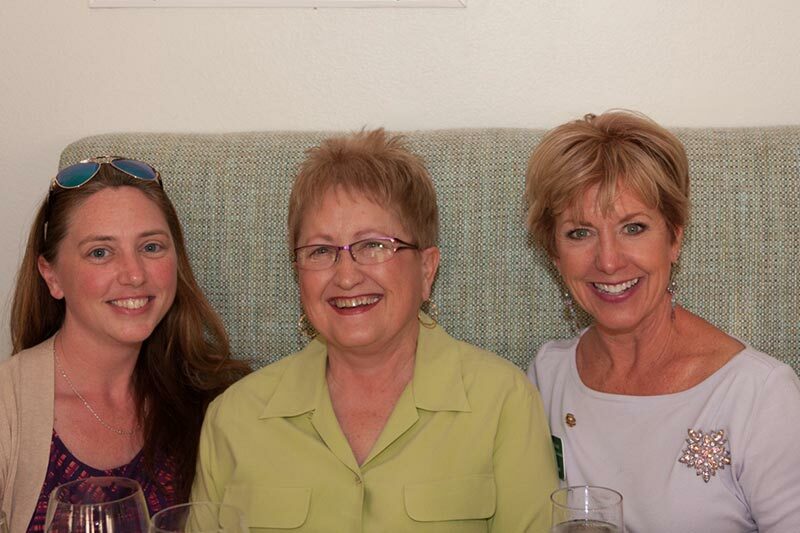 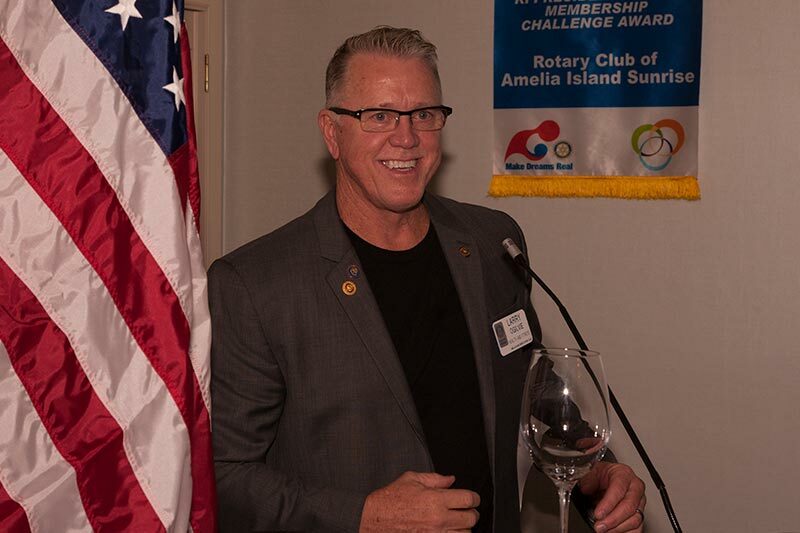 June 29 the new board of the Rotary Club of Amelia Island Sunrise took the helm. 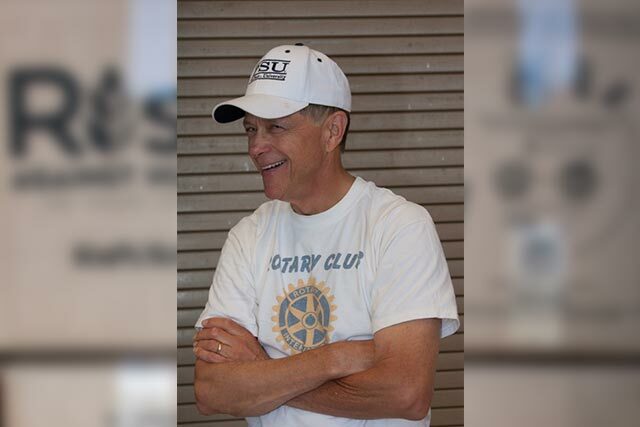 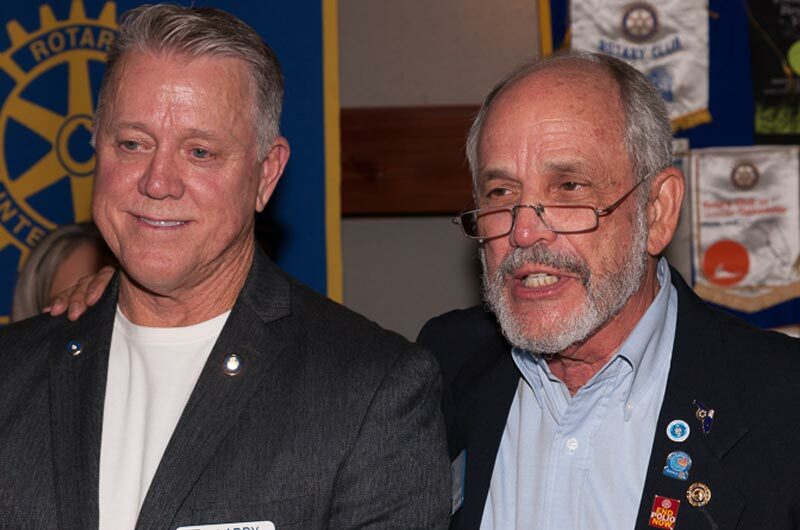 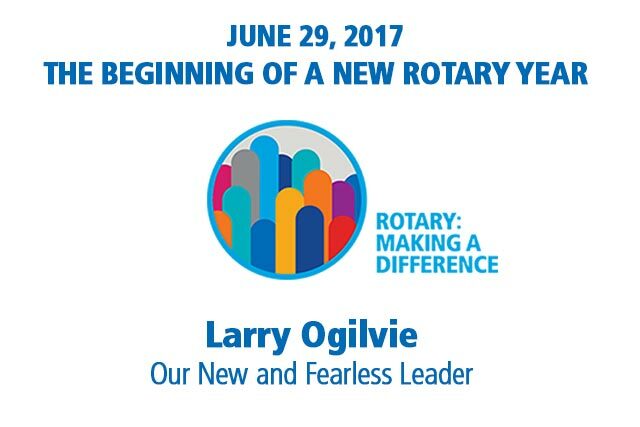 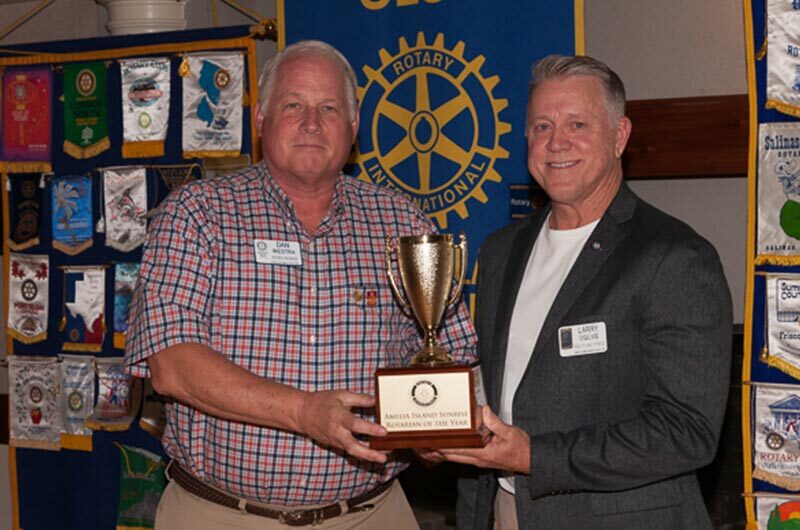 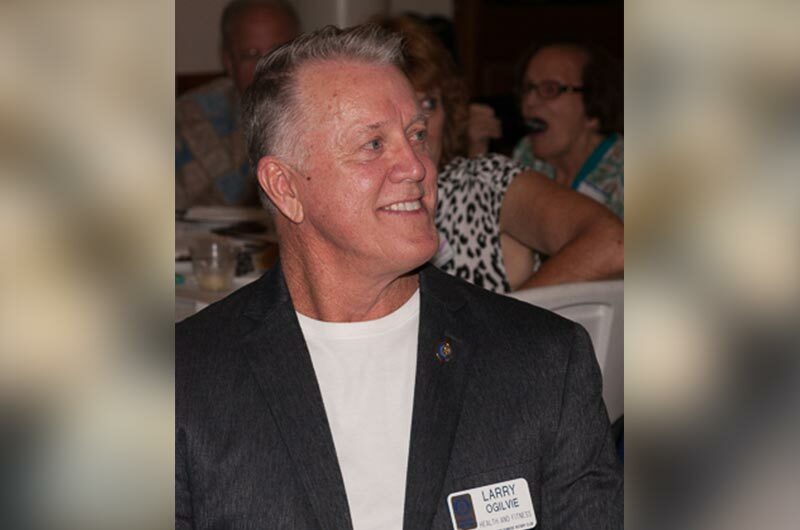 Congratulation to the 2017/2018 Rotary year club president Larry Oglivie and thank you for a great year to the outgoing President Stanley Fishburn. 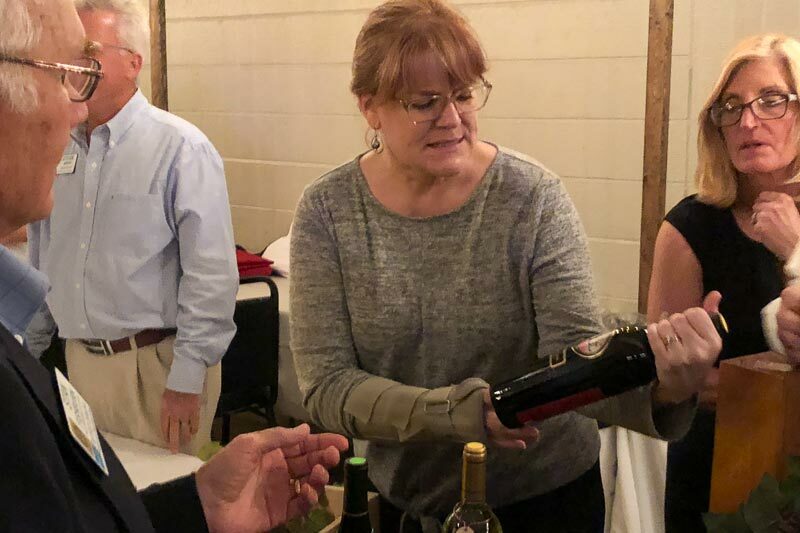 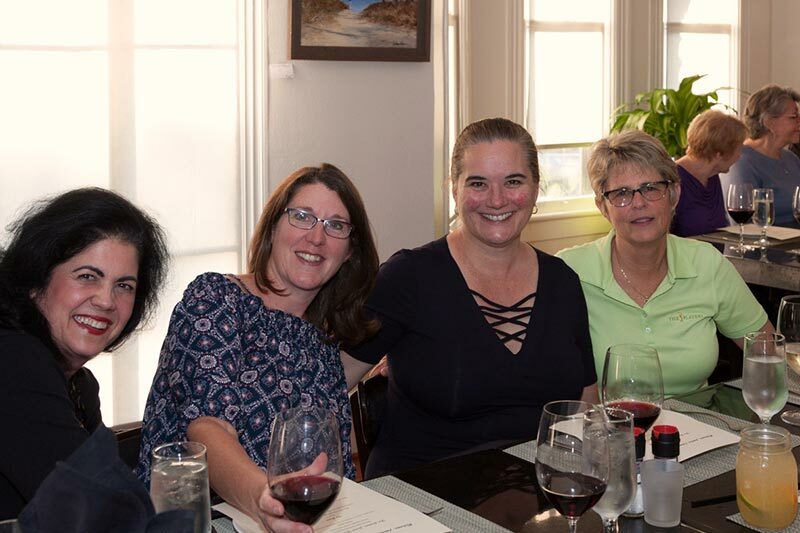 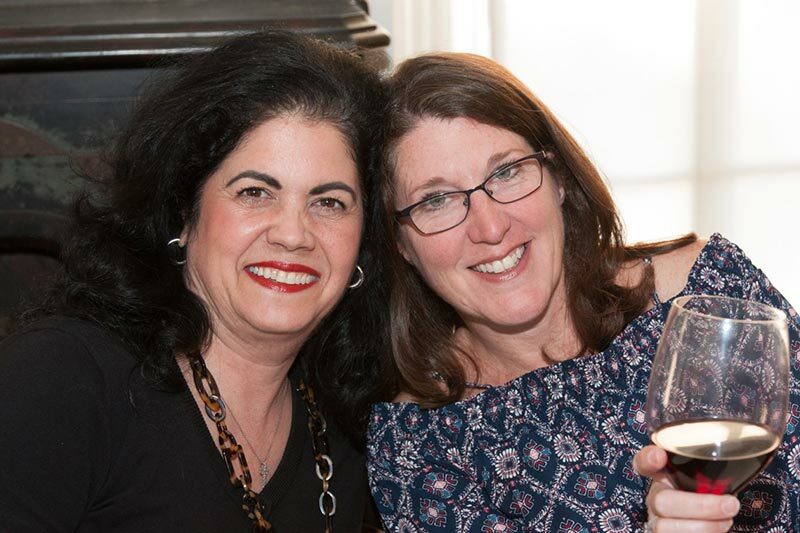 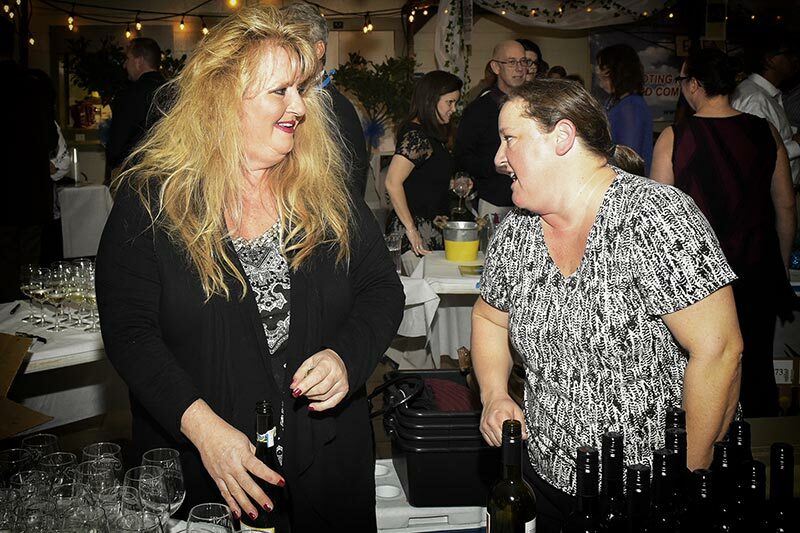 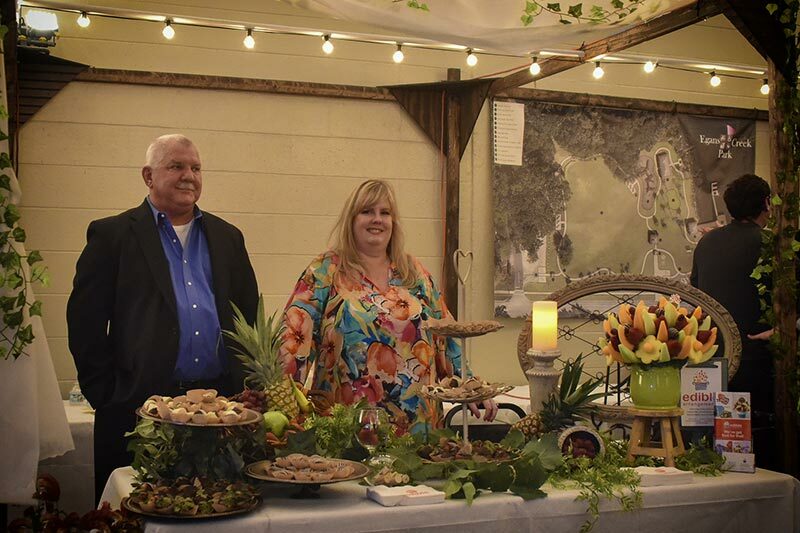 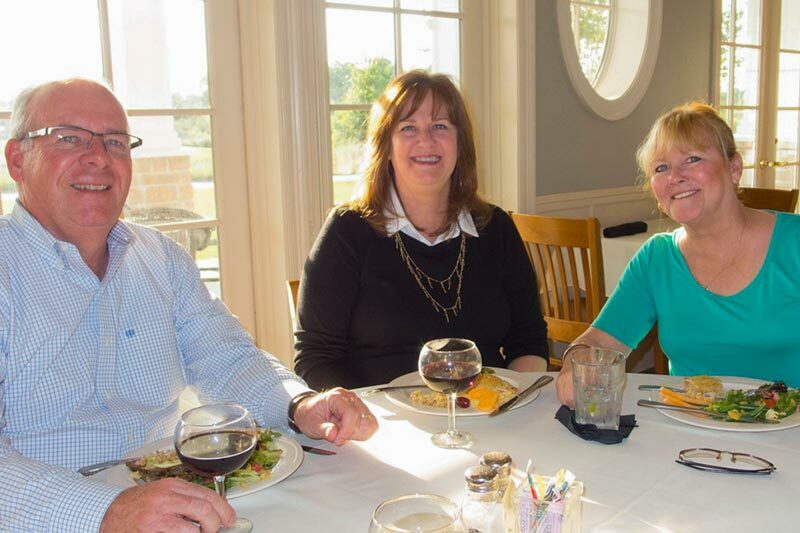 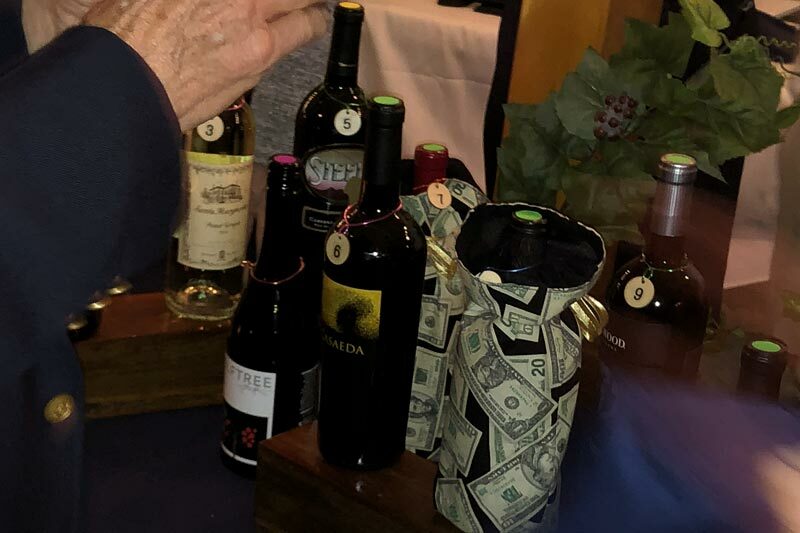 Club members and guests enjoyed another social dinner at a 2017 wine event sponsor restaurant. 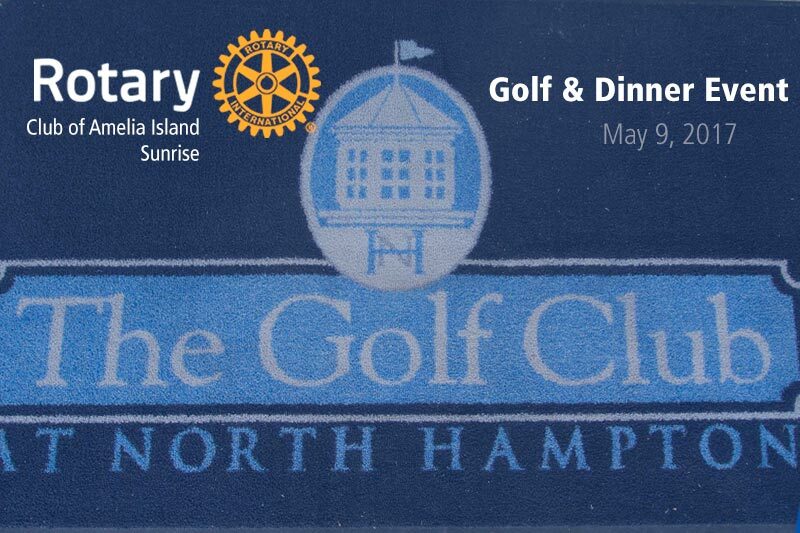 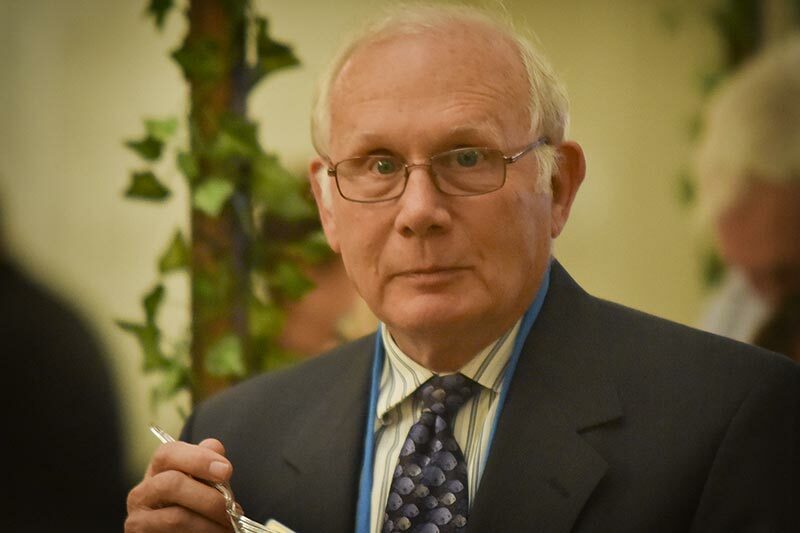 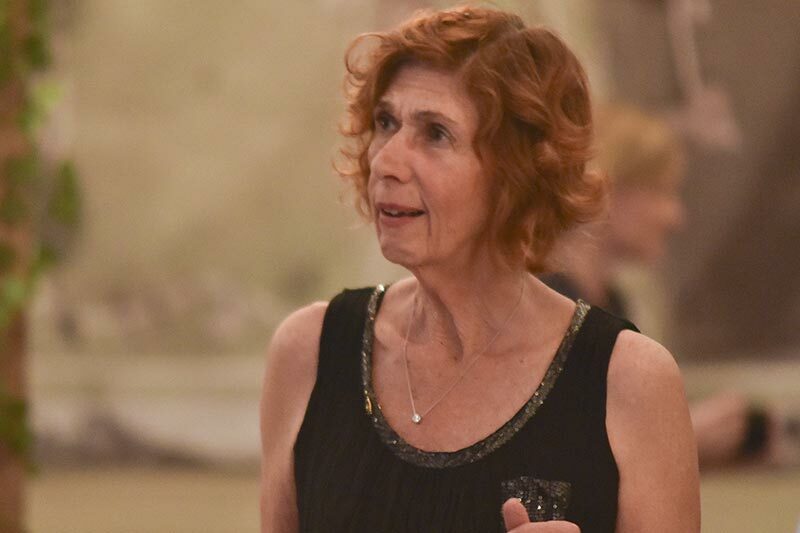 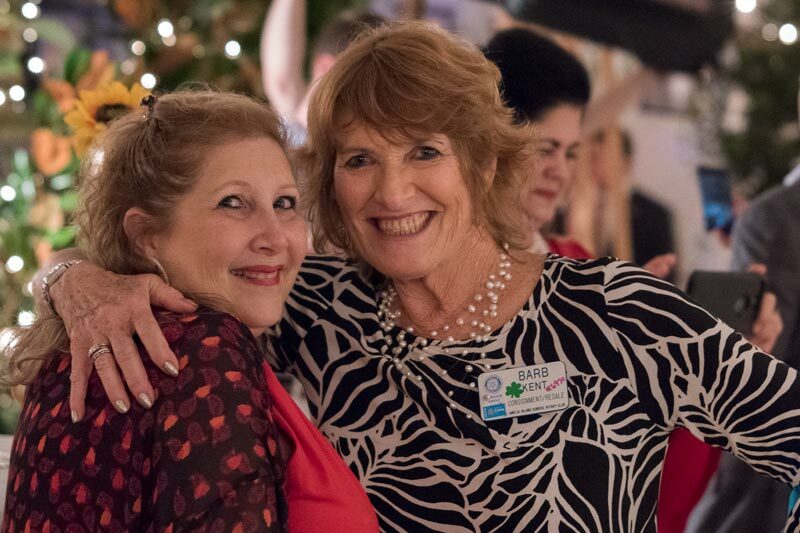 On May 9th, 32 members and guests met at the North Hampton Golf Club for an excellent dinner. 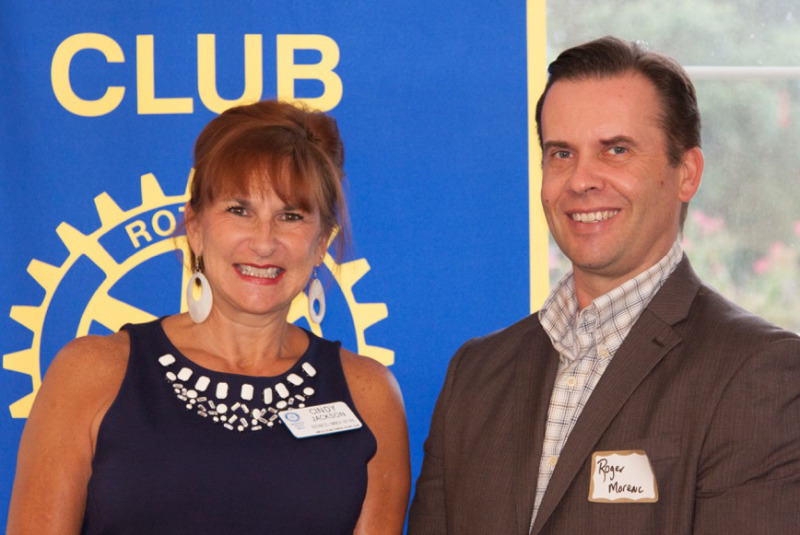 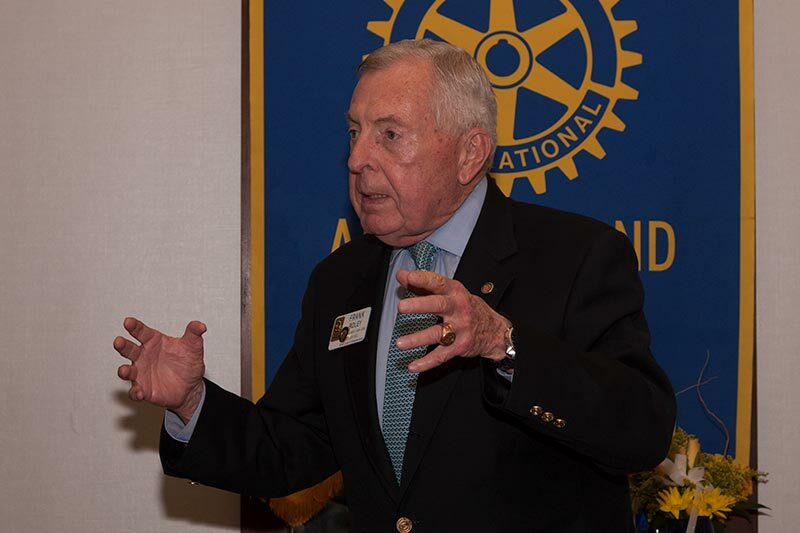 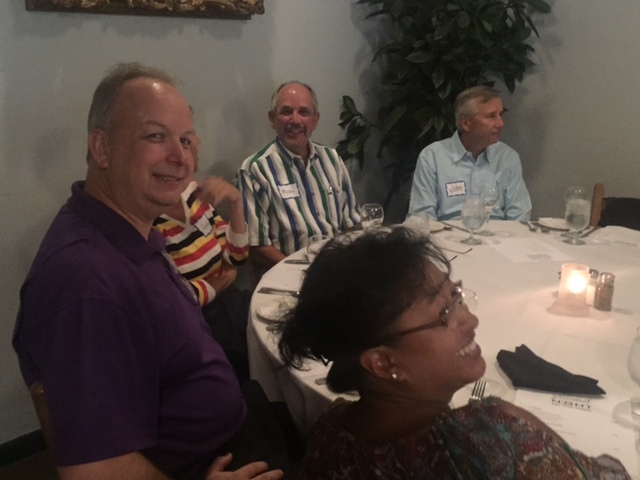 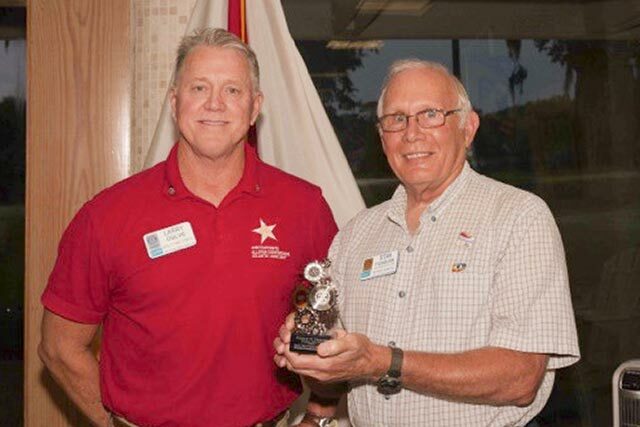 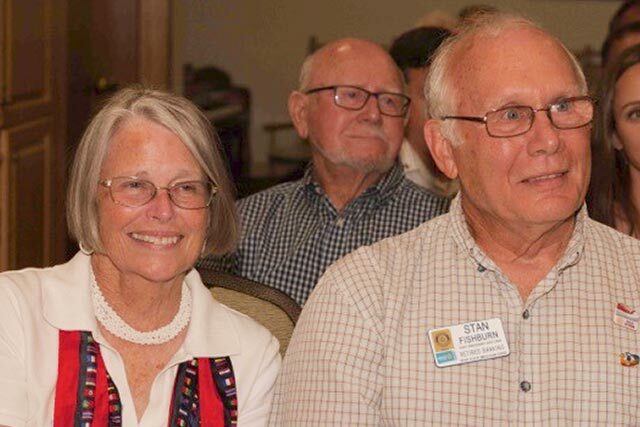 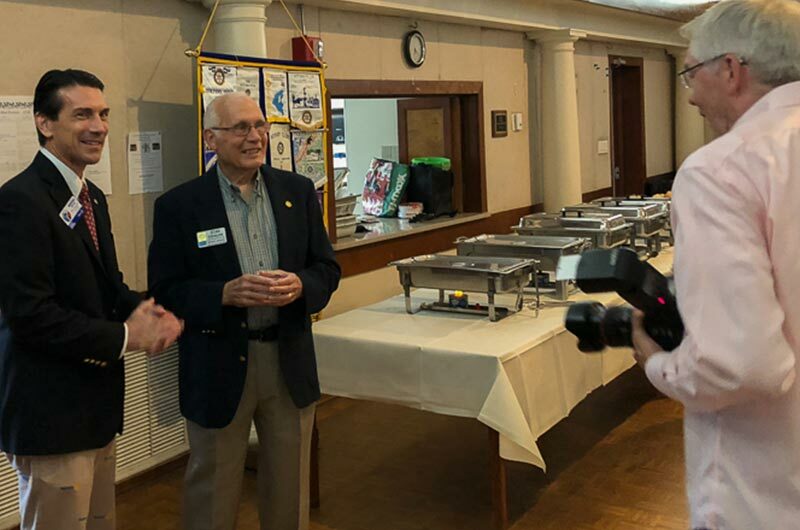 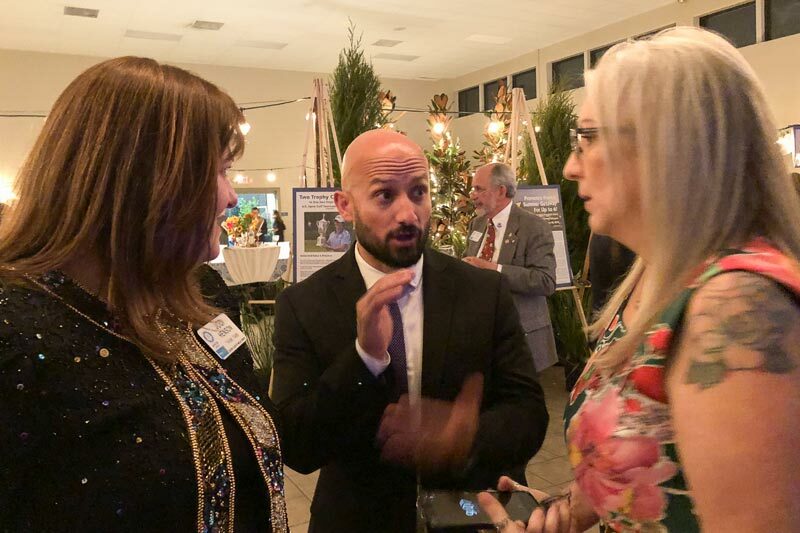 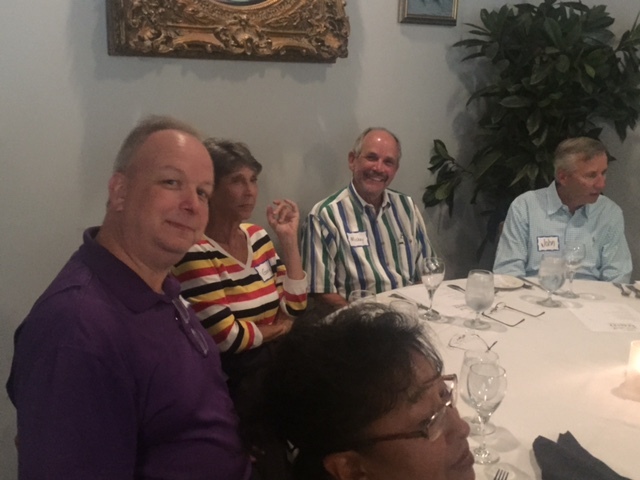 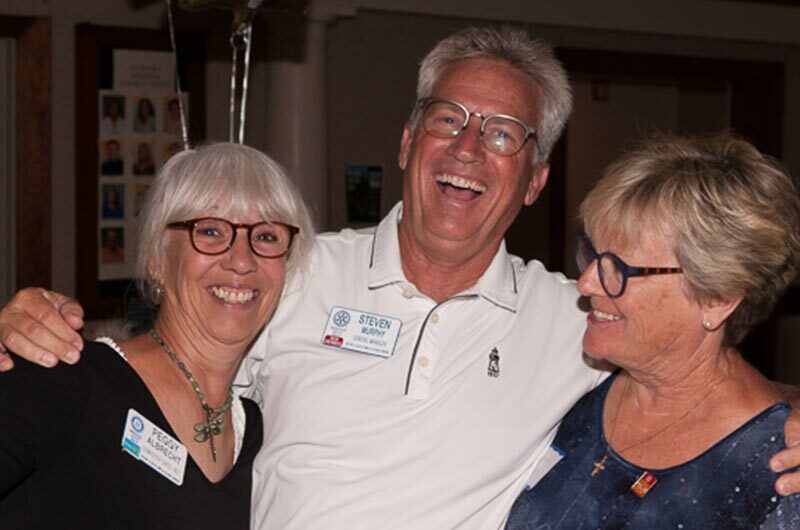 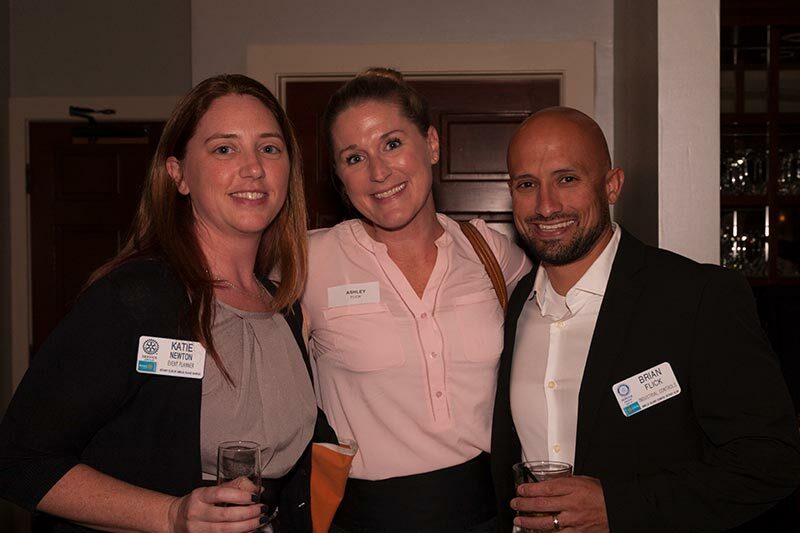 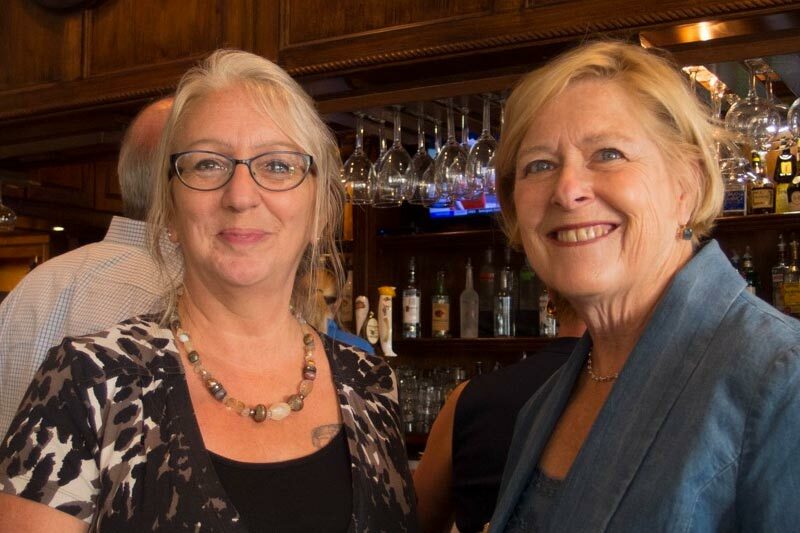 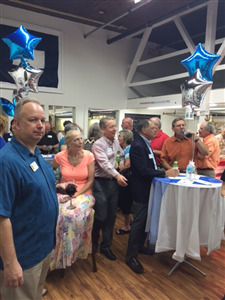 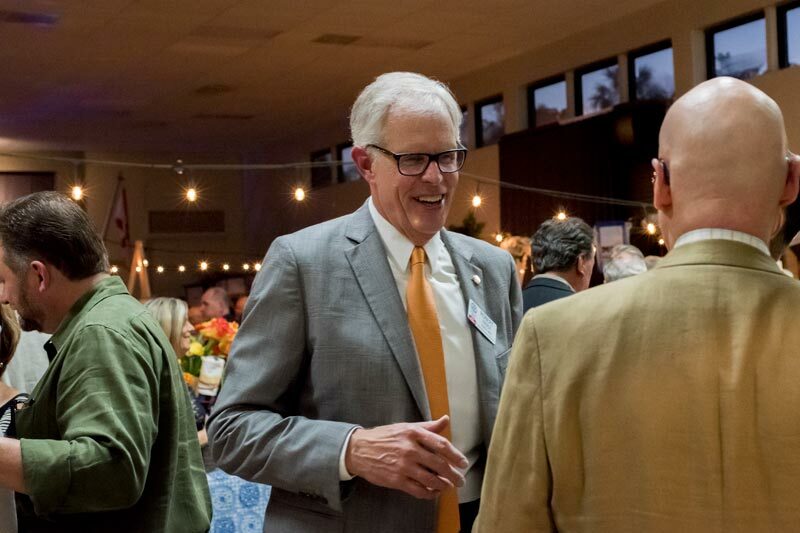 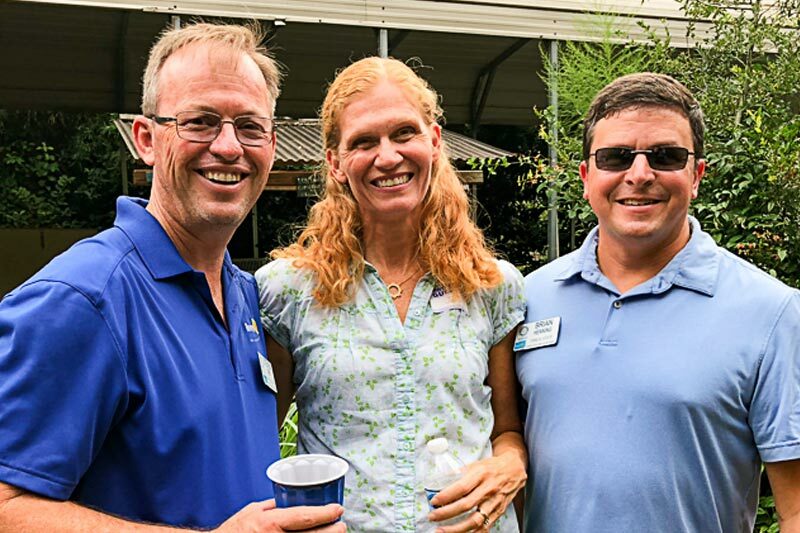 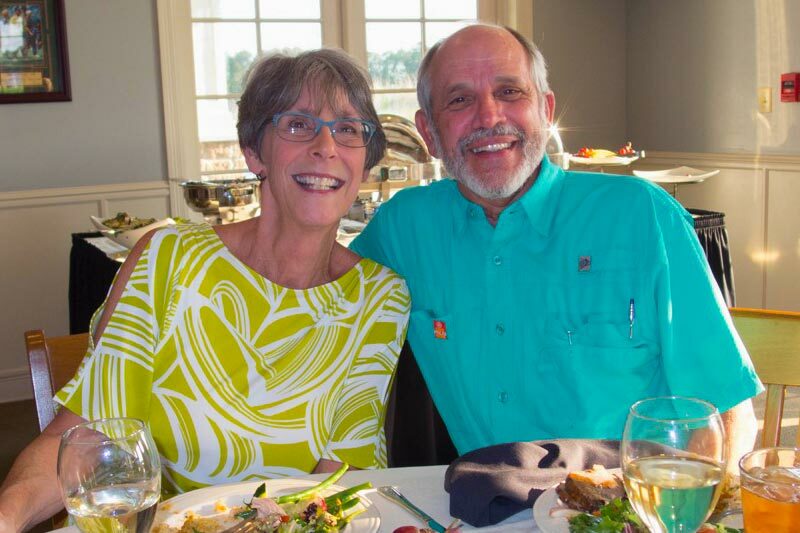 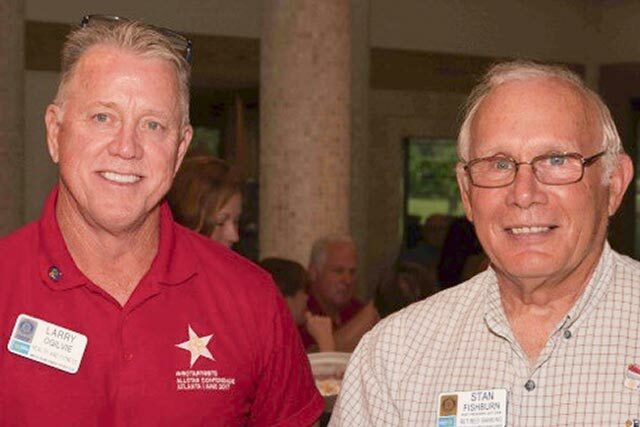 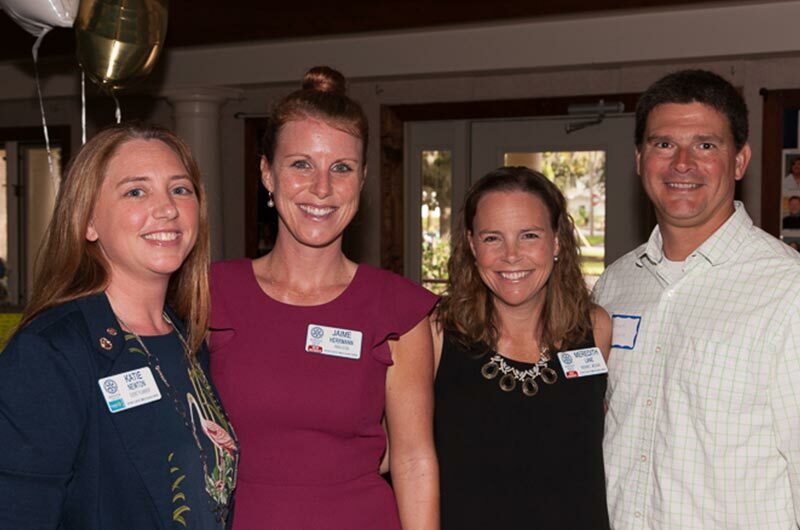 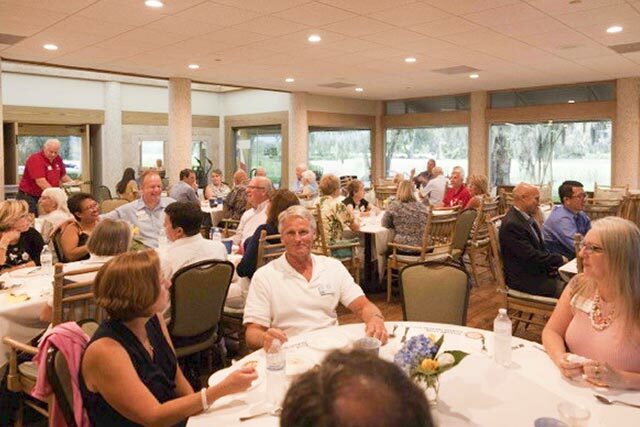 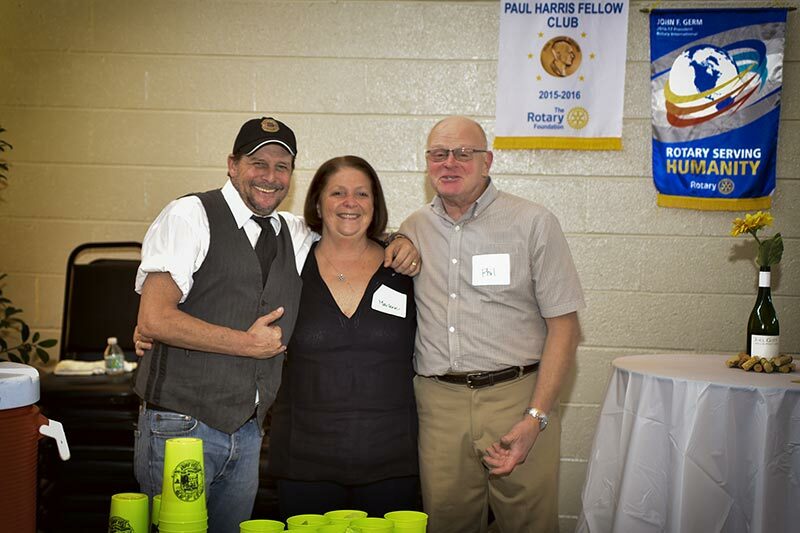 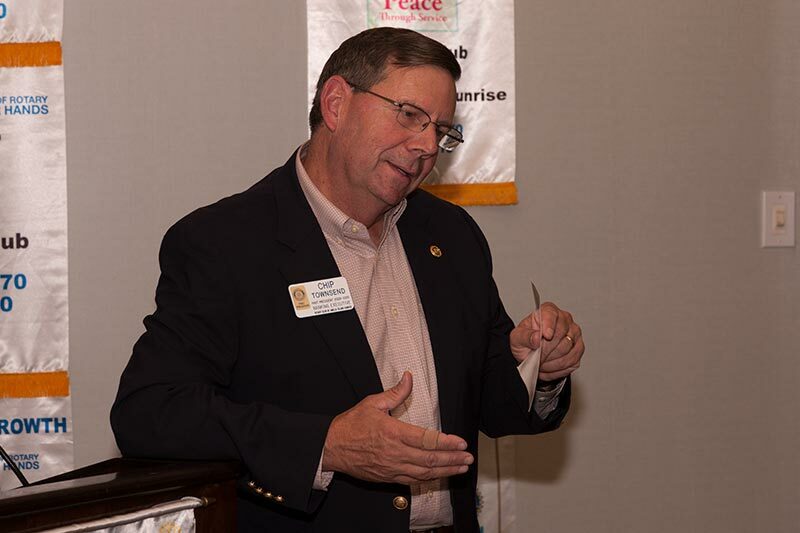 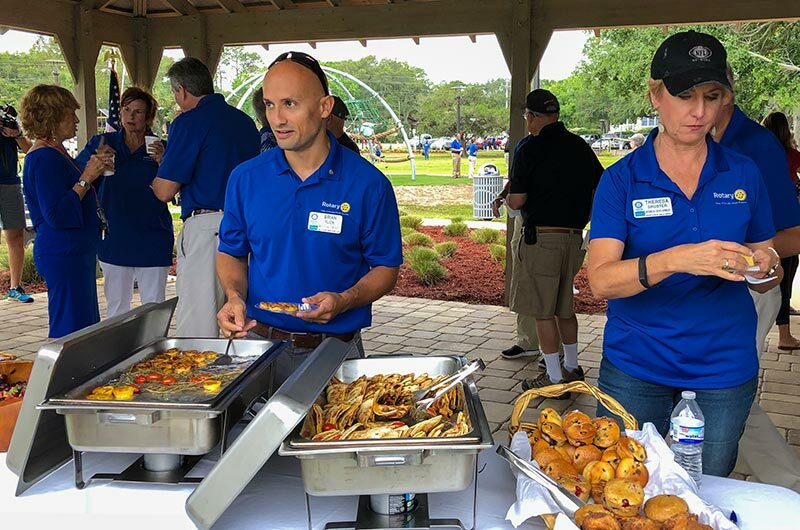 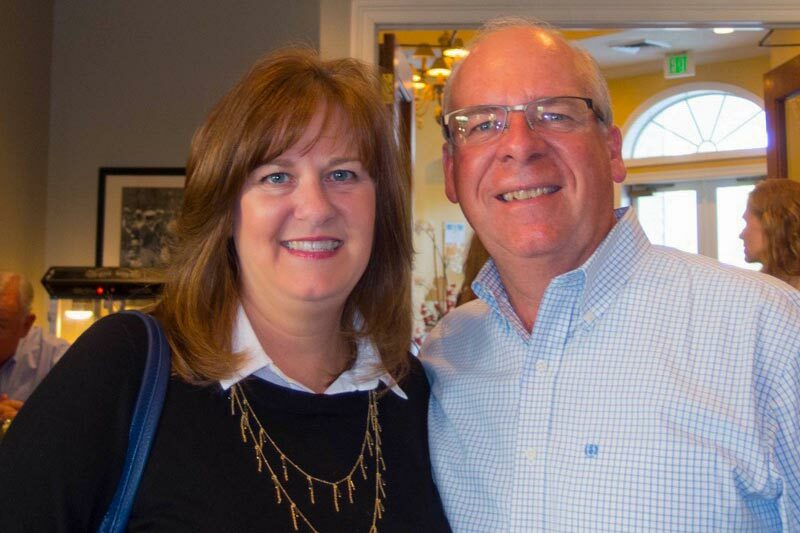 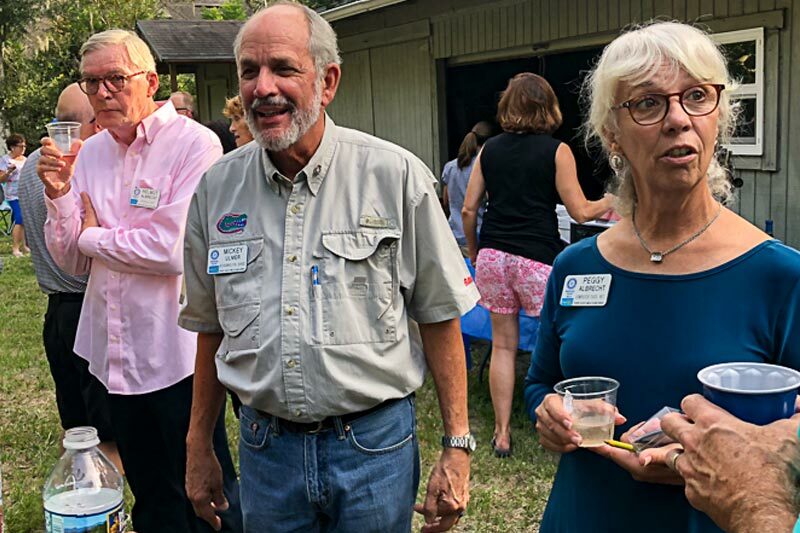 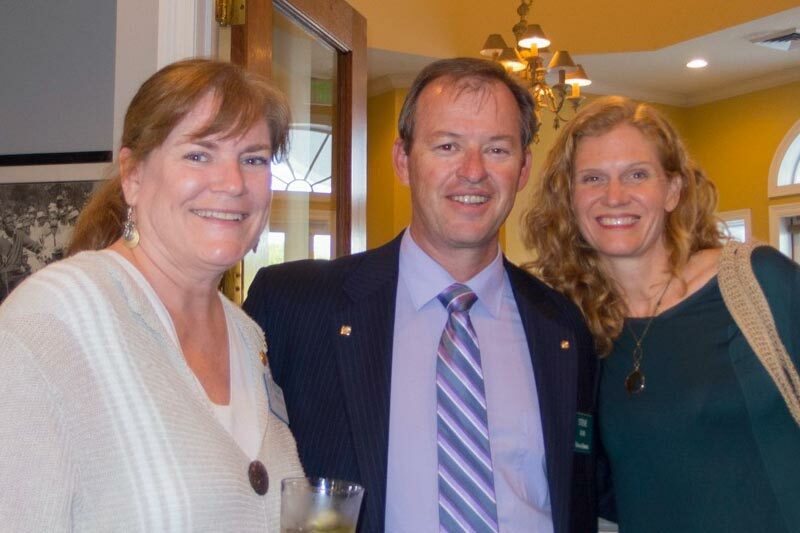 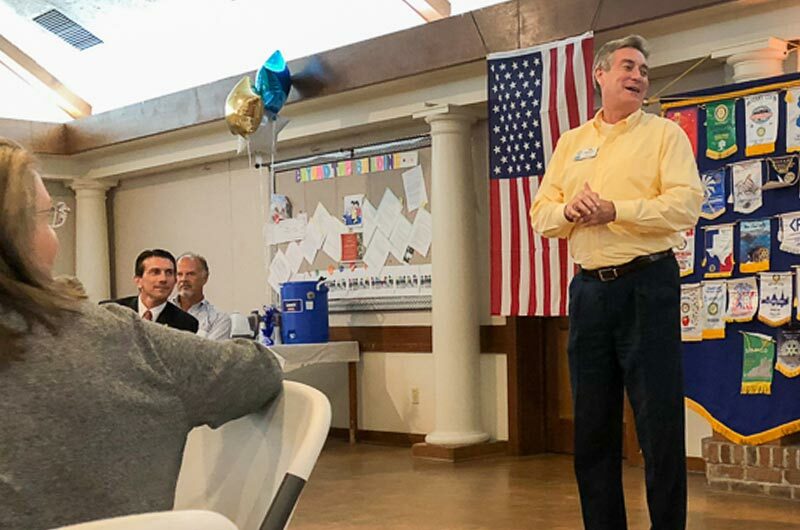 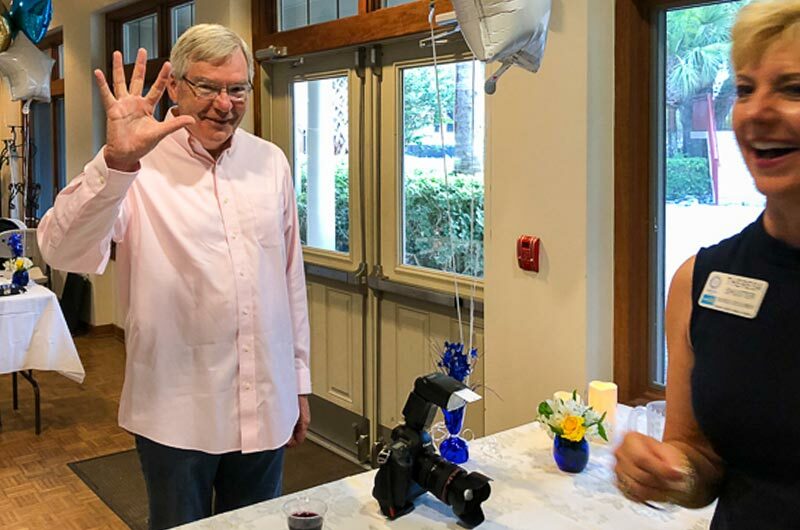 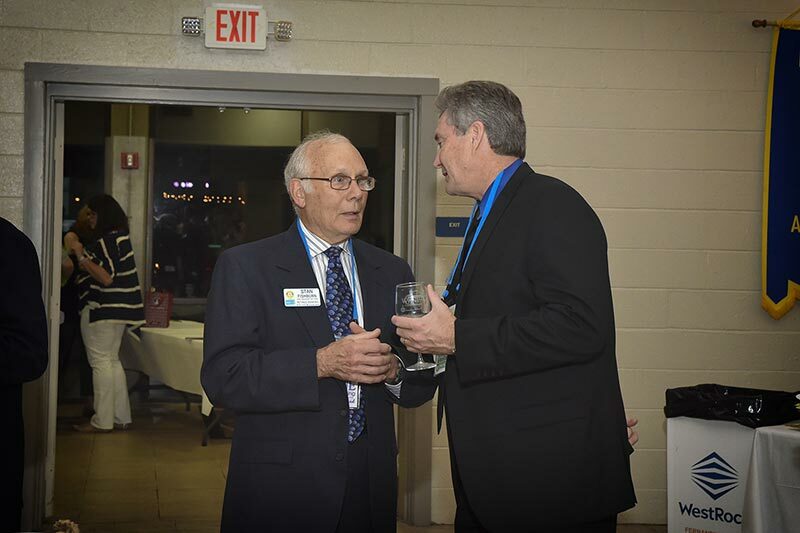 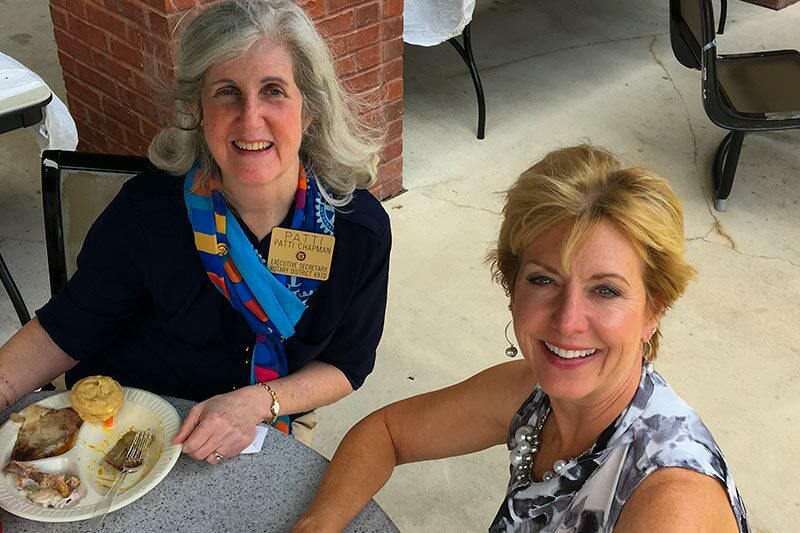 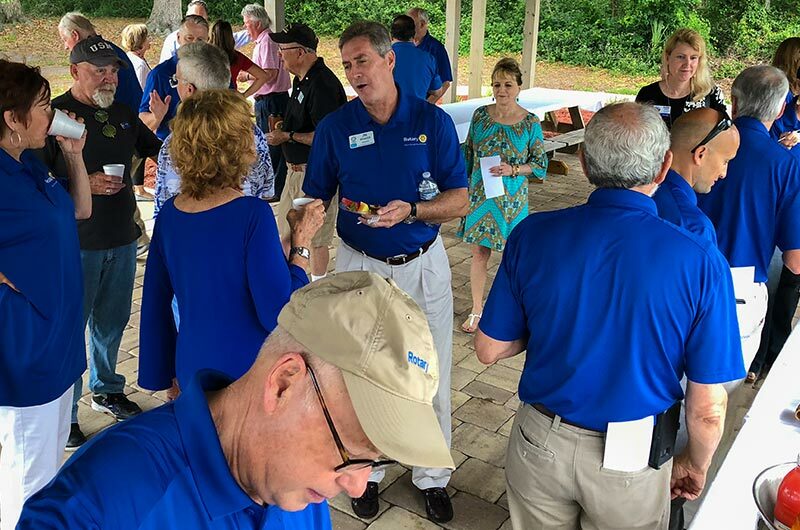 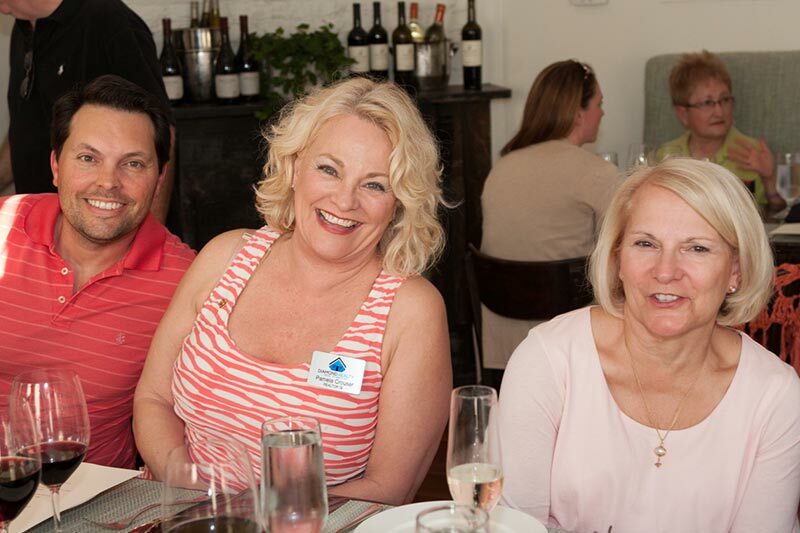 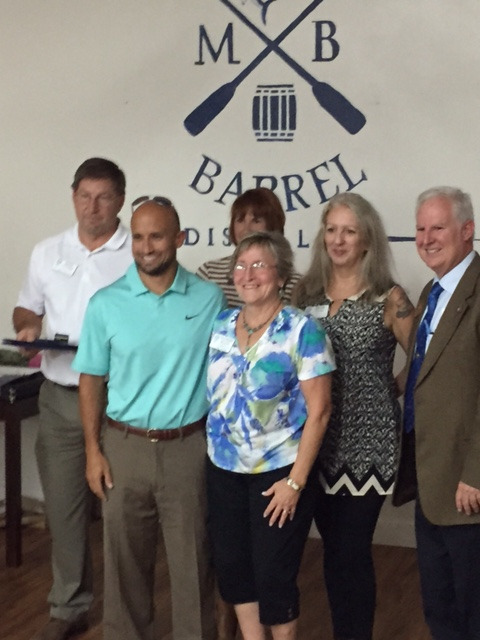 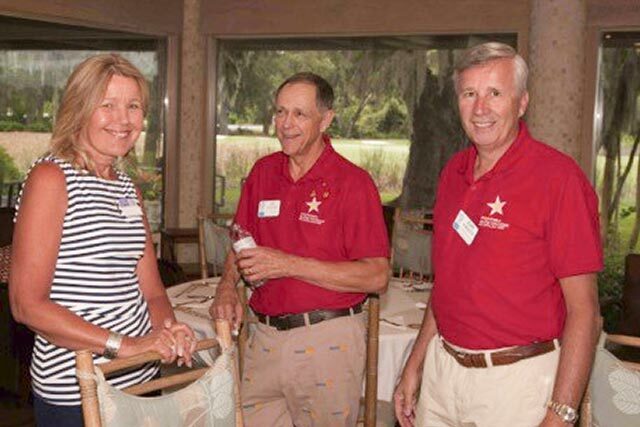 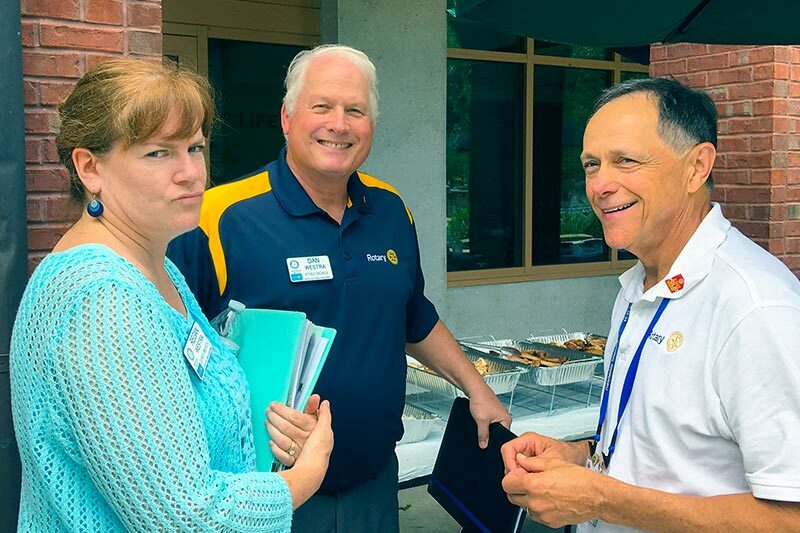 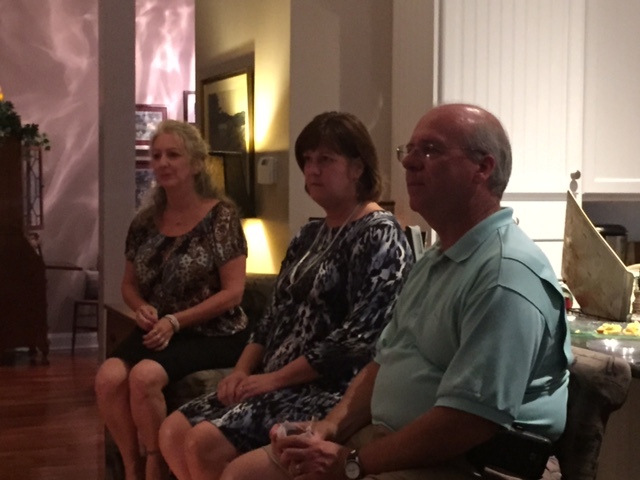 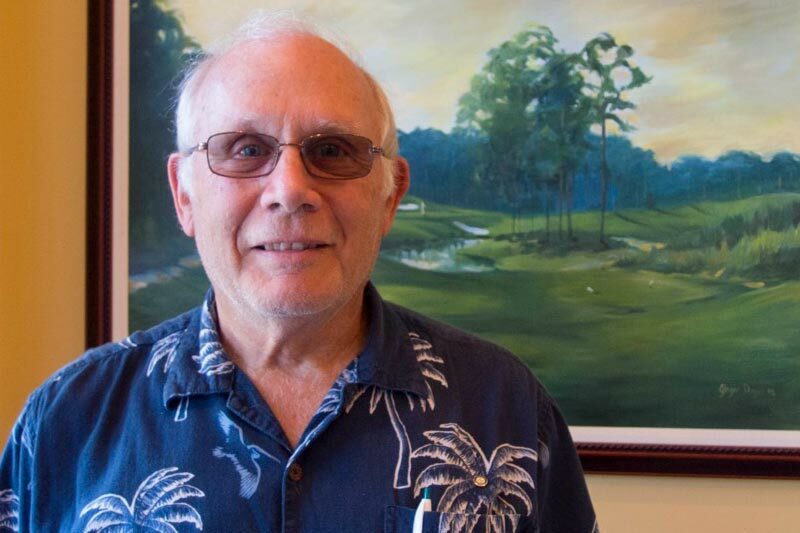 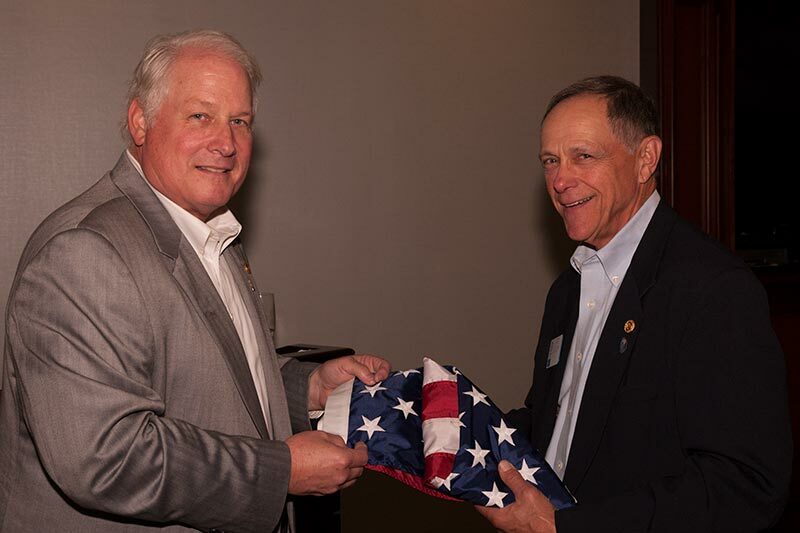 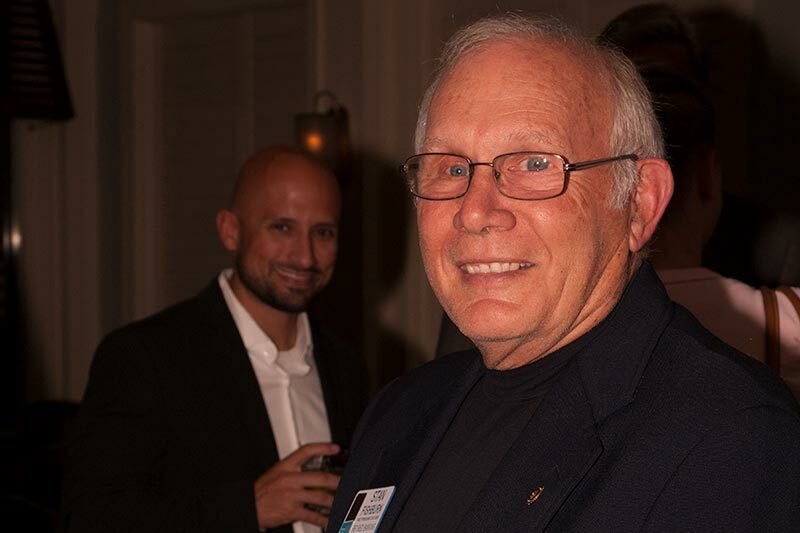 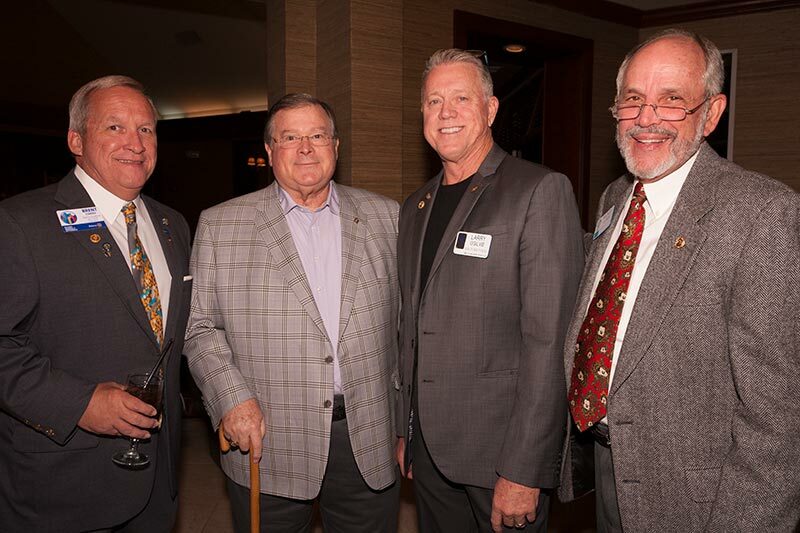 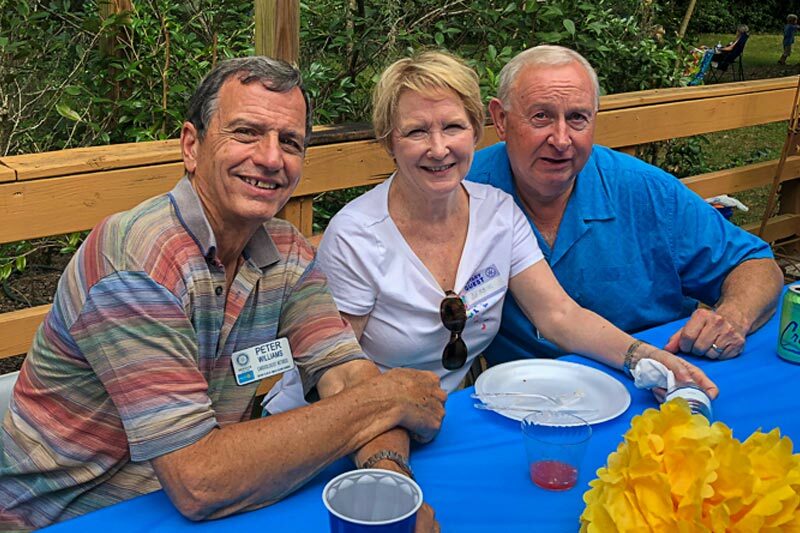 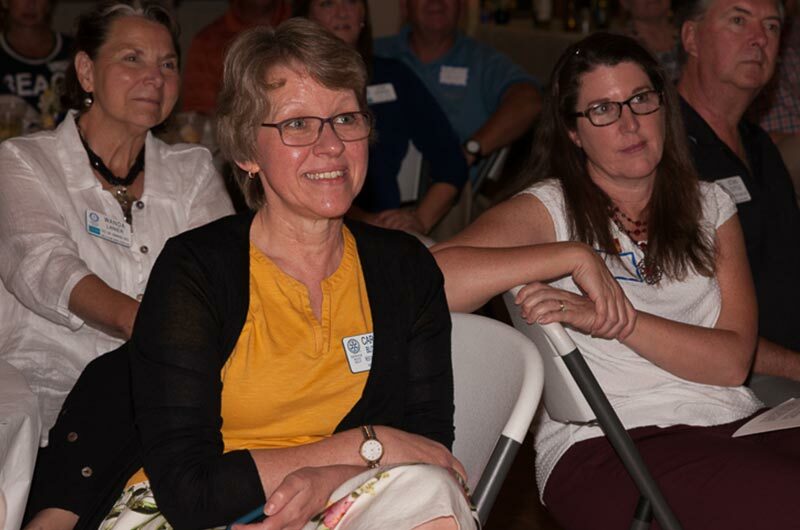 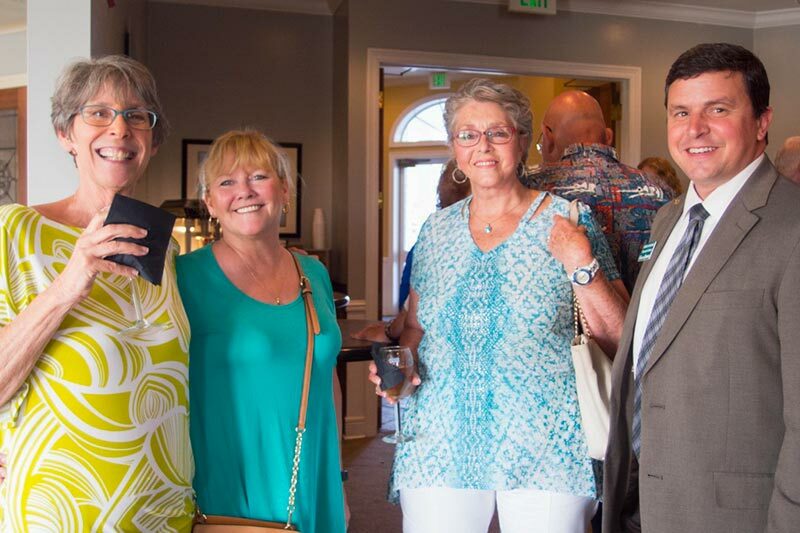 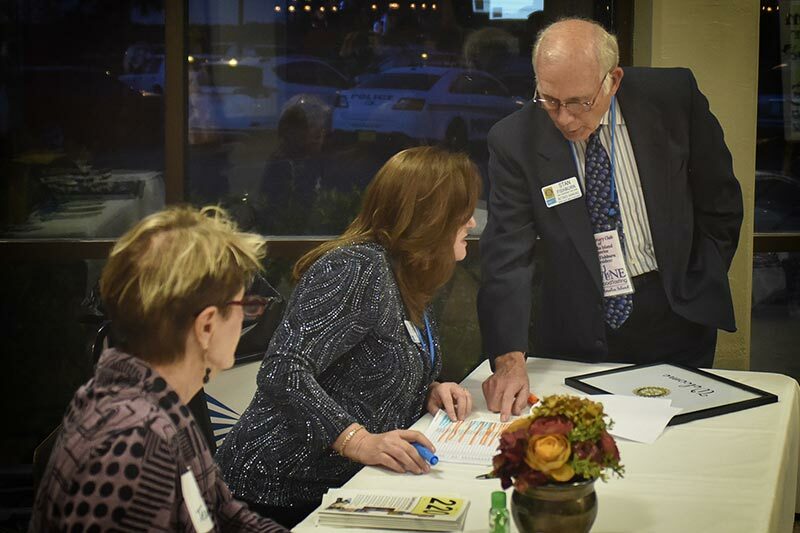 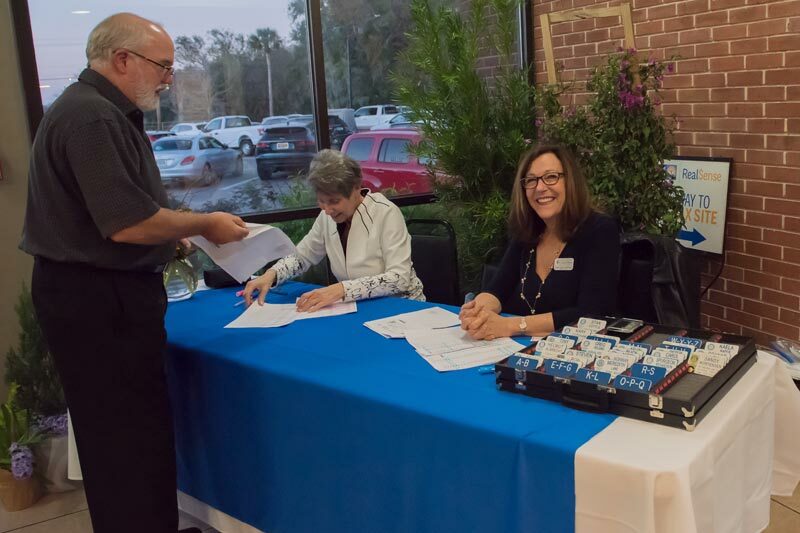 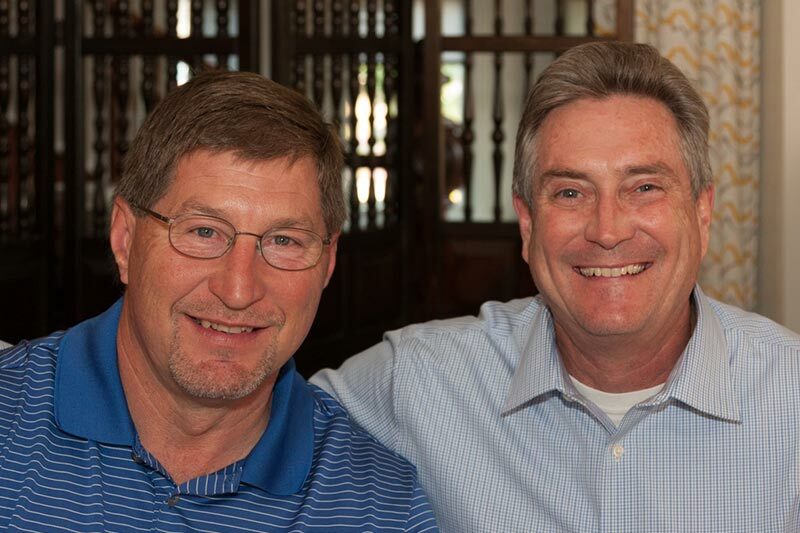 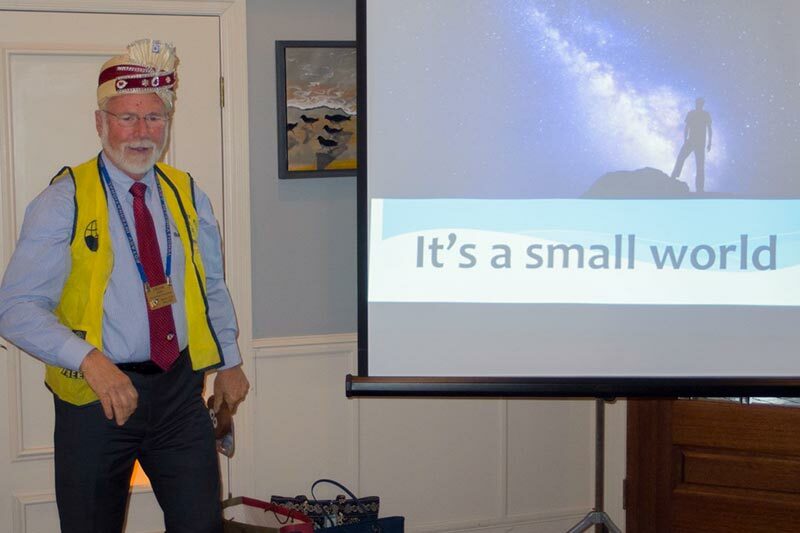 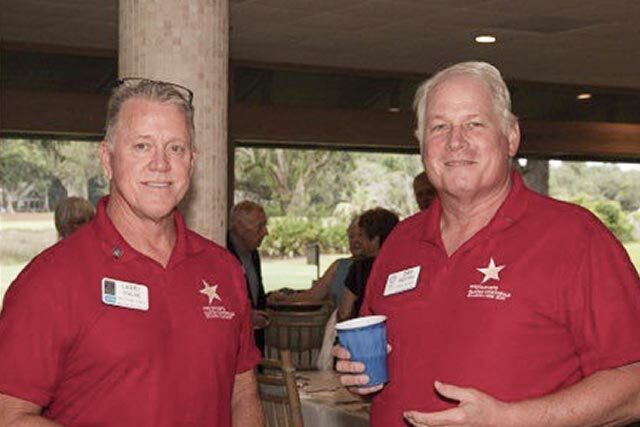 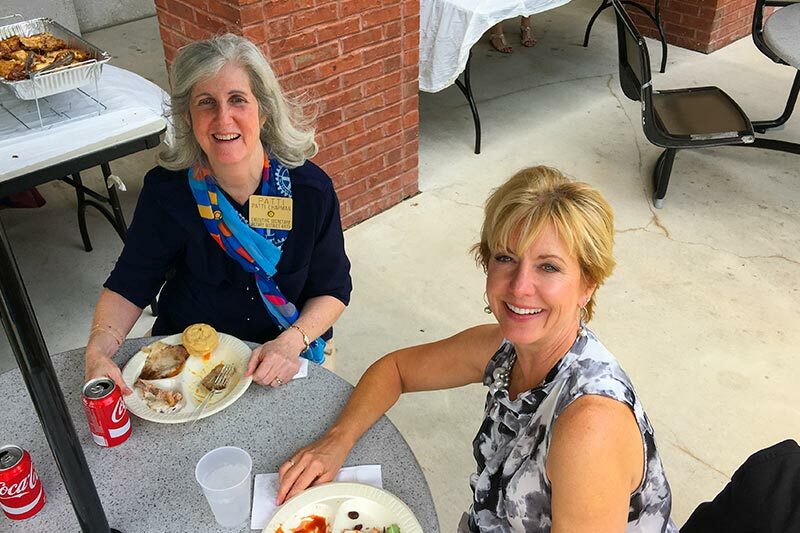 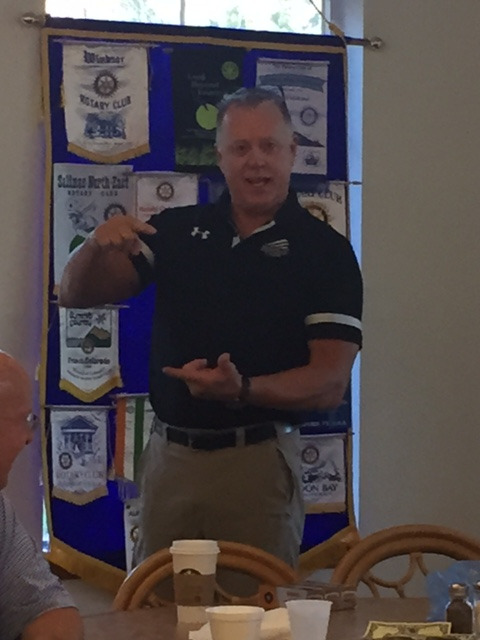 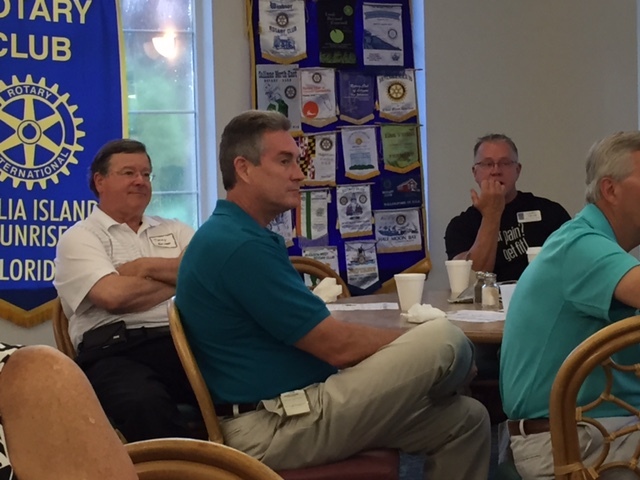 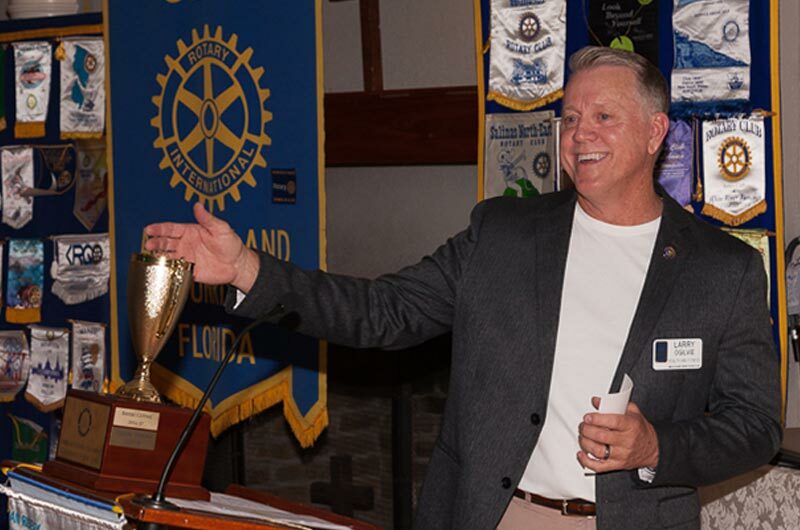 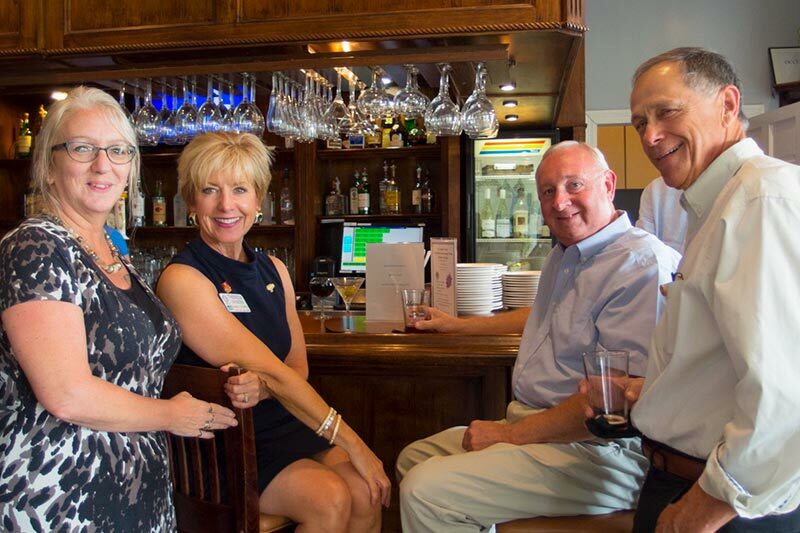 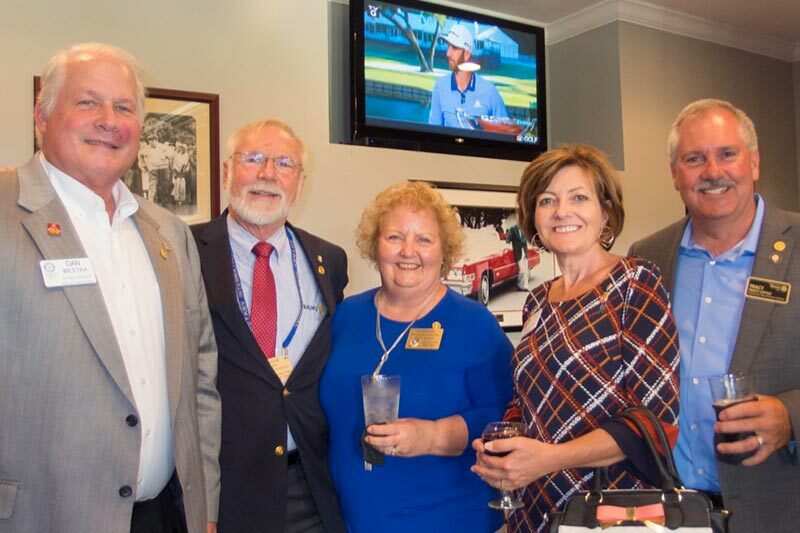 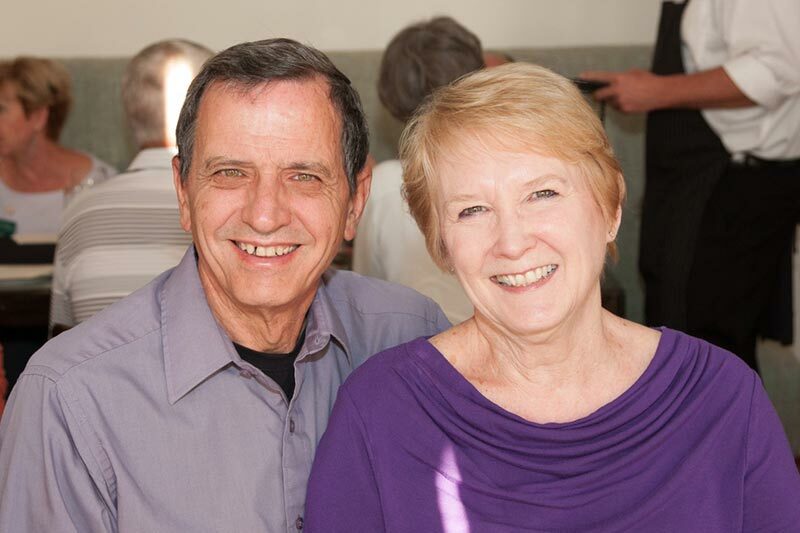 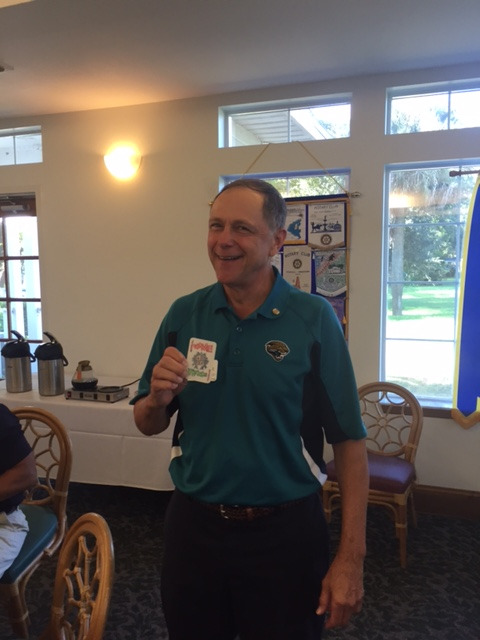 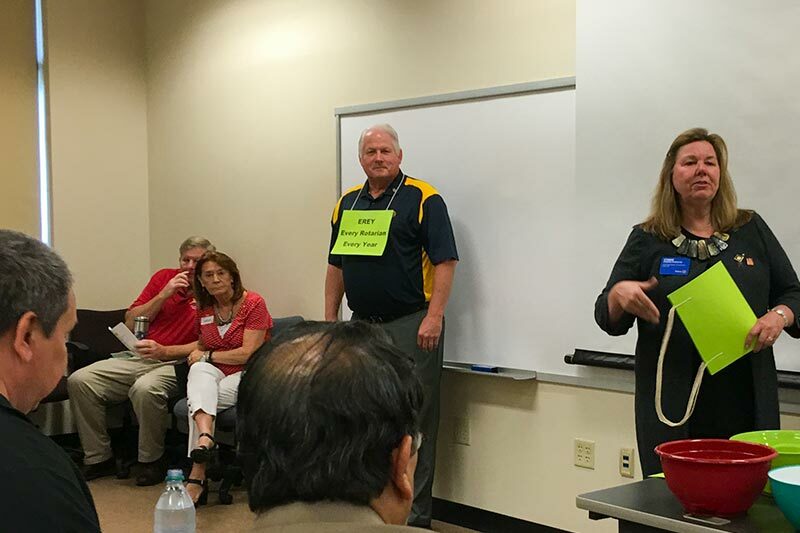 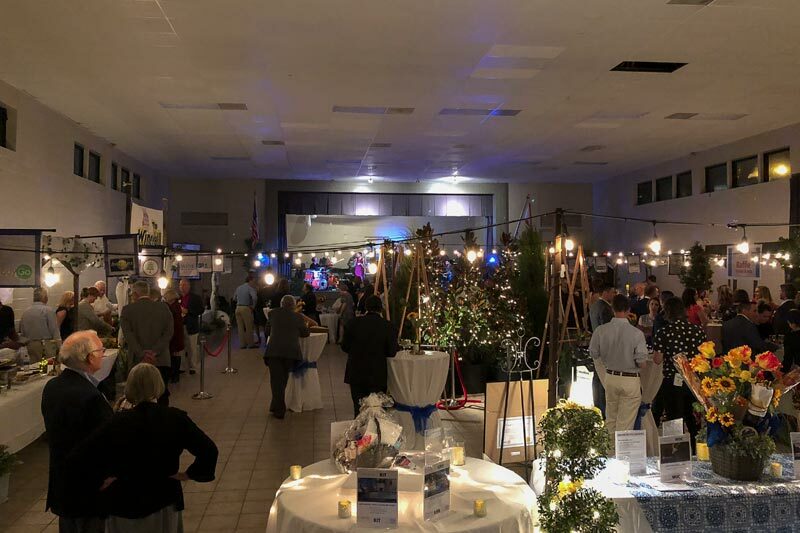 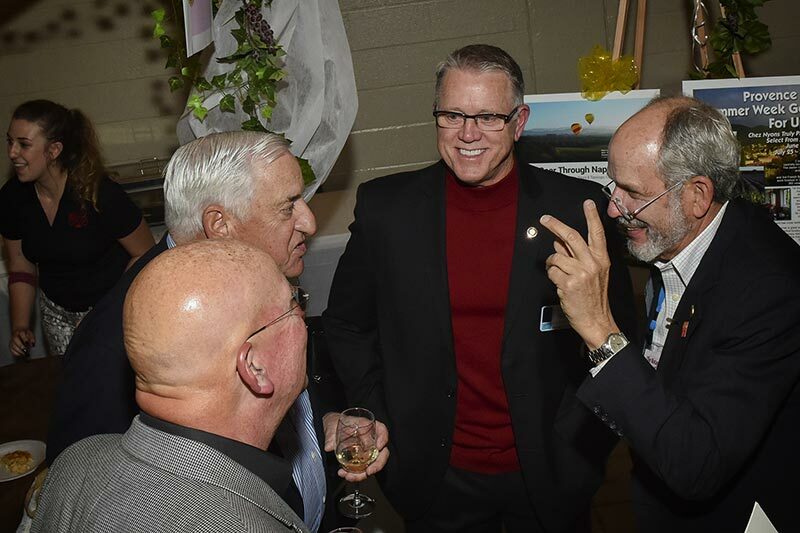 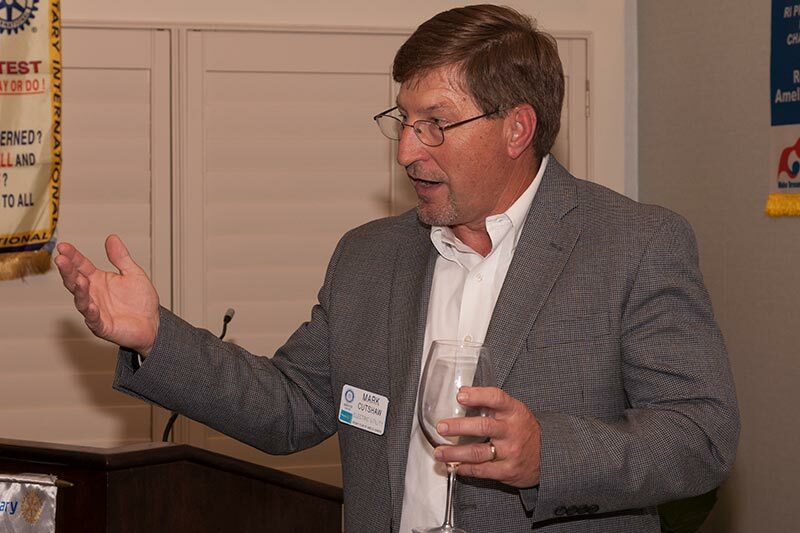 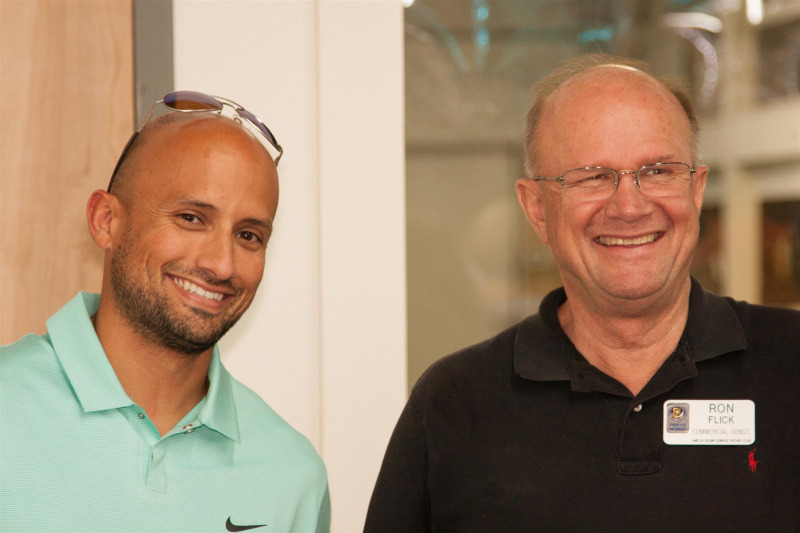 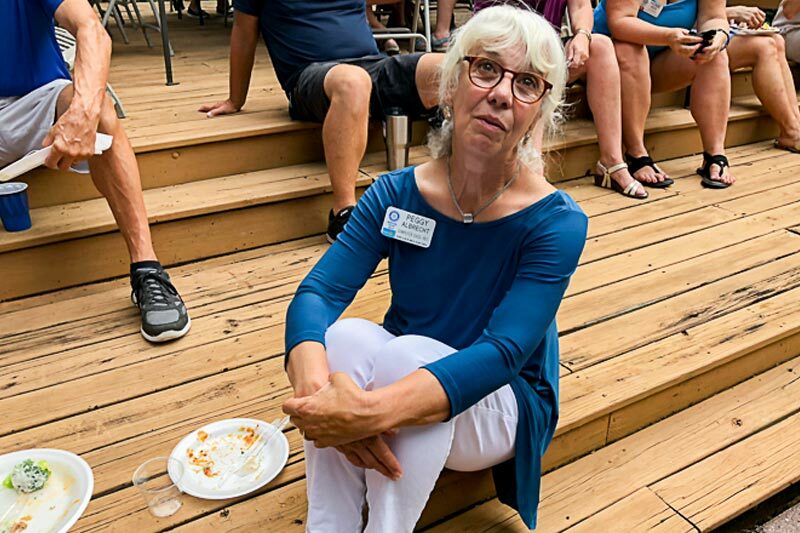 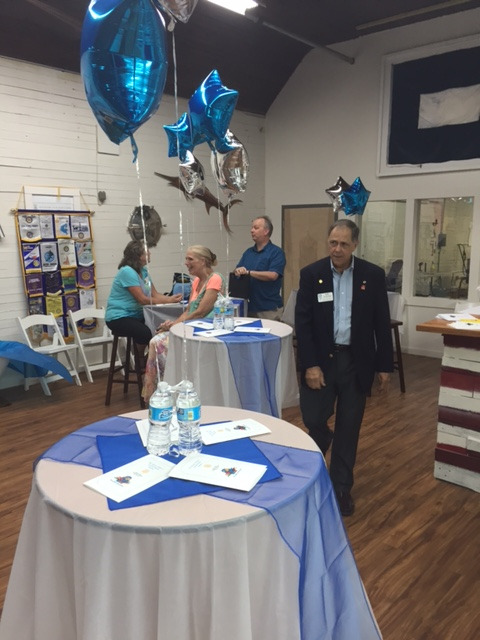 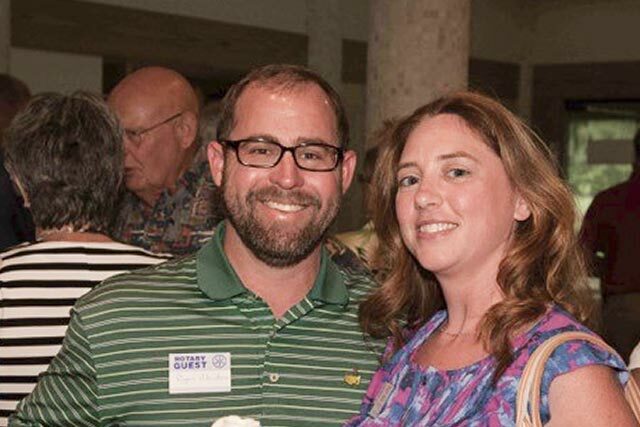 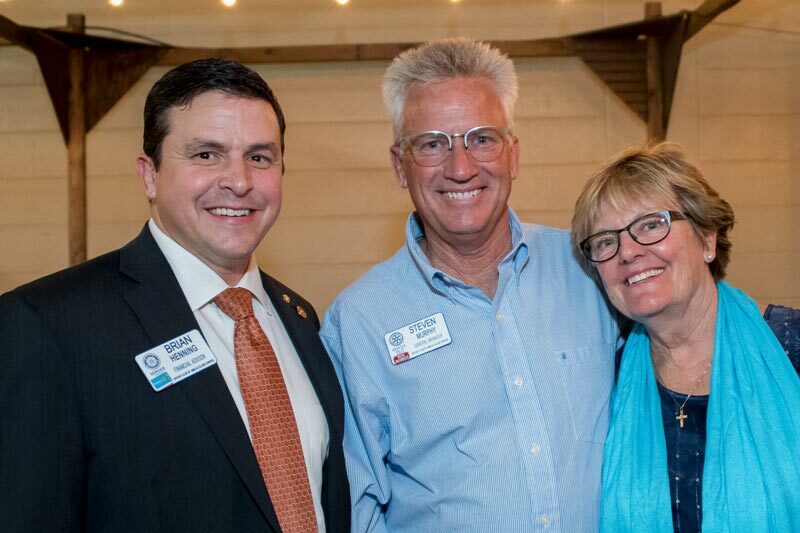 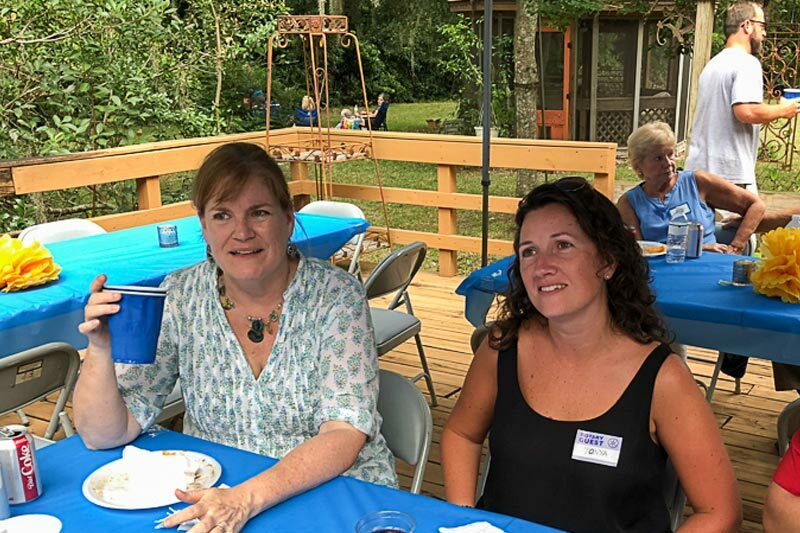 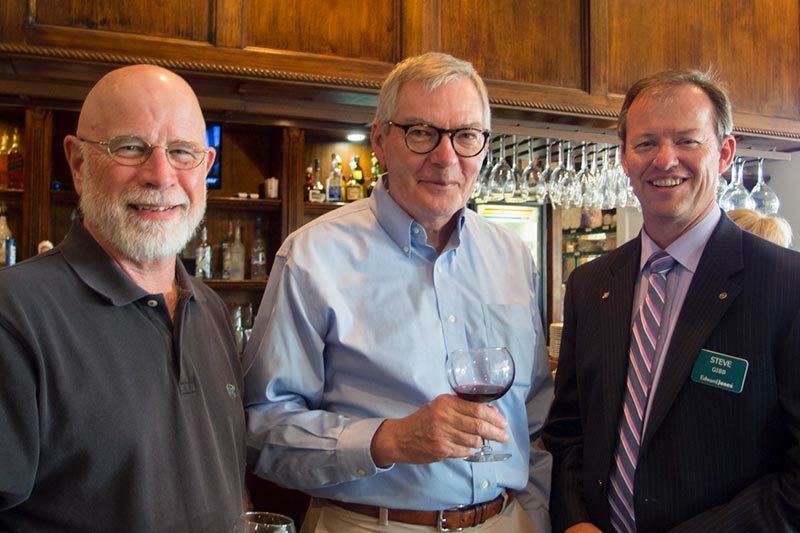 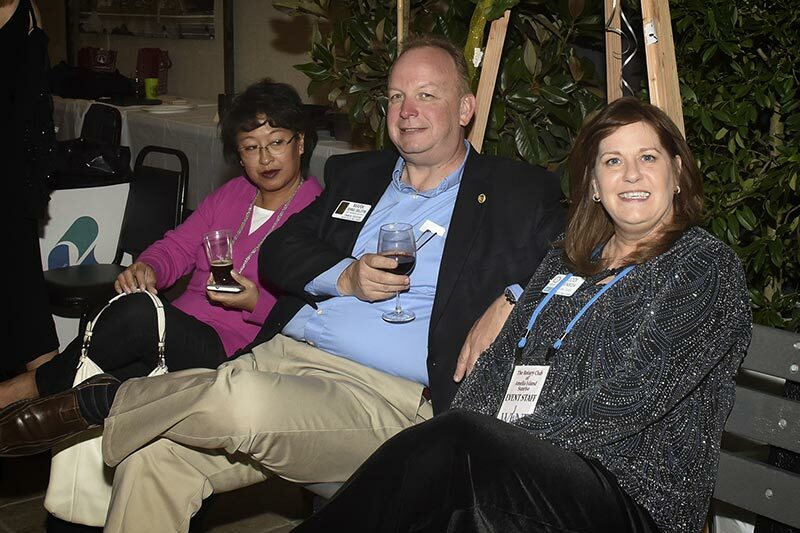 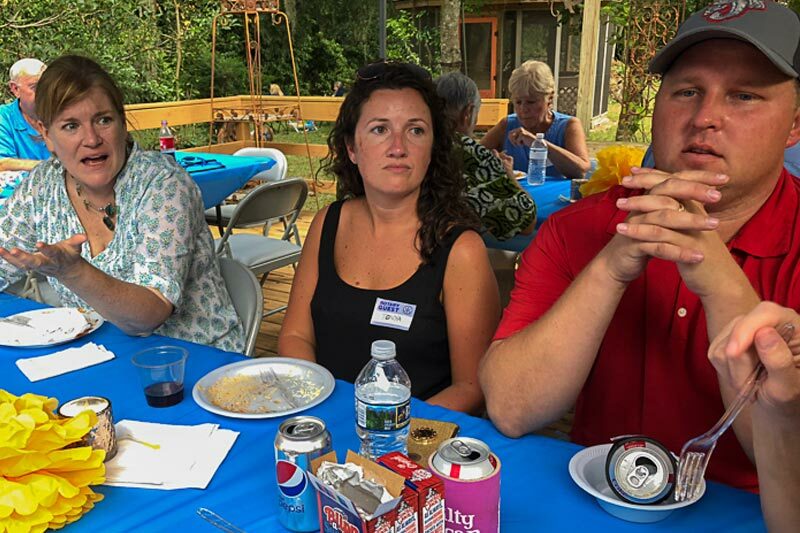 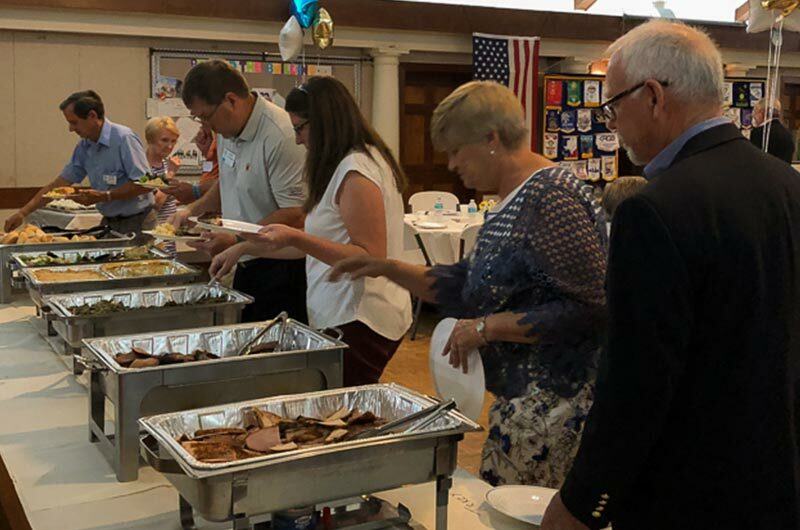 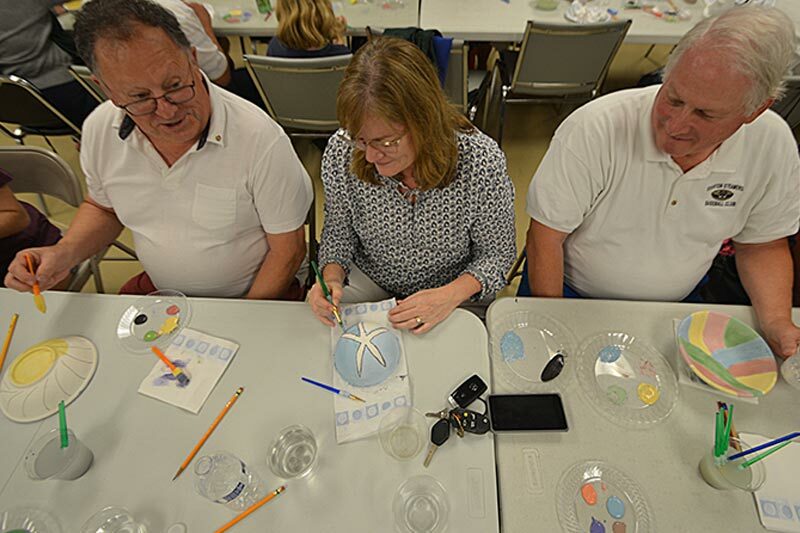 The Fernandina Beach Rotary Club was invited along with the European American Business Club. 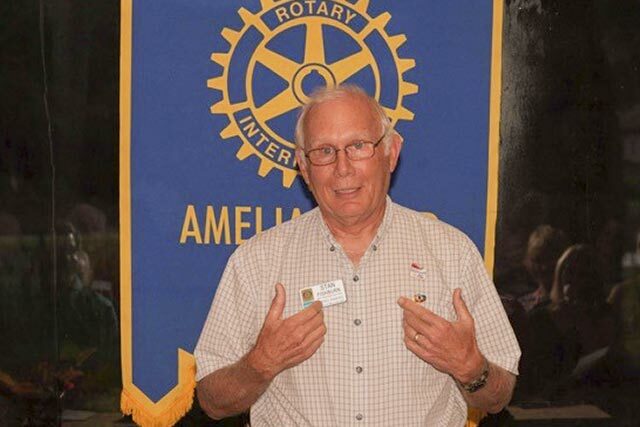 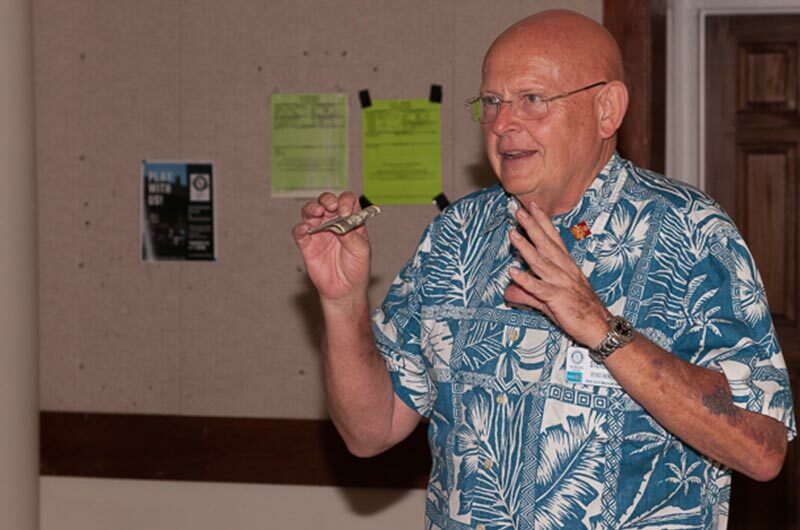 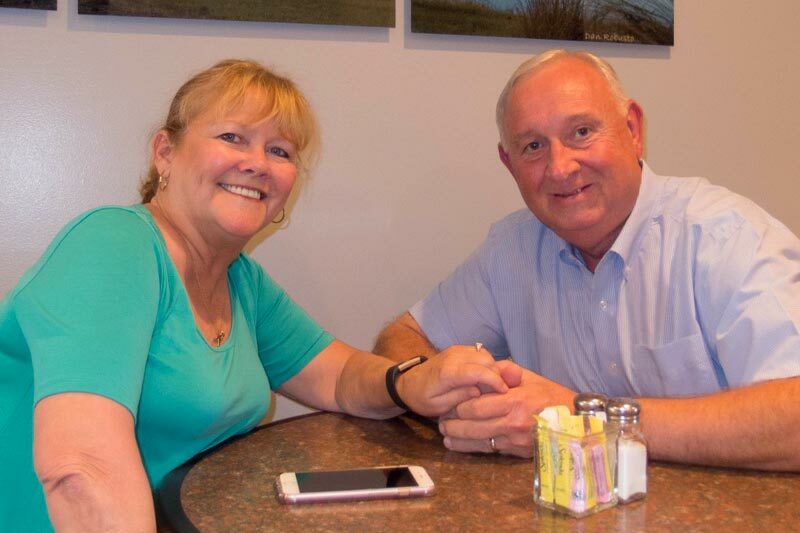 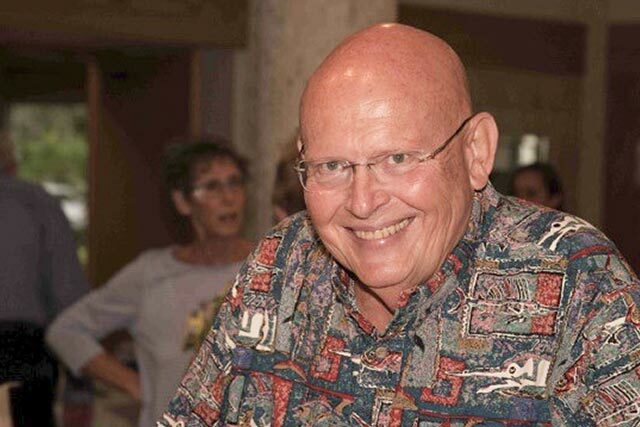 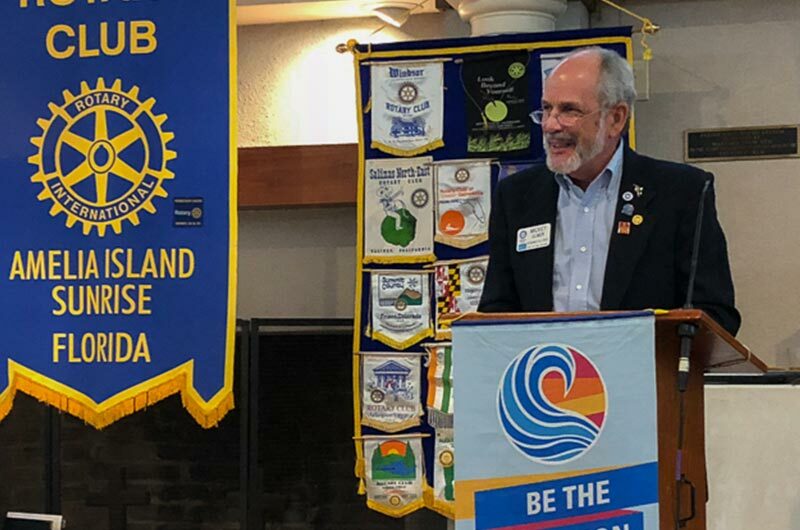 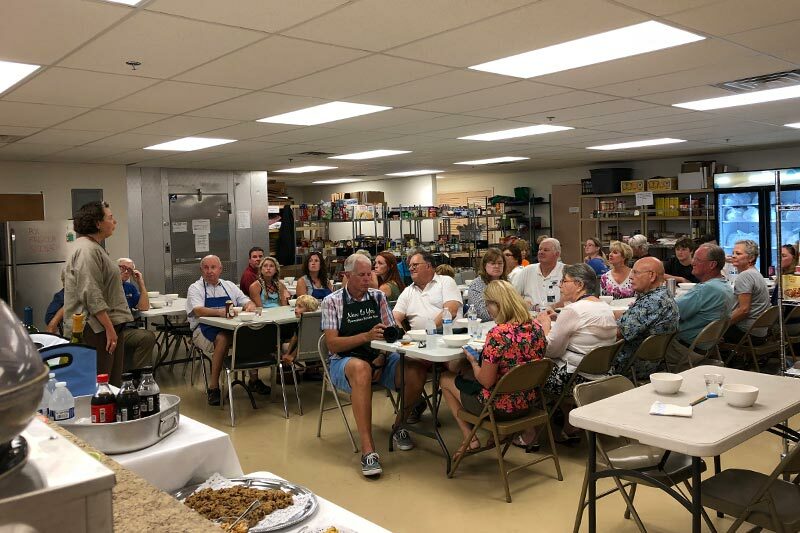 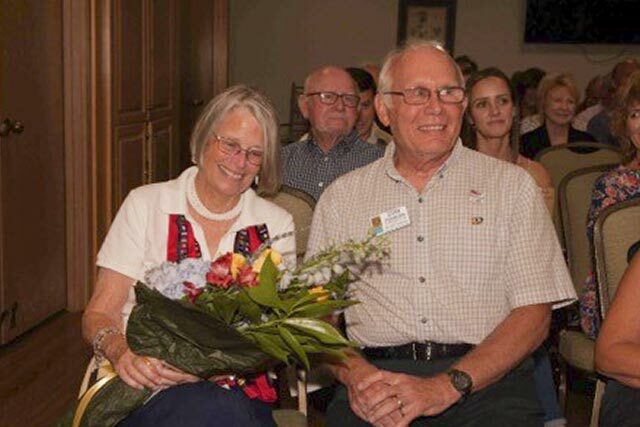 As an added feature, we had a guest speaker thanks to Dan and Regan Westra who invited Frank Jaklic, District Governor nominee 2018-19, from the club in North Carolina they were affiliated with before moving here. 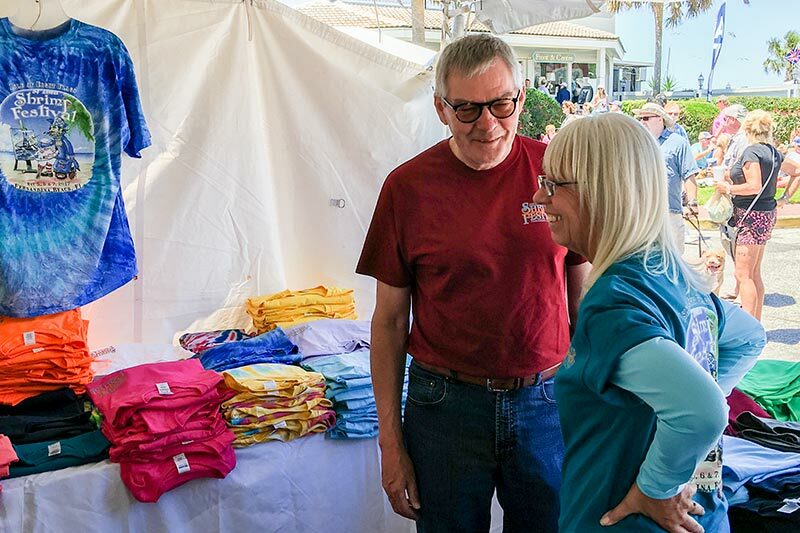 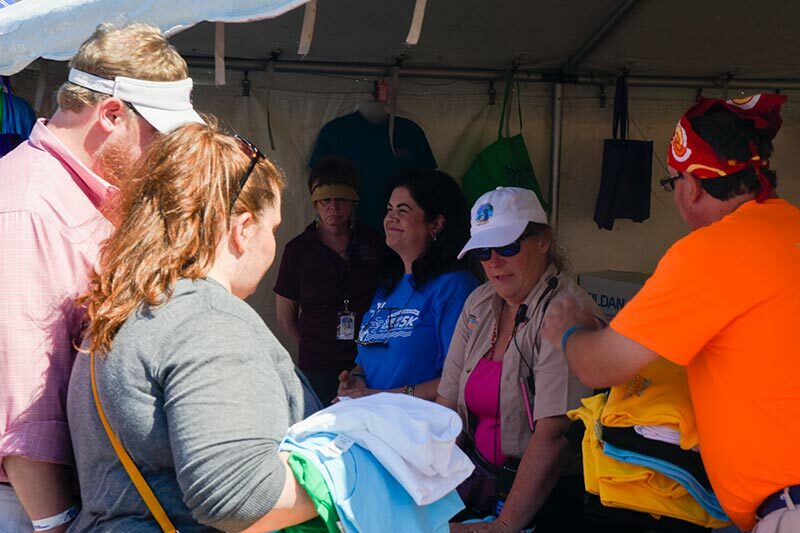 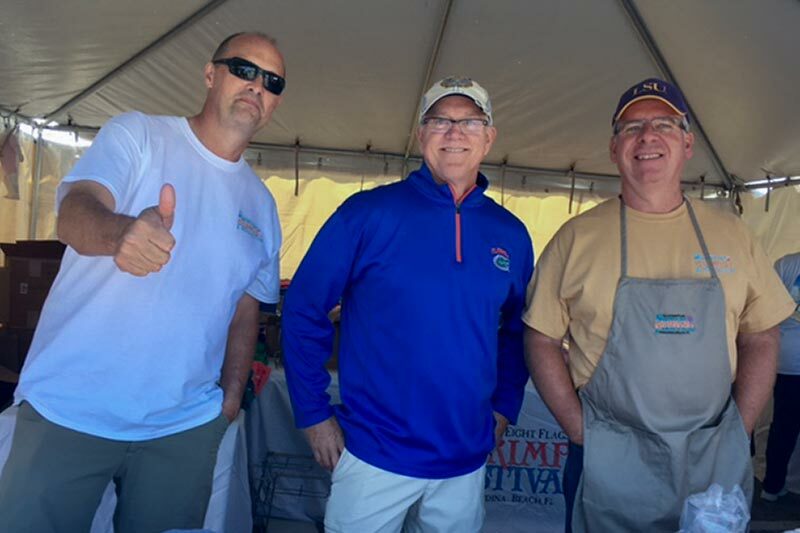 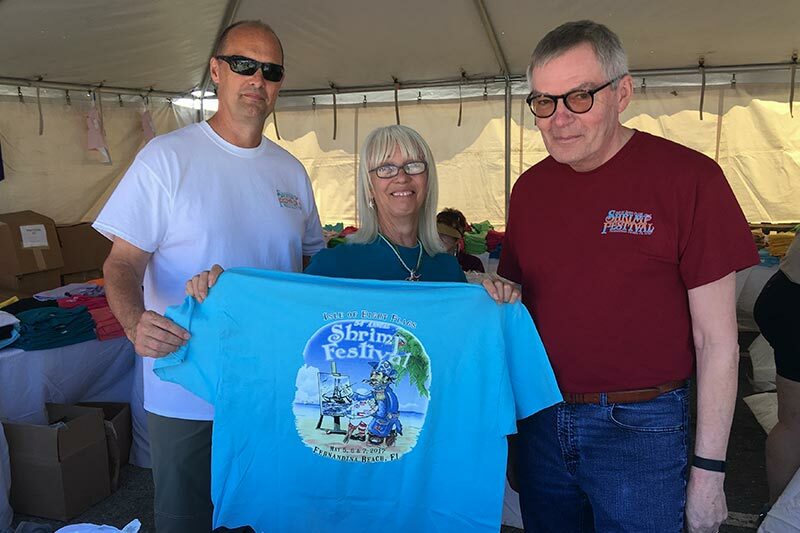 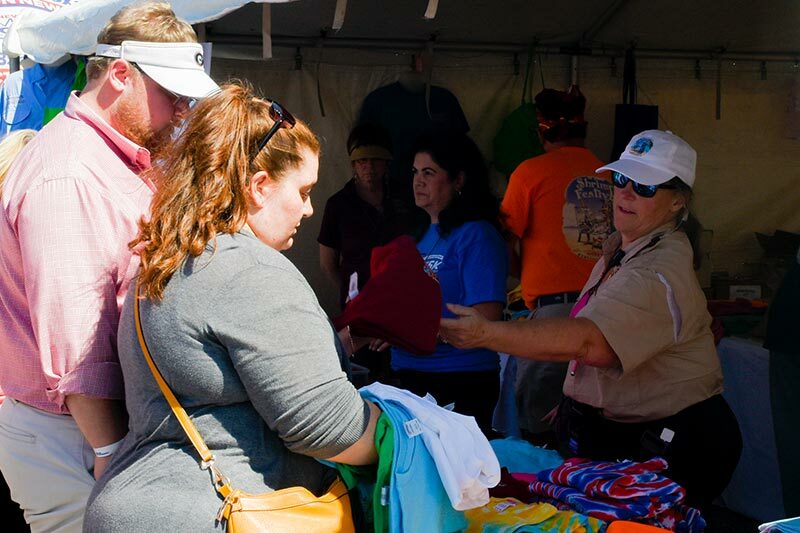 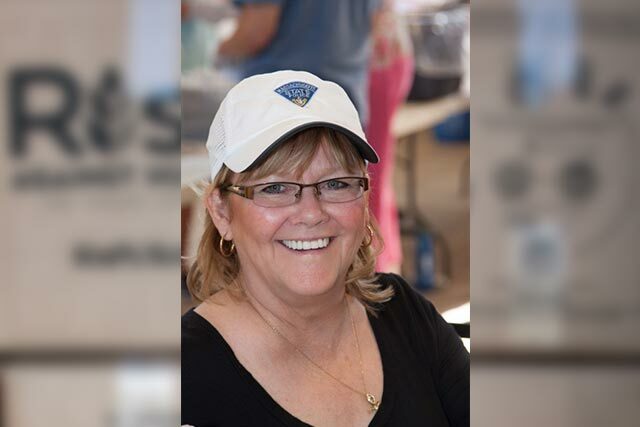 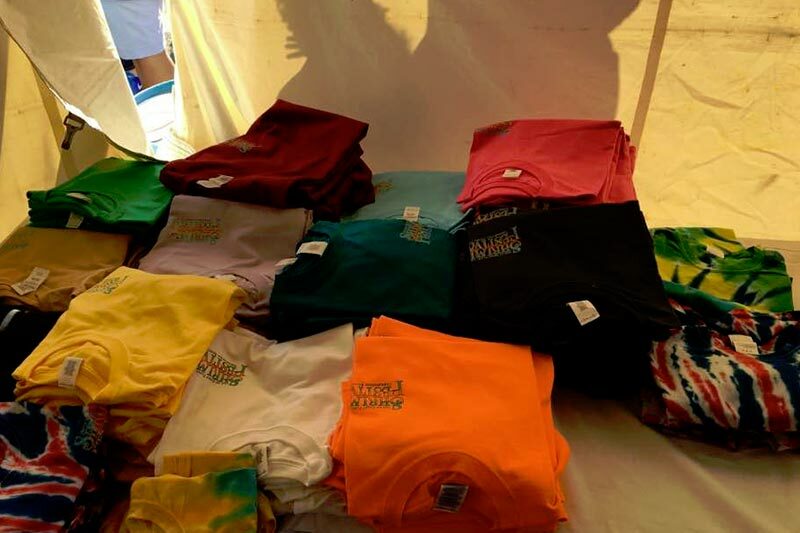 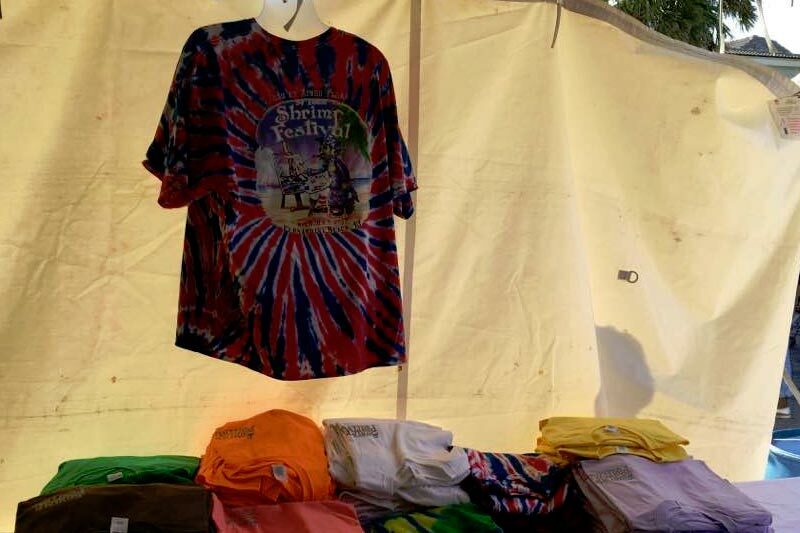 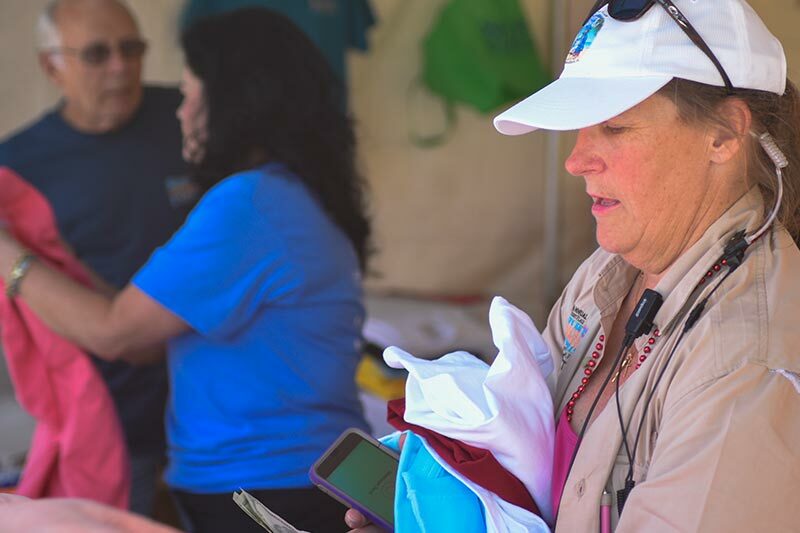 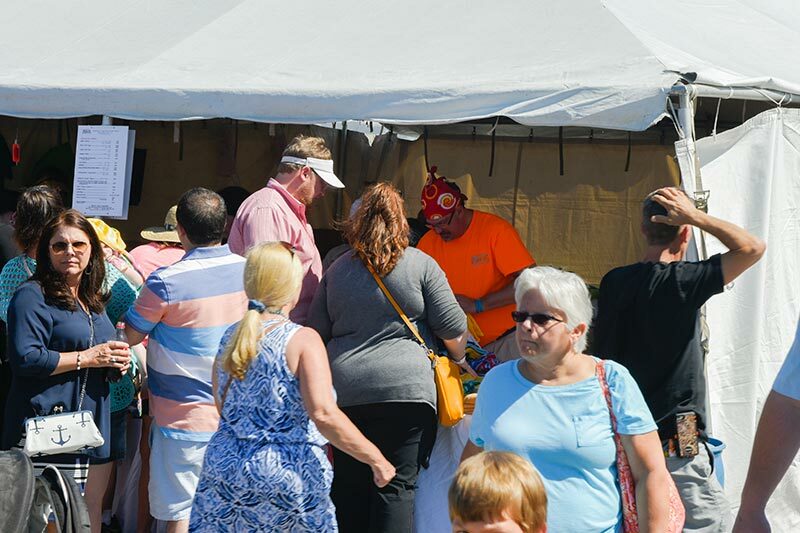 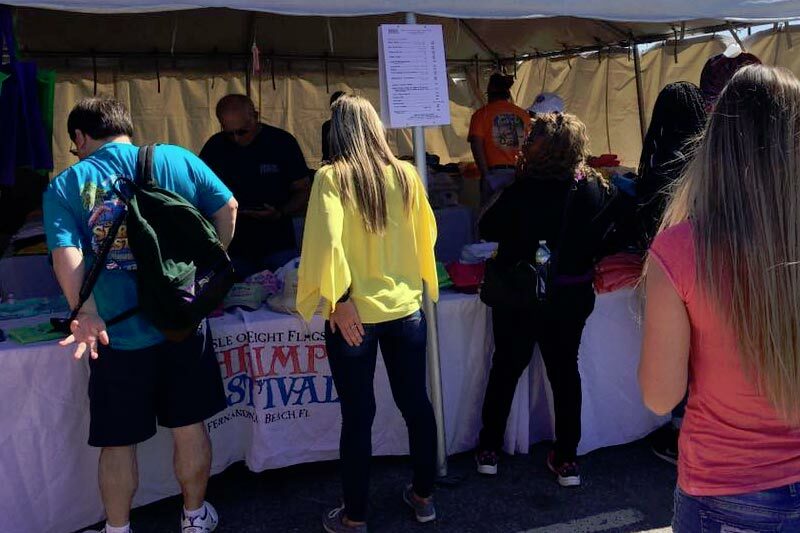 Friday, May 5th from 5 pm – 11pm several Sunrisers reported to selling Shrimp Festival Merchandise at the Fernandina Beach Waterfront location. 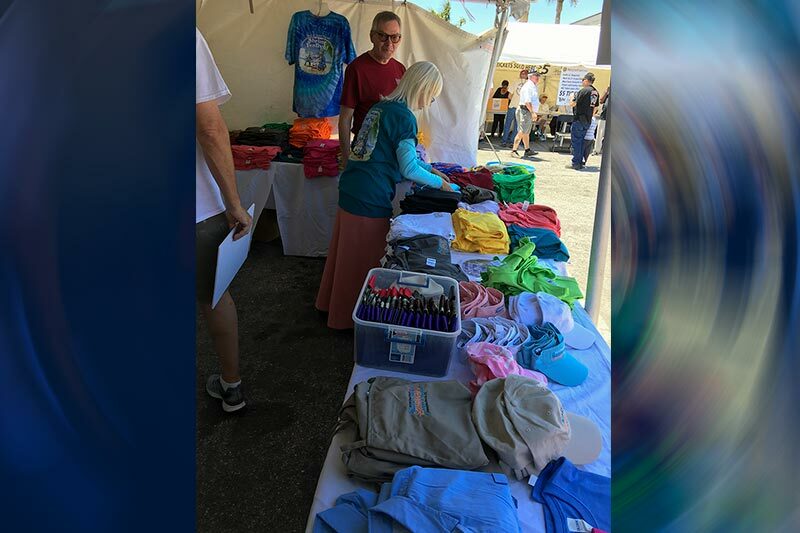 The sales continued the next day at two locations, one at the Waterfront and the other at 8th and Center Street starting at 8 am and ending 7 pm. 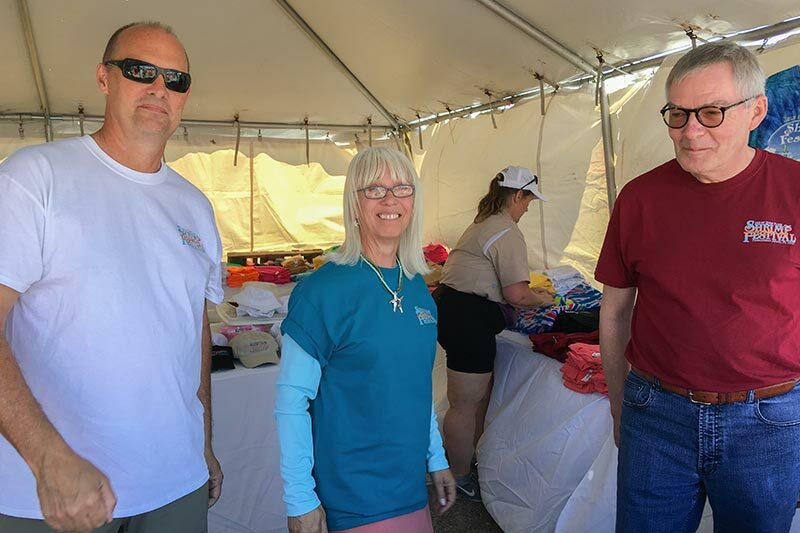 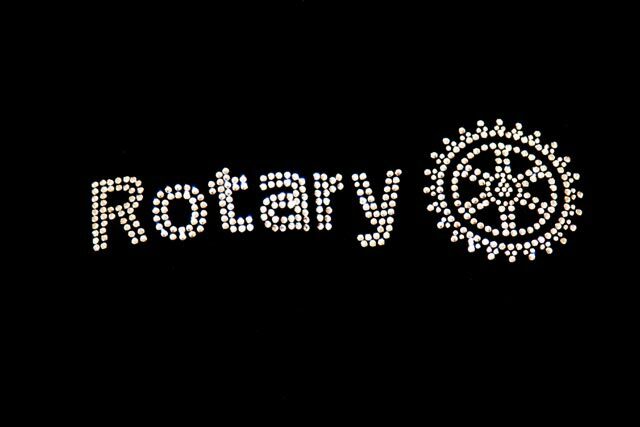 It was a lot of work but the Rotarians worked hard on selling T-shirts, Hats, Shirts, Tank tops, tumblers, posters and so much more. 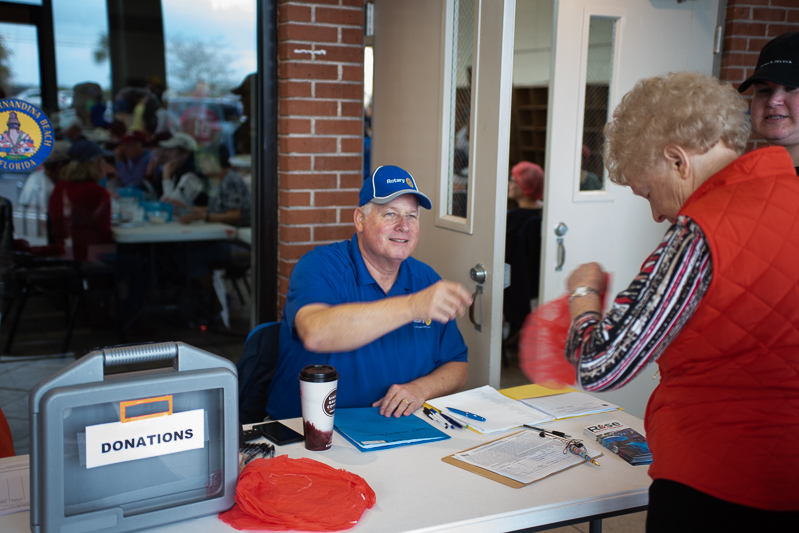 Thank you Mark Cutshaw for organizing our shifts. 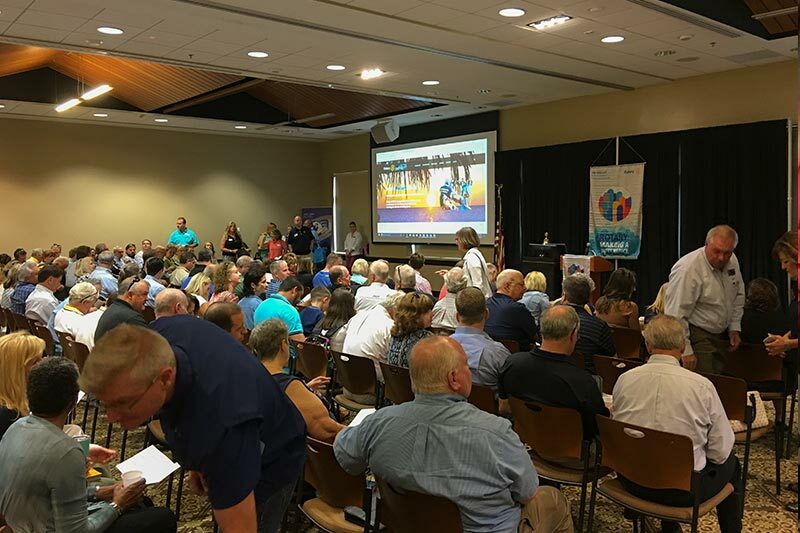 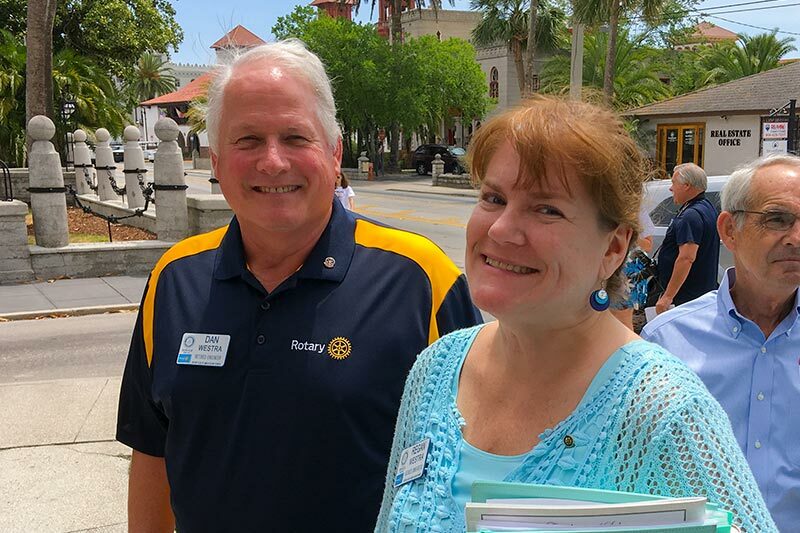 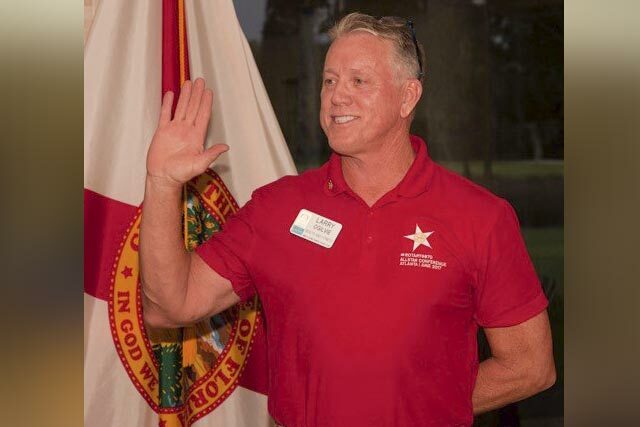 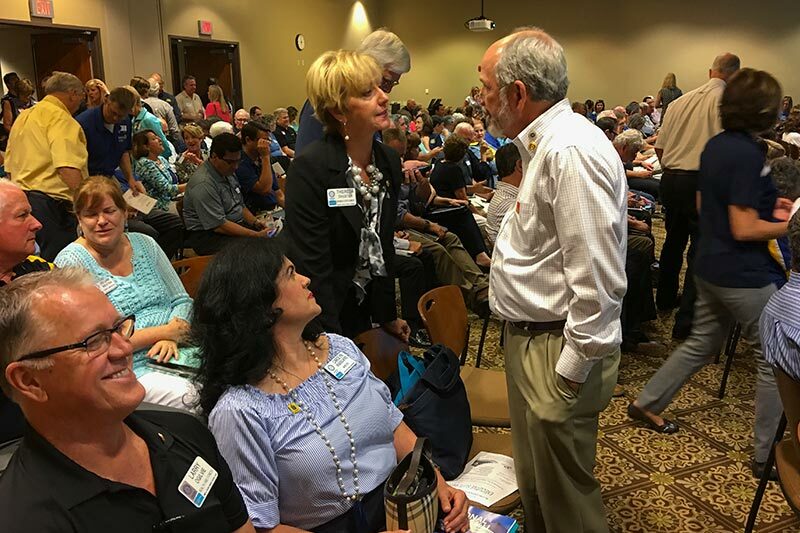 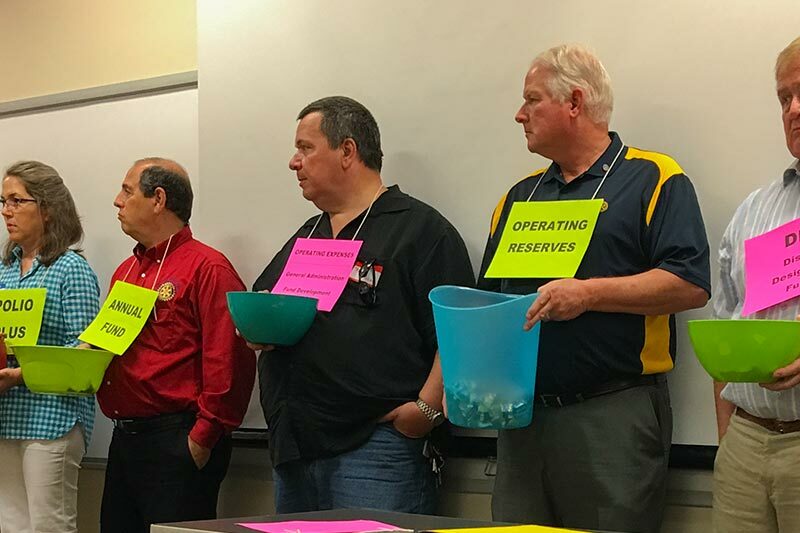 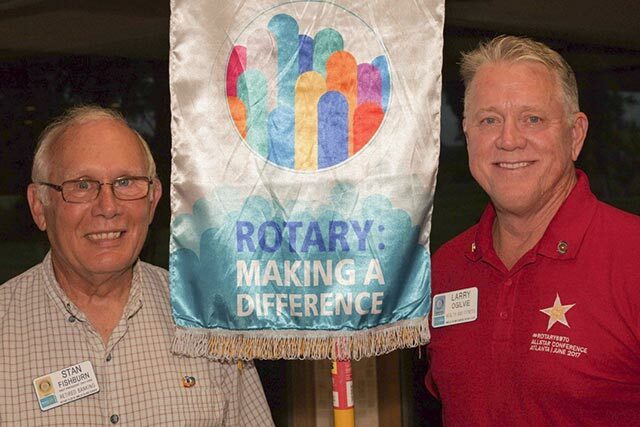 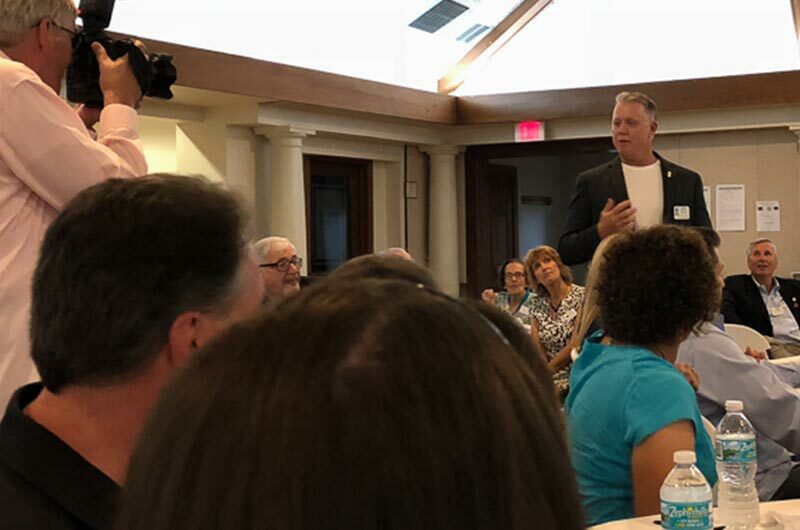 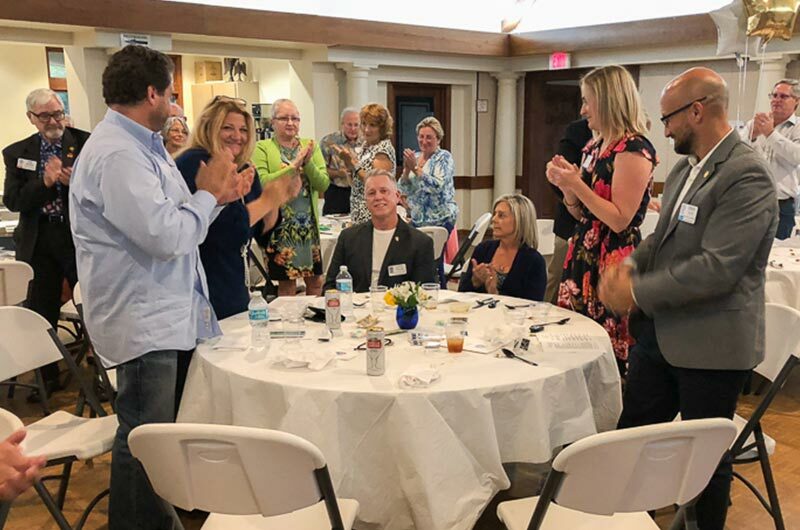 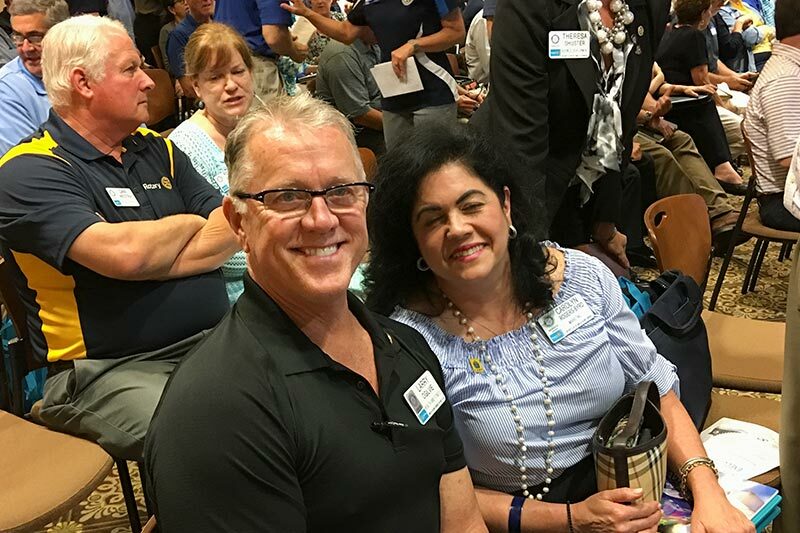 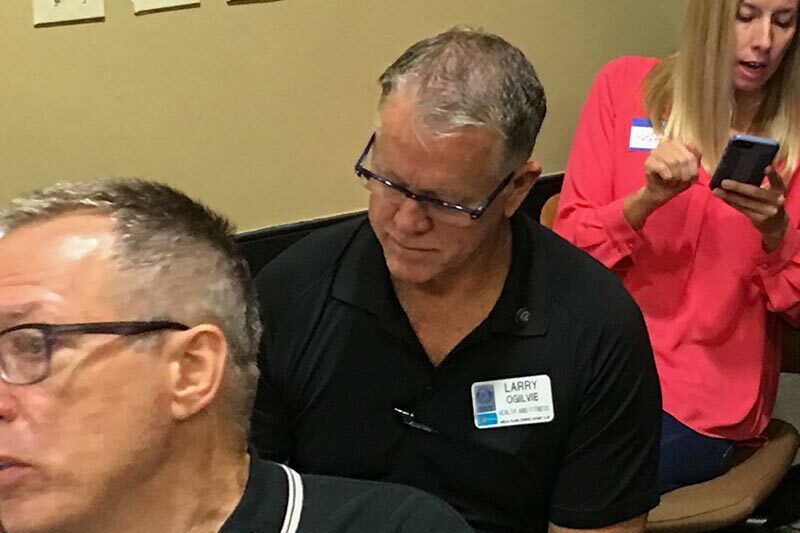 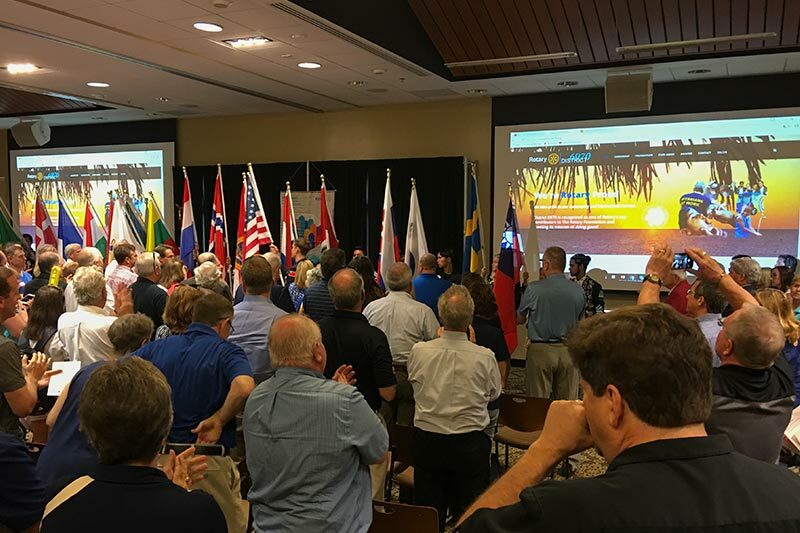 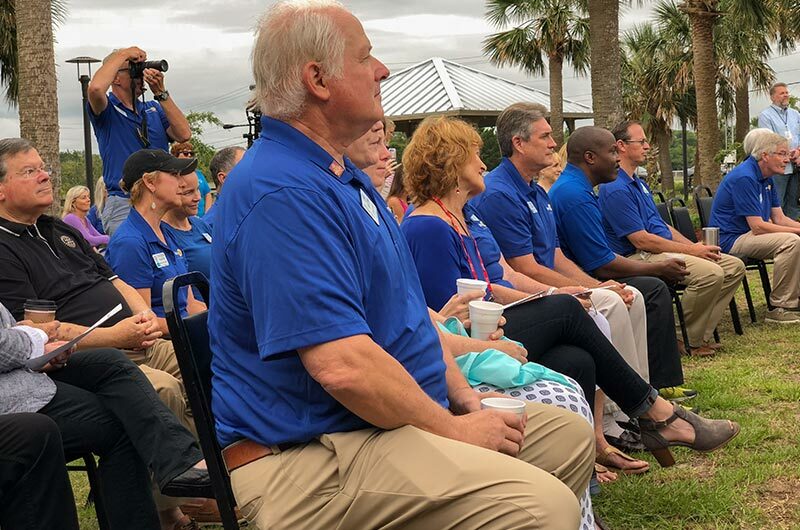 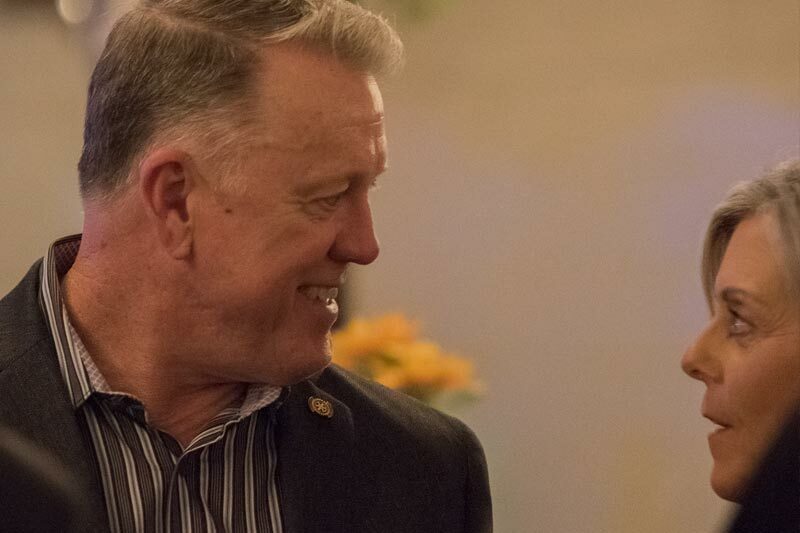 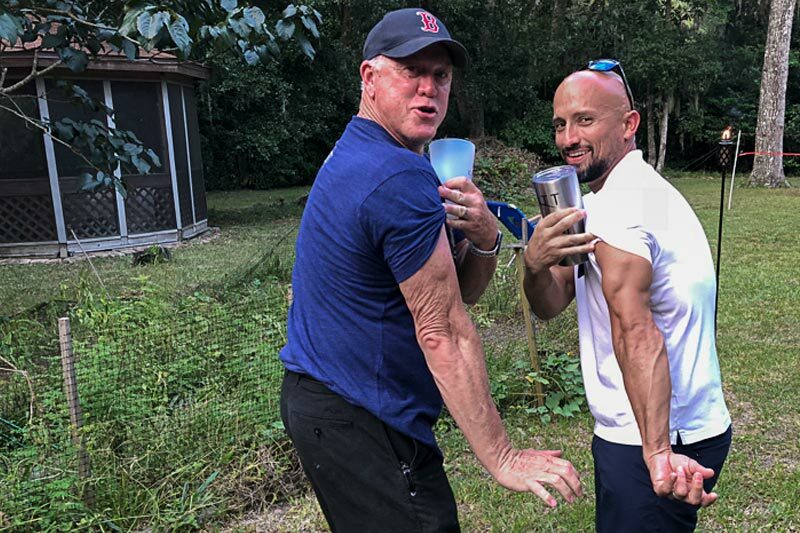 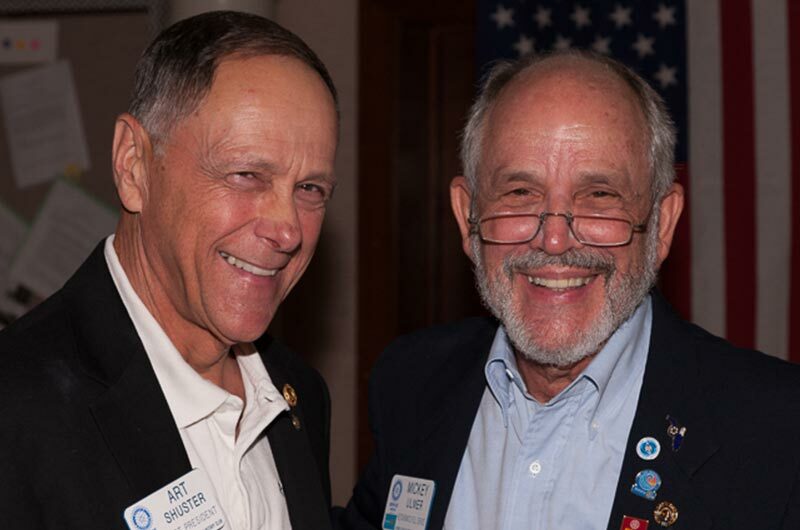 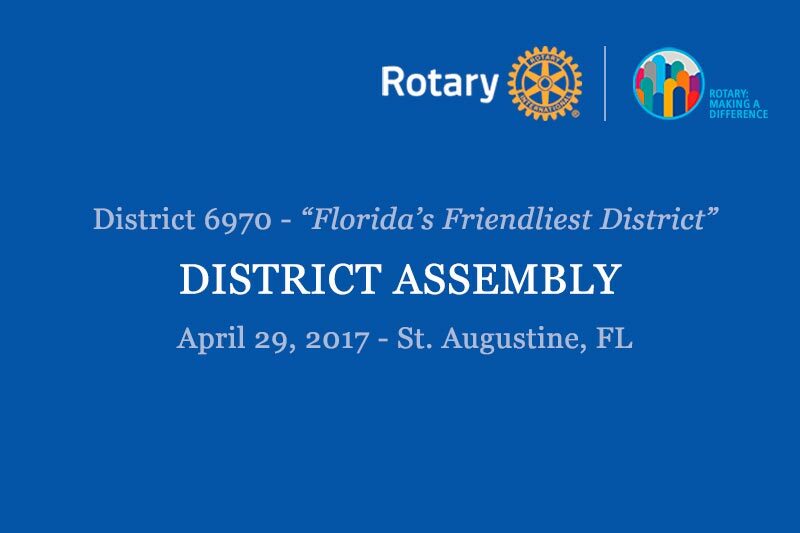 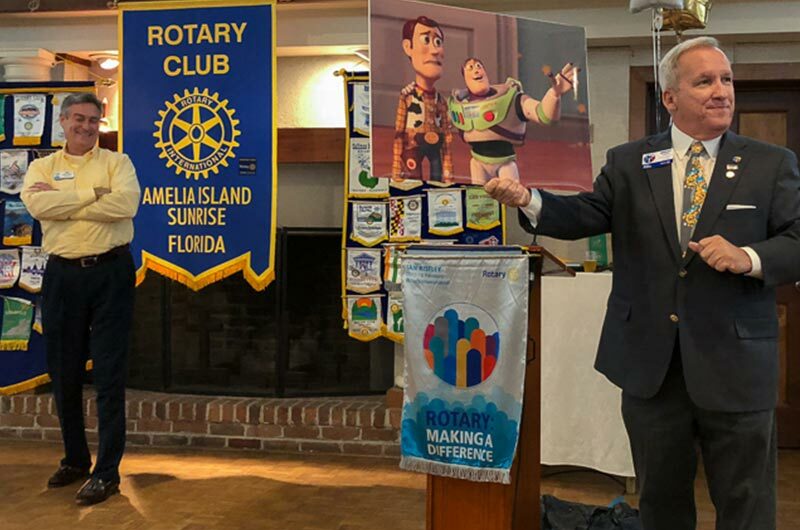 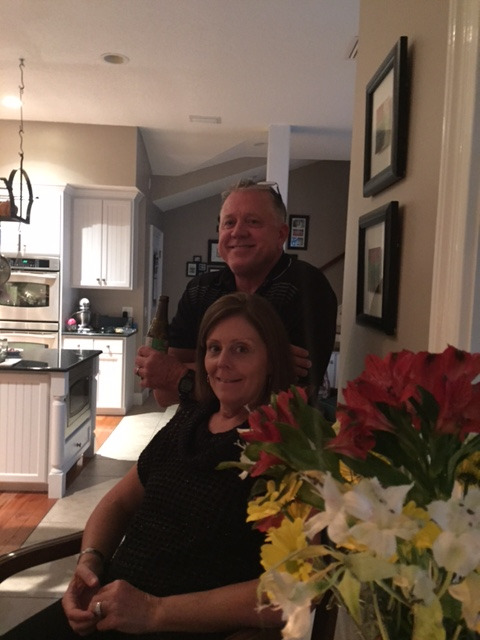 DGE Brent Coates and District Trainer Art Shuster organized a record breaking District Assembly April 29th in St. Augustine, FL. 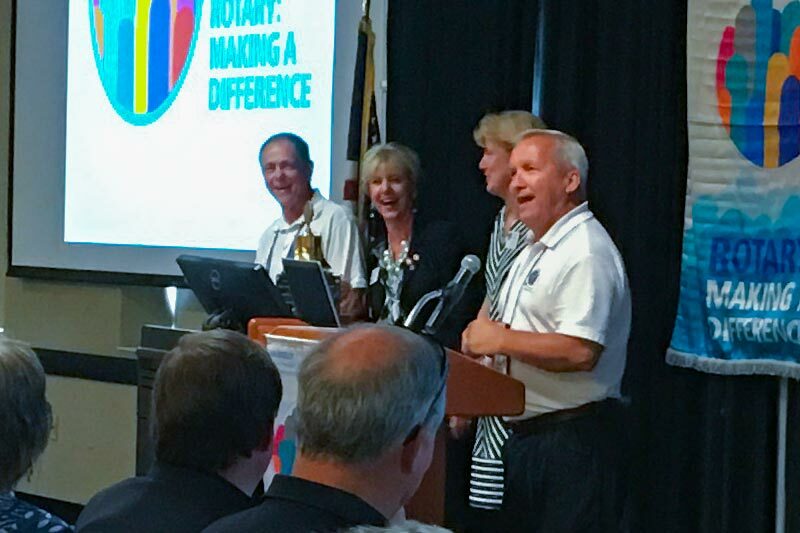 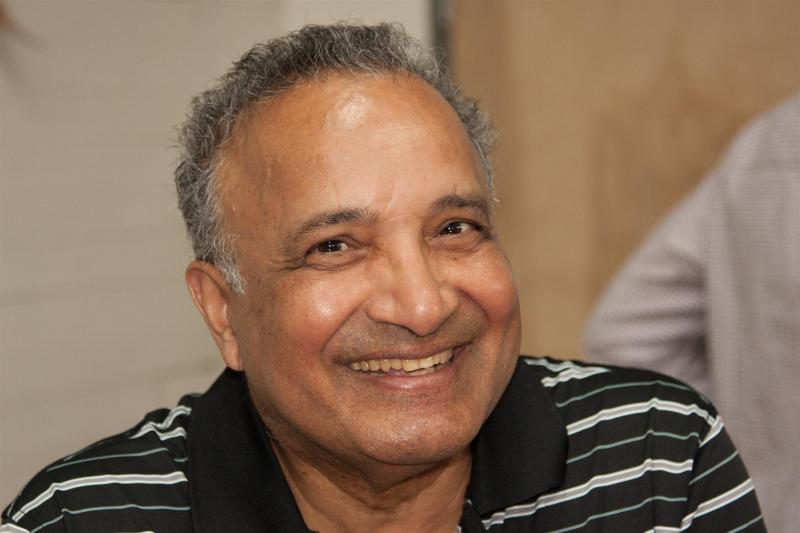 Over 300 Rotarians attended the leadership training event. 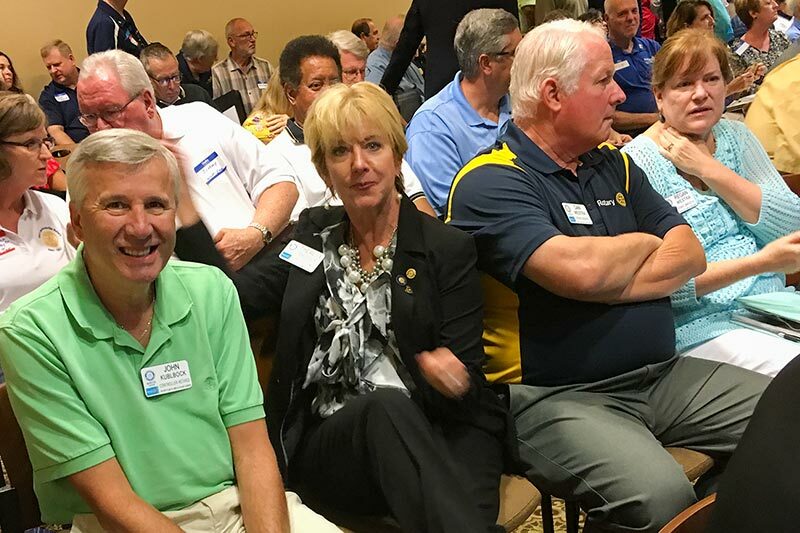 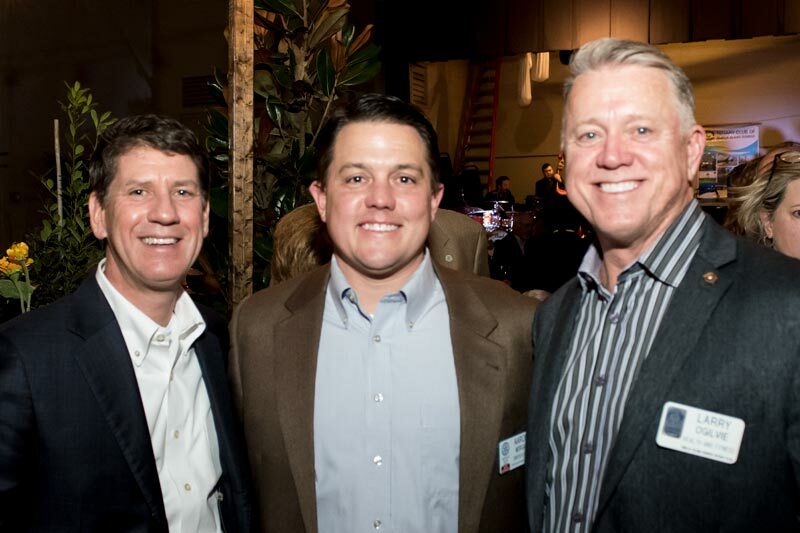 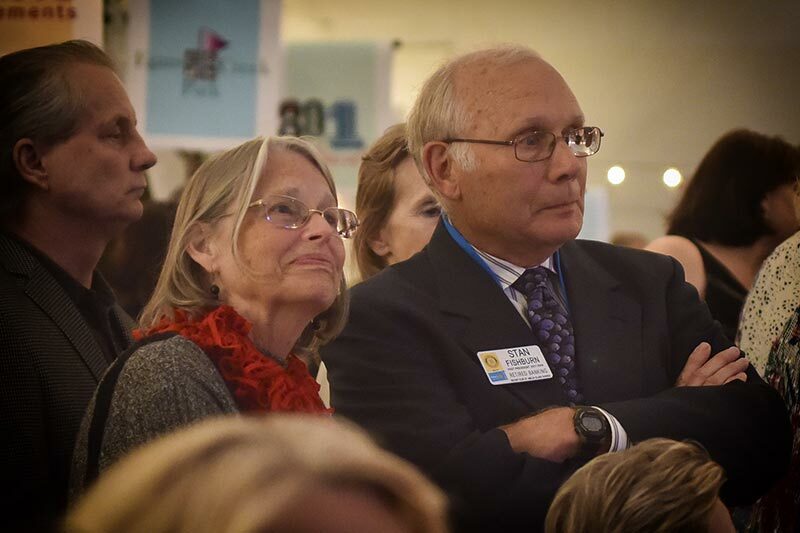 Several members of our Club were part of the energy in the general sessions, as well as the break-outs. 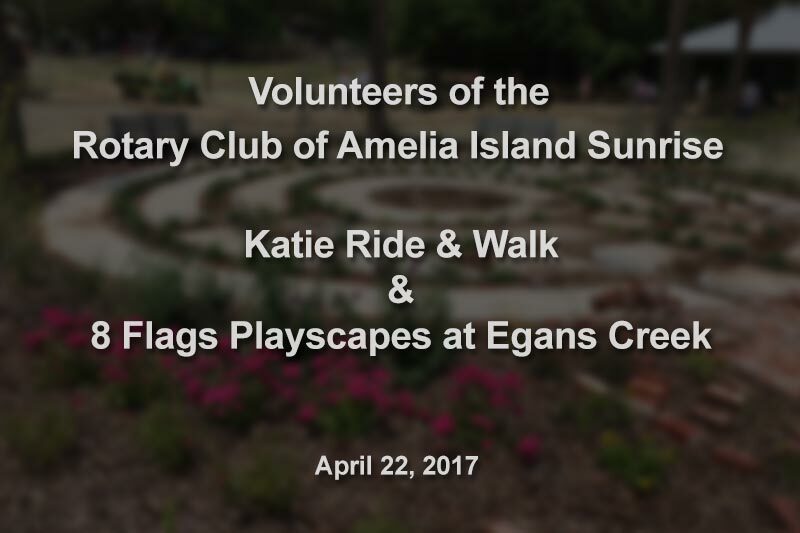 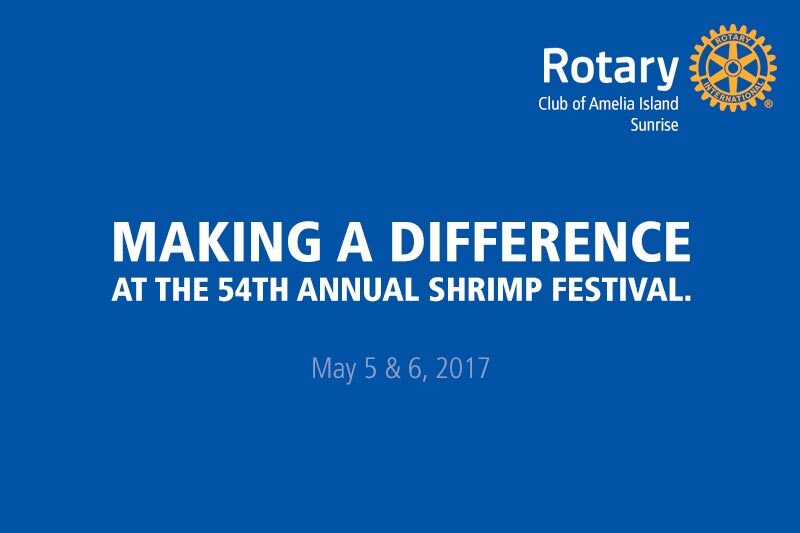 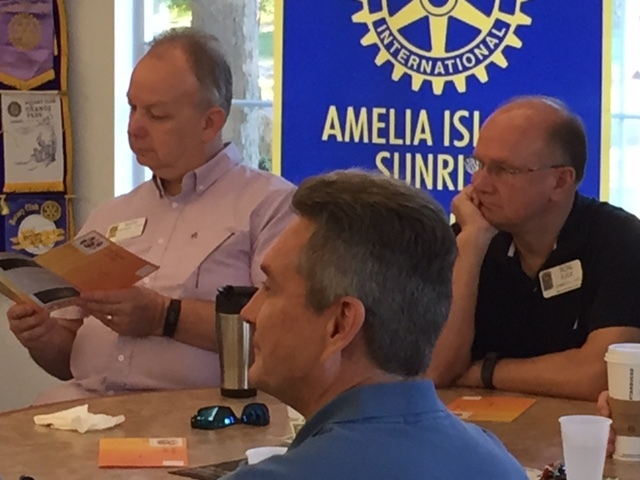 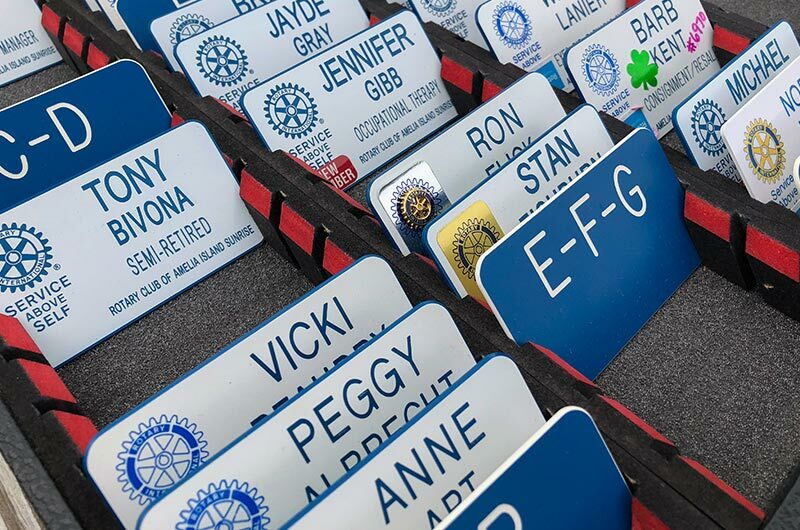 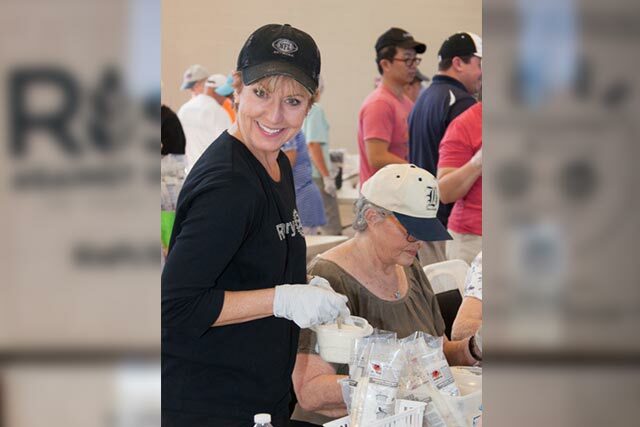 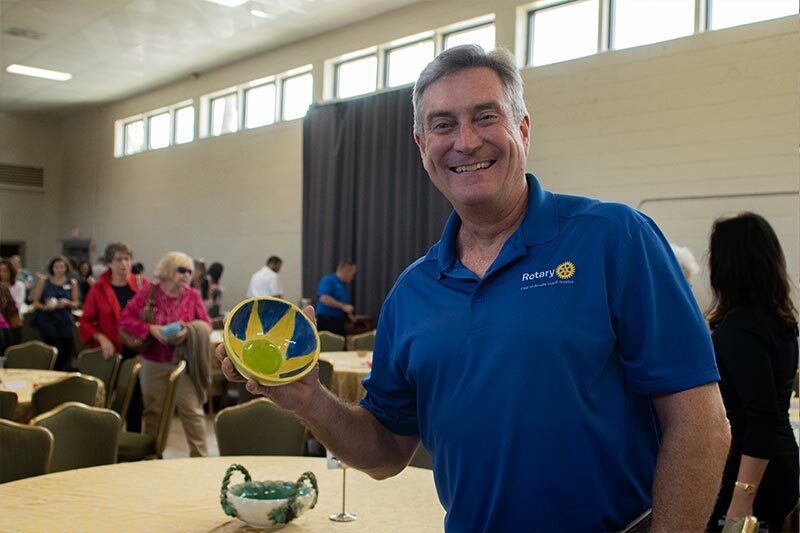 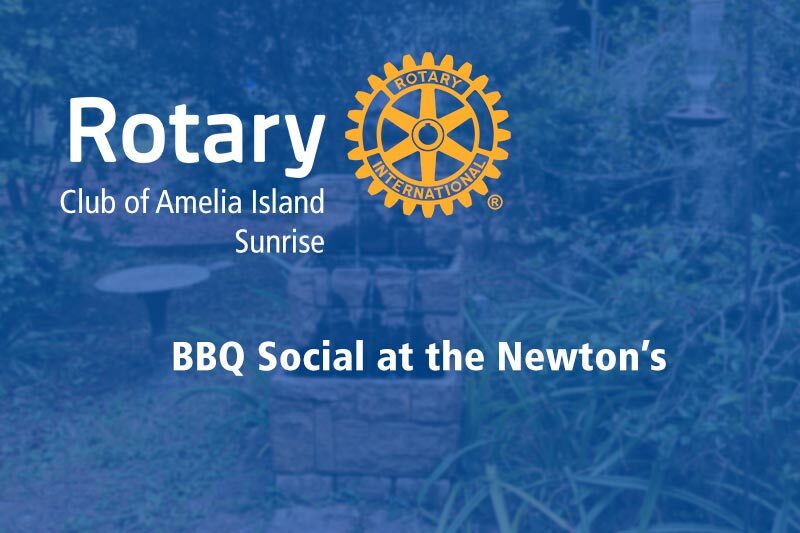 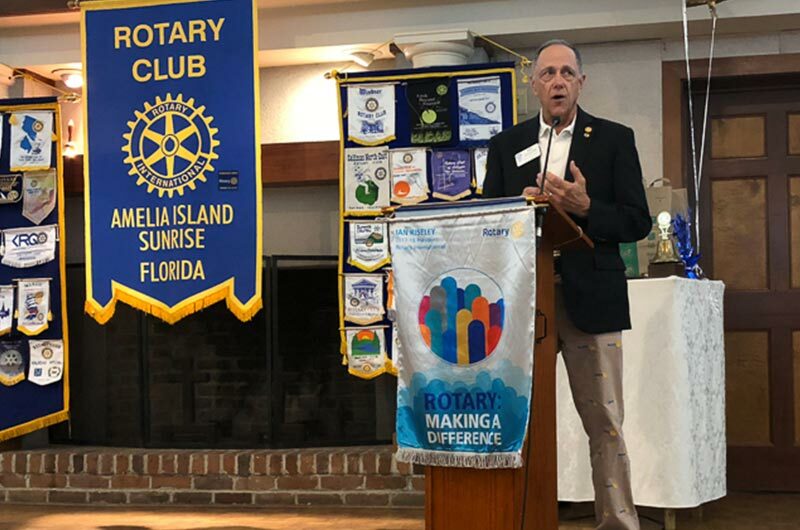 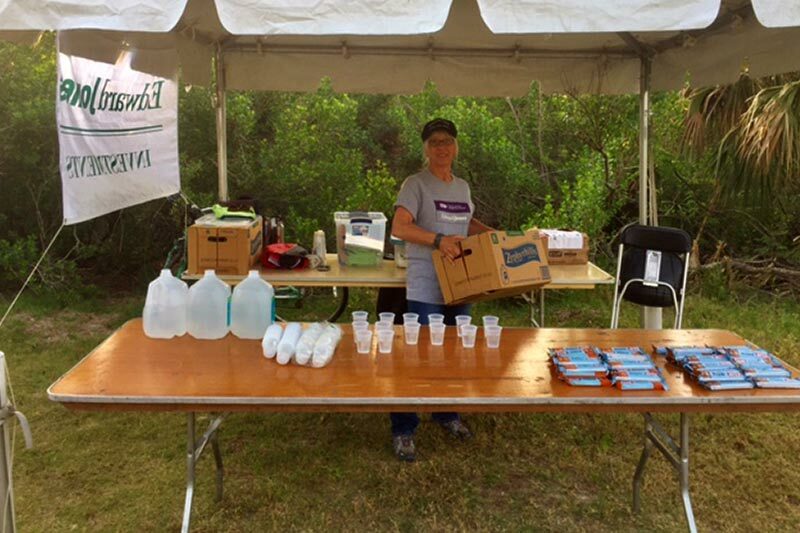 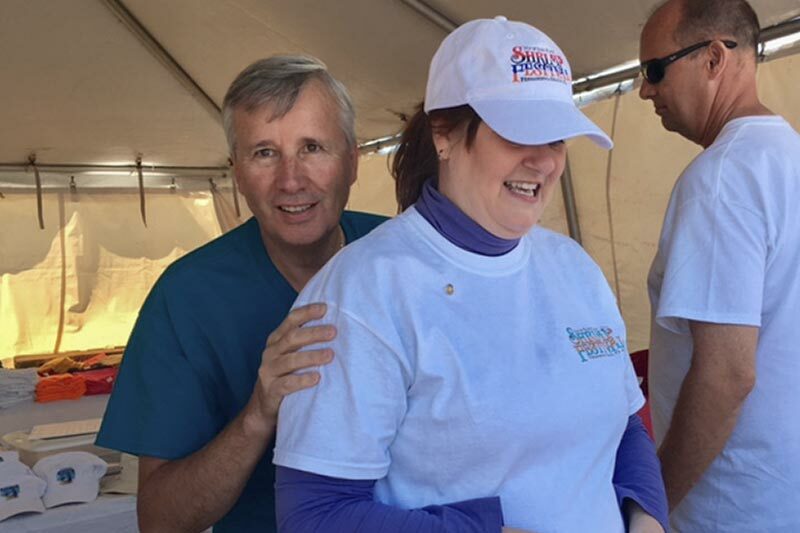 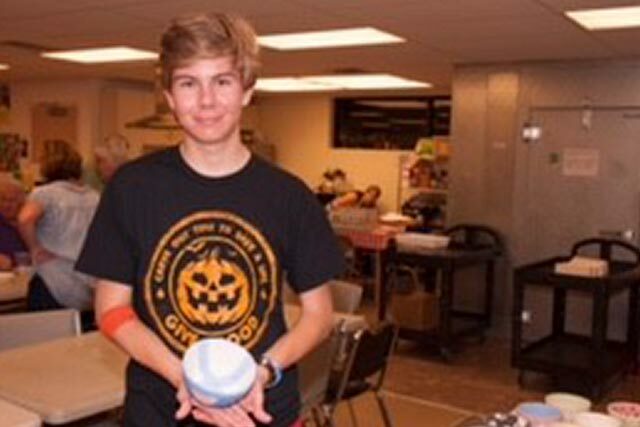 April 22, 2017 was a busy day for the volunteers of the Rotary Club Amelia Island Sunrise. 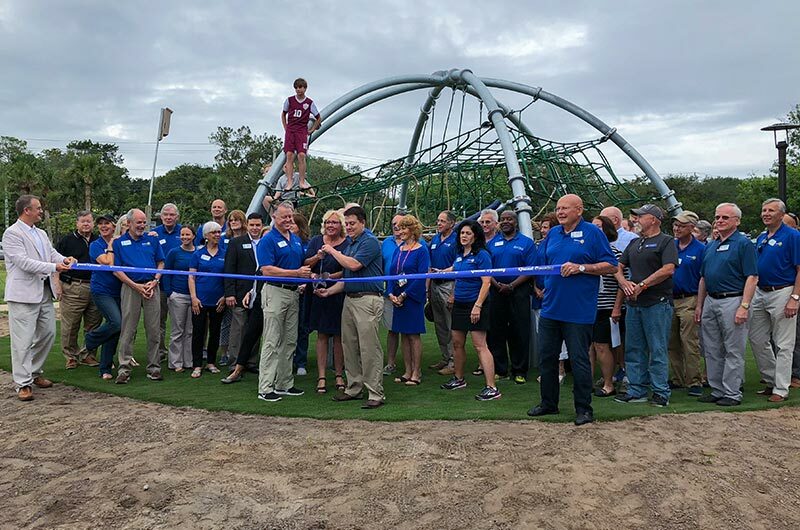 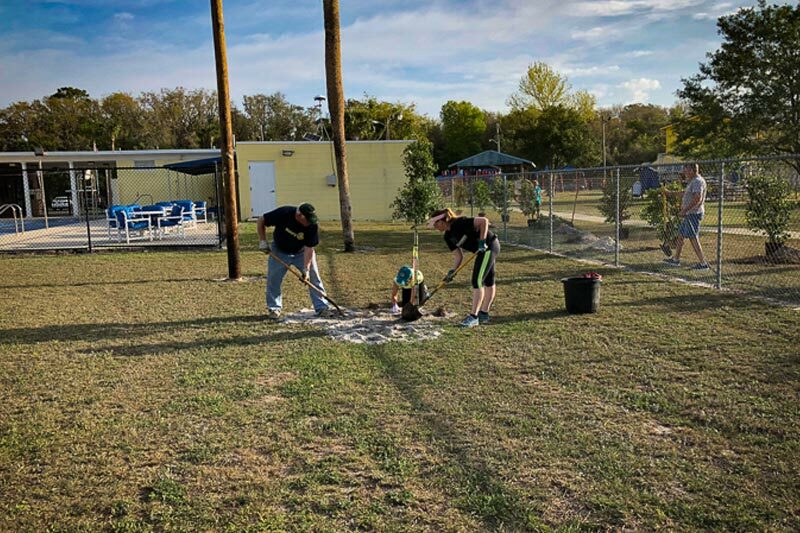 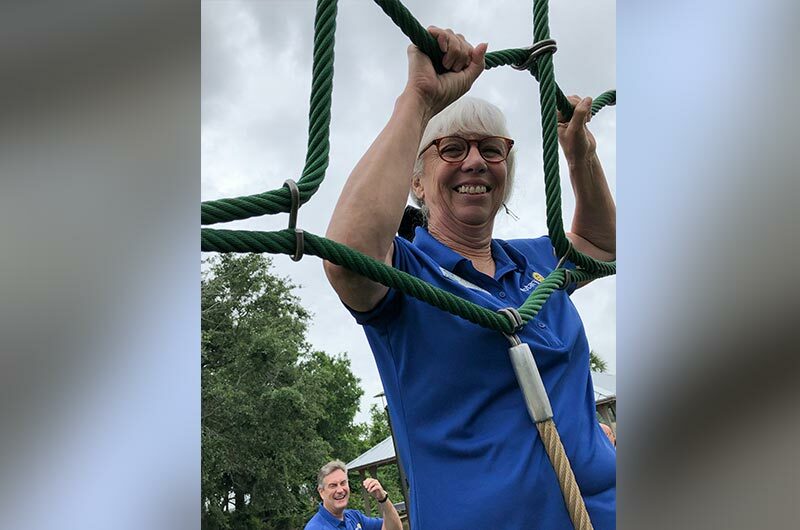 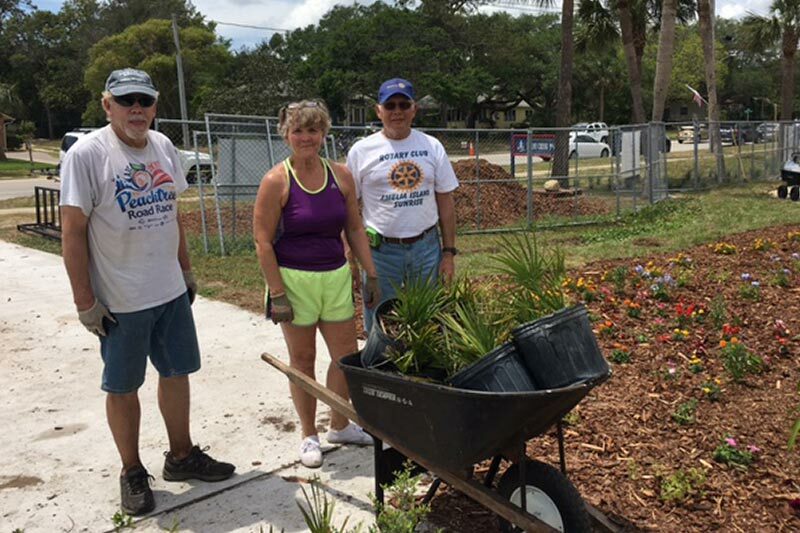 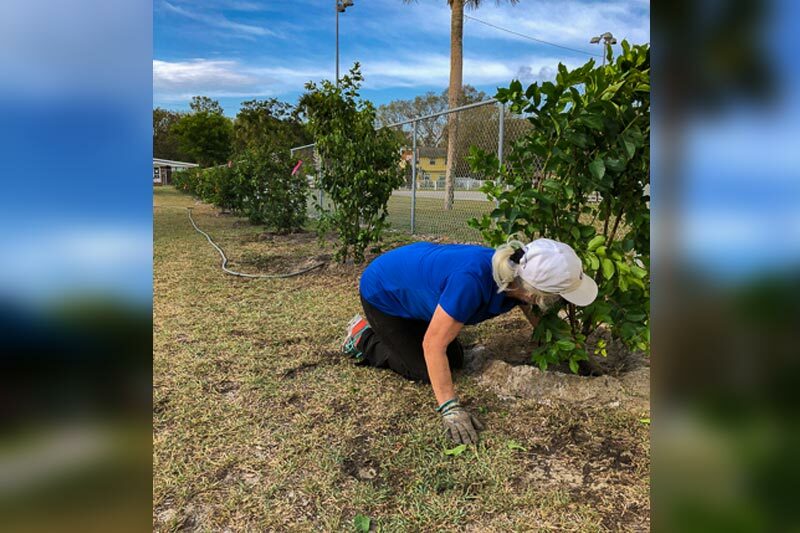 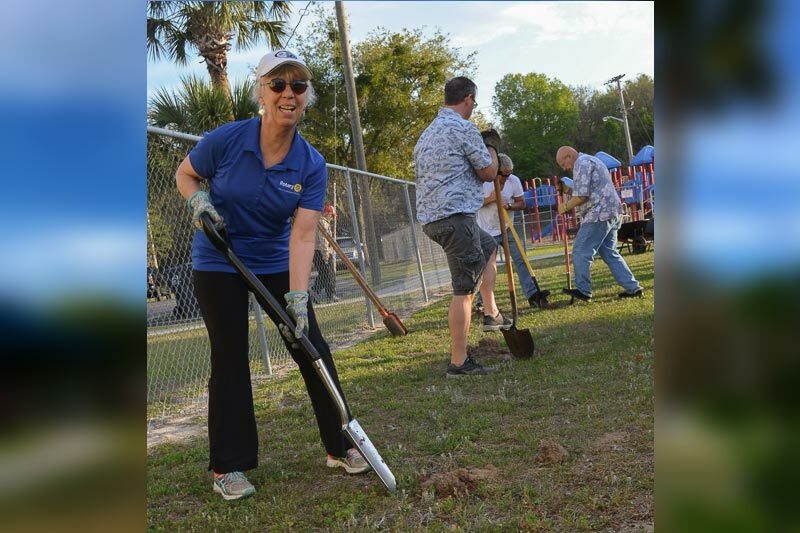 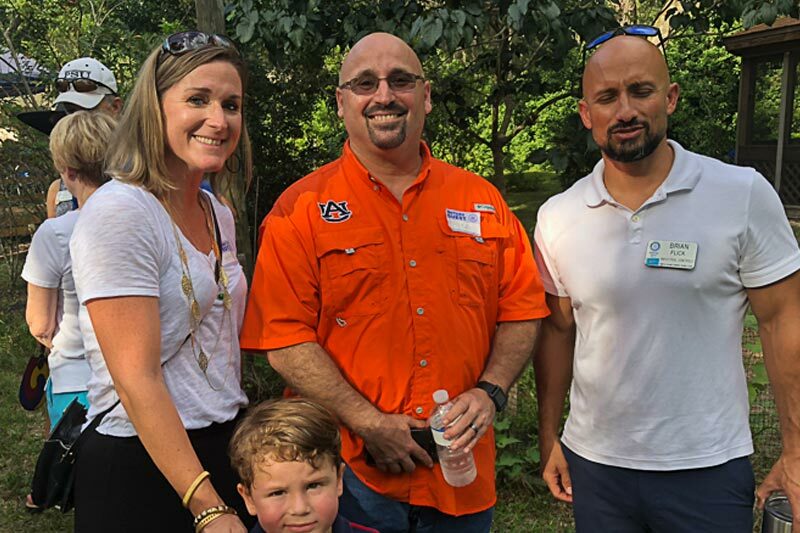 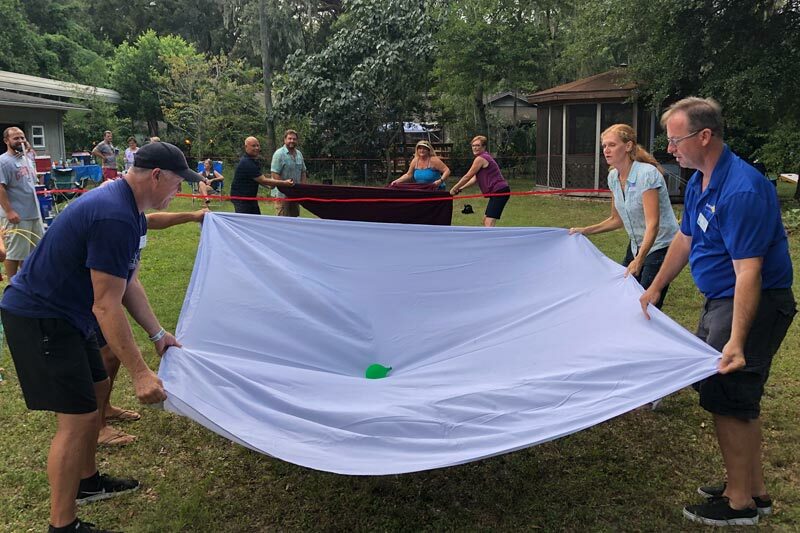 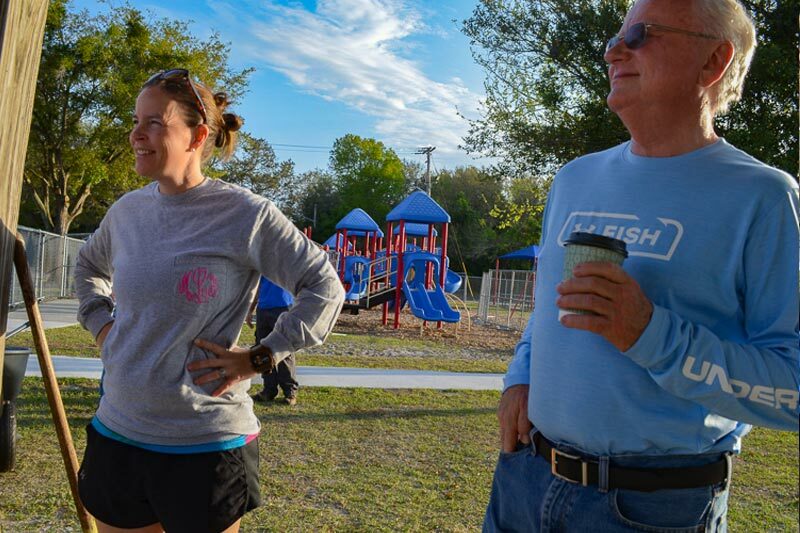 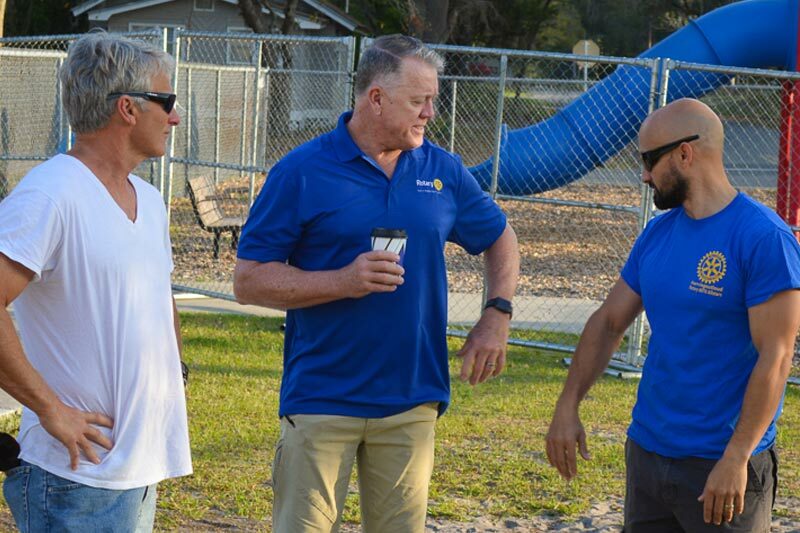 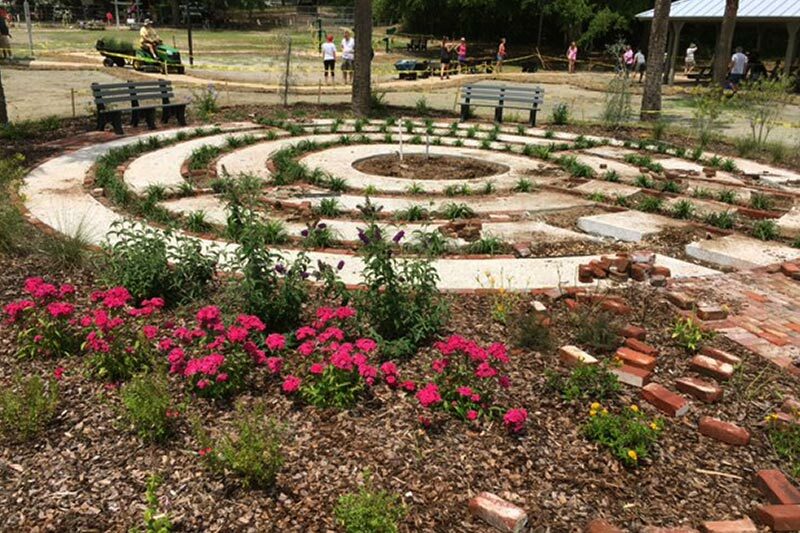 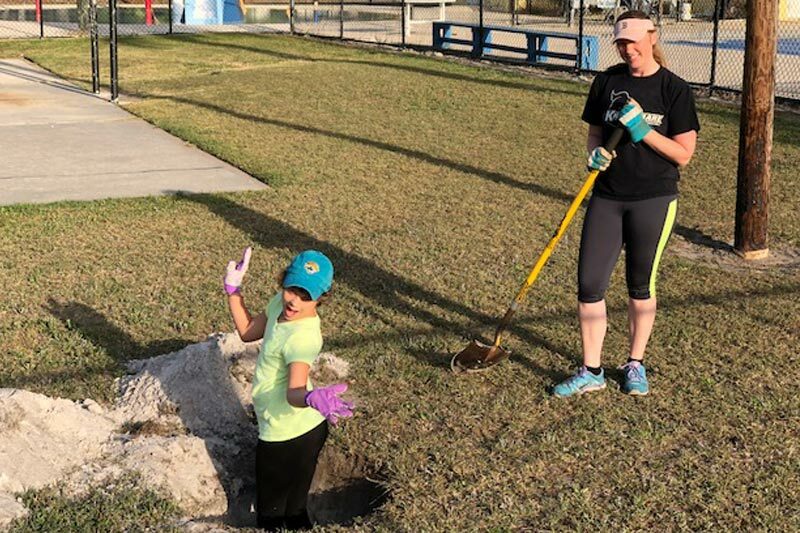 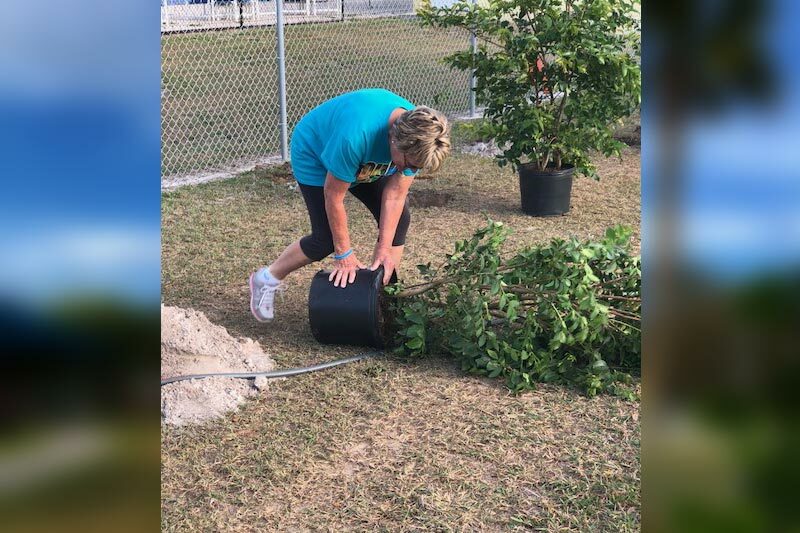 It started with helping at the annual Katie Ride & Walk and continued adding hands with the final touches of the 8-Flags Playscapes Park at Egans Creek. 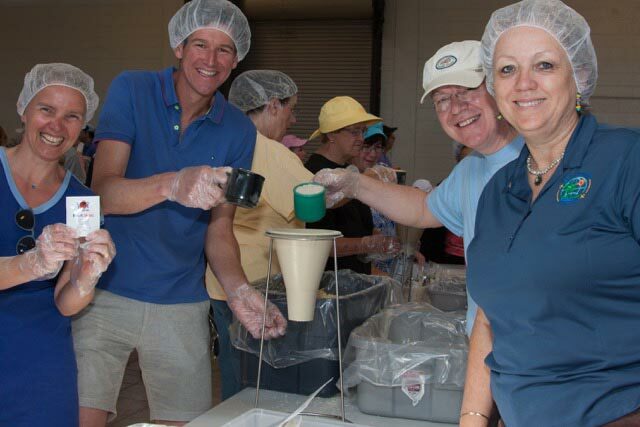 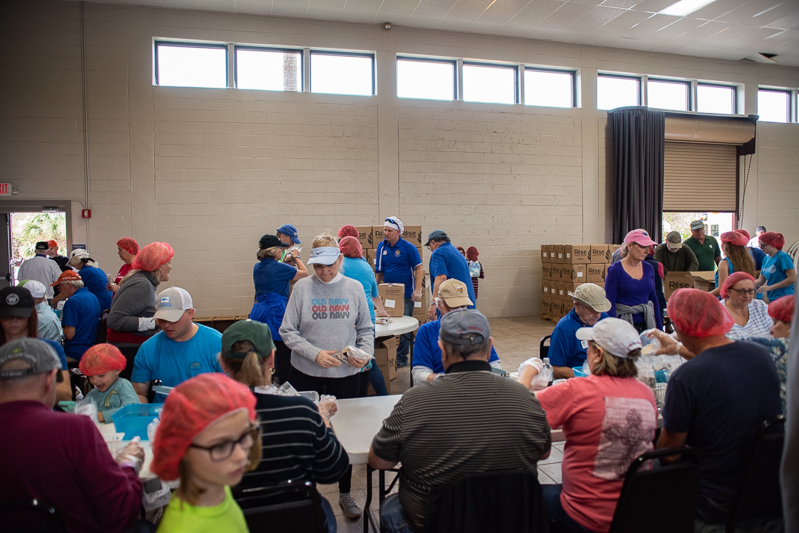 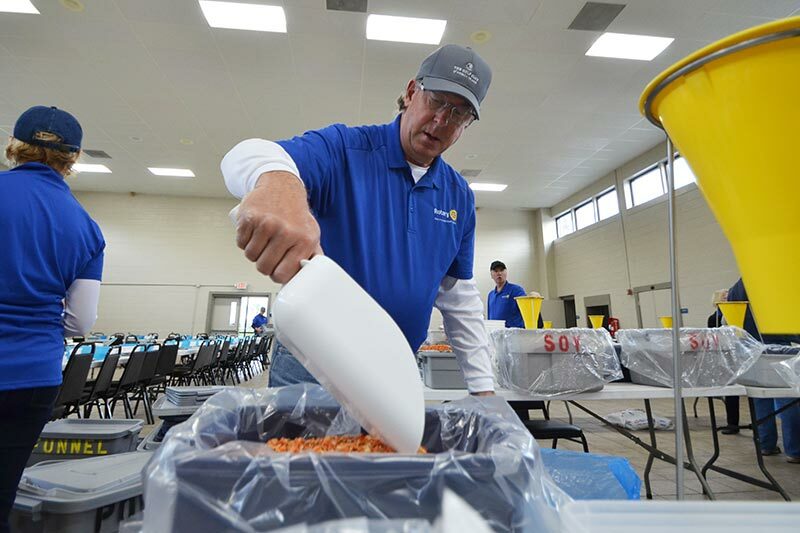 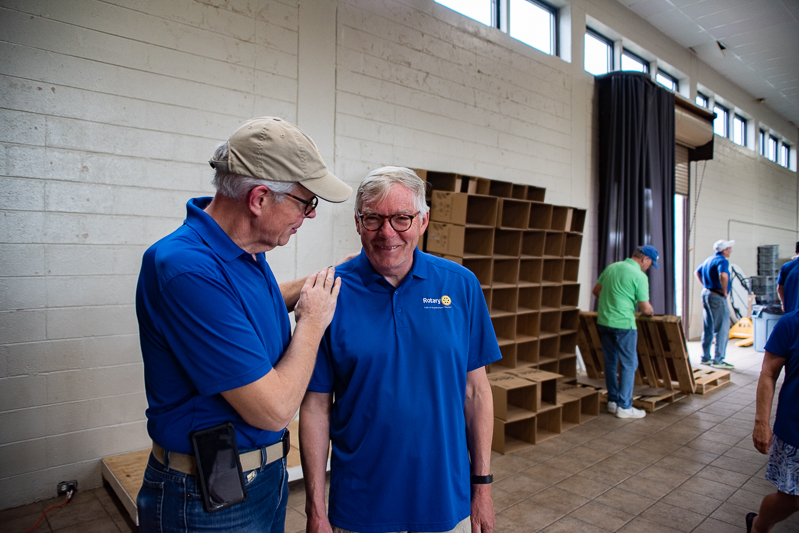 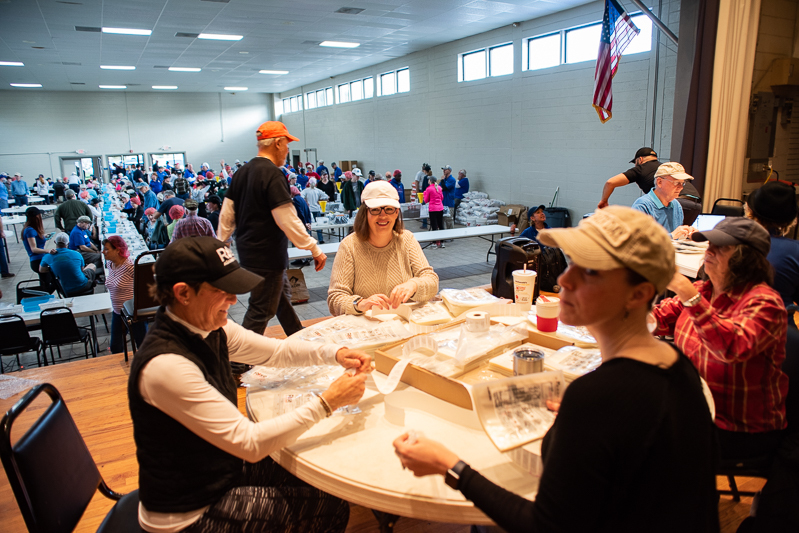 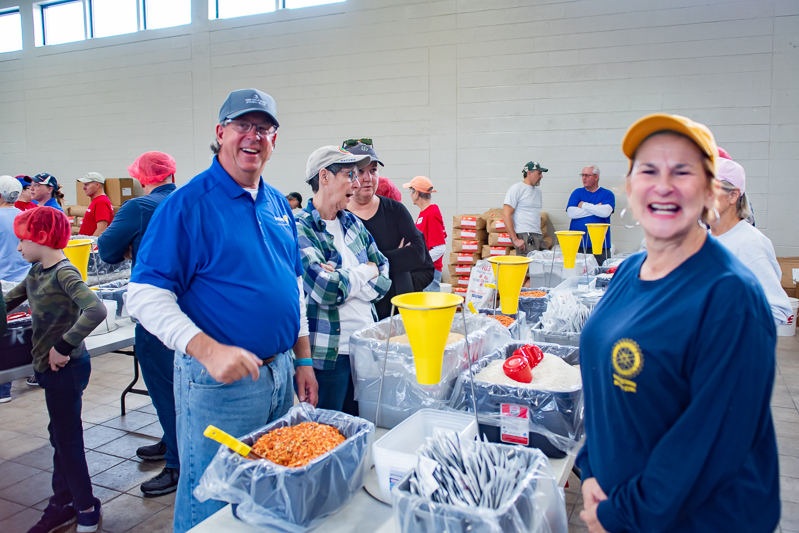 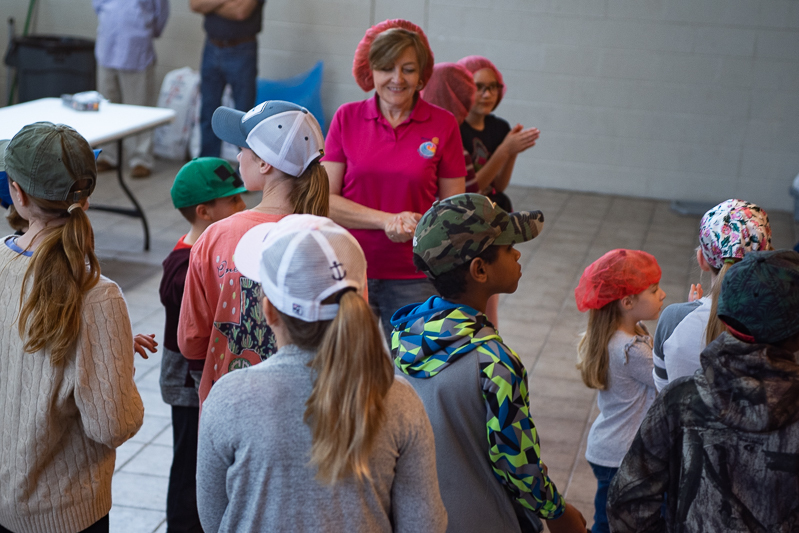 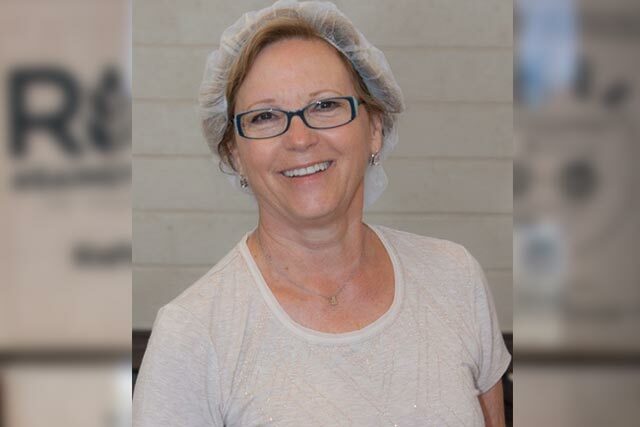 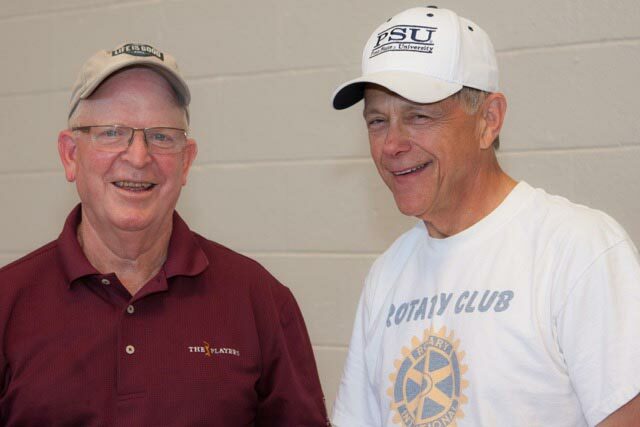 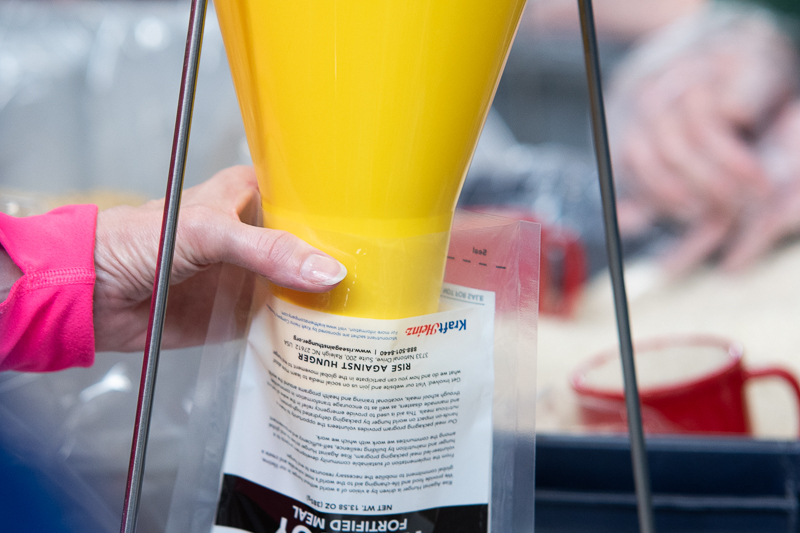 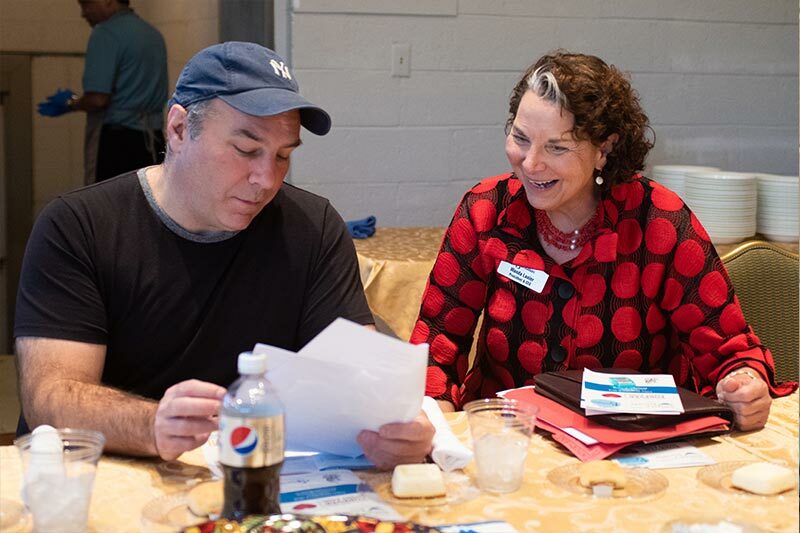 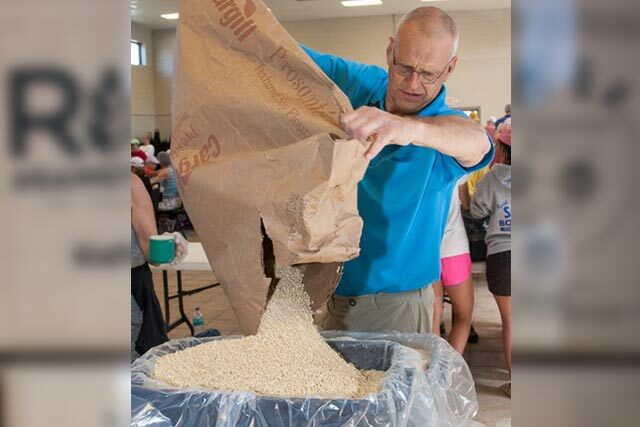 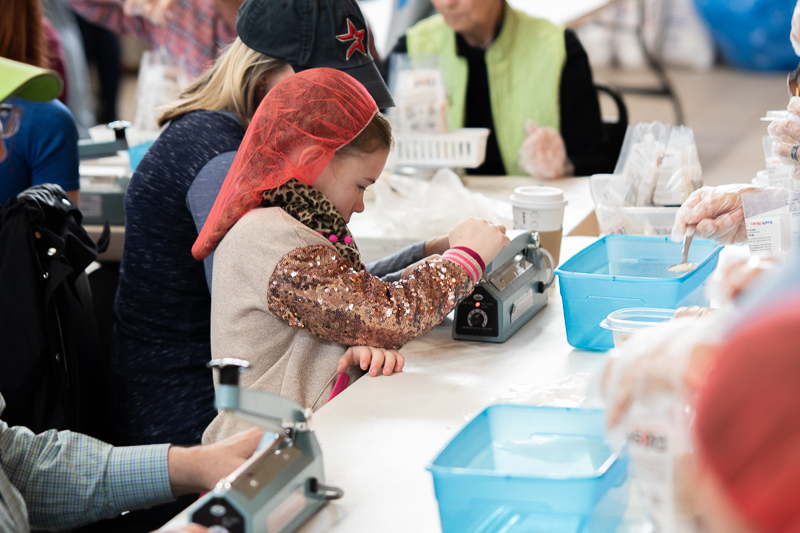 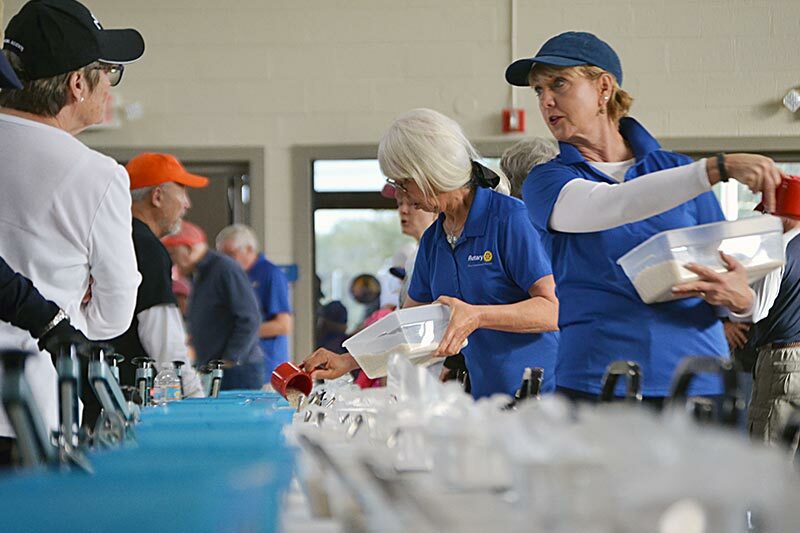 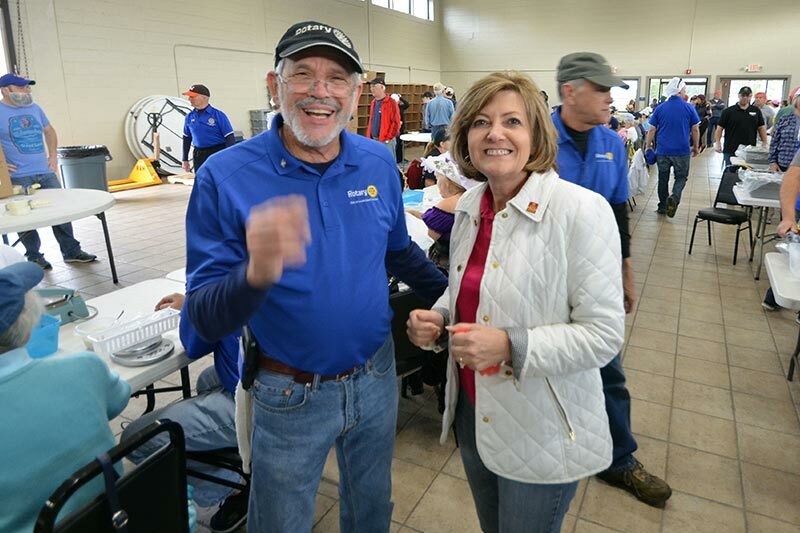 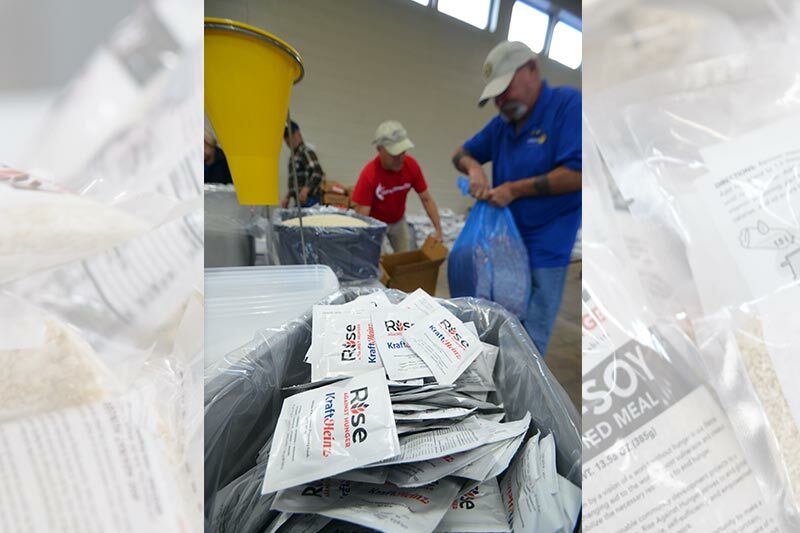 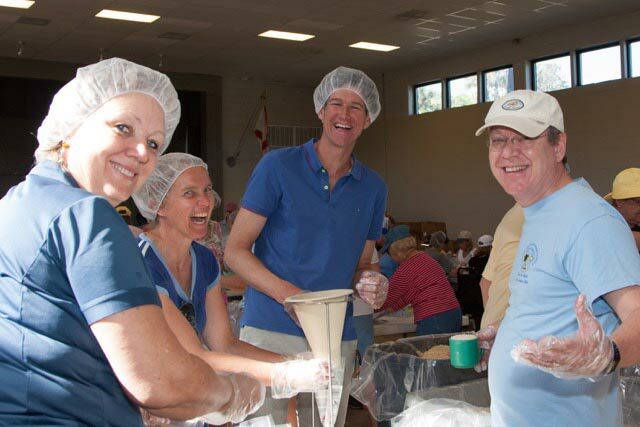 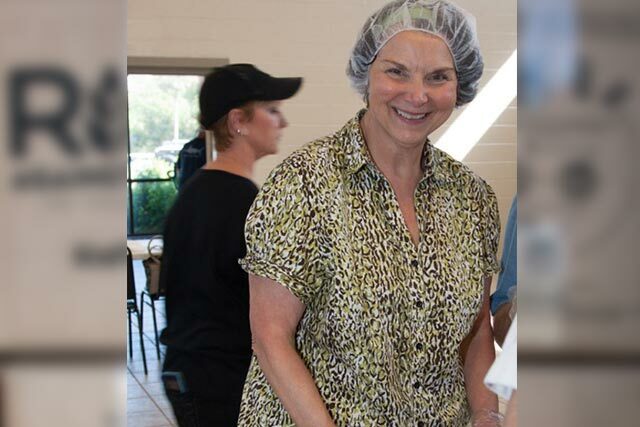 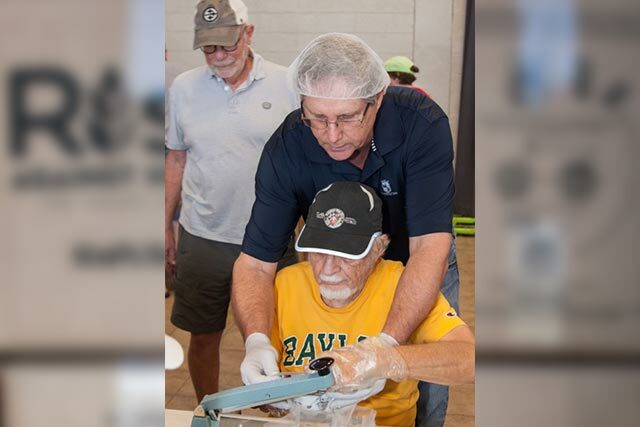 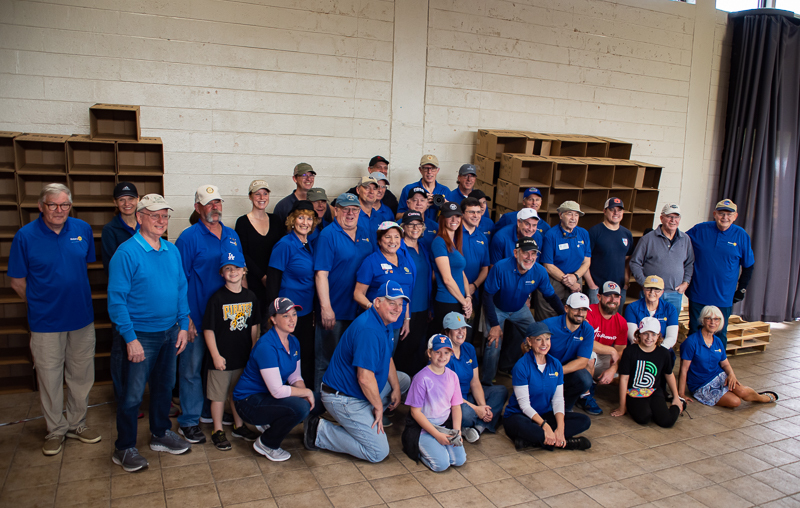 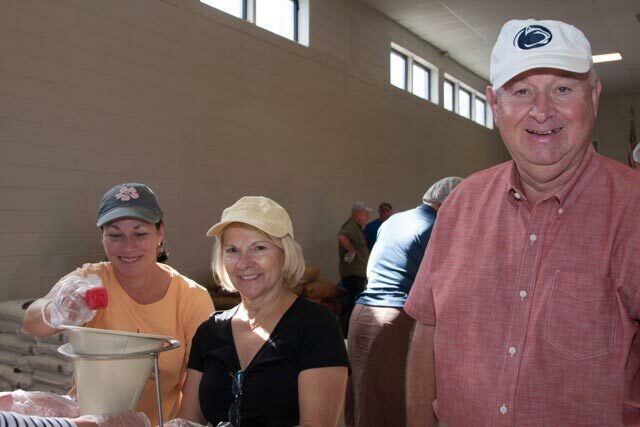 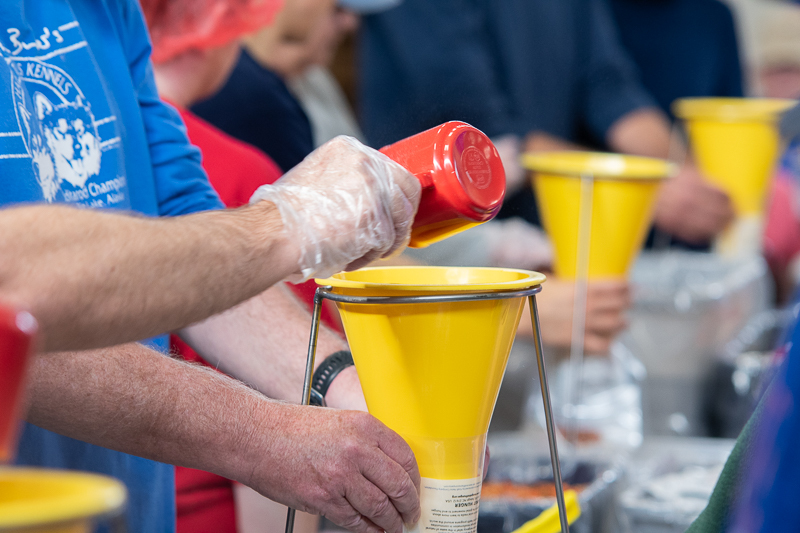 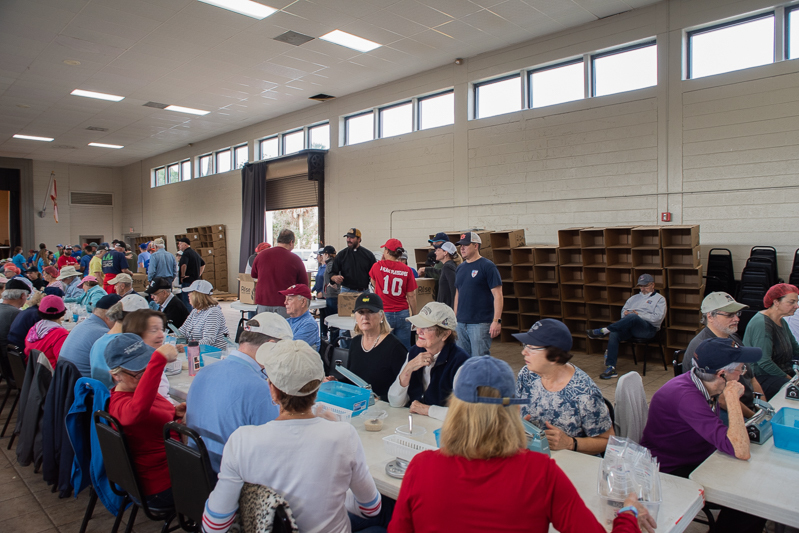 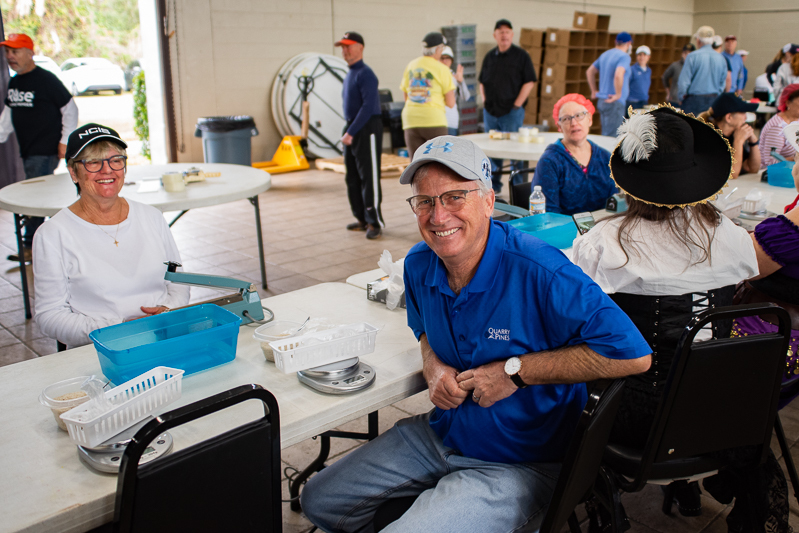 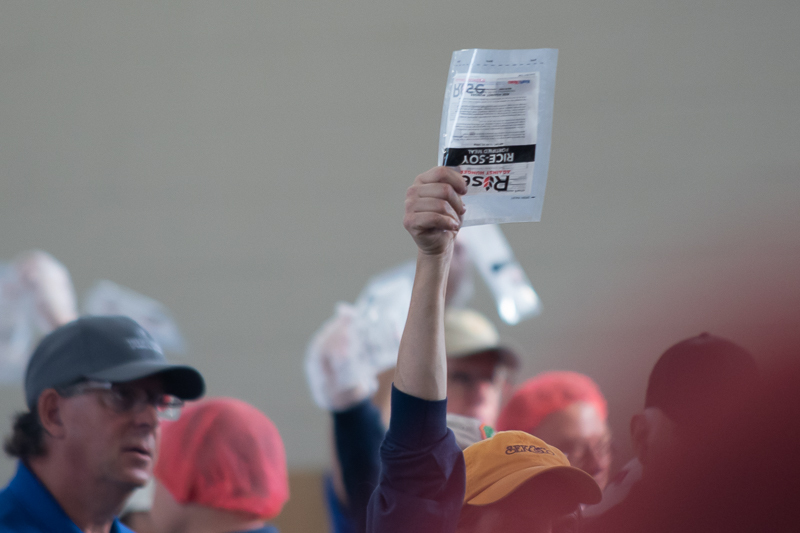 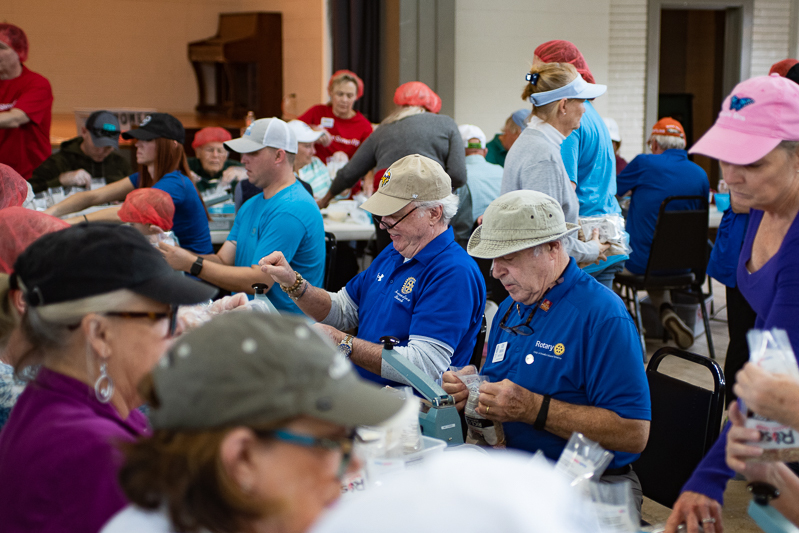 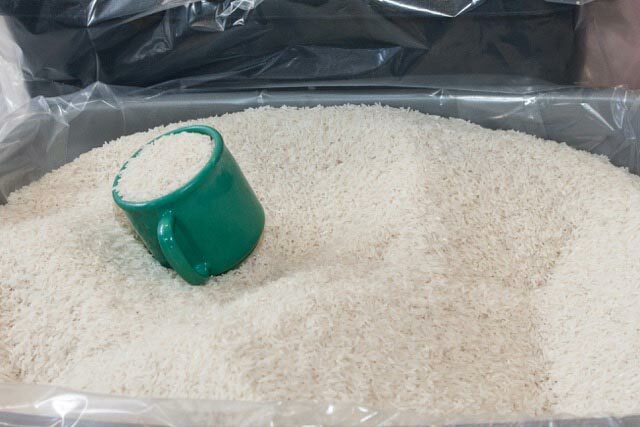 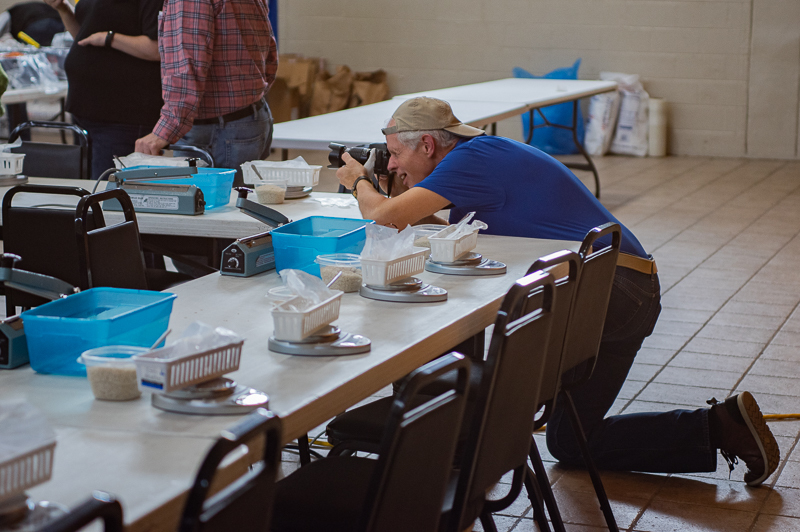 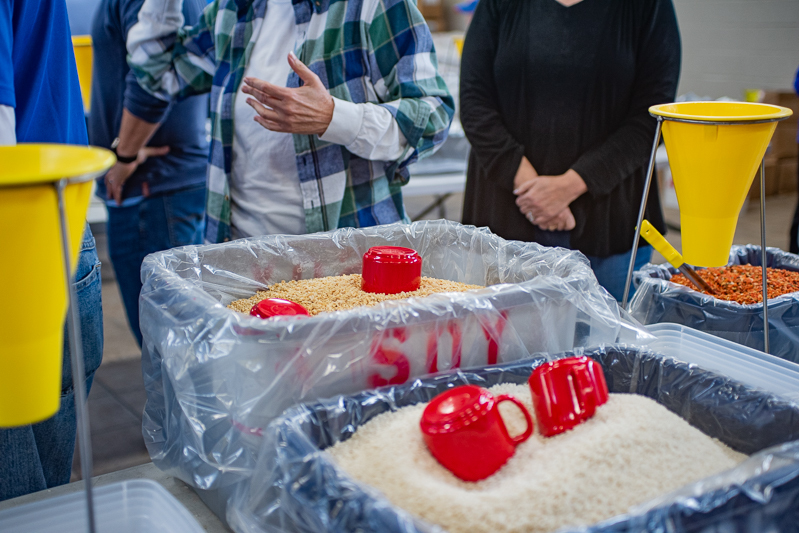 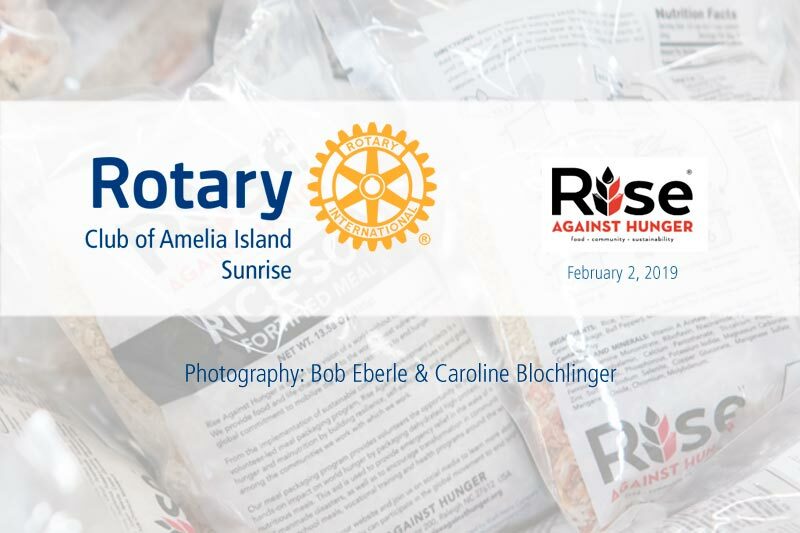 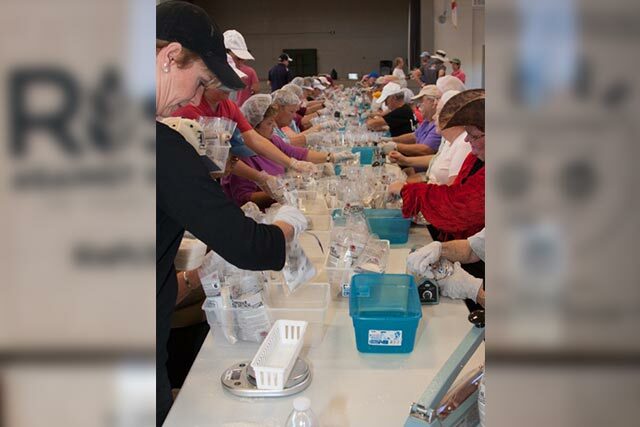 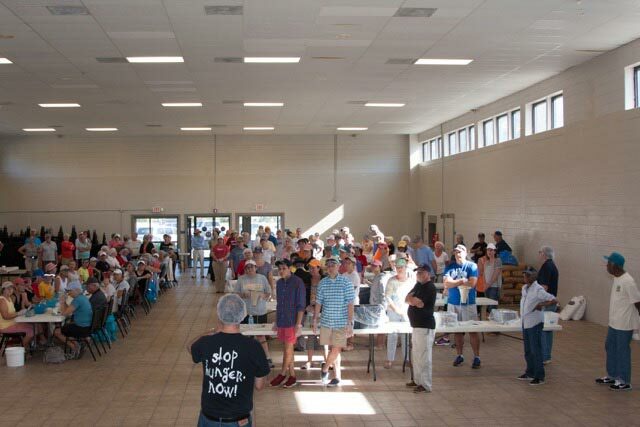 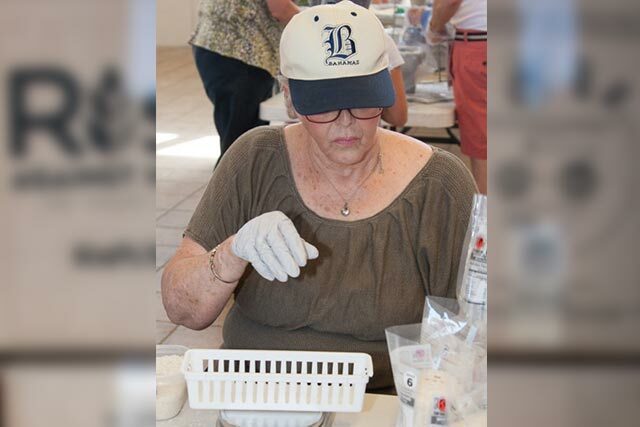 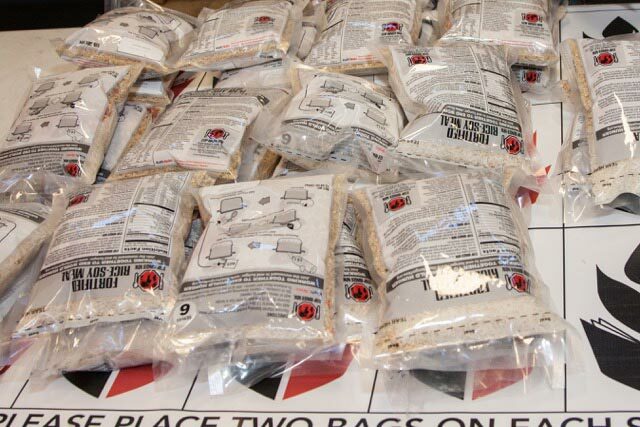 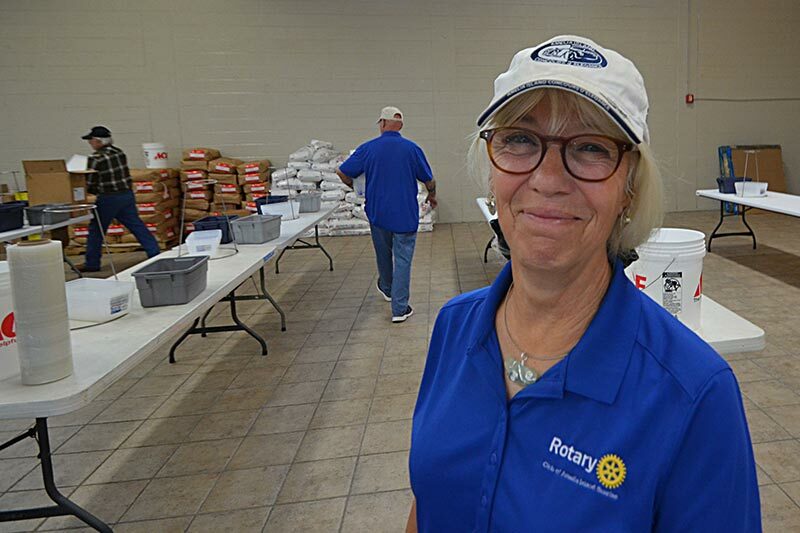 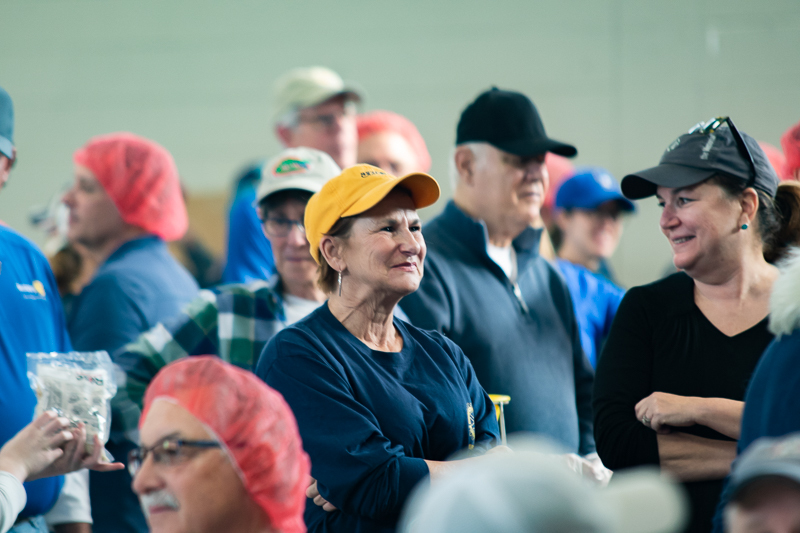 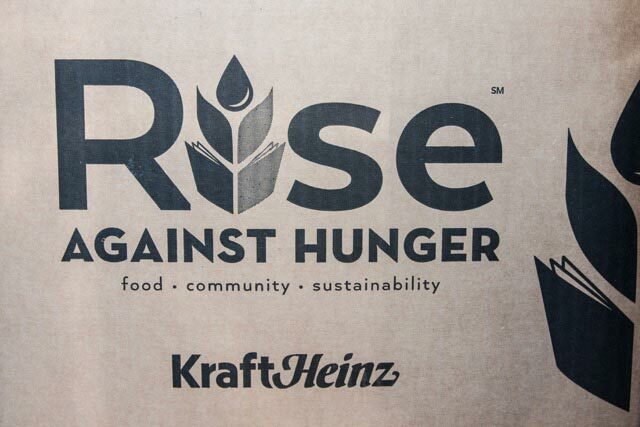 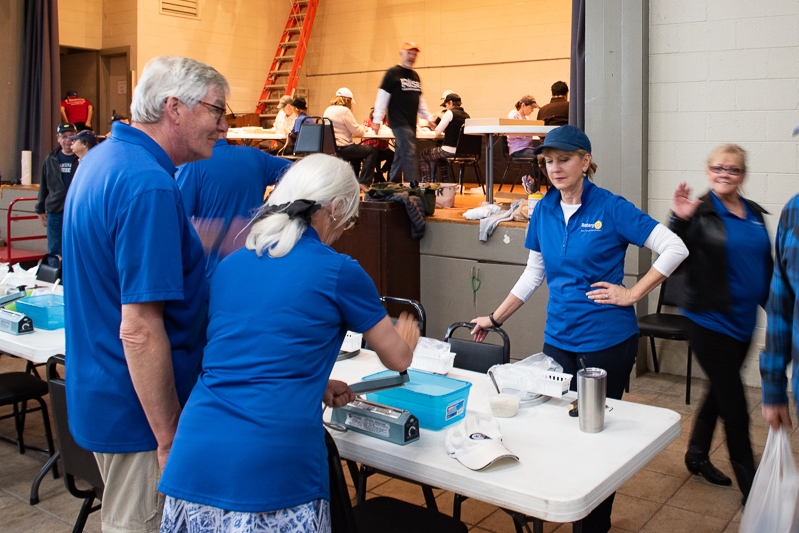 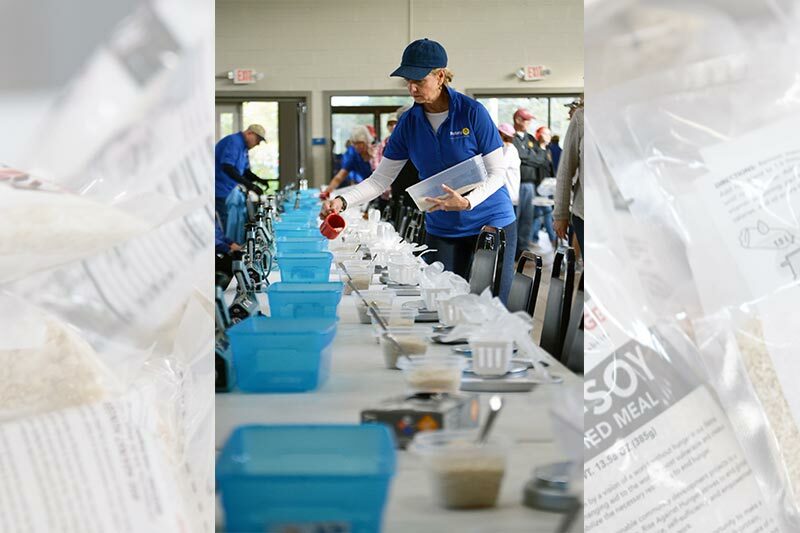 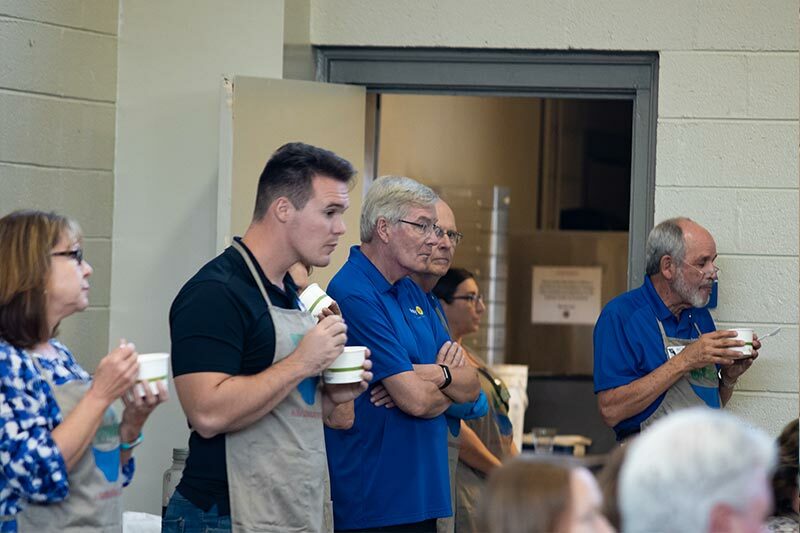 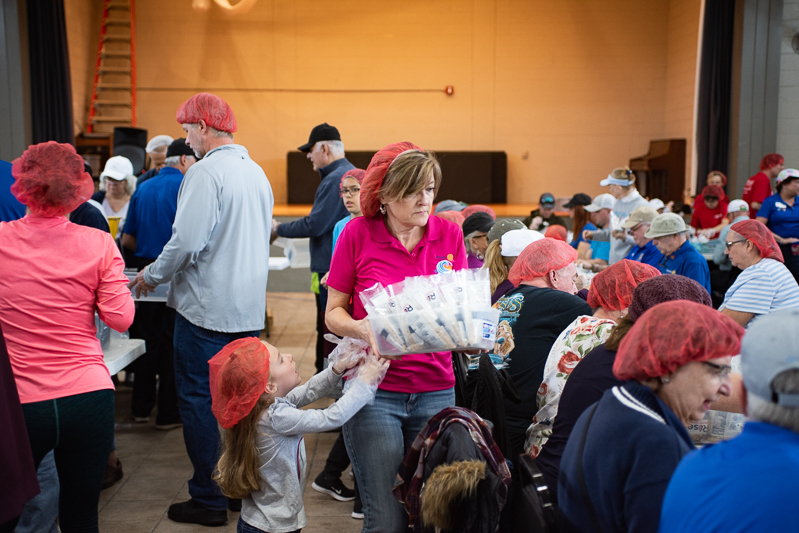 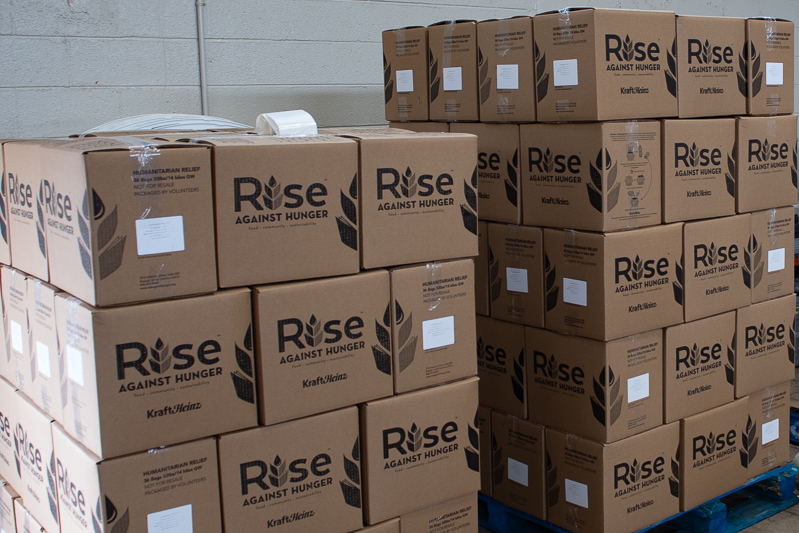 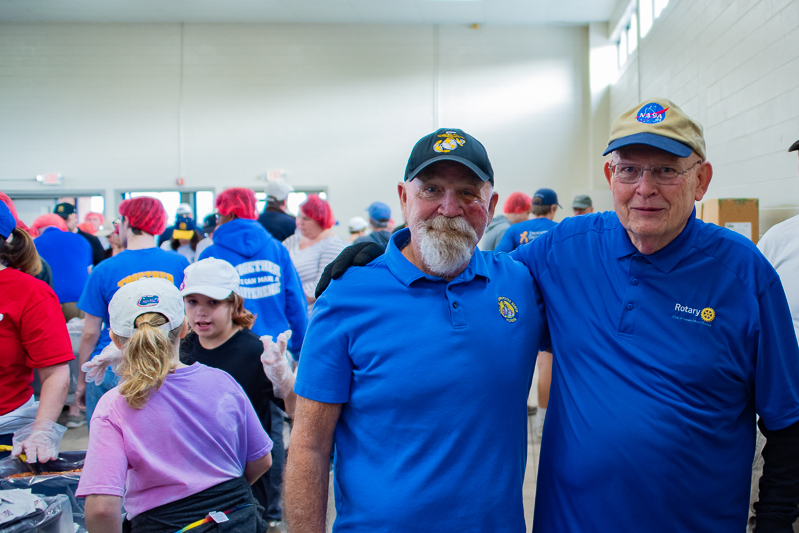 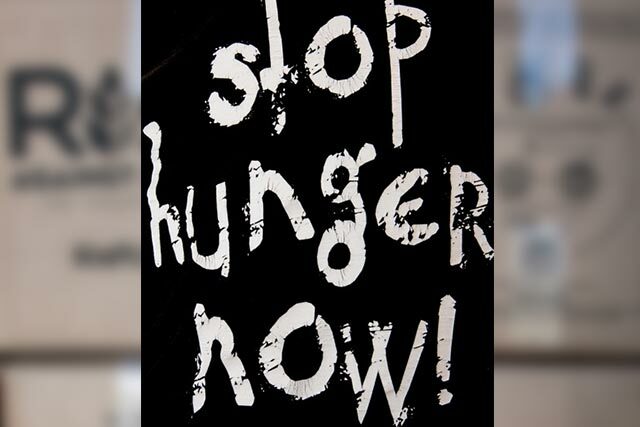 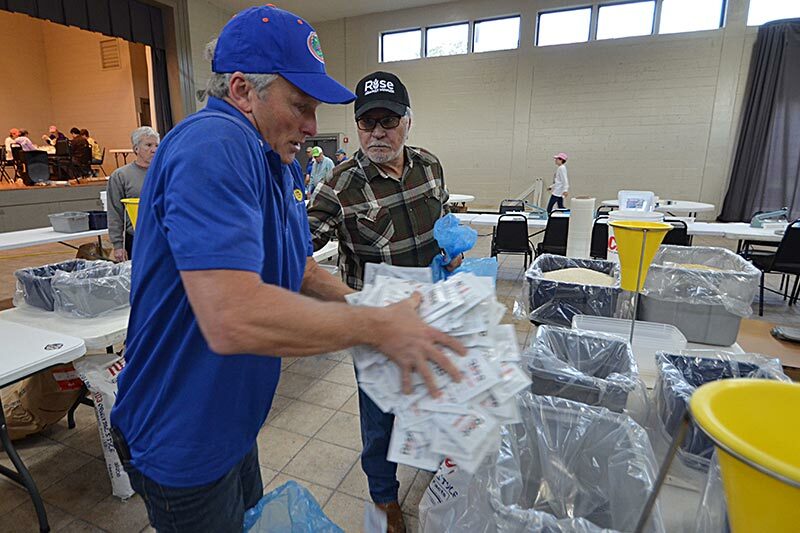 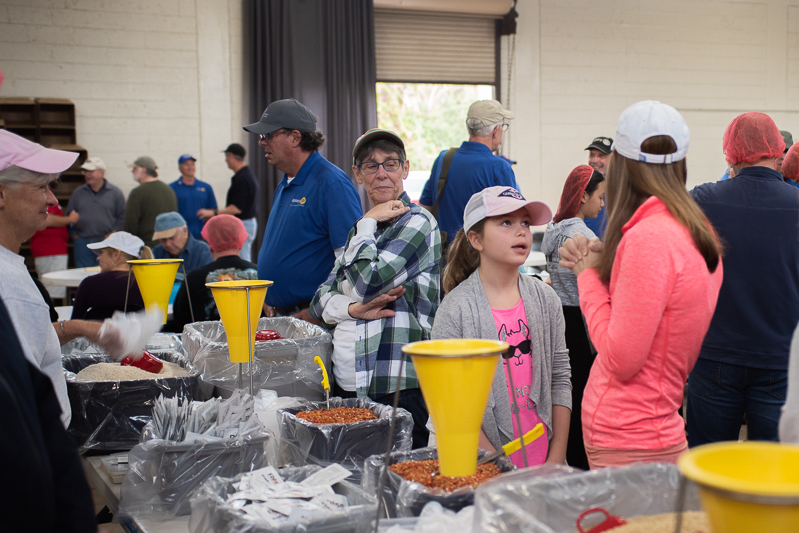 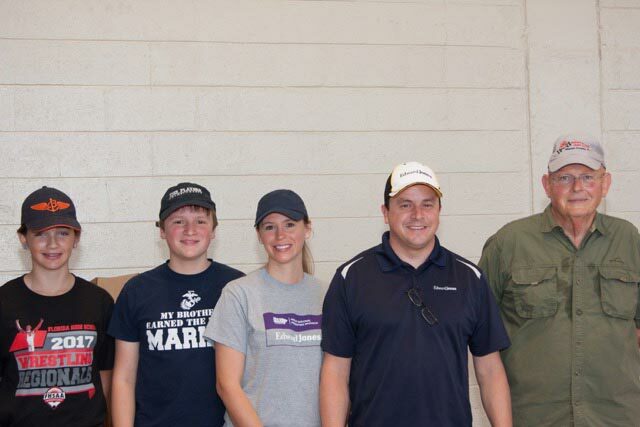 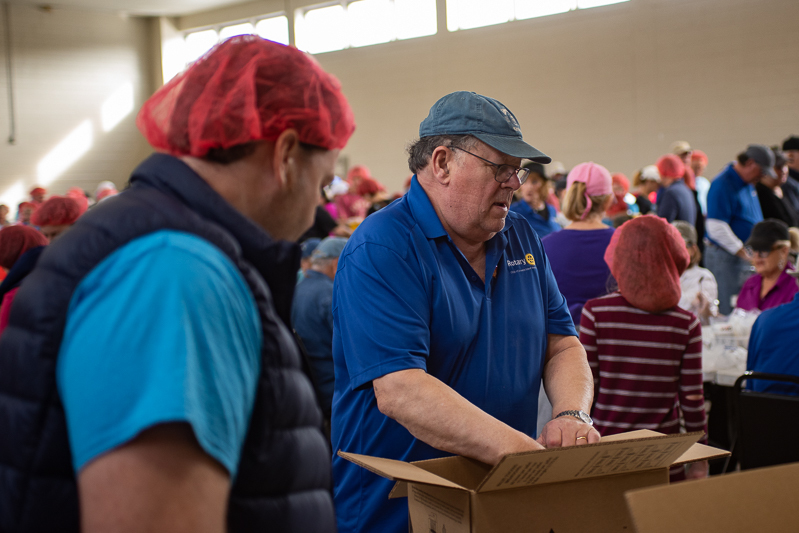 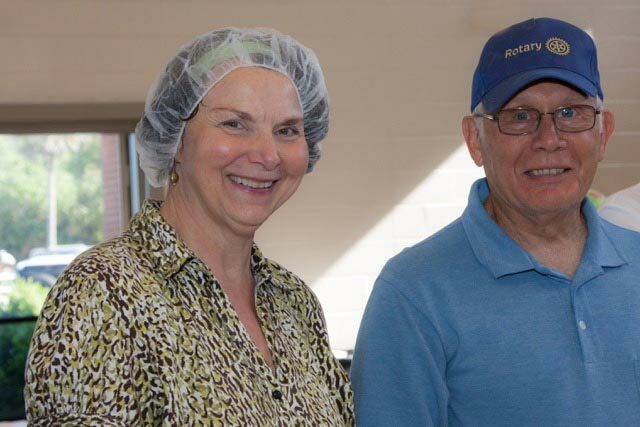 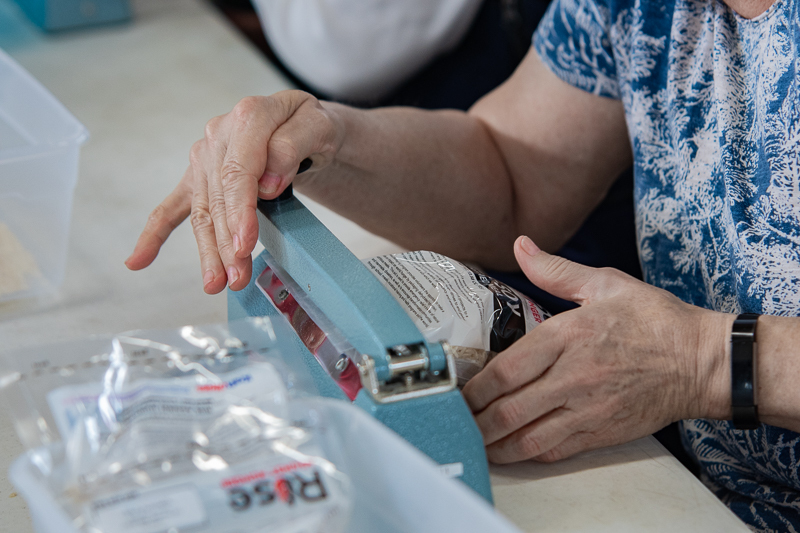 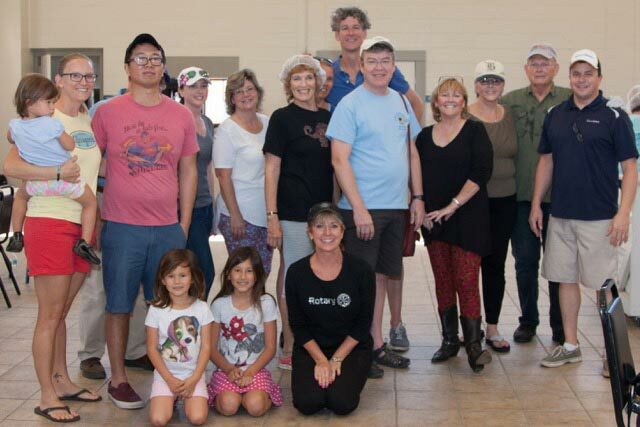 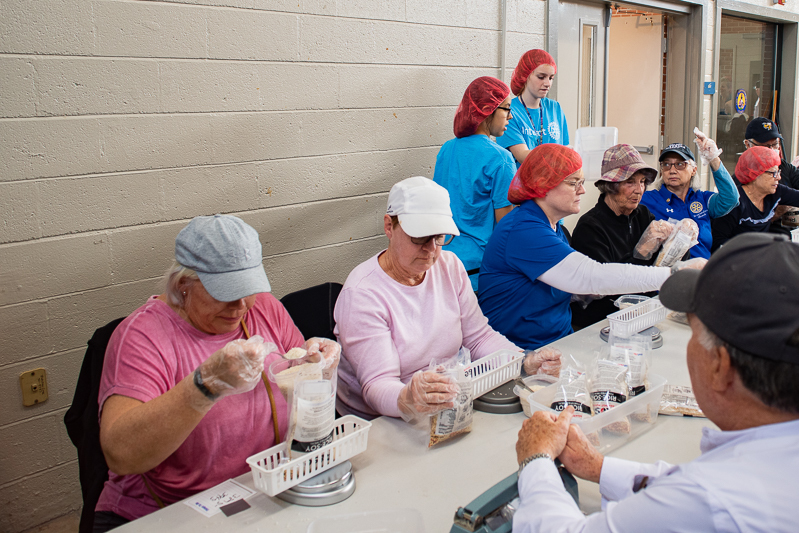 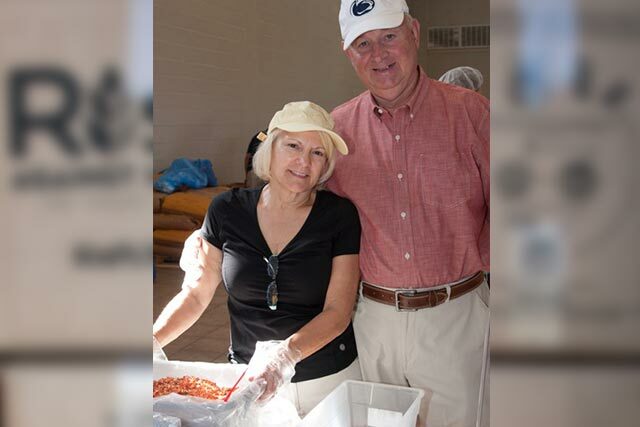 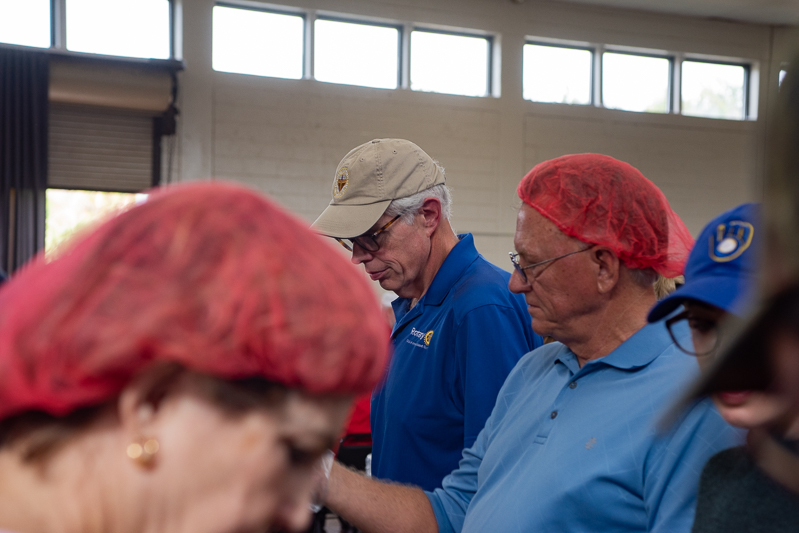 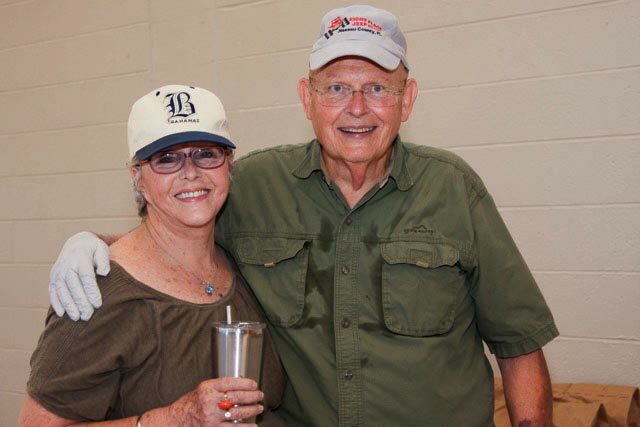 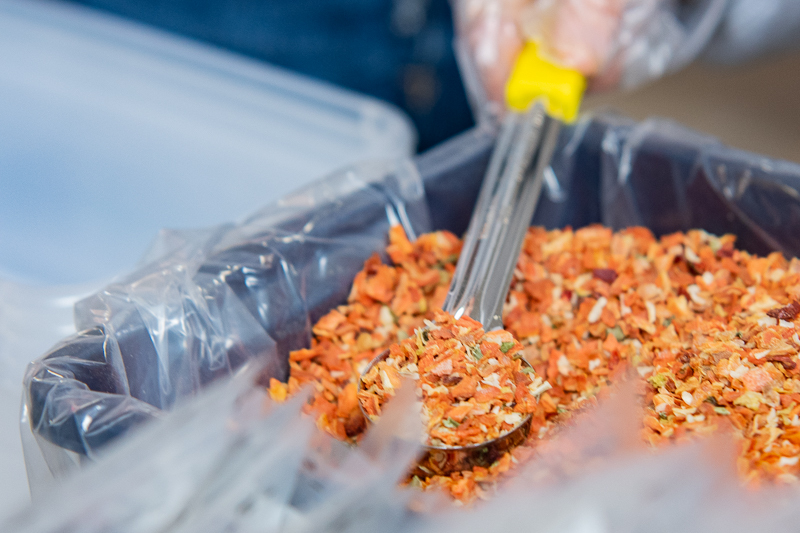 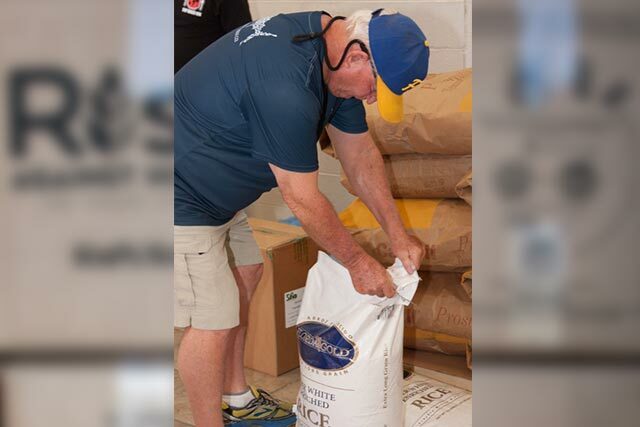 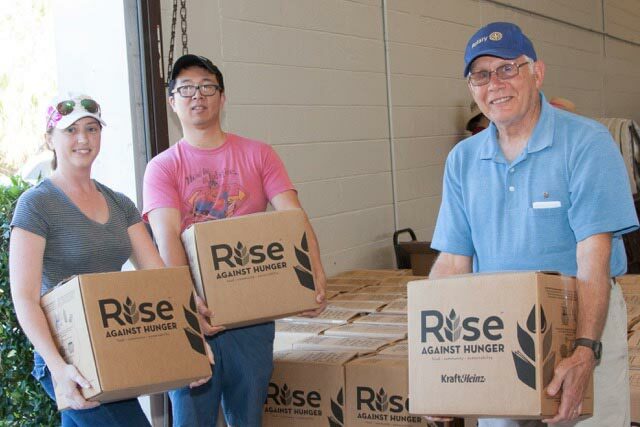 April 1st some of the members of the Rotary Club of Amelia Island Sunrise gathered at the Atlantic Rec center to help prepare hunger kits for Africa. 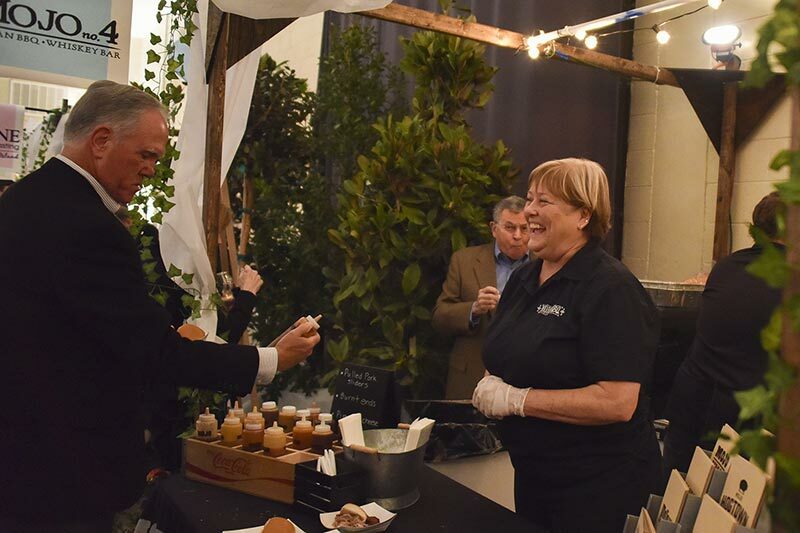 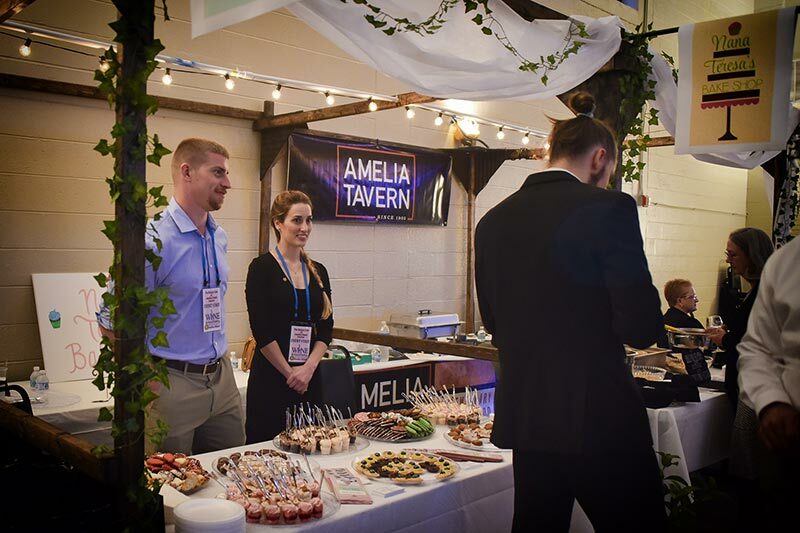 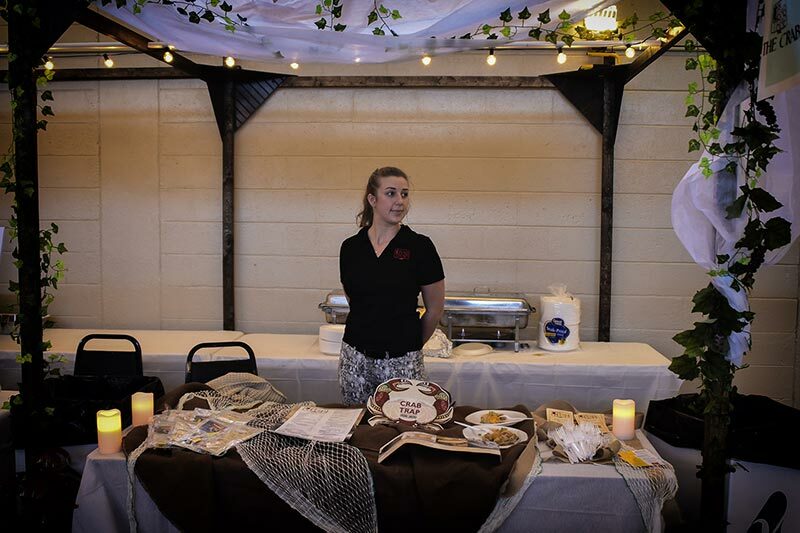 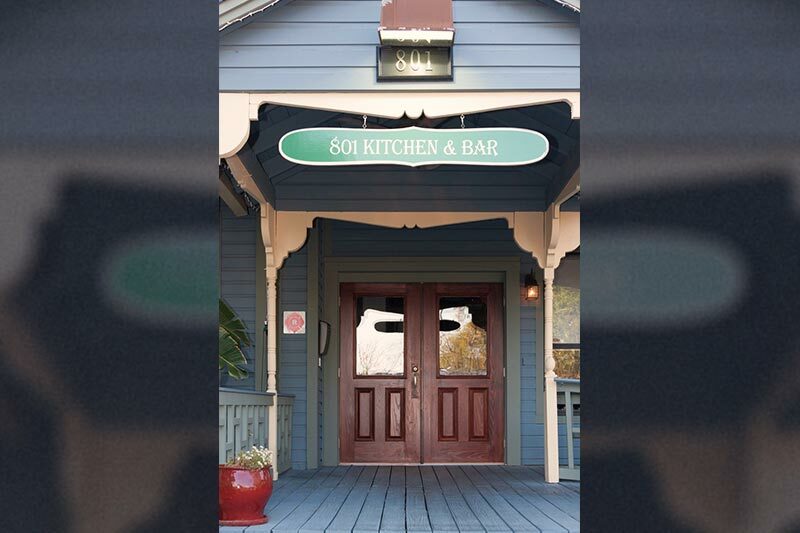 The 801 Kitchen and Bar was one of the many restaurants that were part of the 2017 International Wine and Food Tasting. 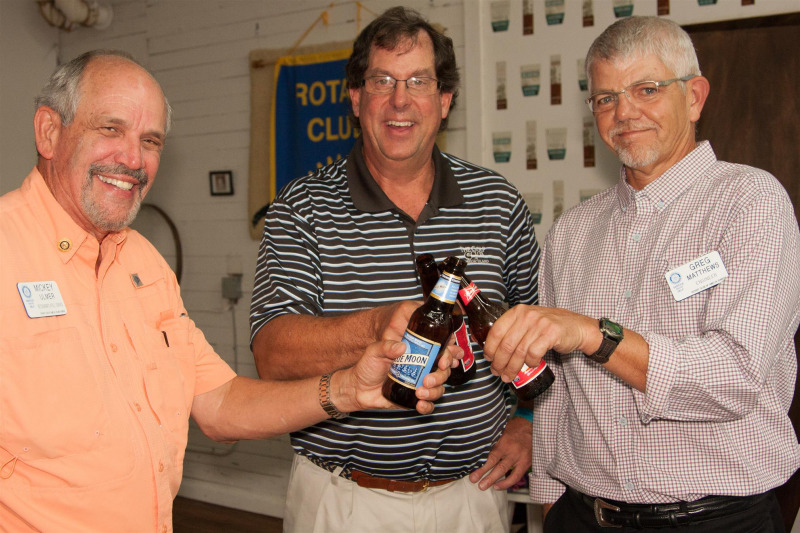 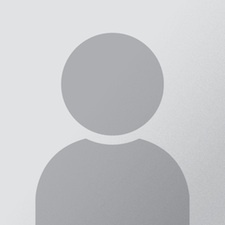 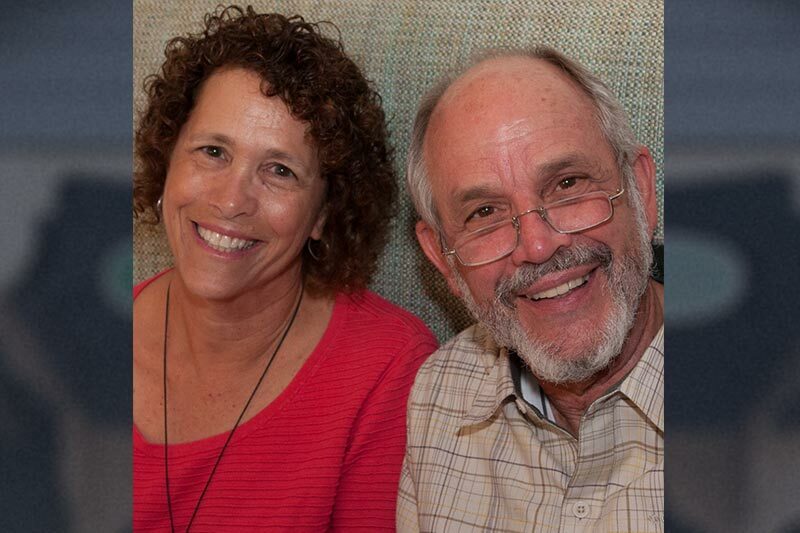 Club members met there March 21 to say thanks. 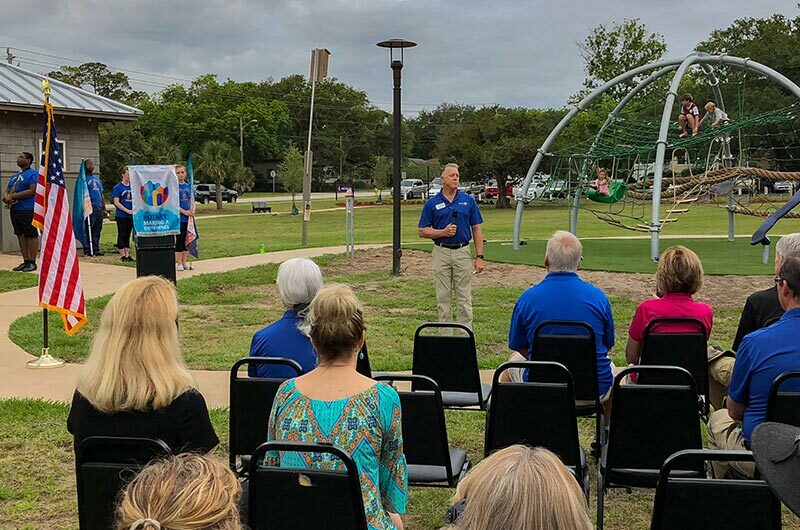 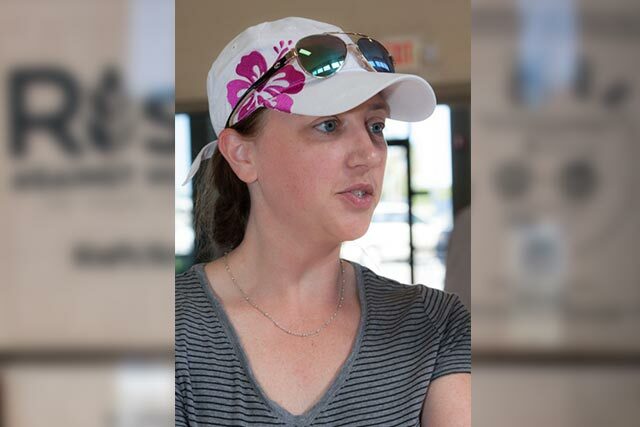 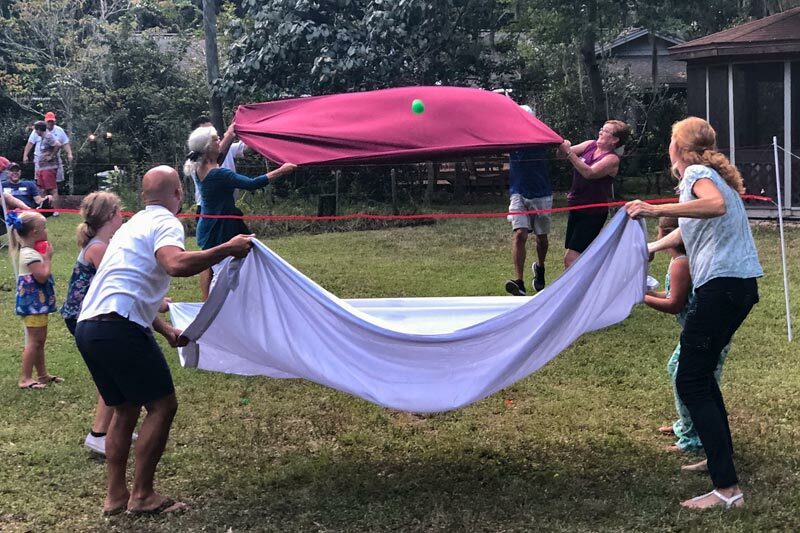 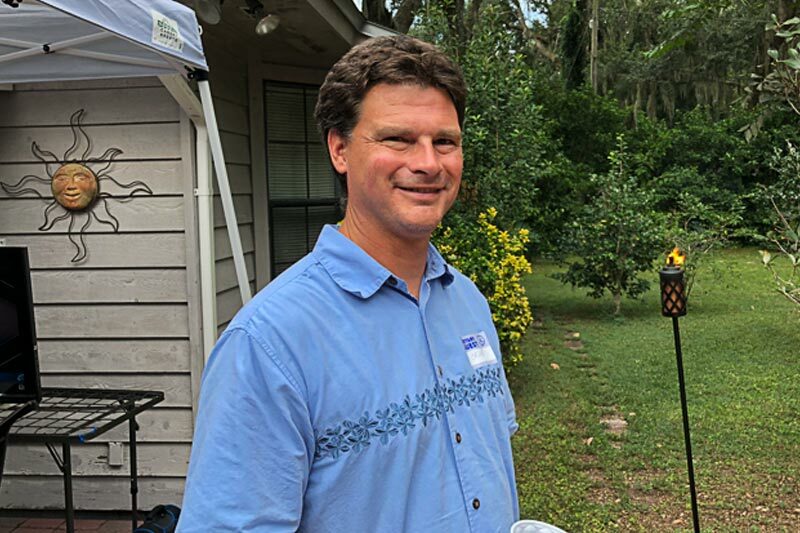 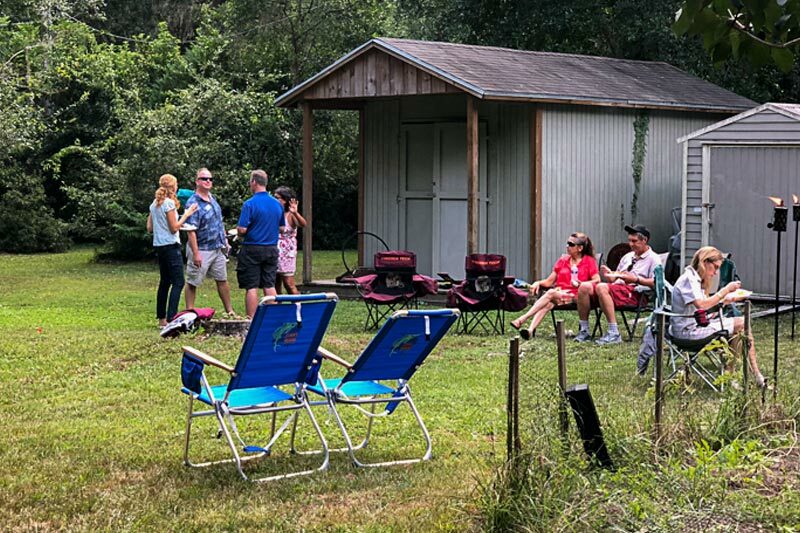 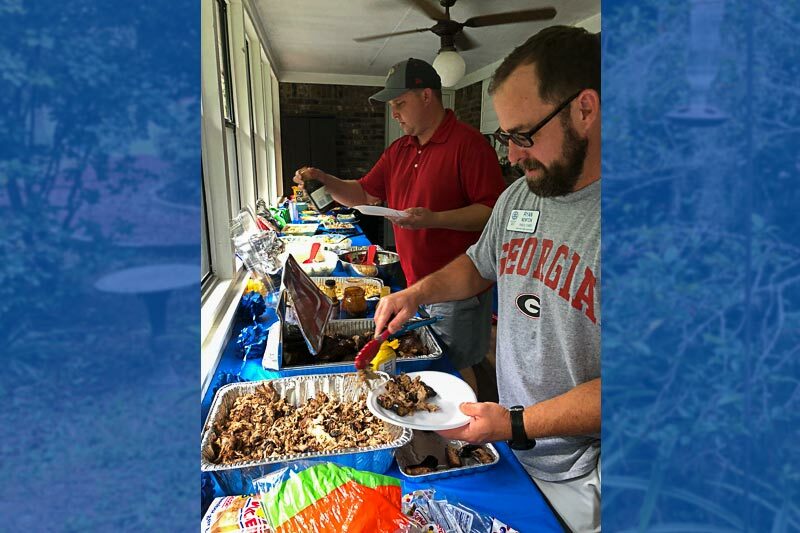 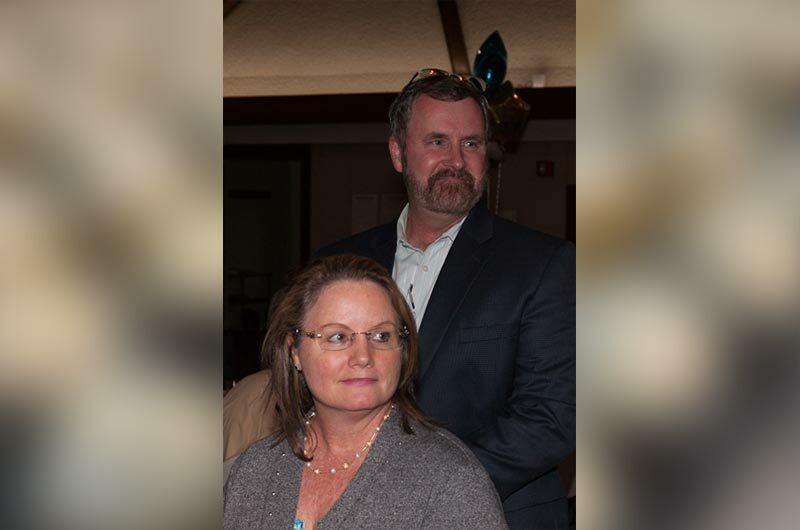 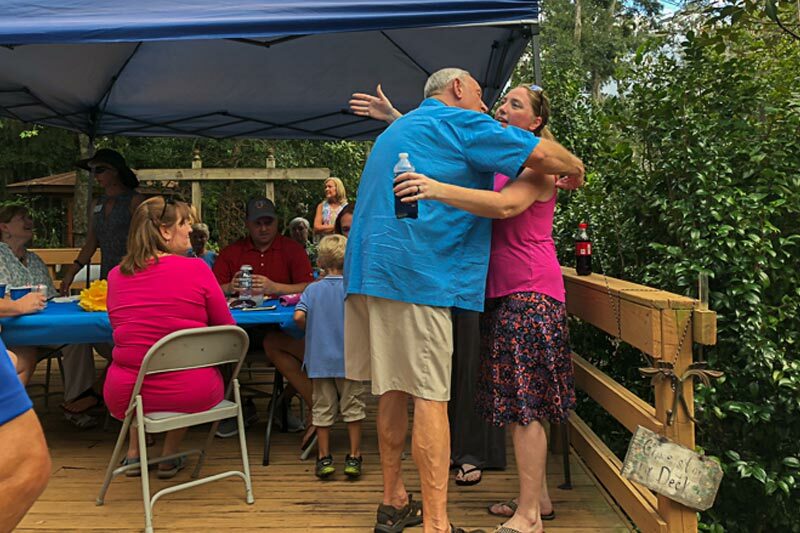 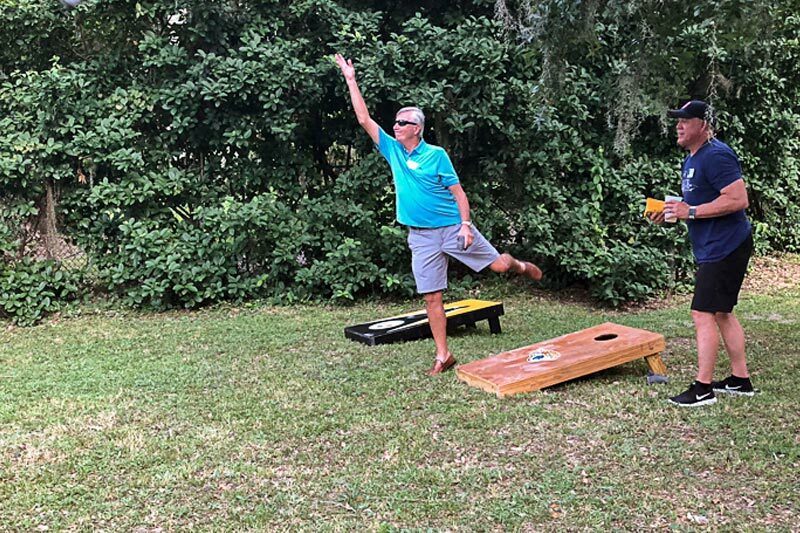 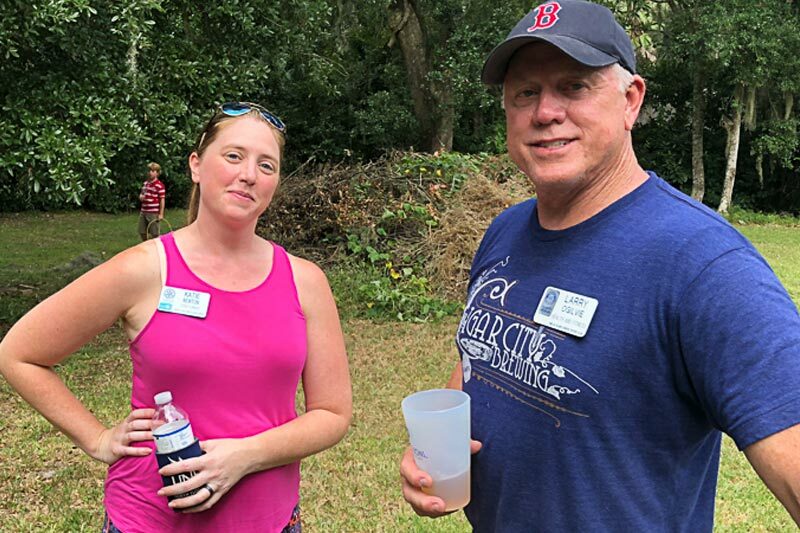 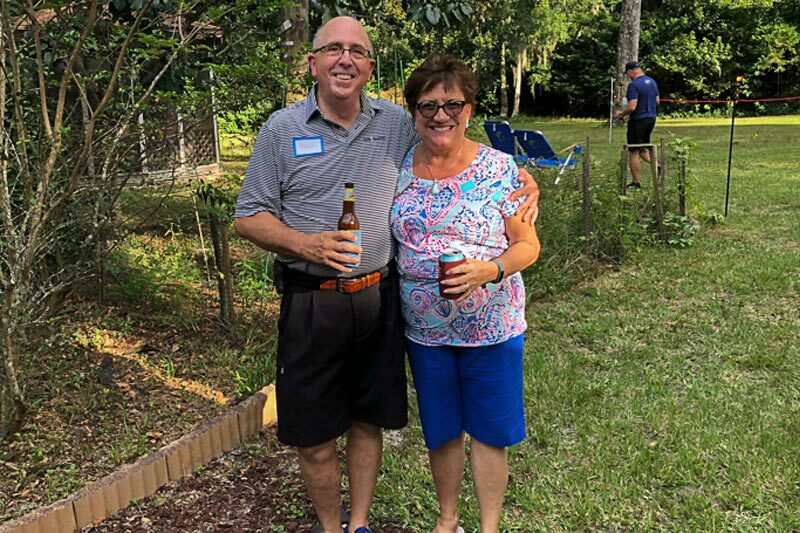 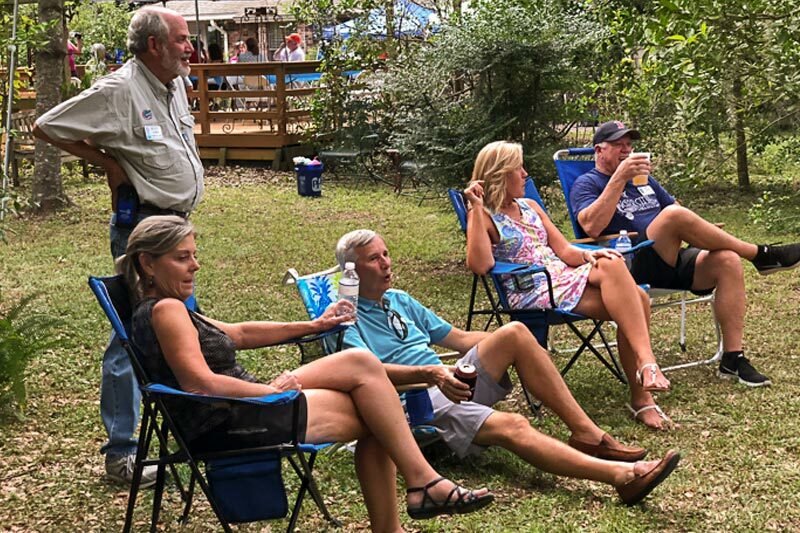 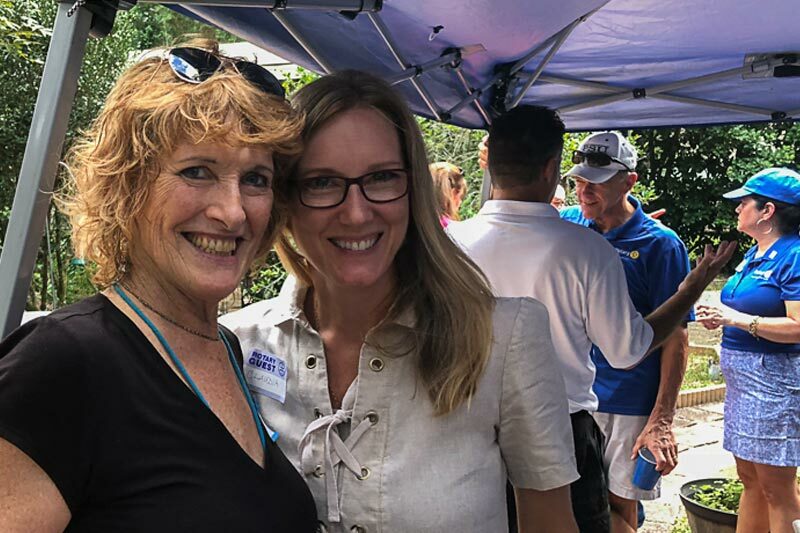 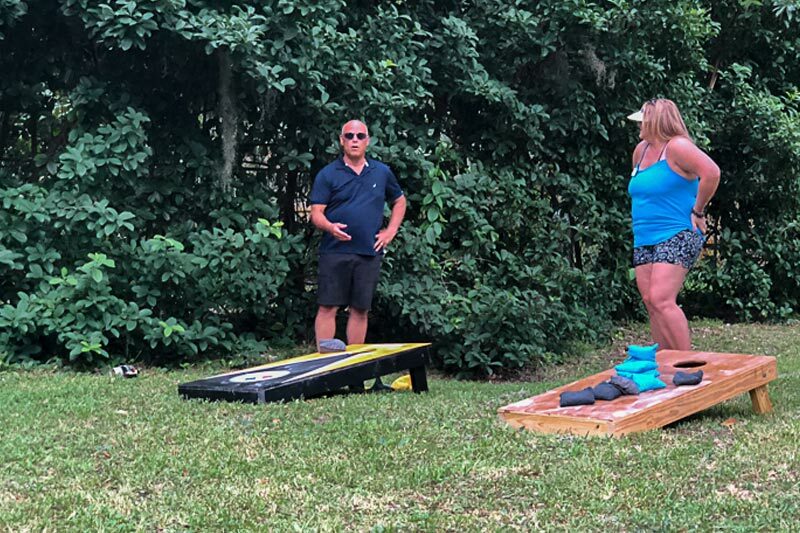 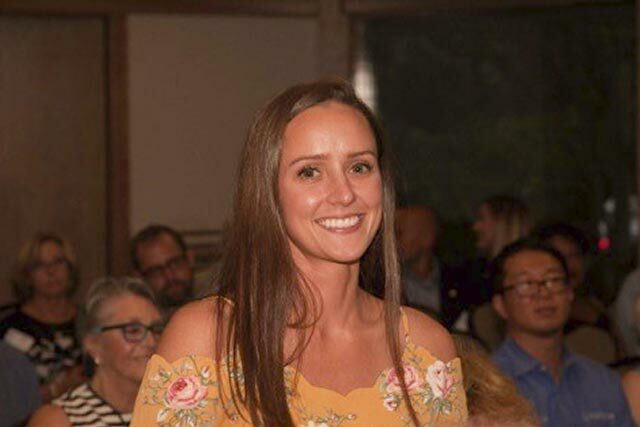 The club selected to donate the proceeds from this event to three separate recipients; 8Flags Playscape, the Fernandina Beach Fire Departmtent and the Friends of Fernanidna Aviation. 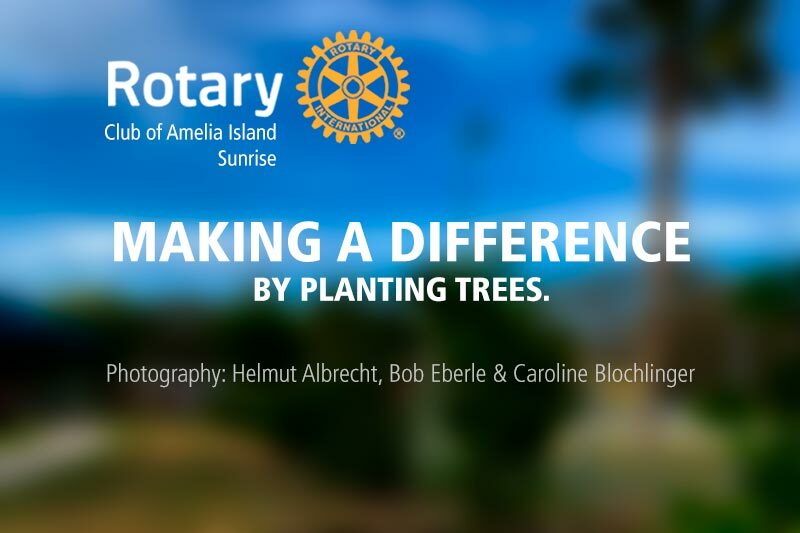 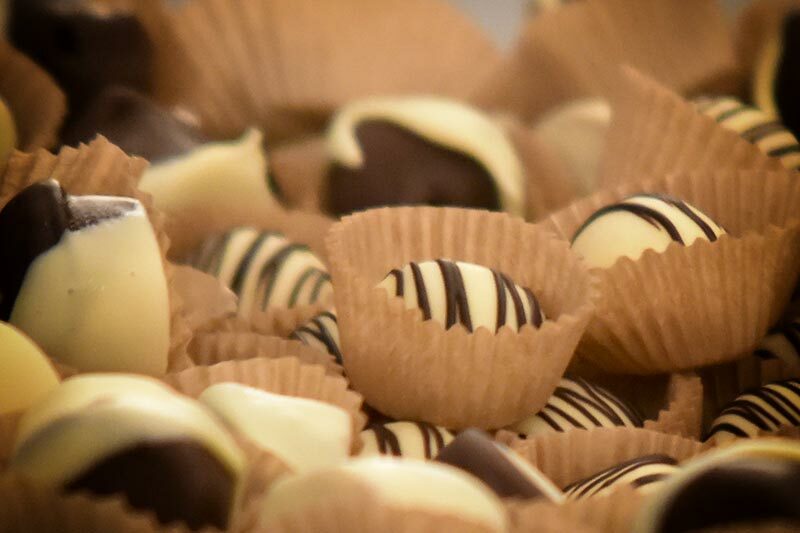 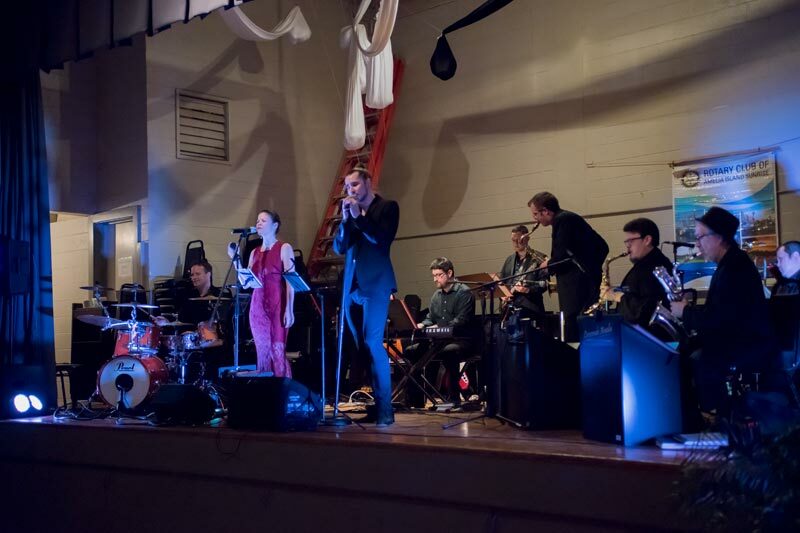 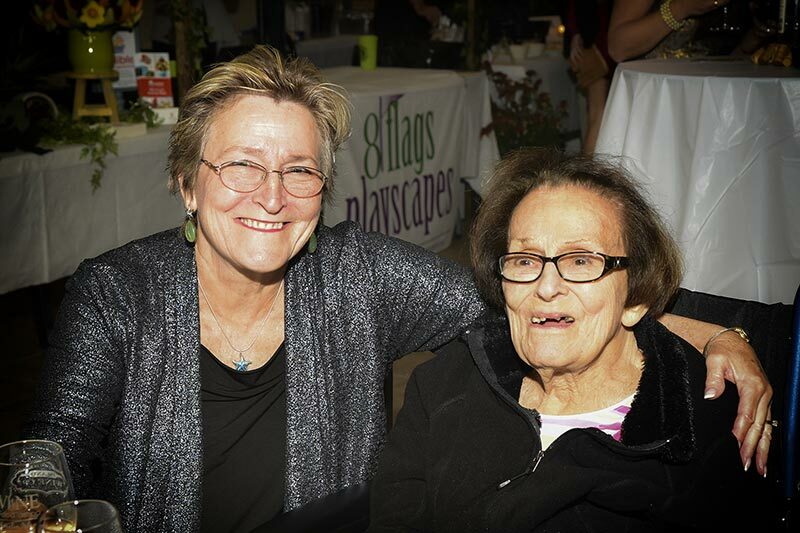 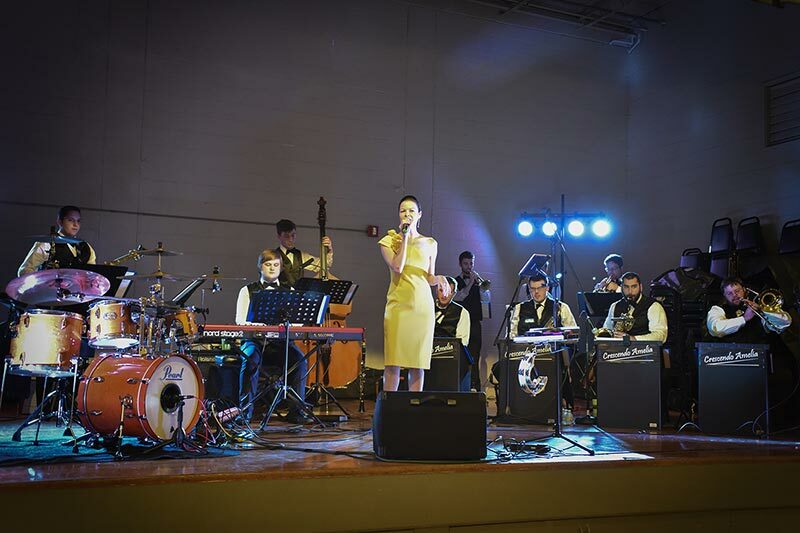 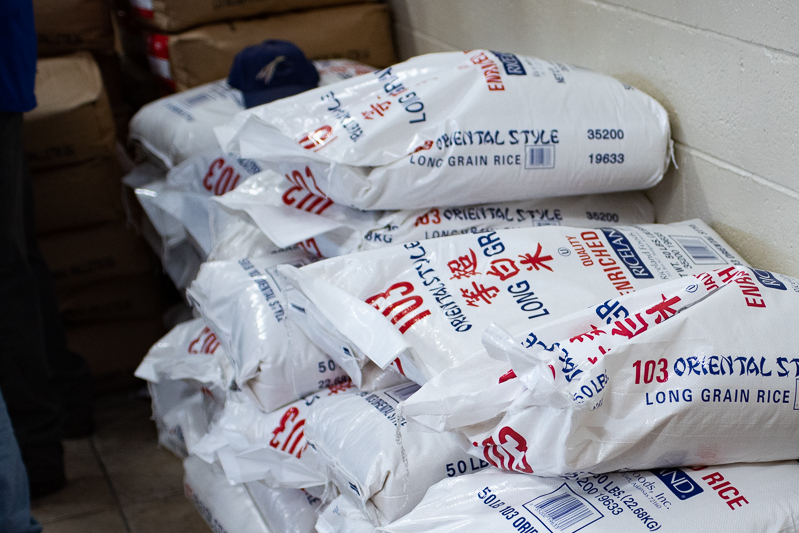 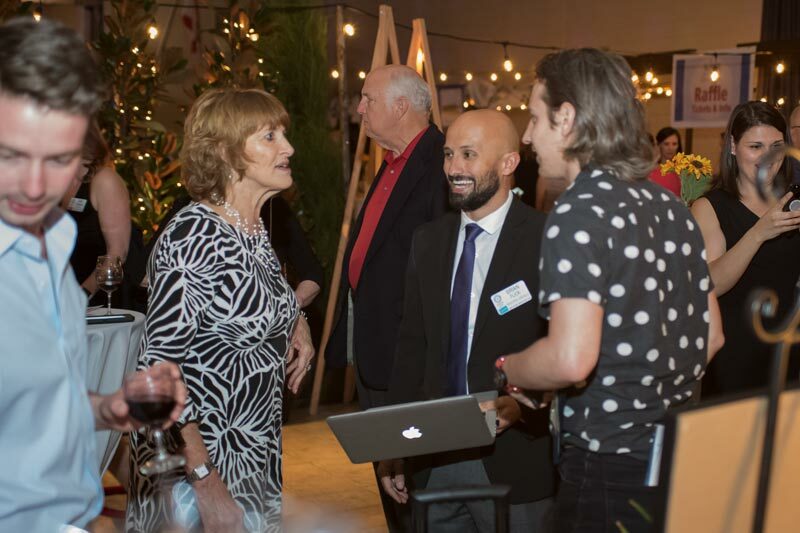 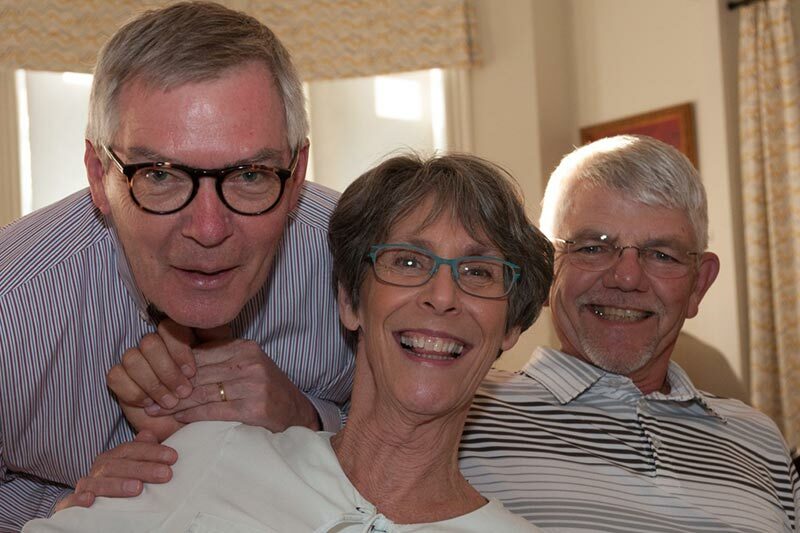 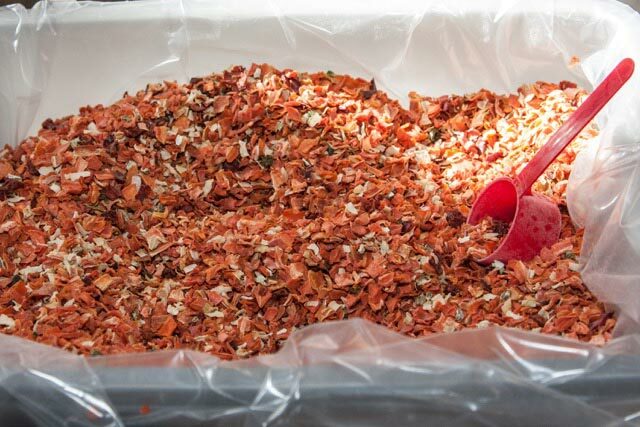 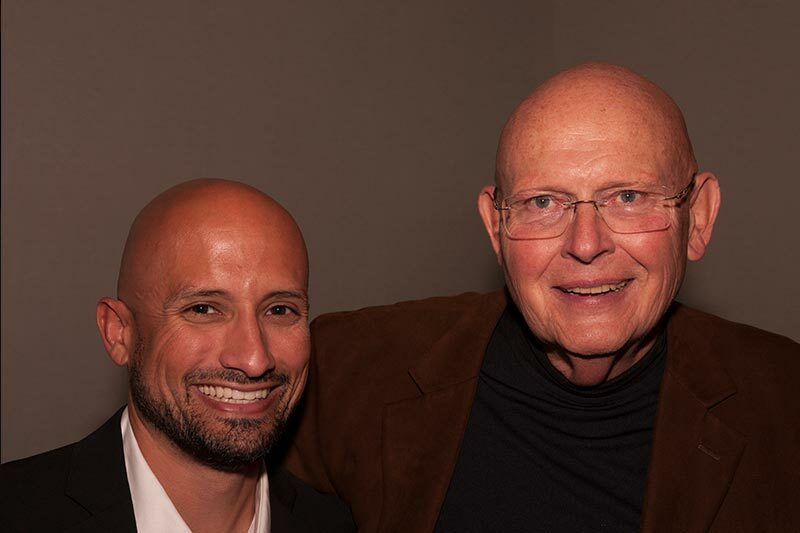 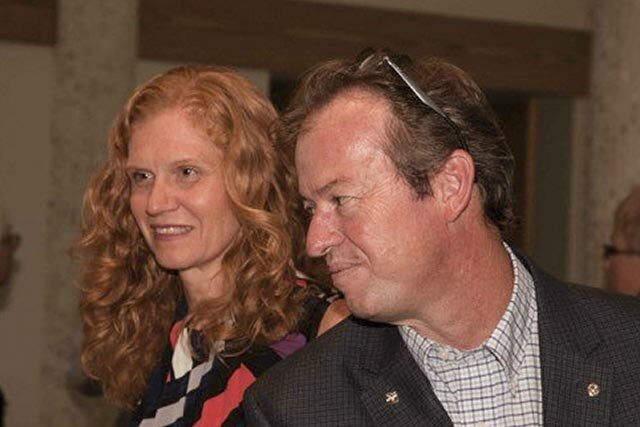 Enjoy some of our highlights from 2015!